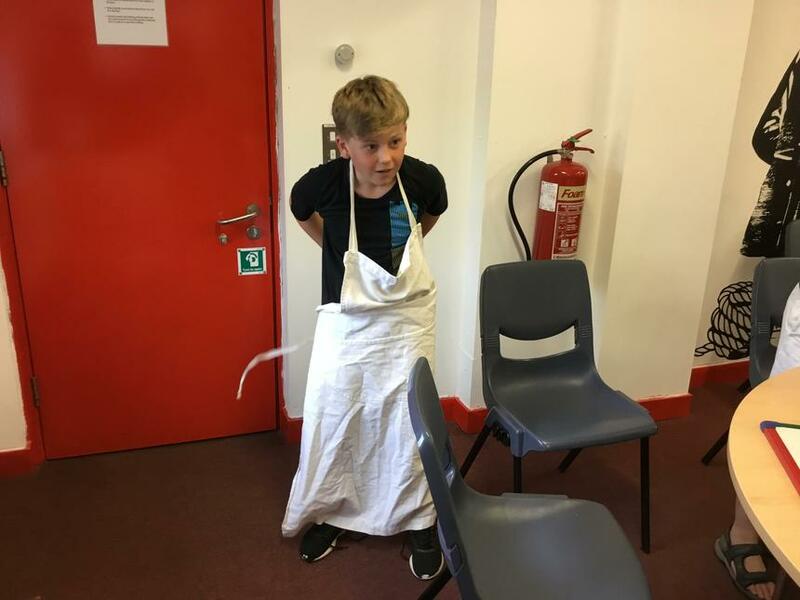 Finding Tales - The Machine Gunner! 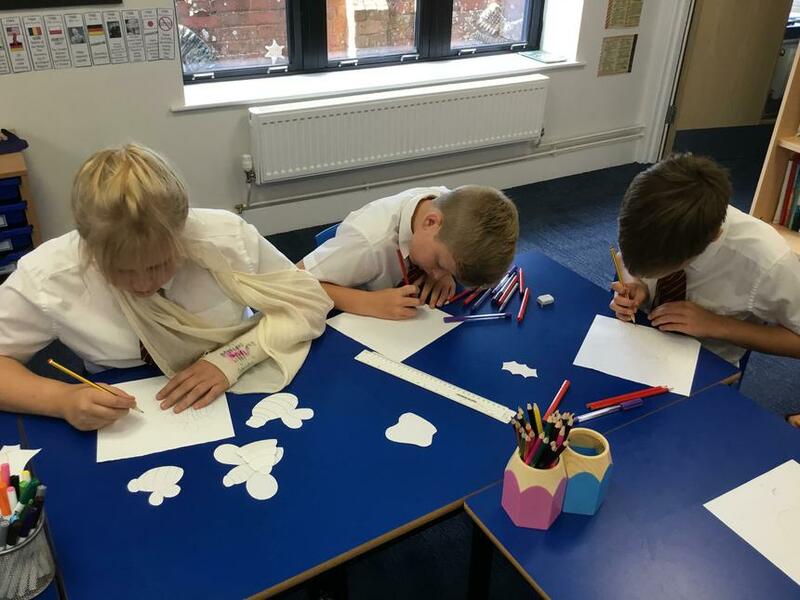 Pyrenees Class have started a new genre of writing in English - finding tales! 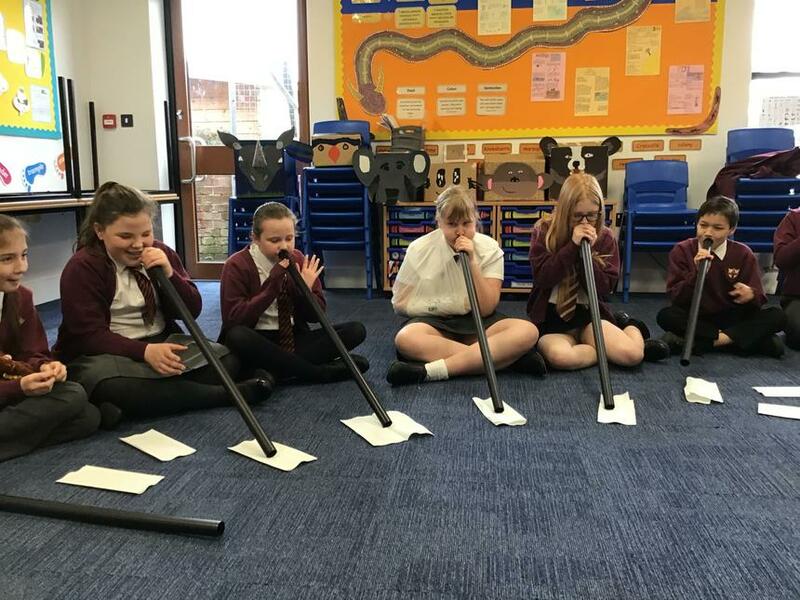 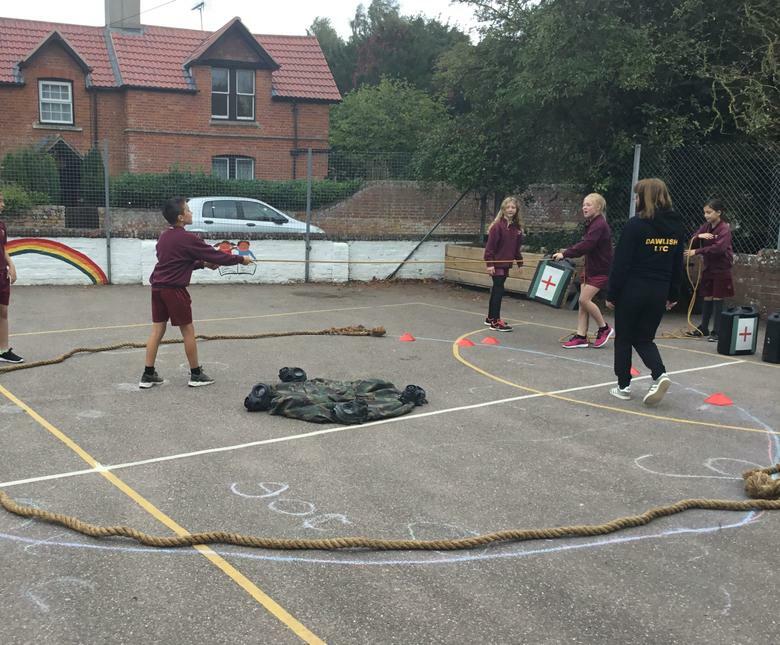 Today the children worked really hard to learn the core text 'The Machine Gunner' off by heart! 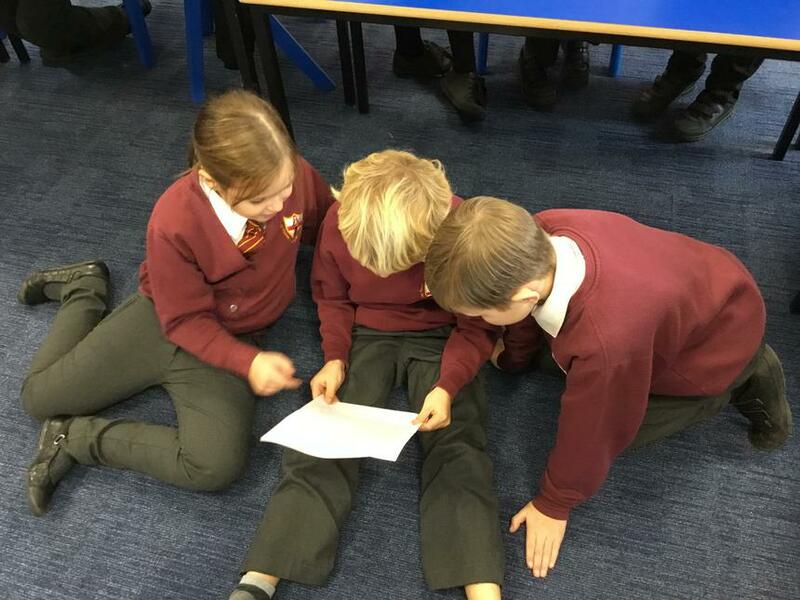 We discussed the text as a class, sharing our thoughts and opinions. 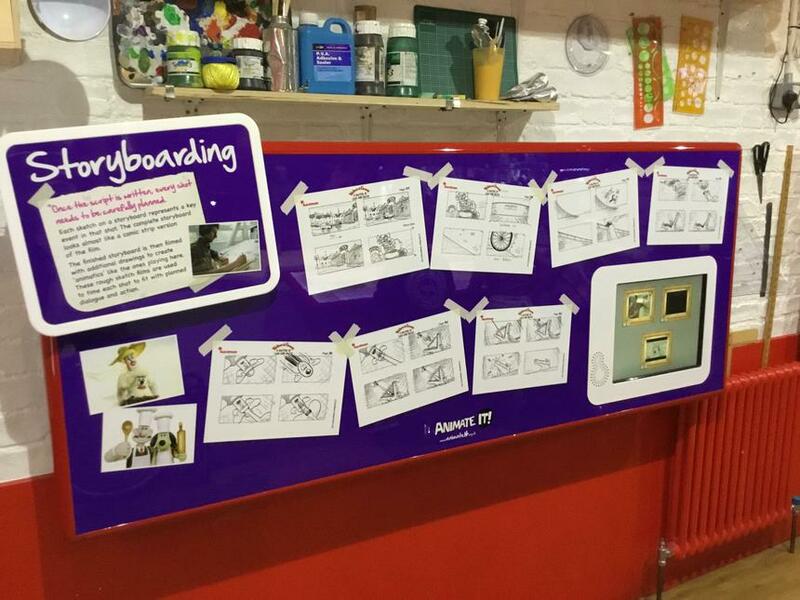 We then got busy learning the tale using story boarding and key actions to help us! 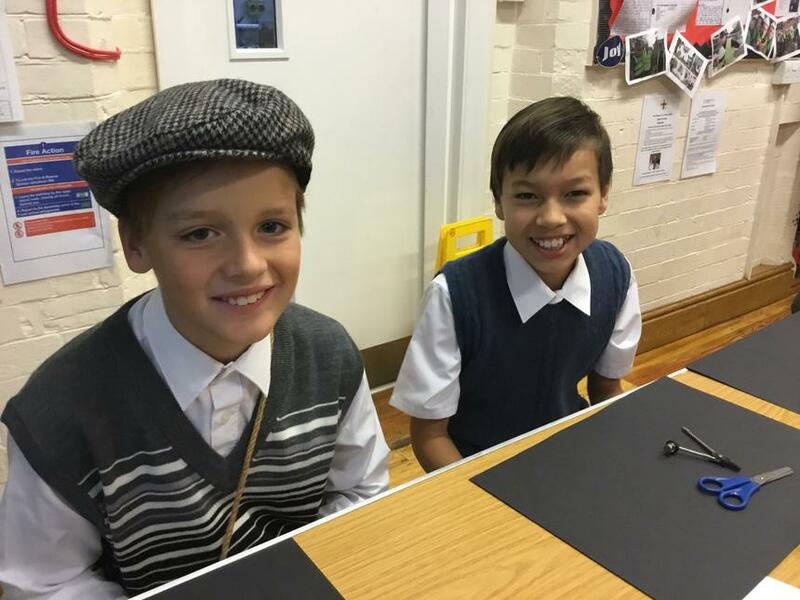 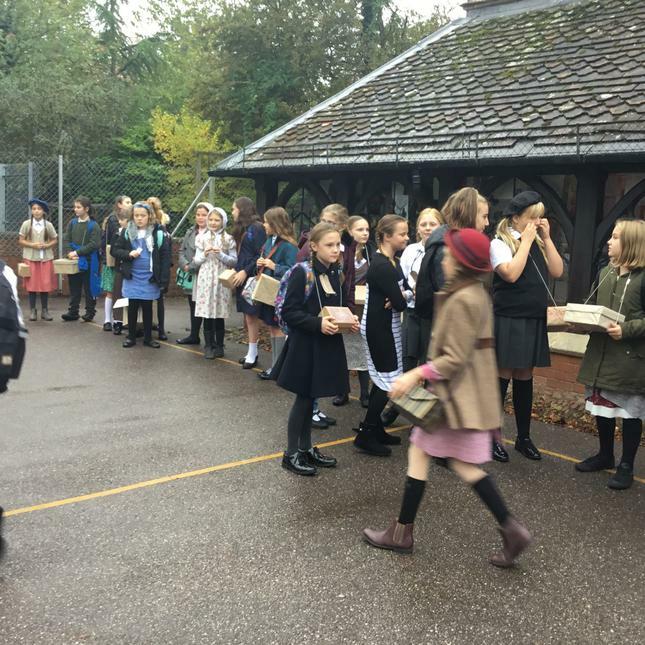 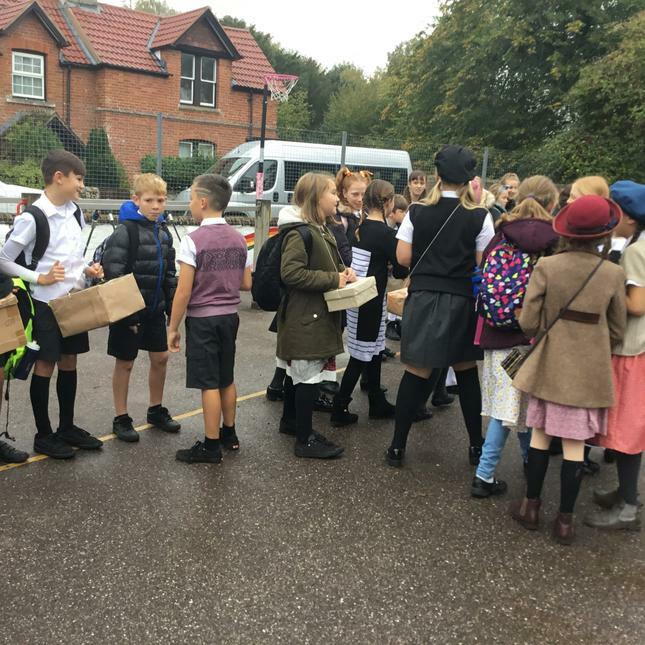 This will build towards the pupils writing their own finding tale based on our World War II topic. 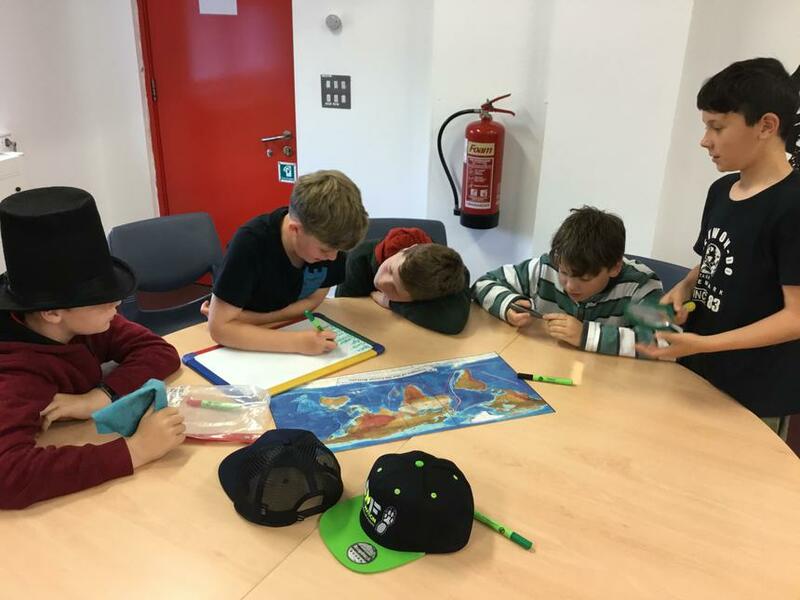 Pyrenees Class in a Nutshell! 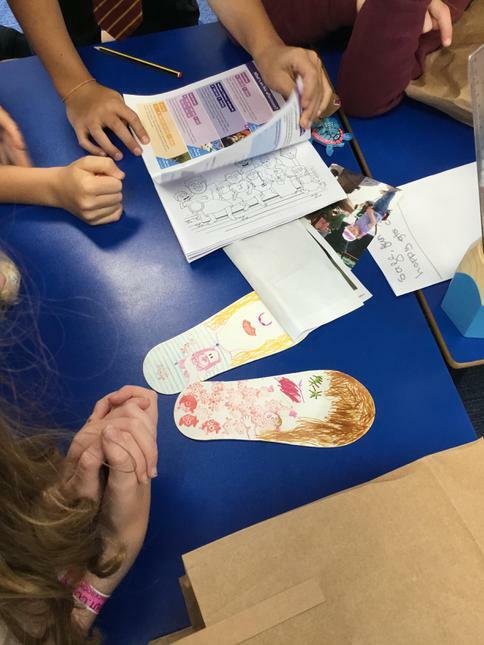 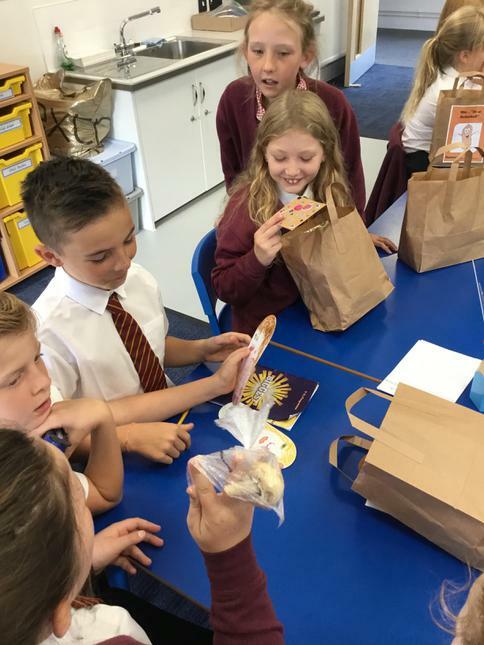 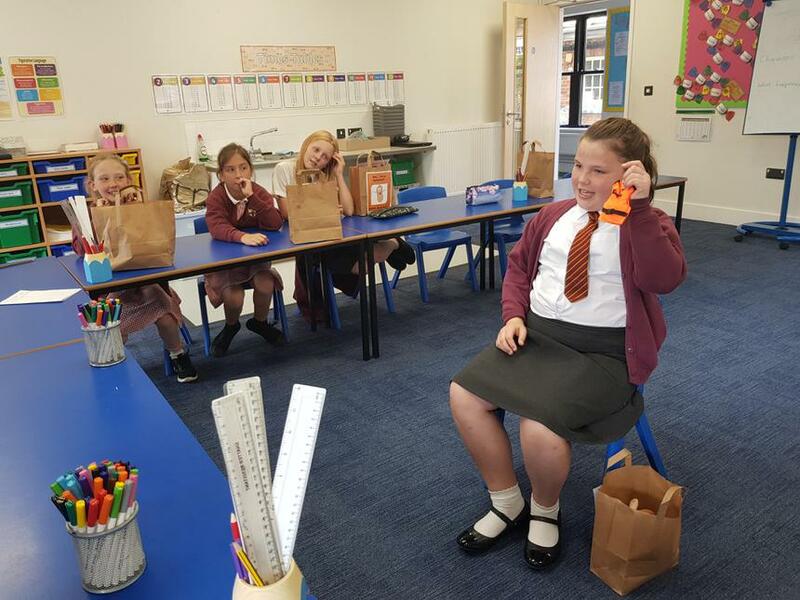 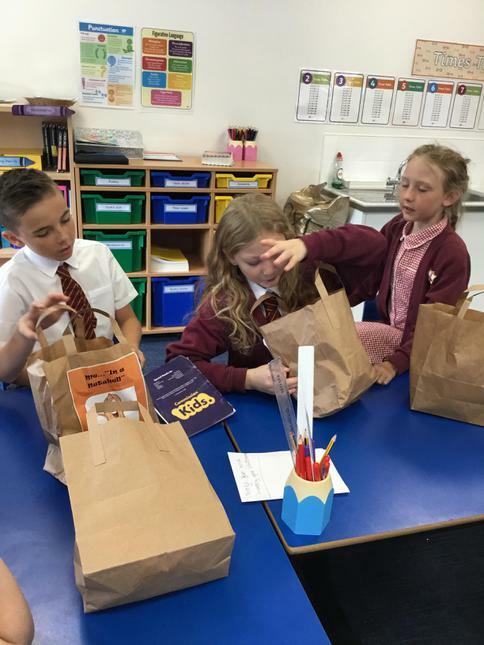 Pyrenees Class have enjoyed learning more about each other this week by presenting their 'Me in a Nutshell' bags. 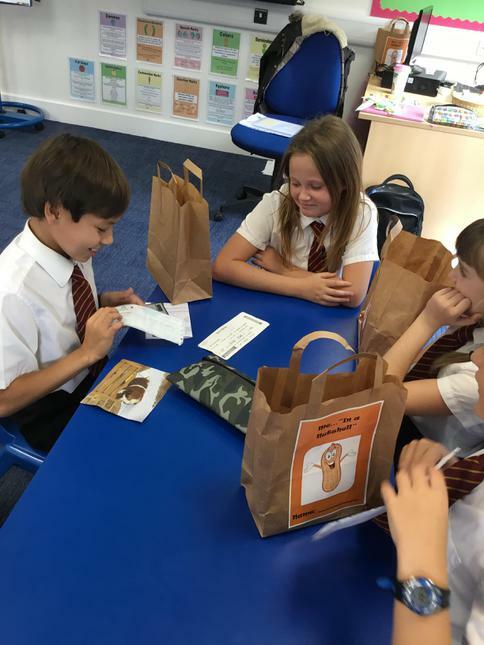 The children have been amazing at choosing items that are special and unique to them. 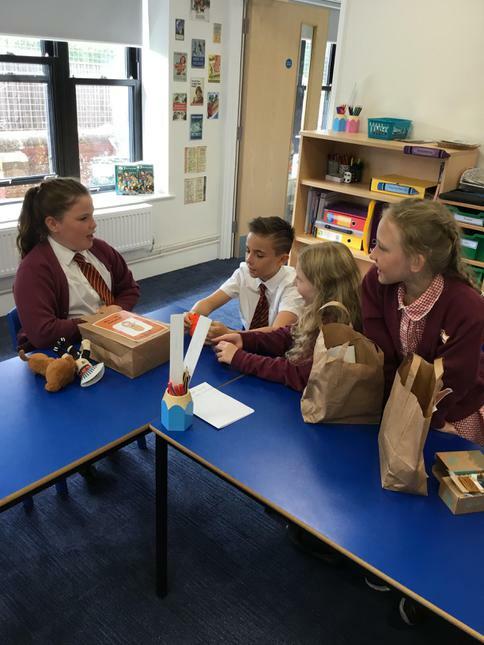 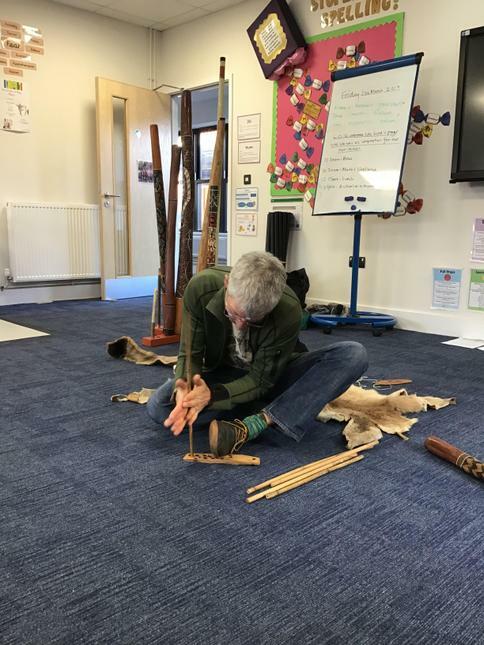 We have all had fun trying to guess the importance of each object and I have certainly learnt a lot about the children! 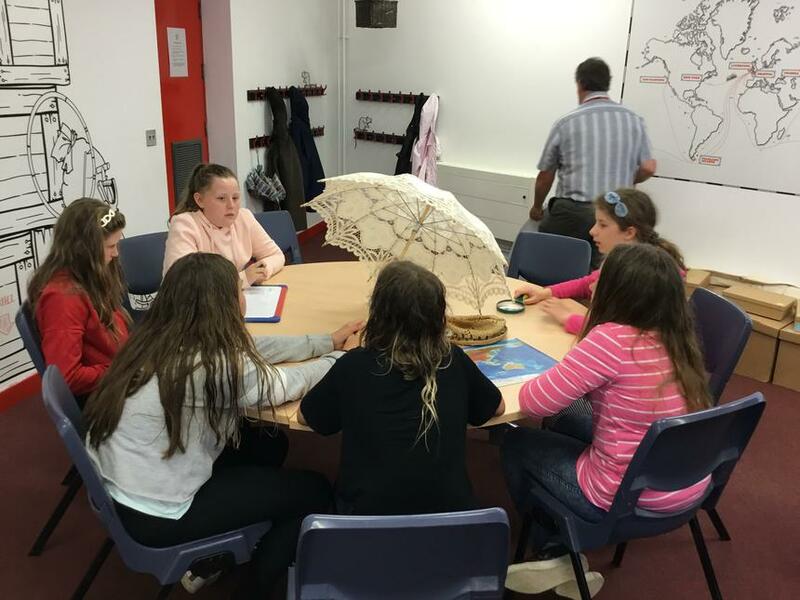 Thank you Pyrenees for getting so involved! 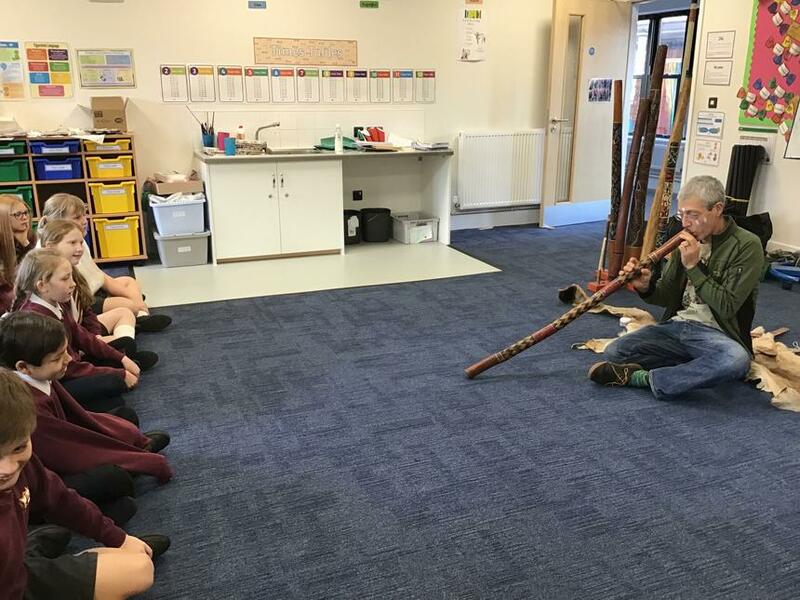 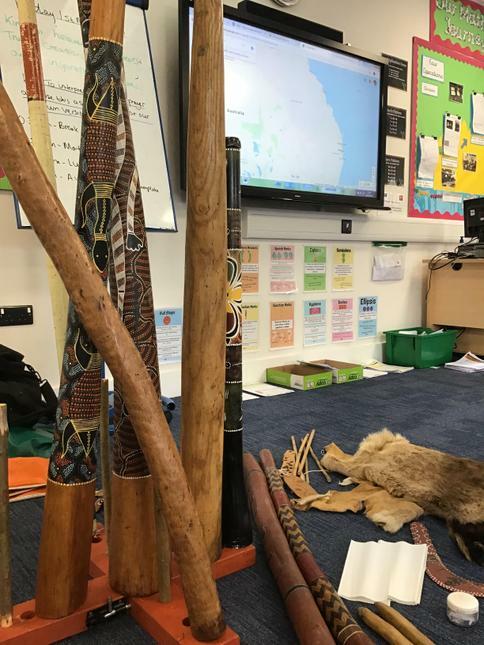 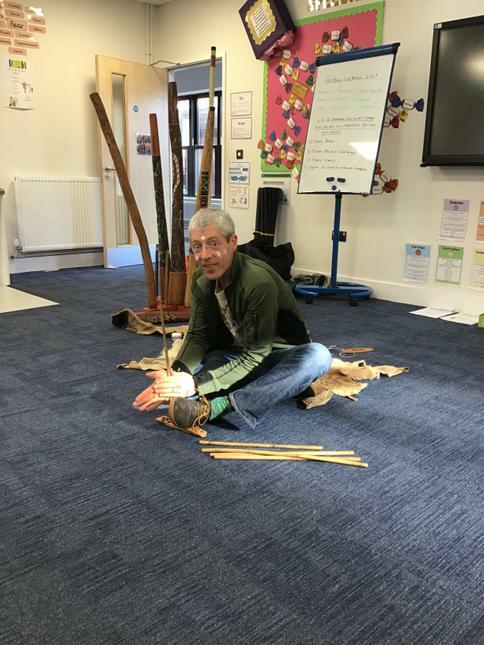 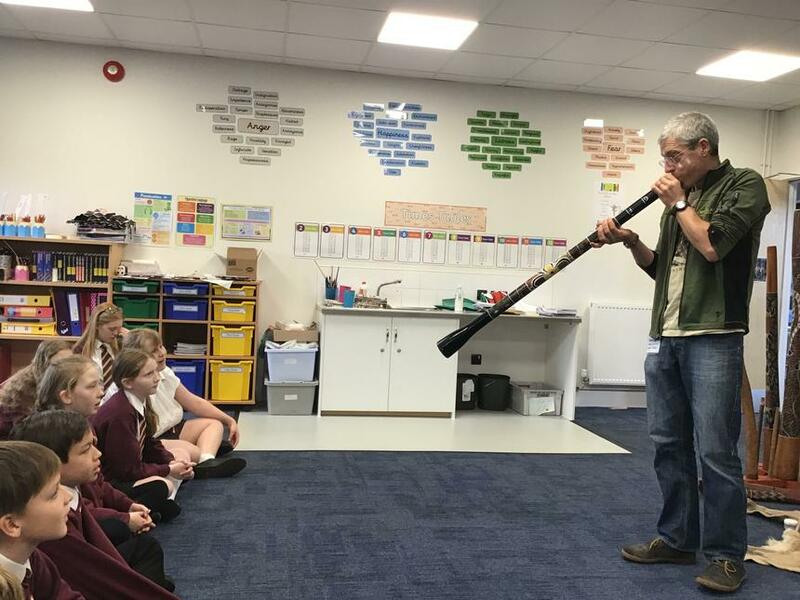 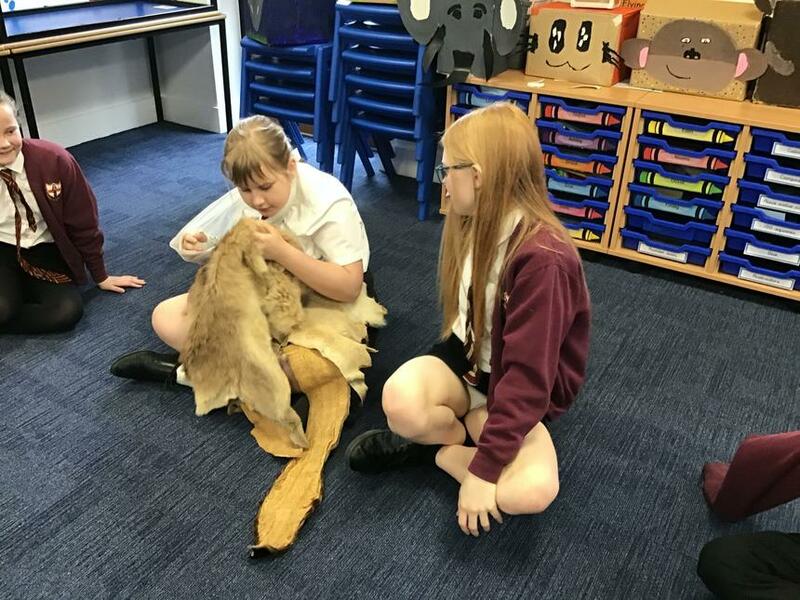 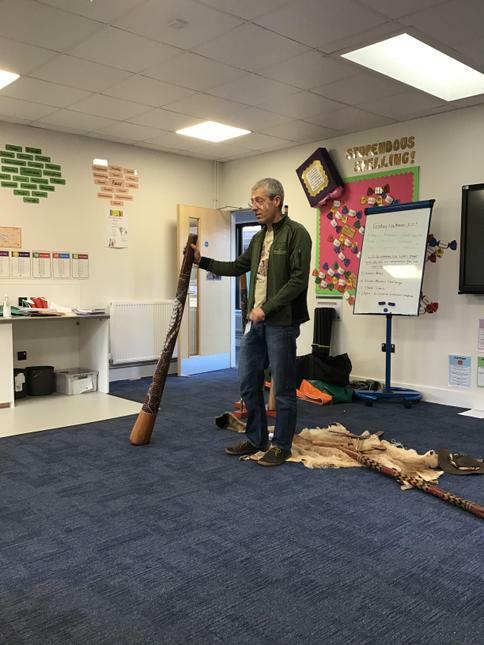 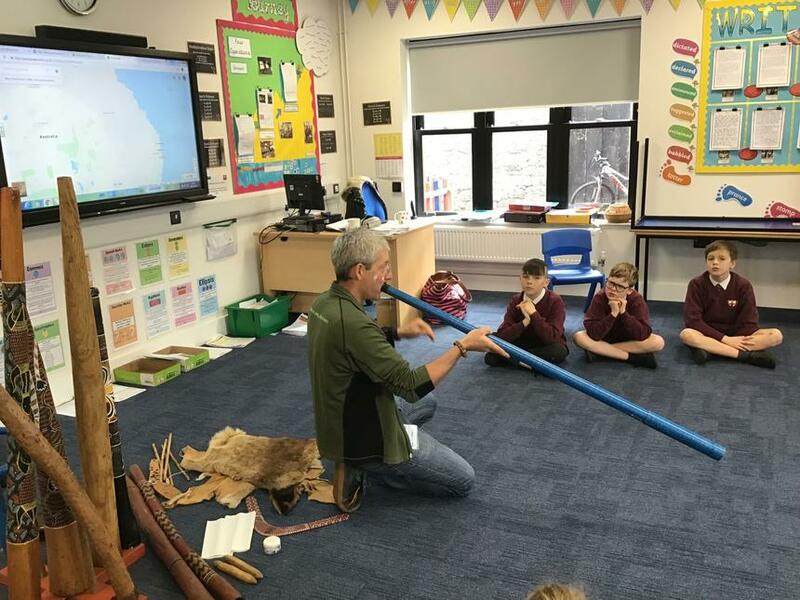 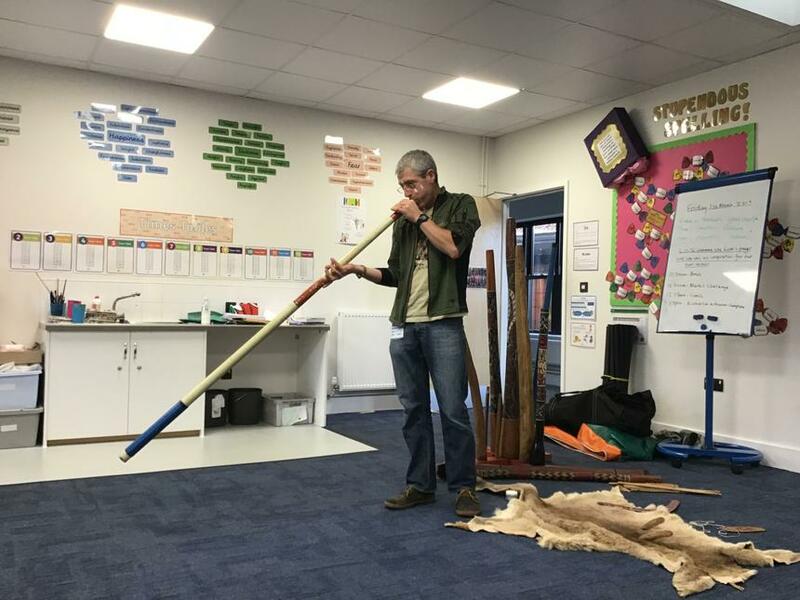 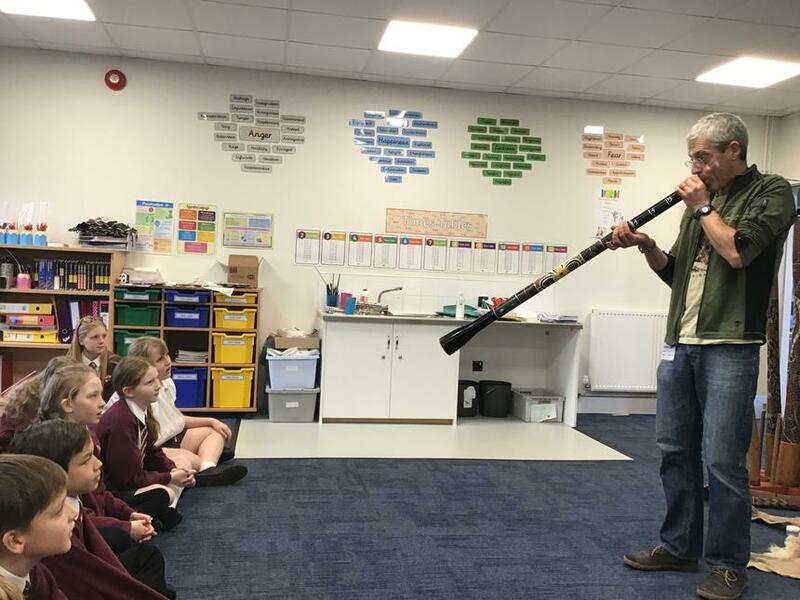 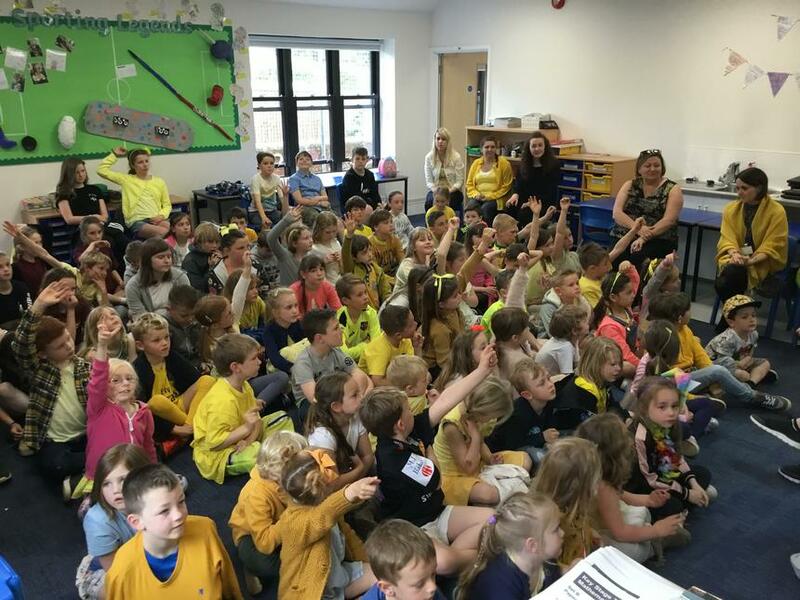 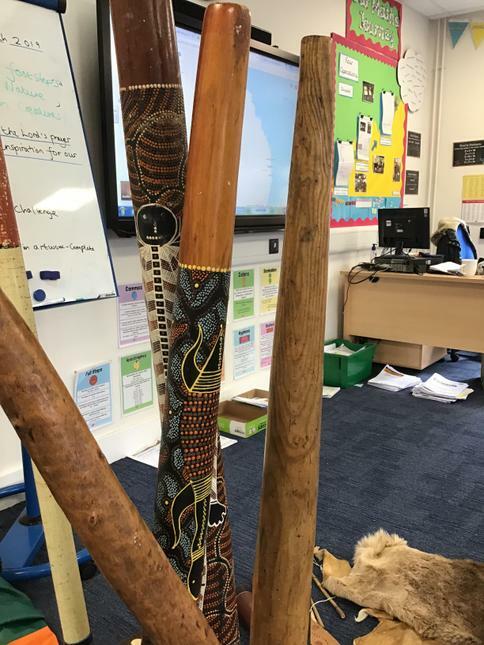 On Thursday 21st of June, classes 3 and 4 were very fortunate to have a visitor to come and speak to us. 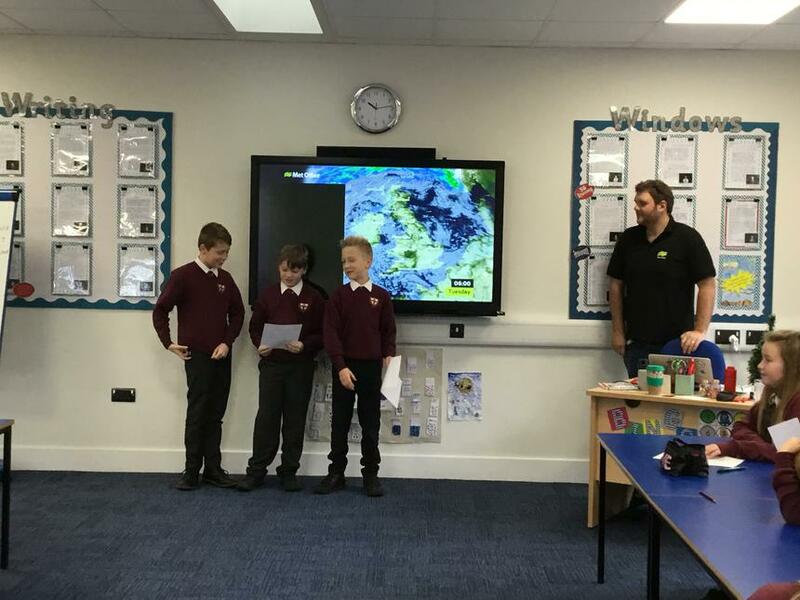 Here are some examples of the questions we asked Matt and his answers to our questions. 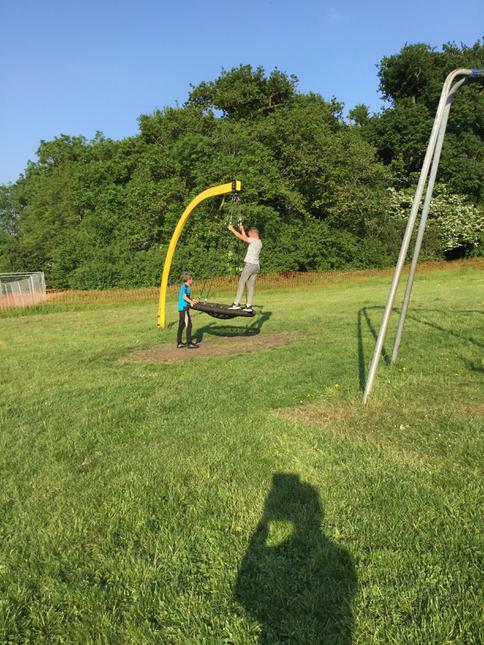 Interviewer: How many kick-ups can you do? 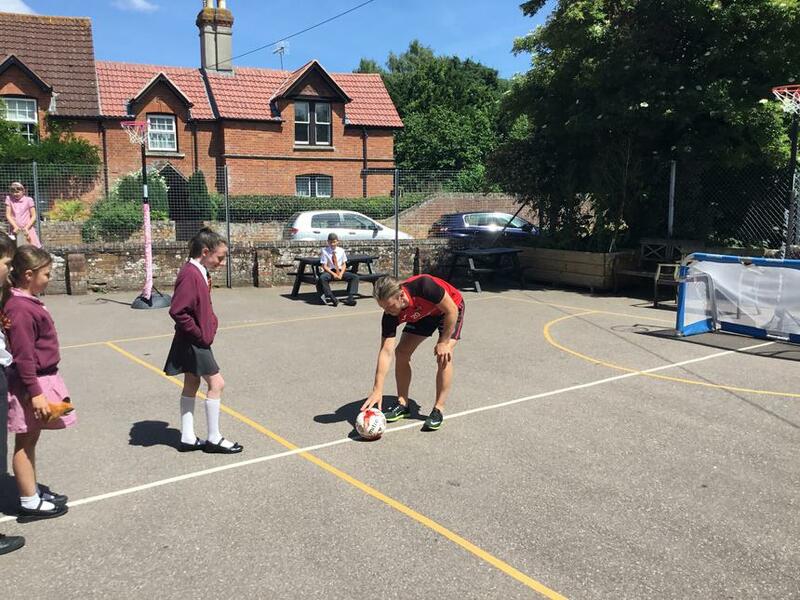 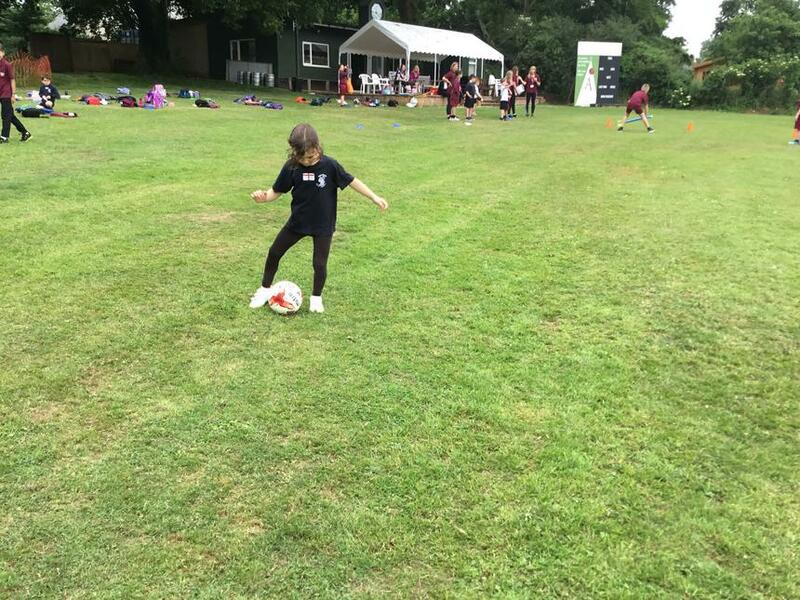 Matt Jay: I can do about 300 kick-ups as Miss Jay proved when she was younger, and all the kicking in the back garden! 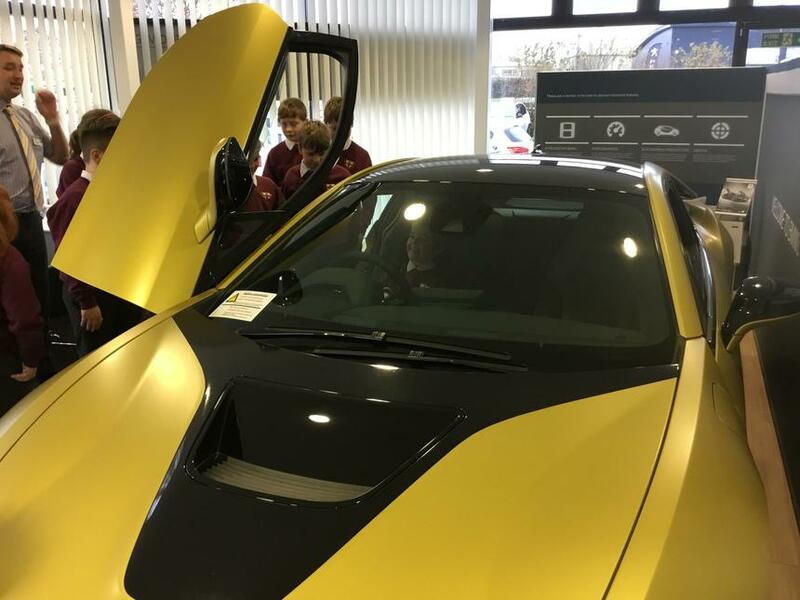 Interviewer: What car do you have? 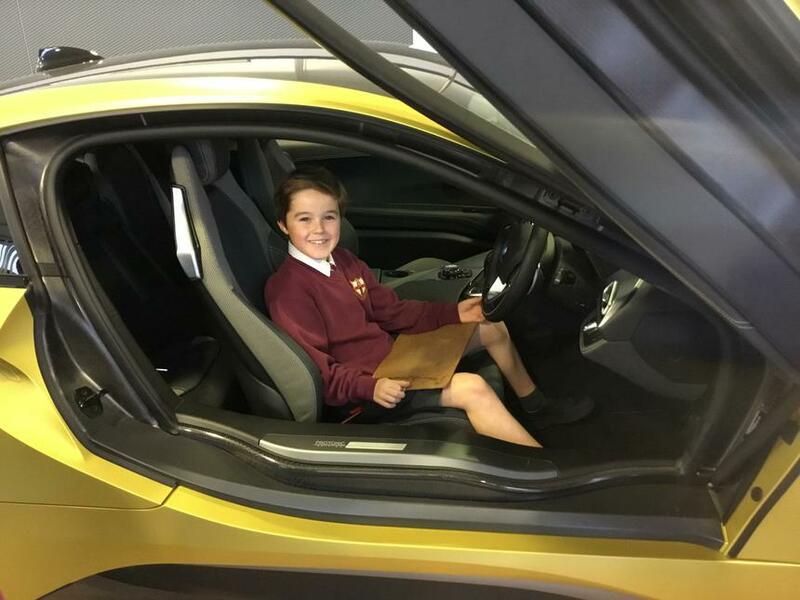 Matt Jay: I have a Peugeot 308, in the colour black. 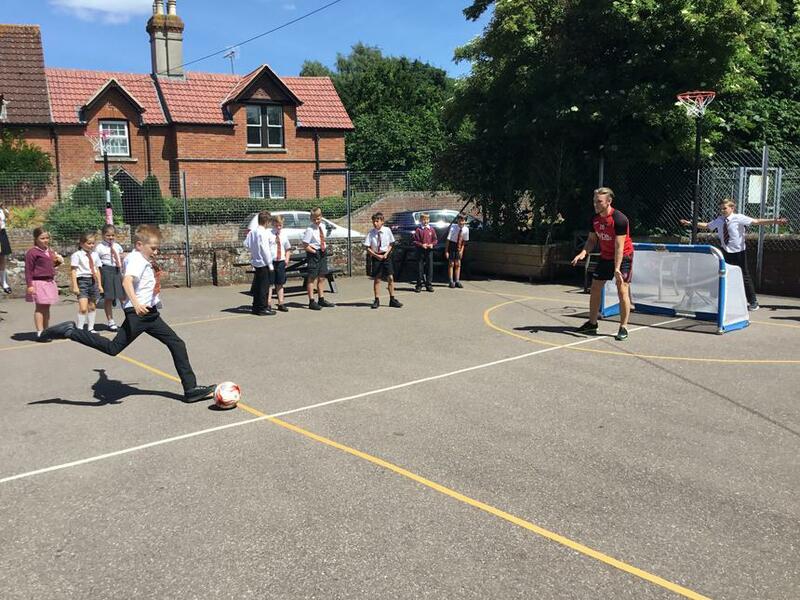 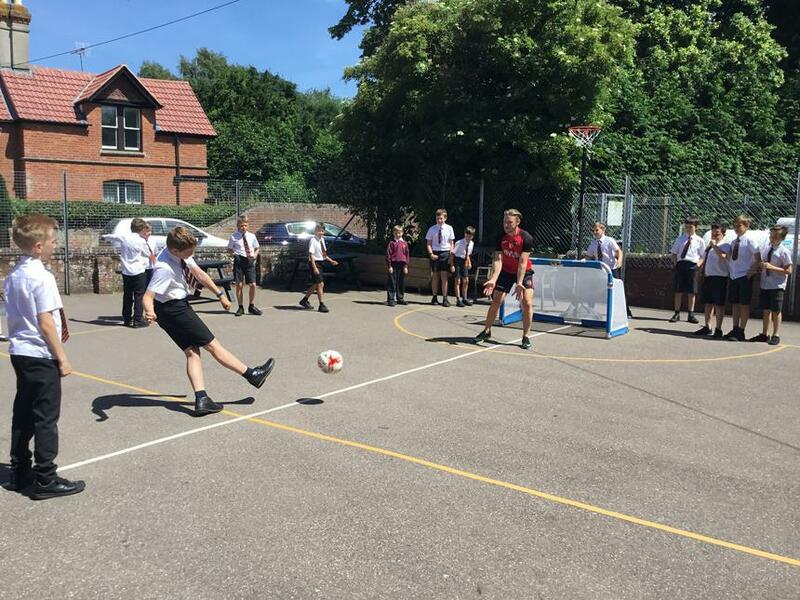 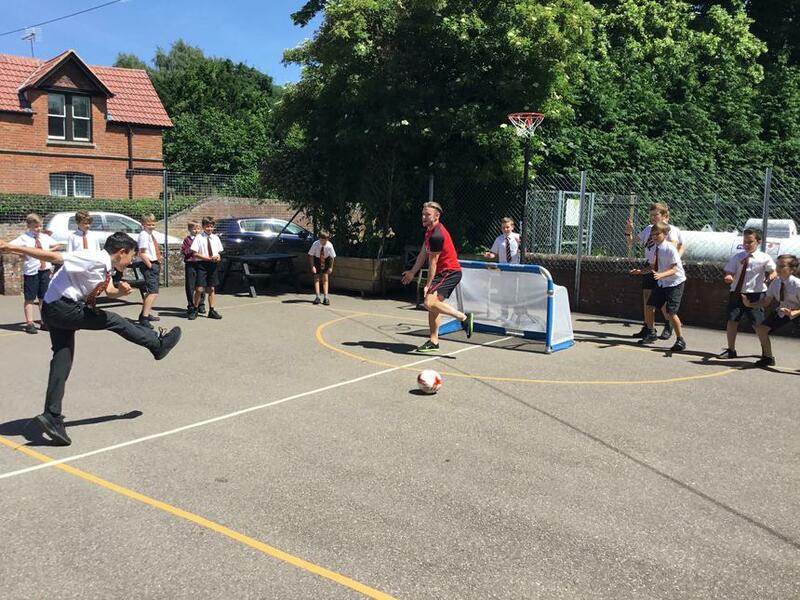 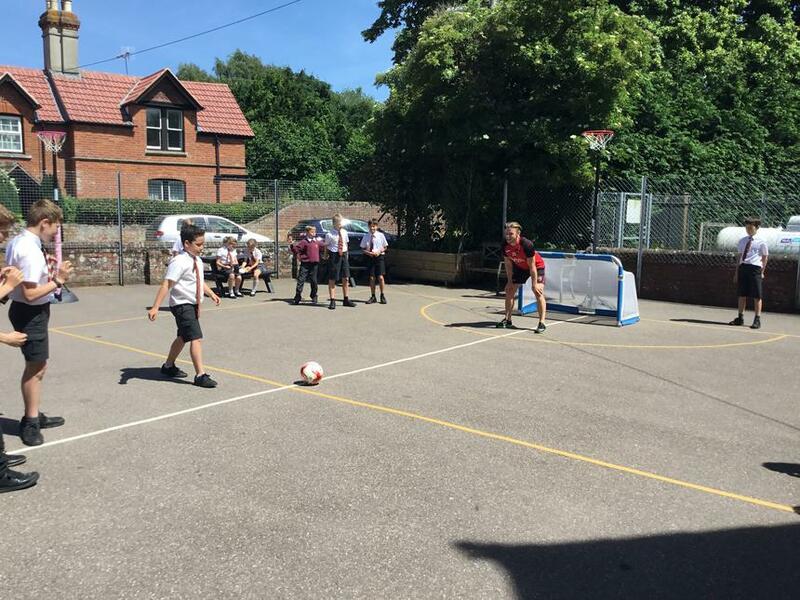 The penalty shootouts consisted of a goal placed at the far end of the playground, the children had to run and shoot into it. 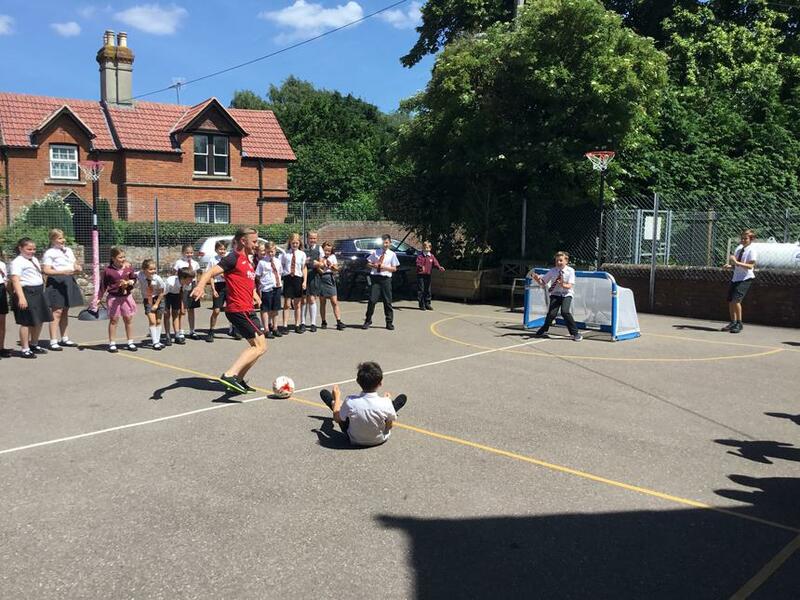 Some of the children got the ball in, some got it over and a few hit him. 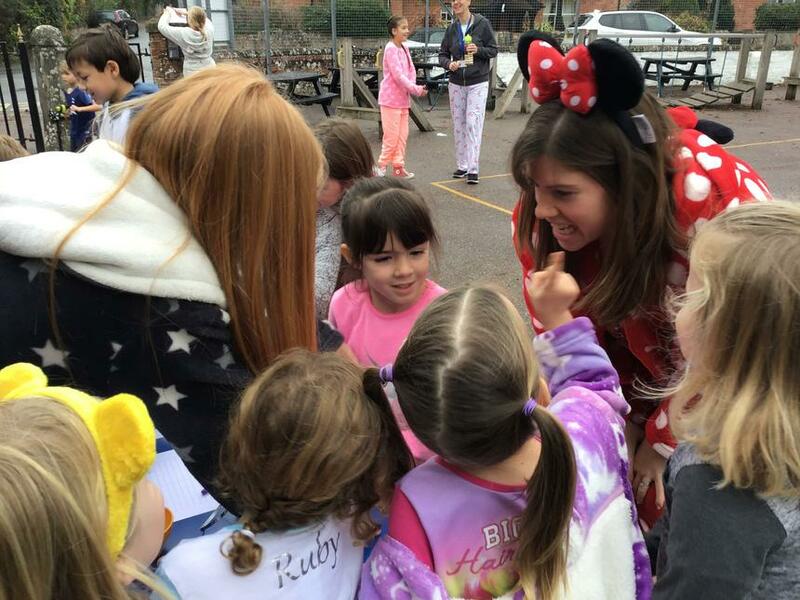 The children got a celebrity high-5 as well which we all were very happy about. 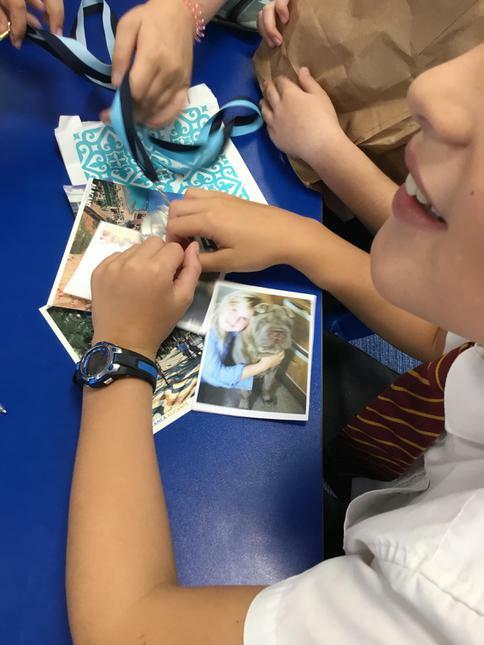 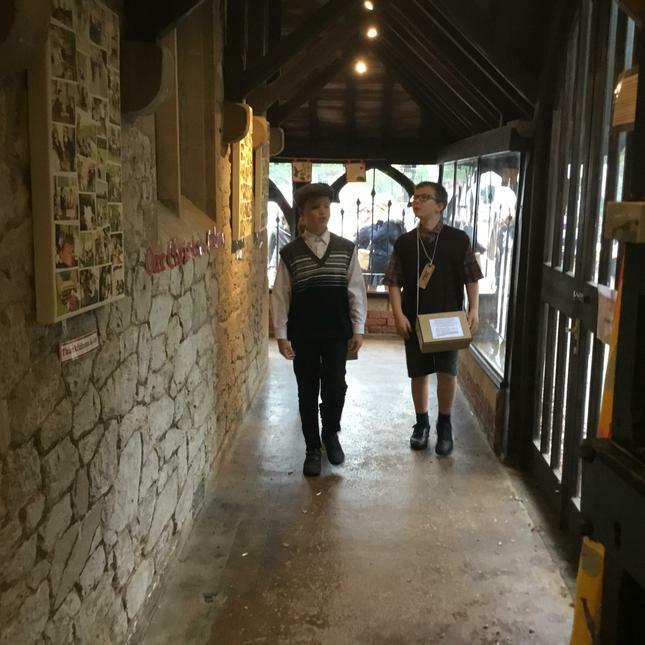 All of the children were very lucky to get Matt's autograph and a picture with him, the pictures of us and Matt will be printed off to take home. 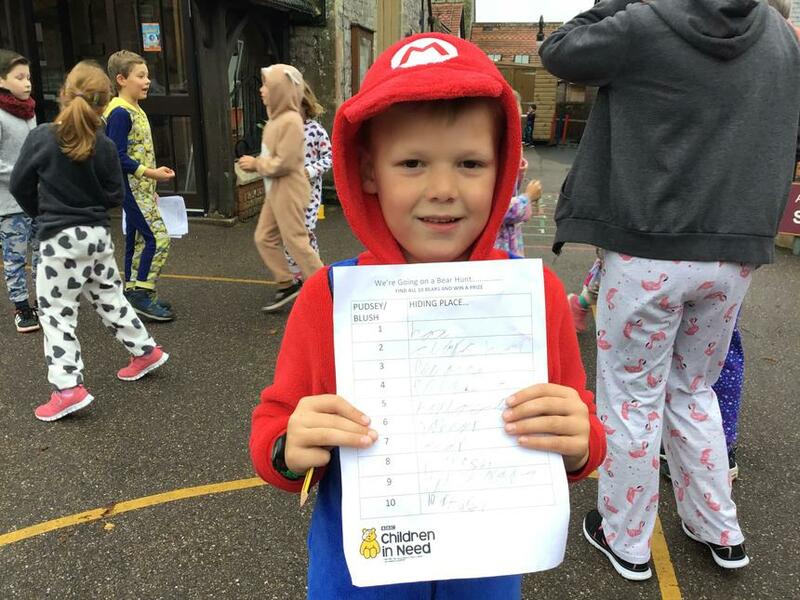 Matt's autograph that he gave us, the children took home or stayed in school to get laminated. 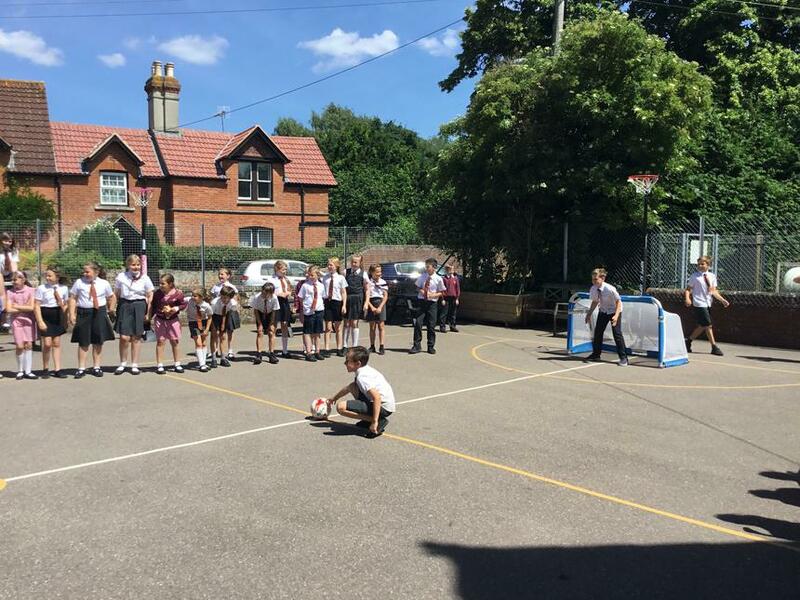 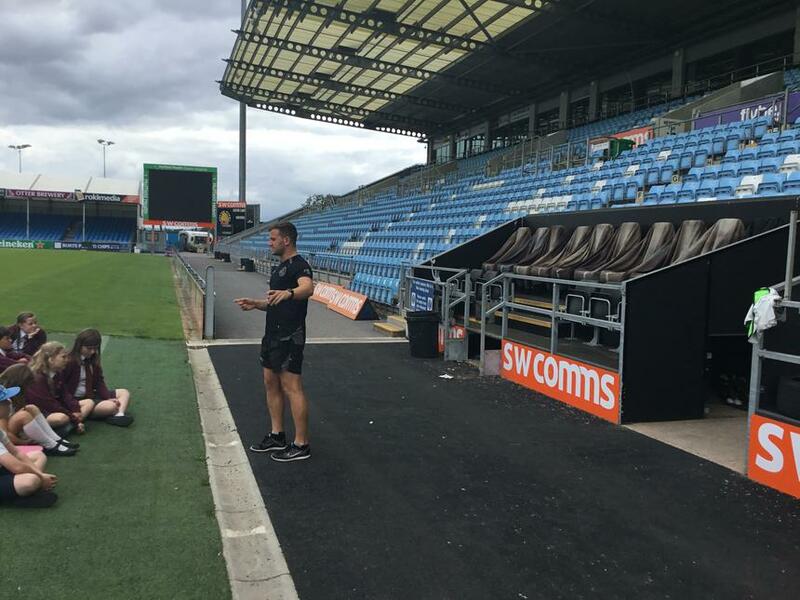 We all would like to say a massive thank you to Matt for taking up his time to come and see us for an interview session, penalty shoot outs, pictures with him and his autograph. 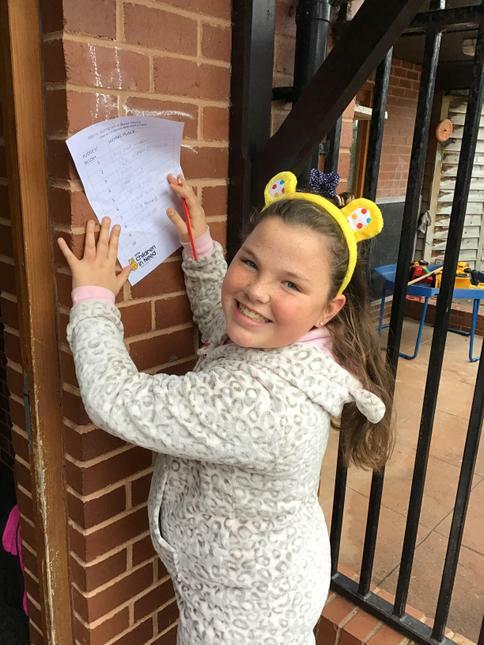 Written by Holly Neaves and Eleni Luckhurst. 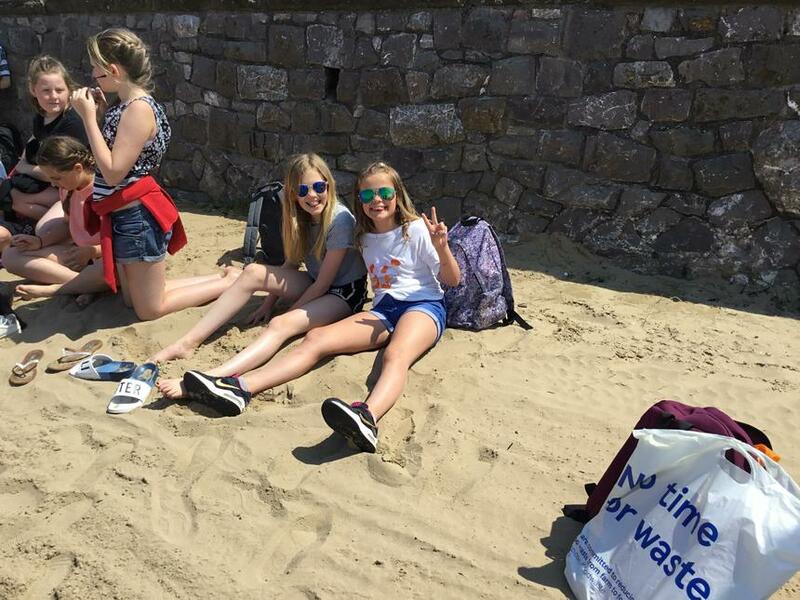 Pyrenees Class have just returned home from a fantastic three day break in Bristol and the surrounding area. 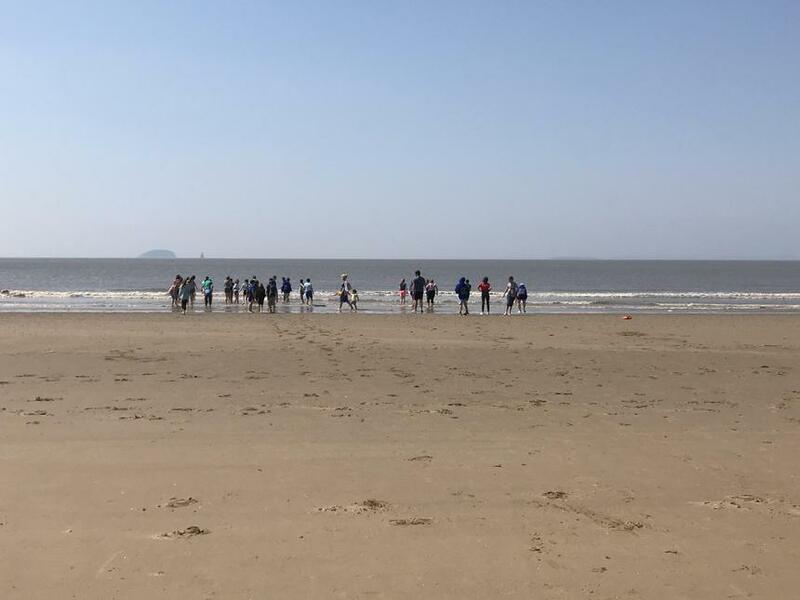 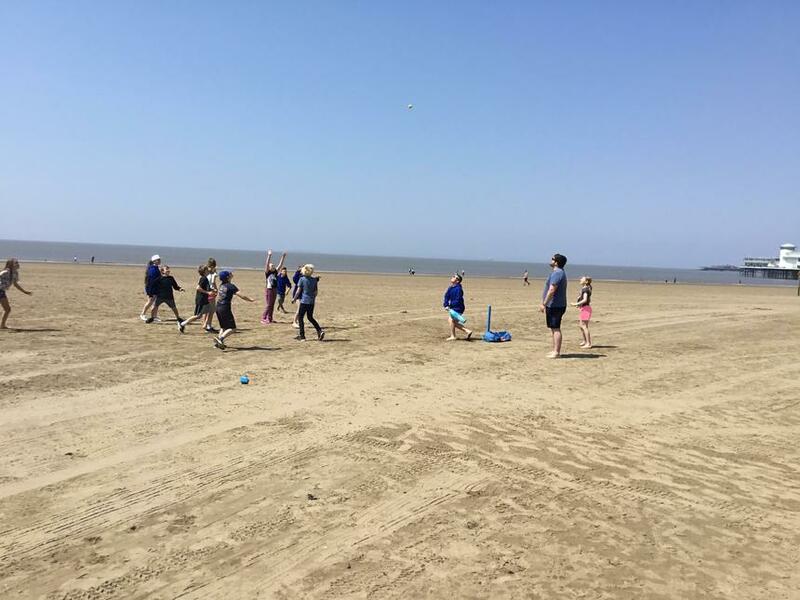 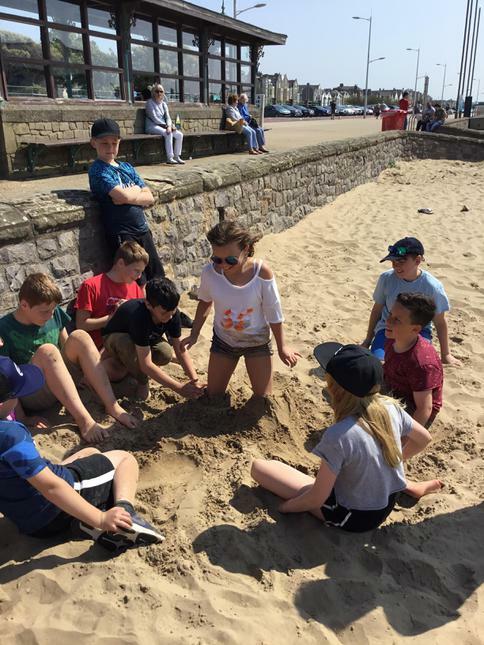 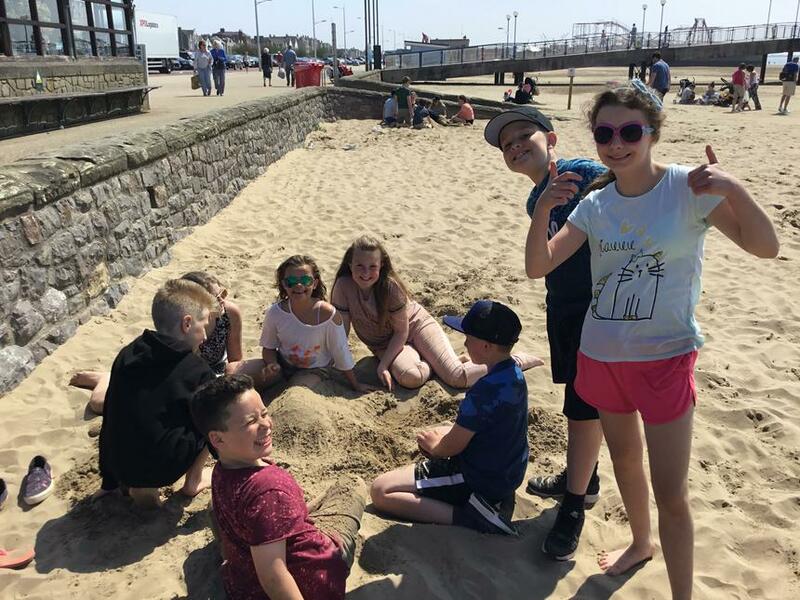 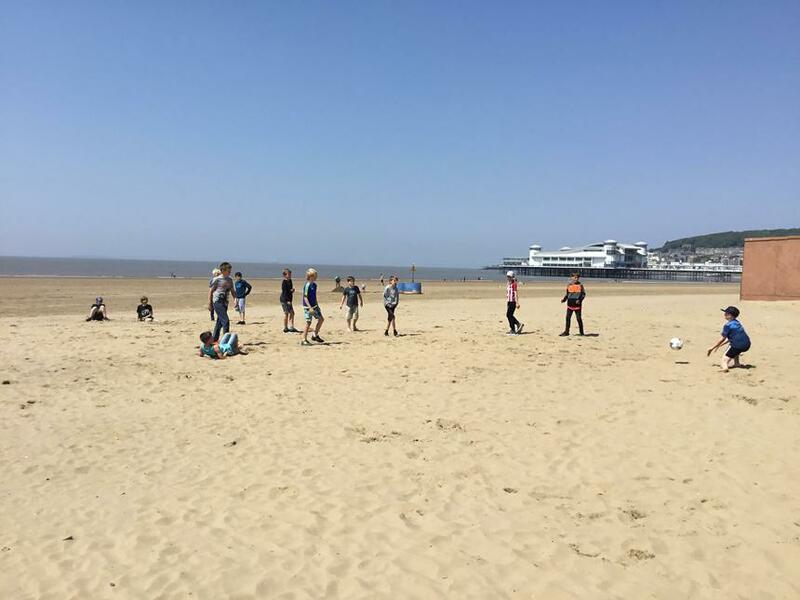 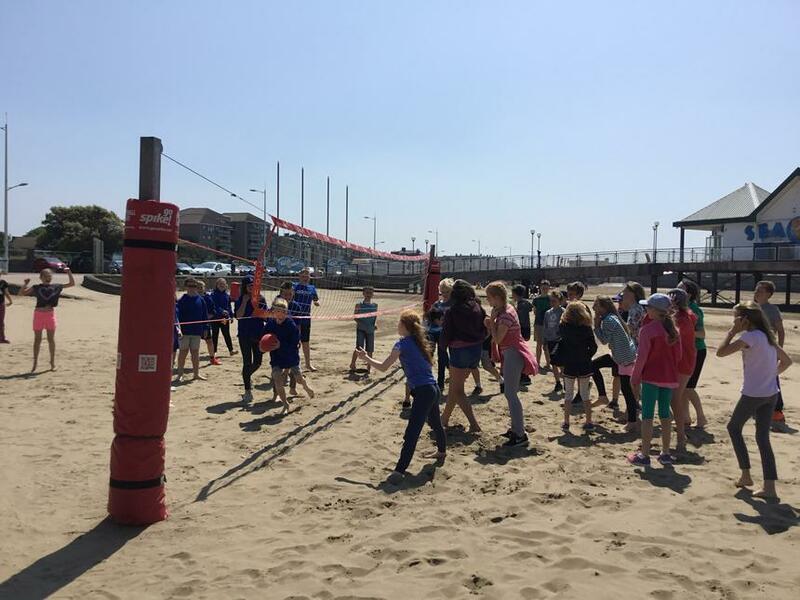 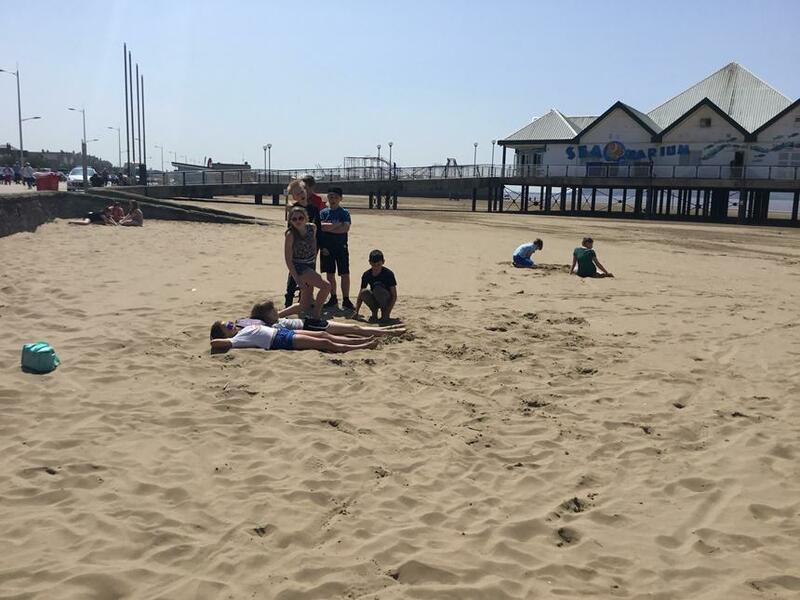 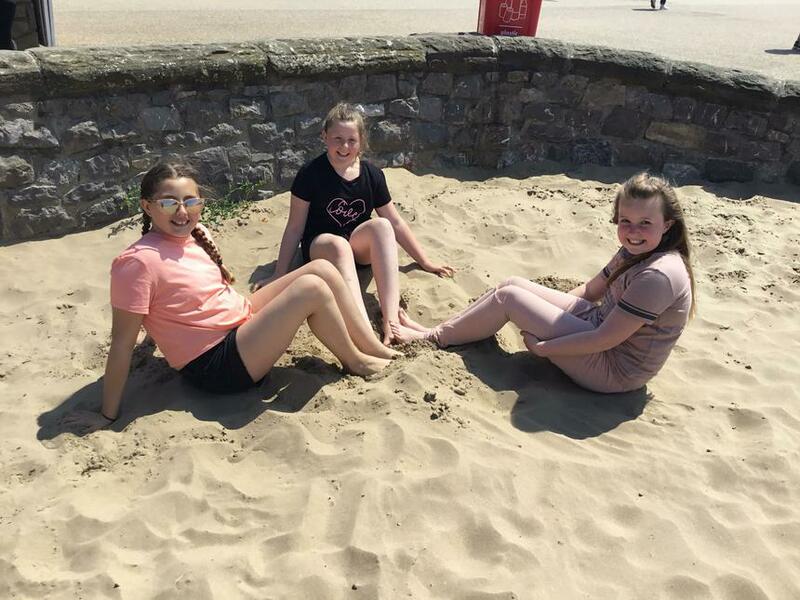 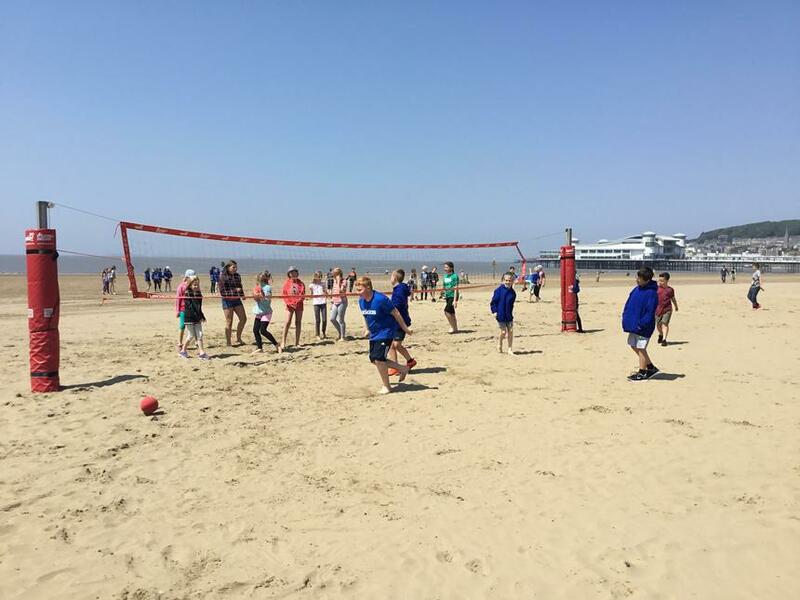 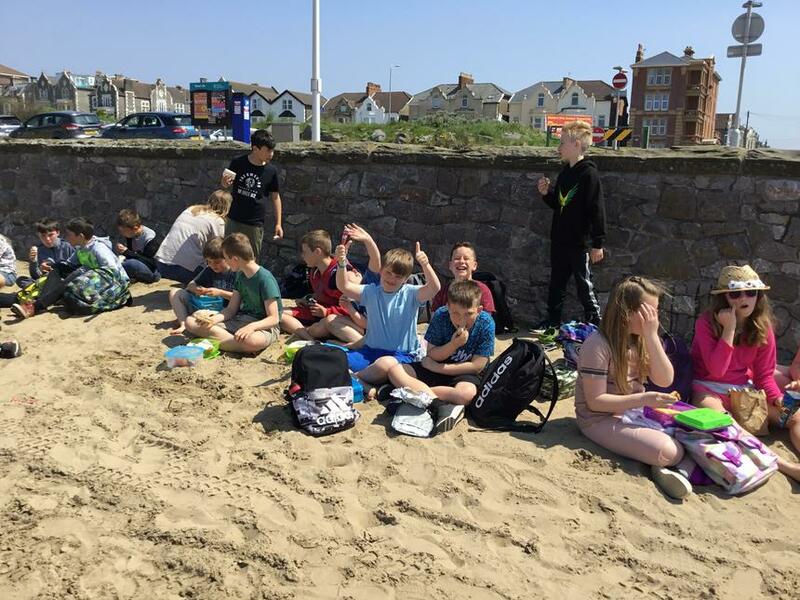 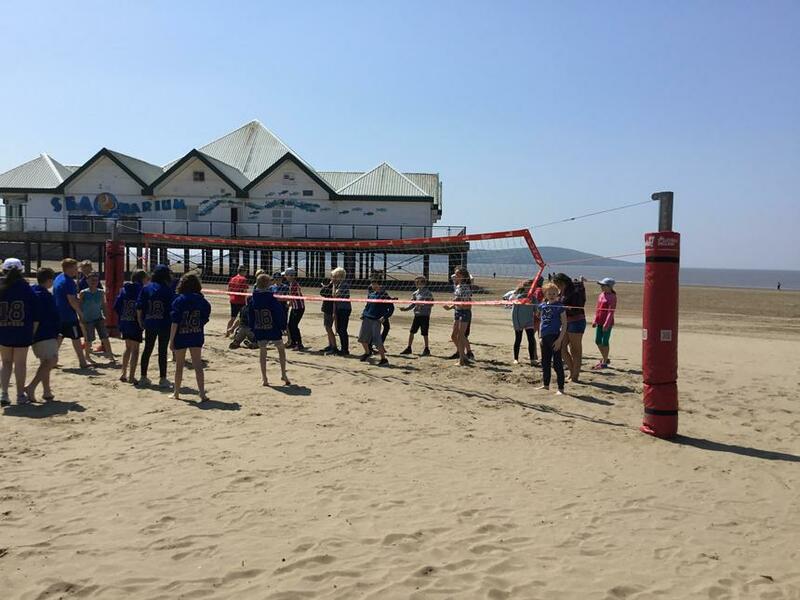 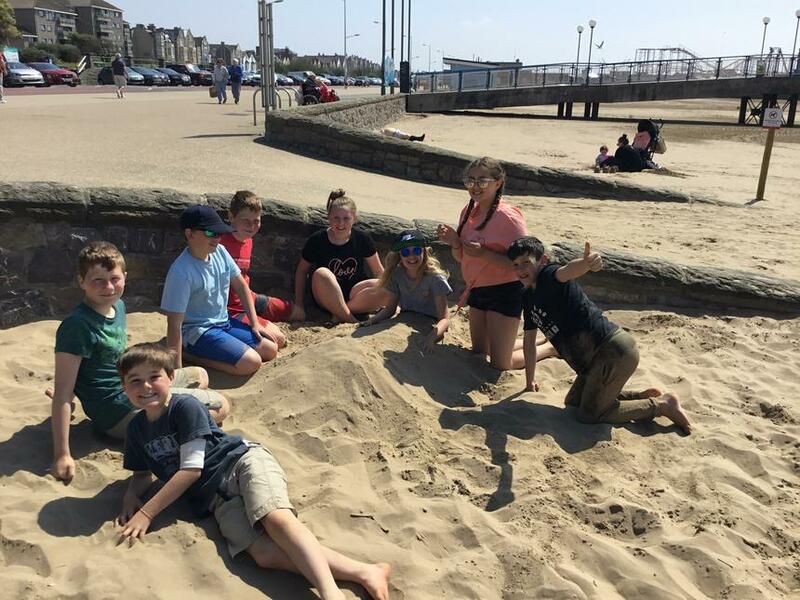 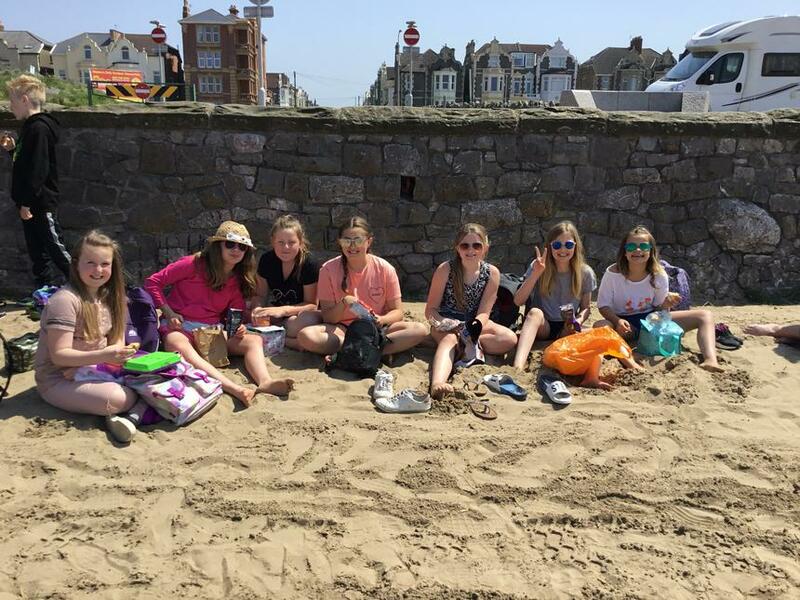 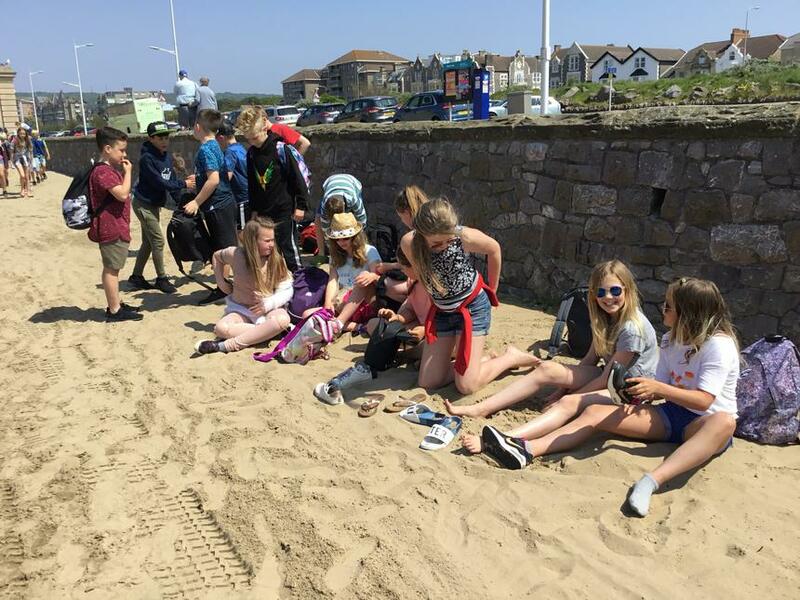 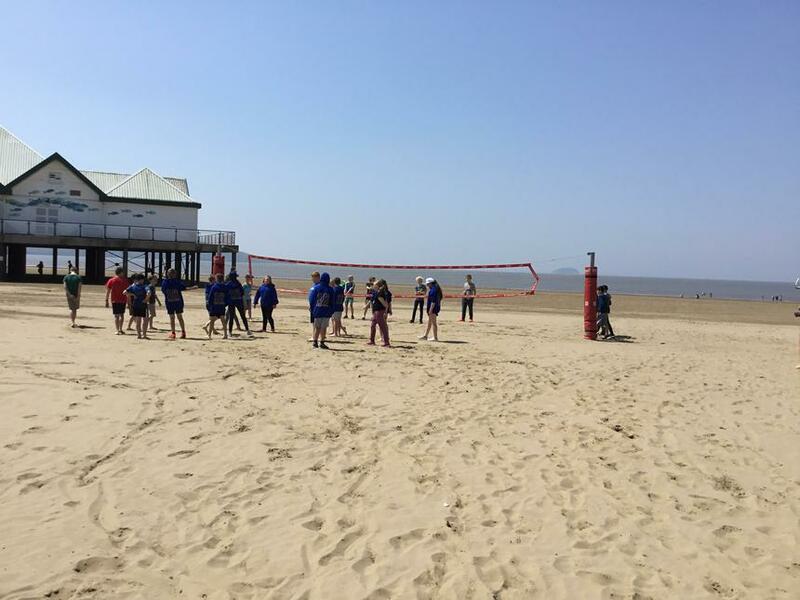 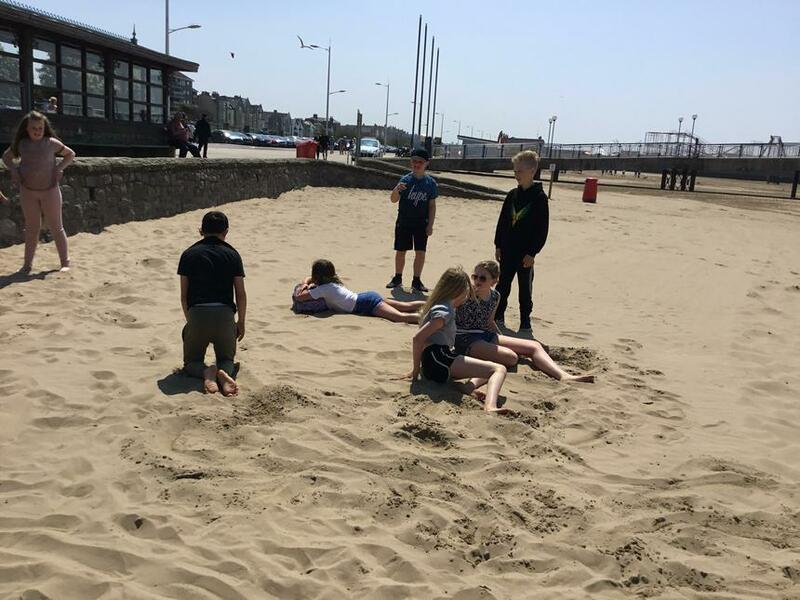 The children departed school and travelled to Weston Super Mare by coach, spending the day on the beach. 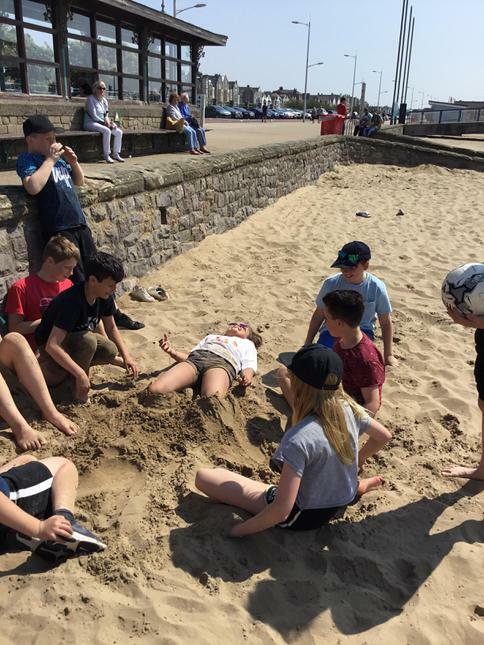 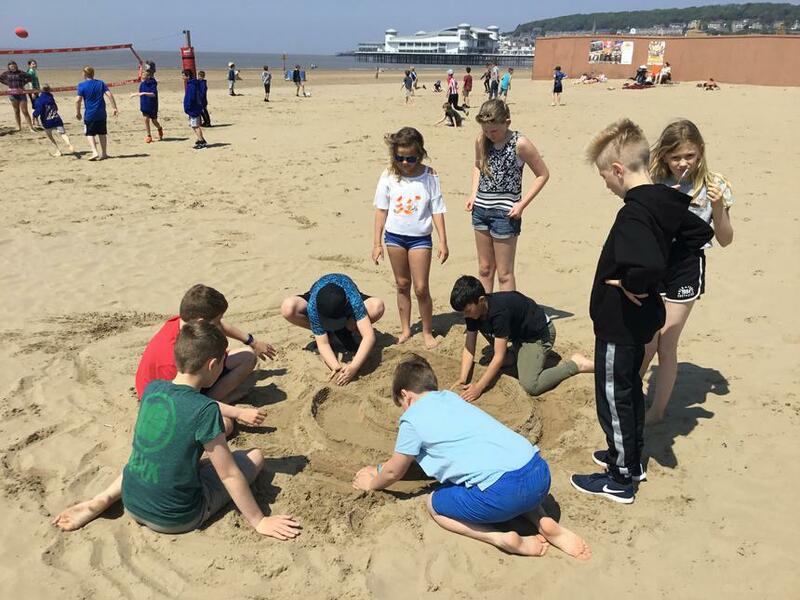 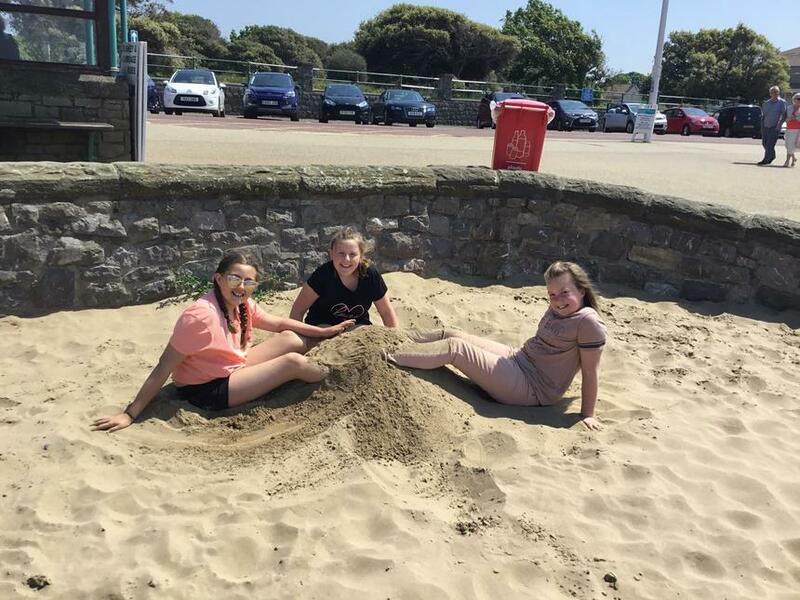 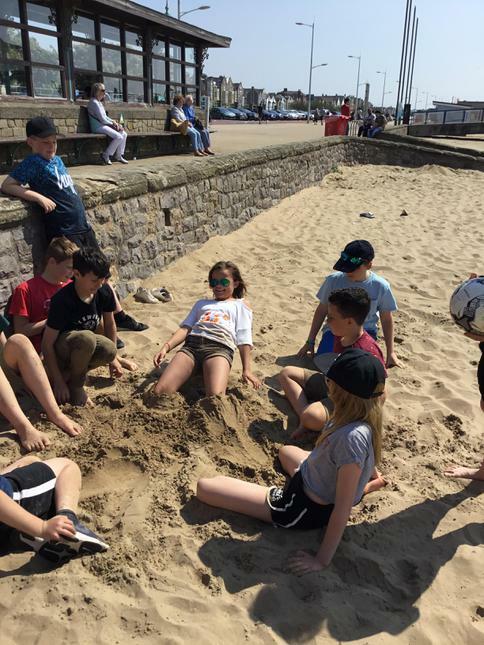 The children had a wonderful day spending time with their friends, creating sculptures out of sand, playing team games on the beach and even going for a little paddle in the sea (which we decided wasn't as cold as we were expecting). 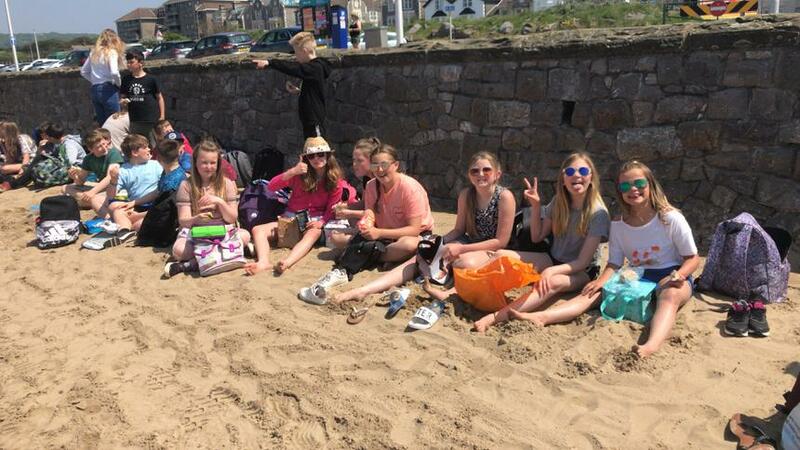 The beach trip was rounded off with an ice cream from a local stand! 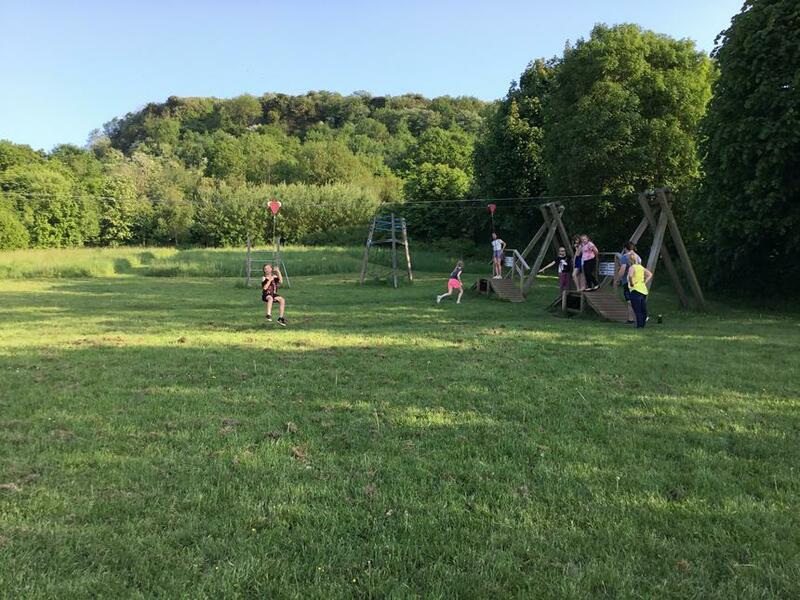 We then got back on the coach and drove the short trip to Barton Camp, which is located just outside of Bristol. 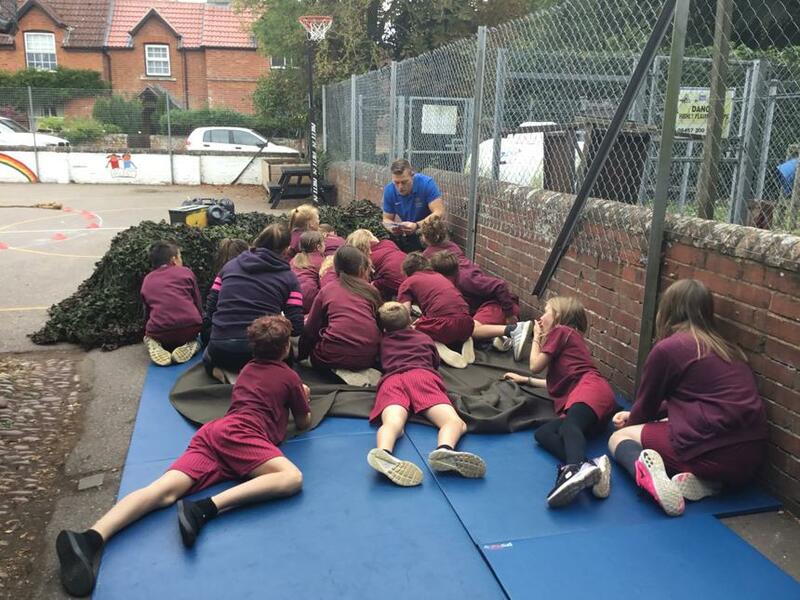 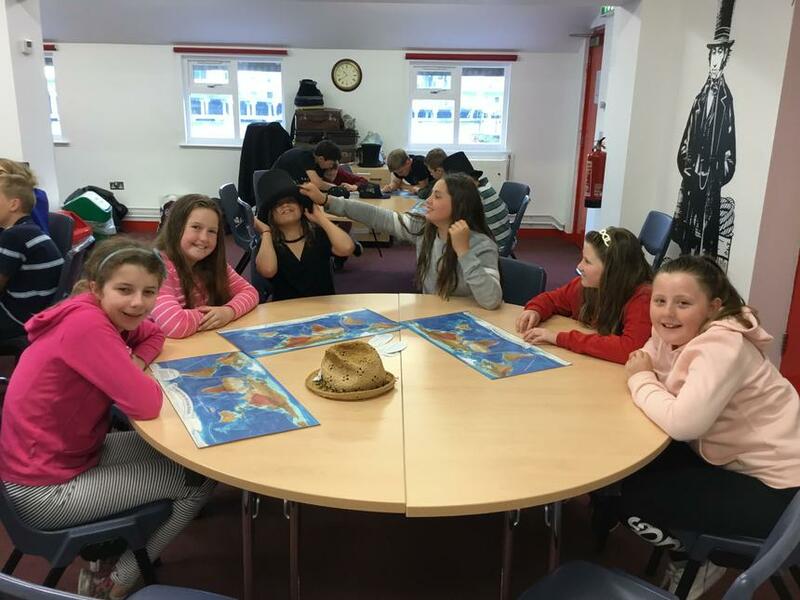 The children were able to settle into their rooms and make their beds before having dinner with the other two schools sharing the camp. 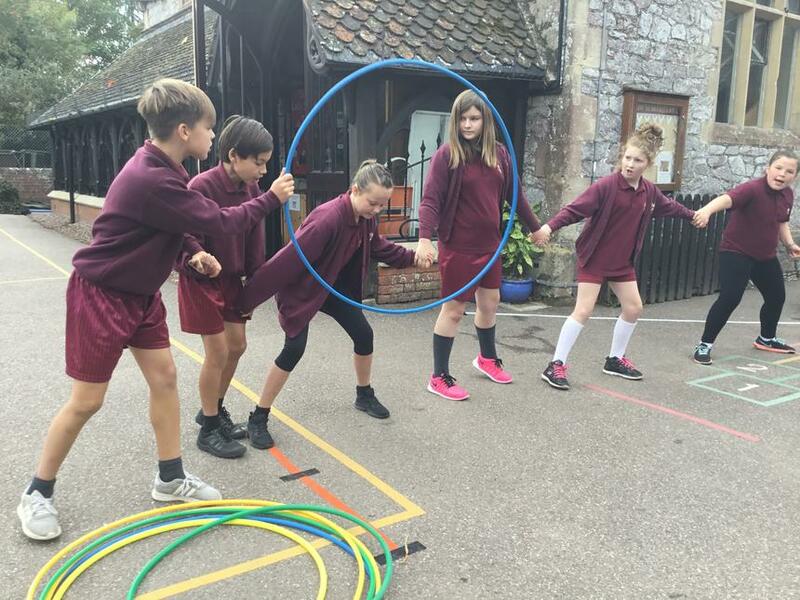 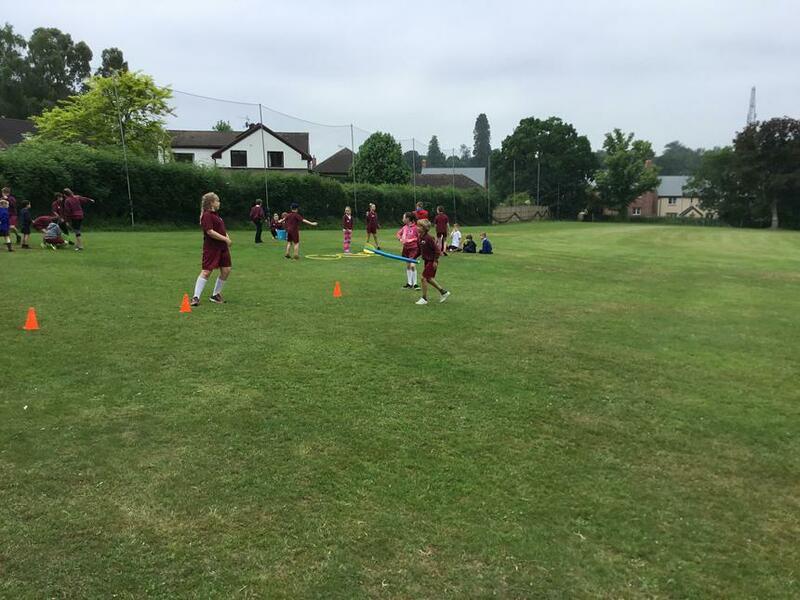 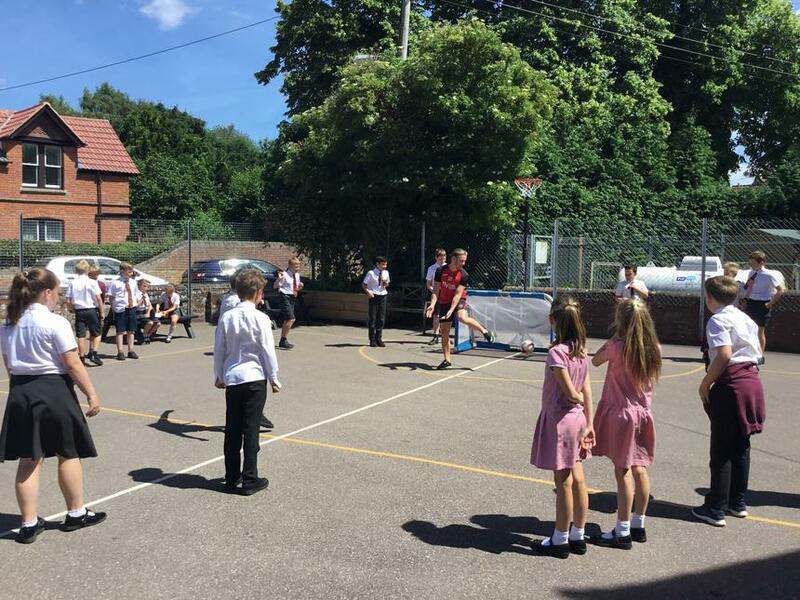 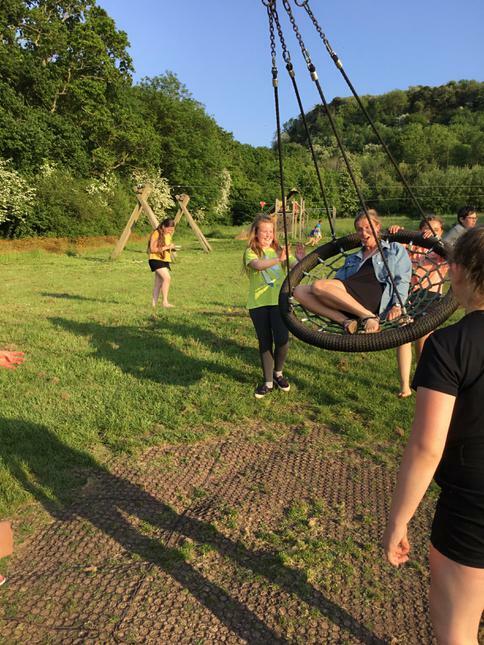 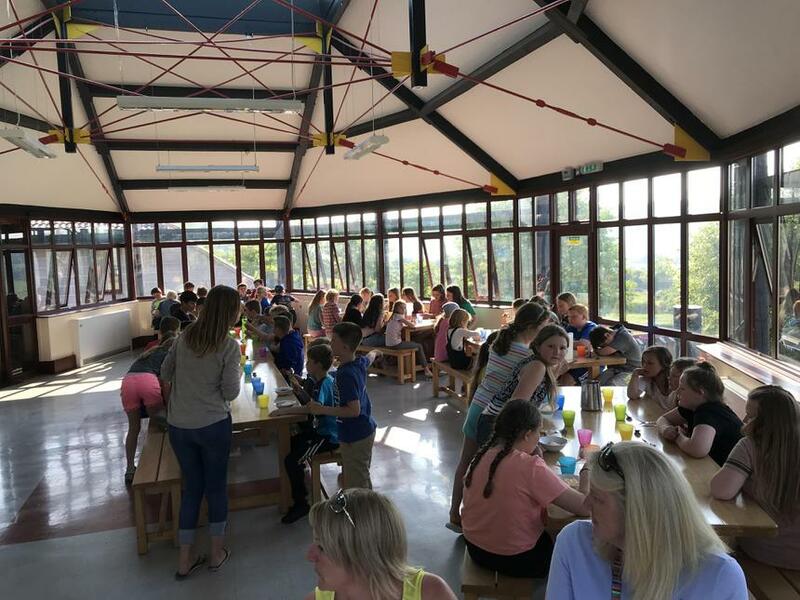 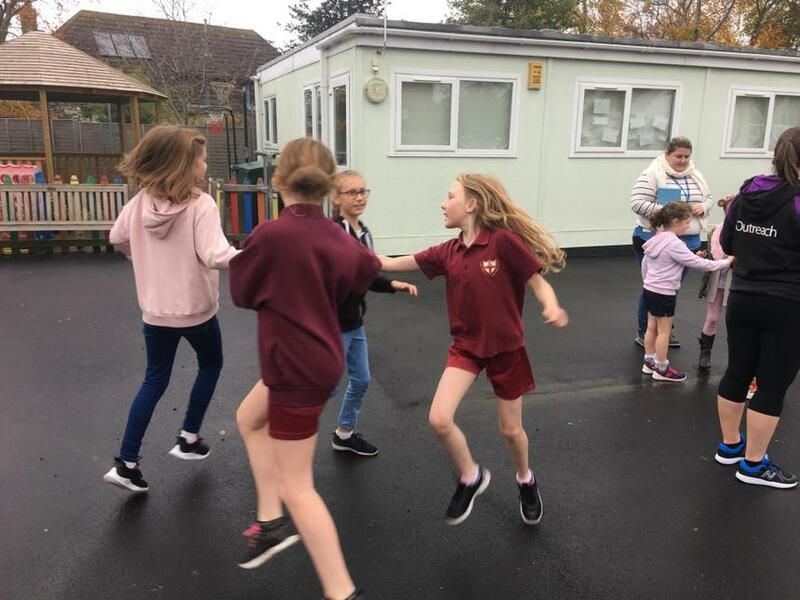 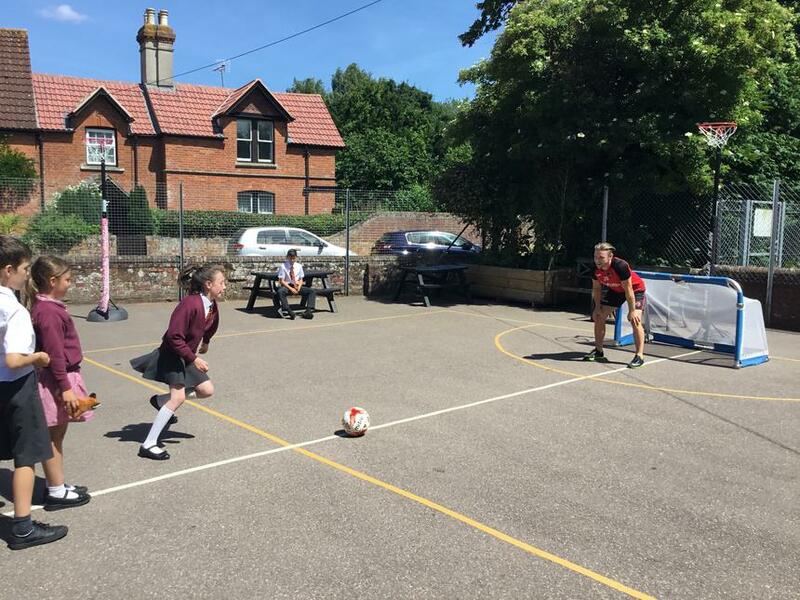 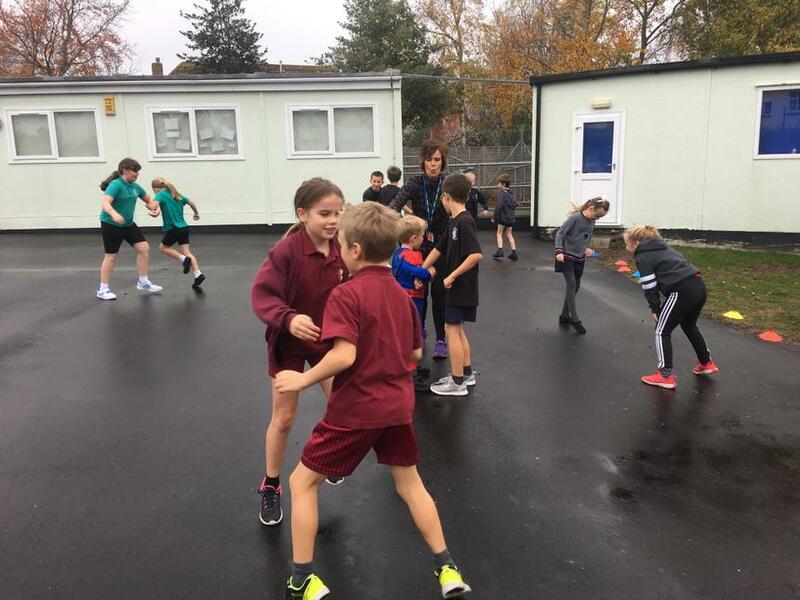 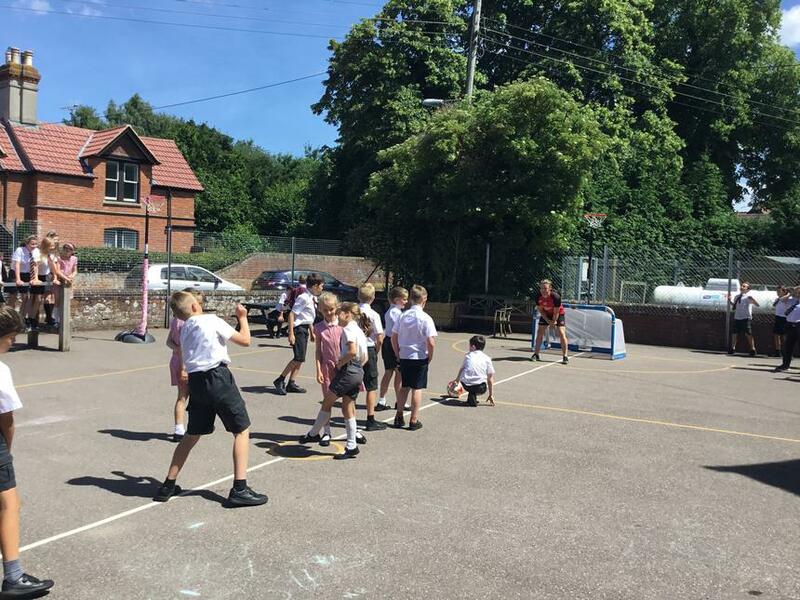 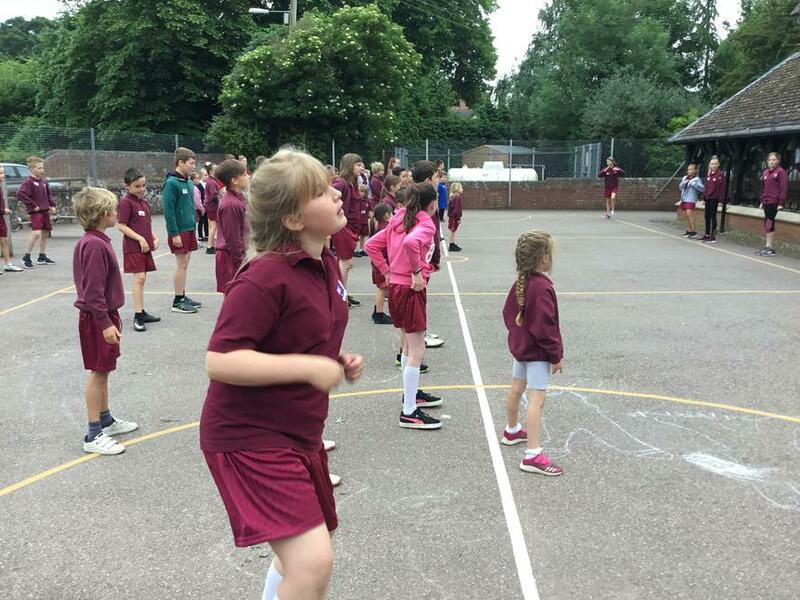 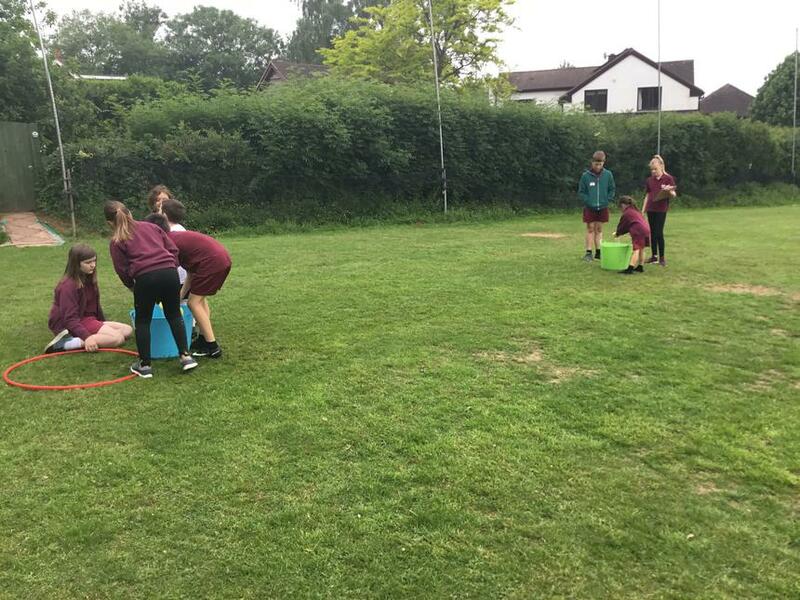 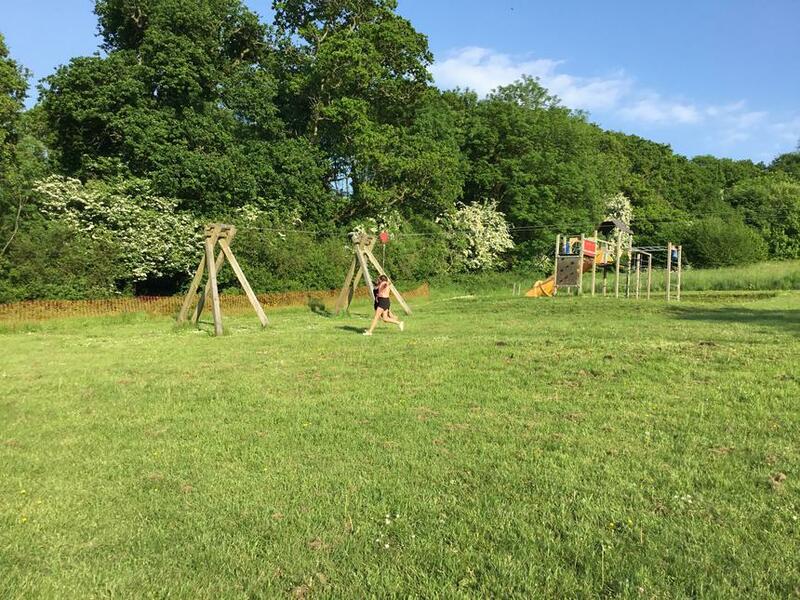 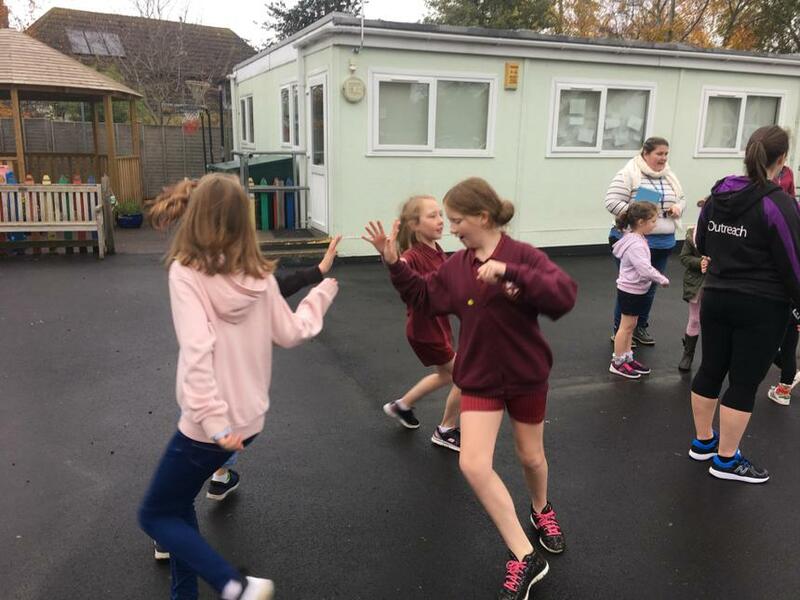 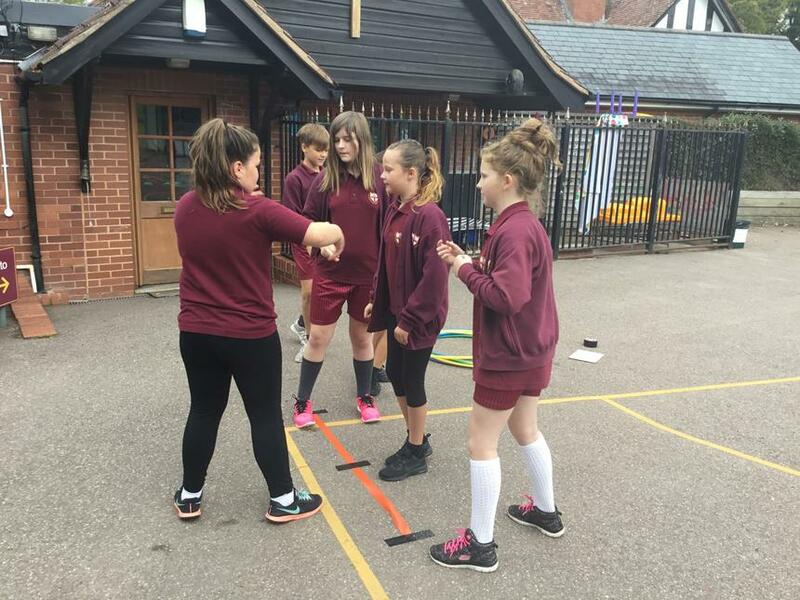 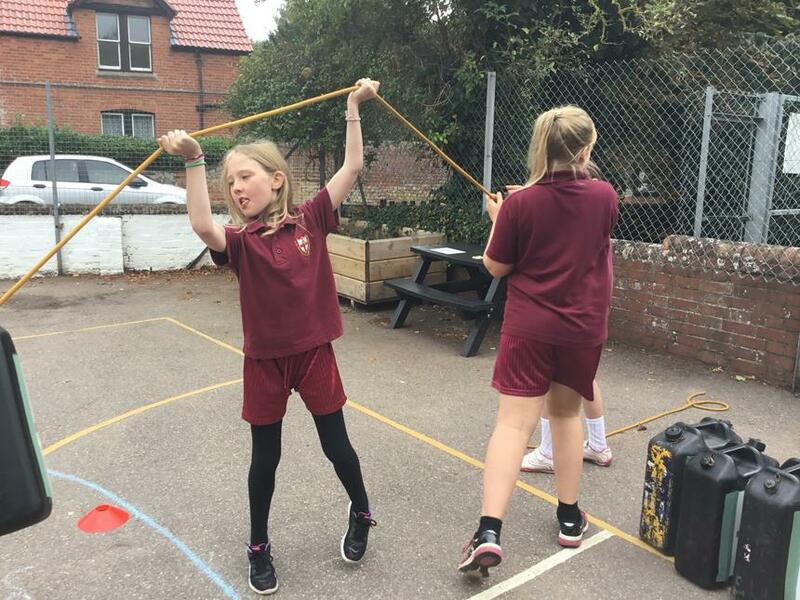 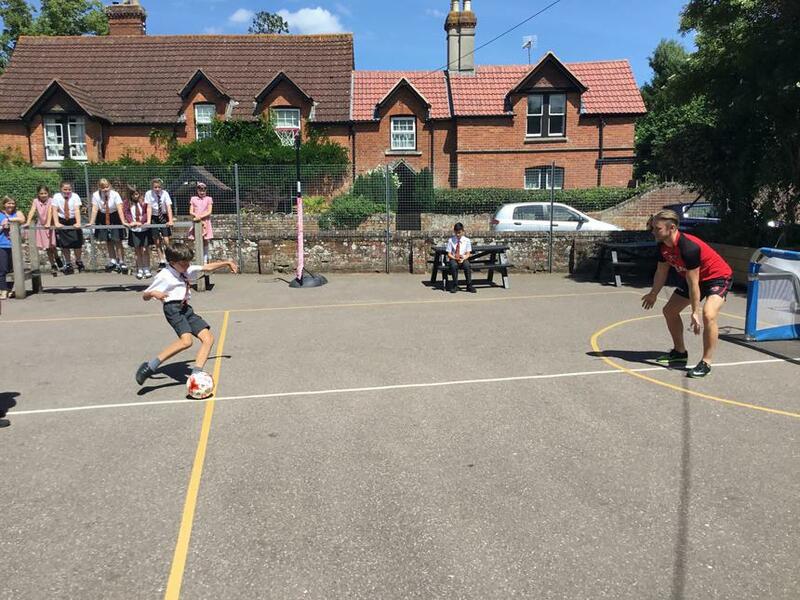 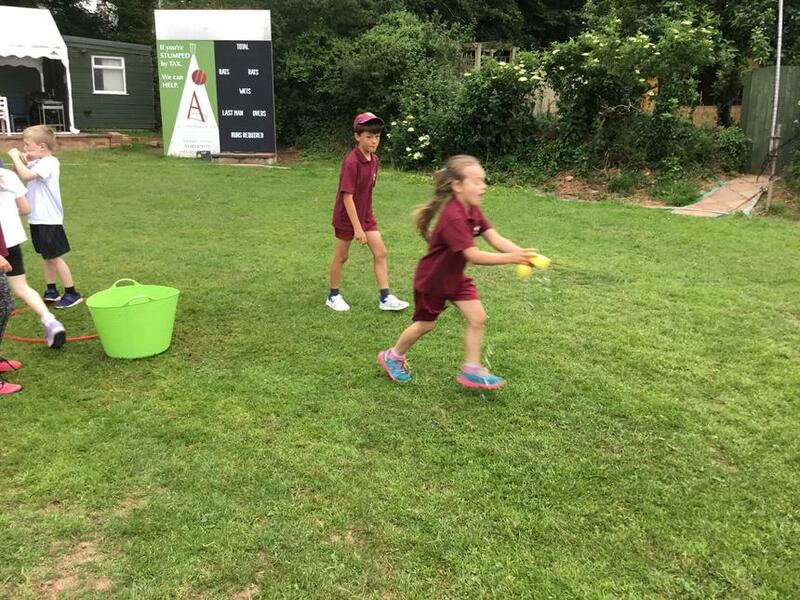 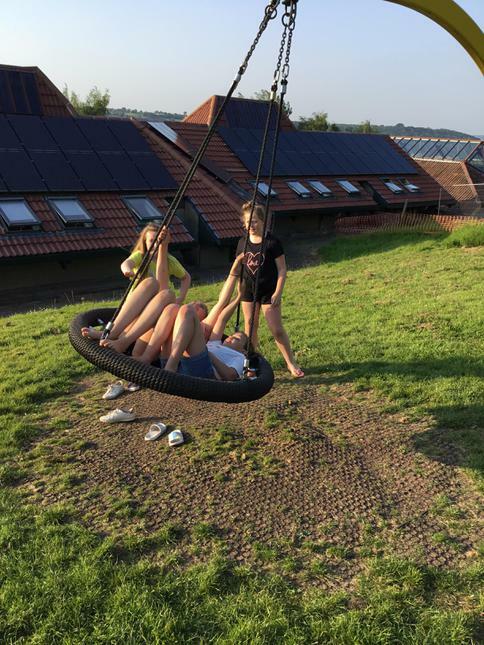 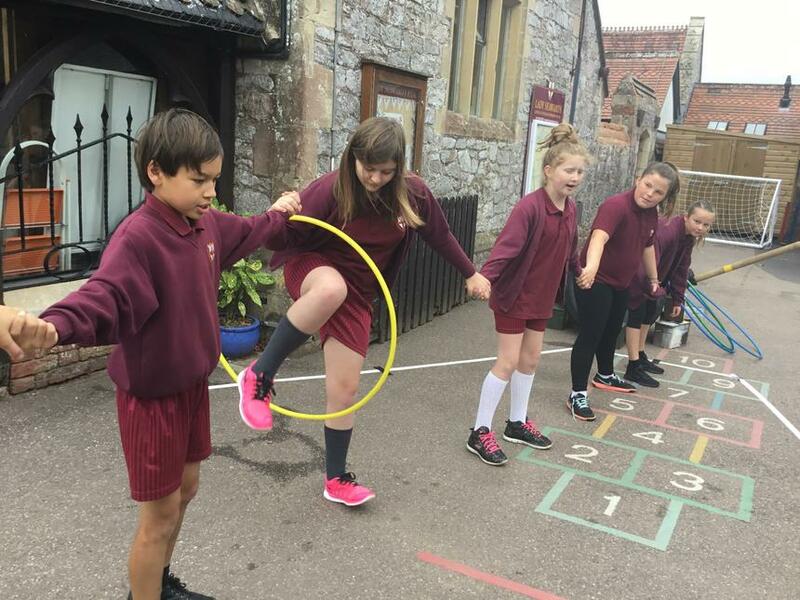 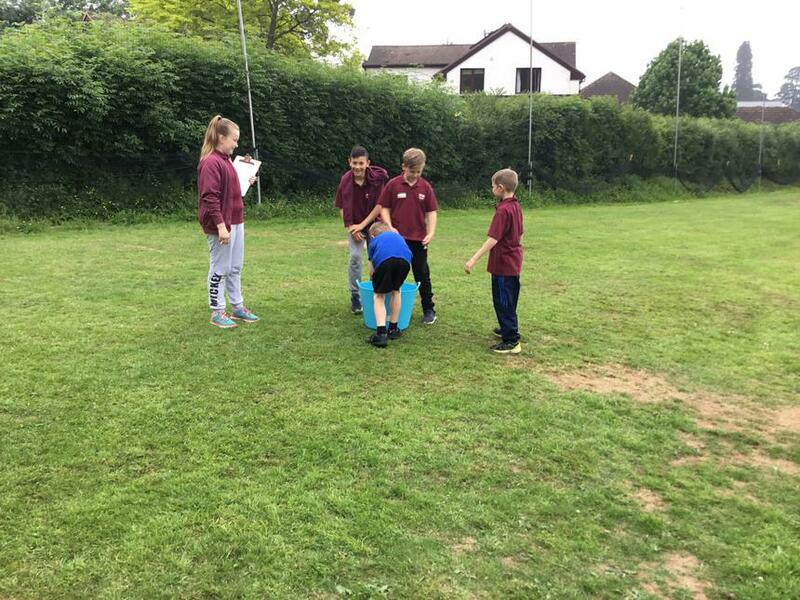 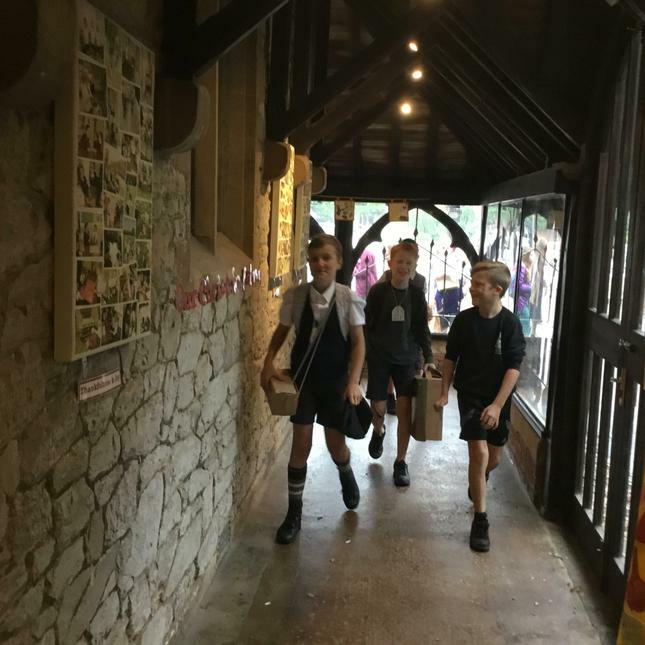 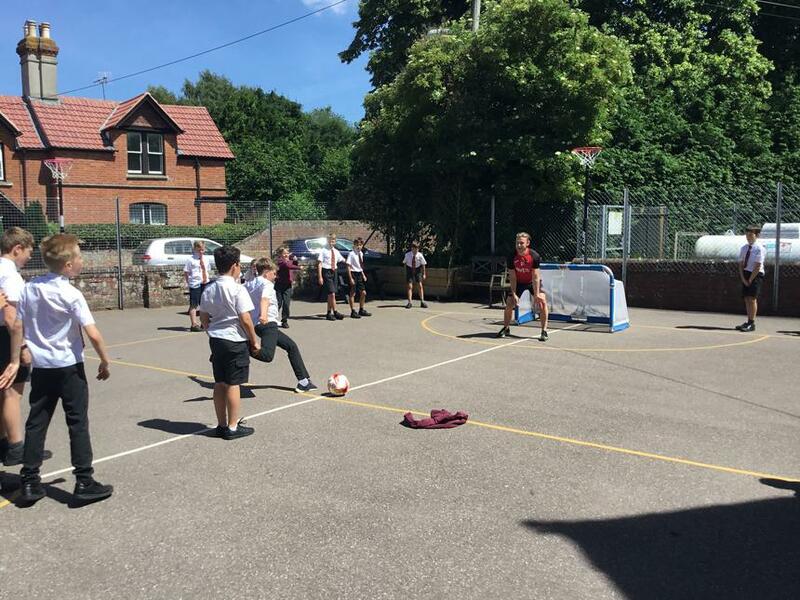 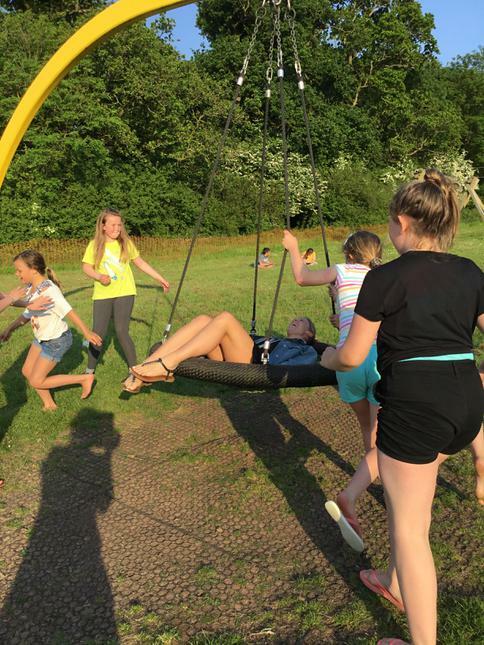 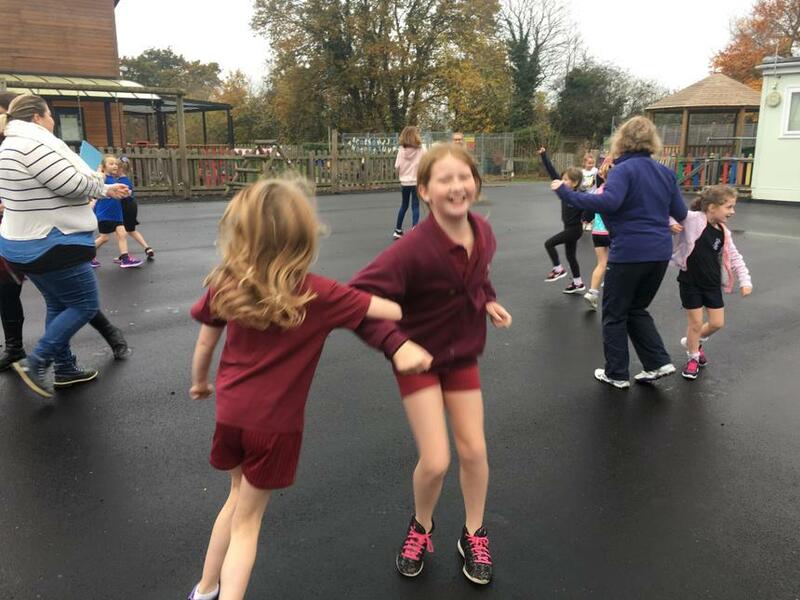 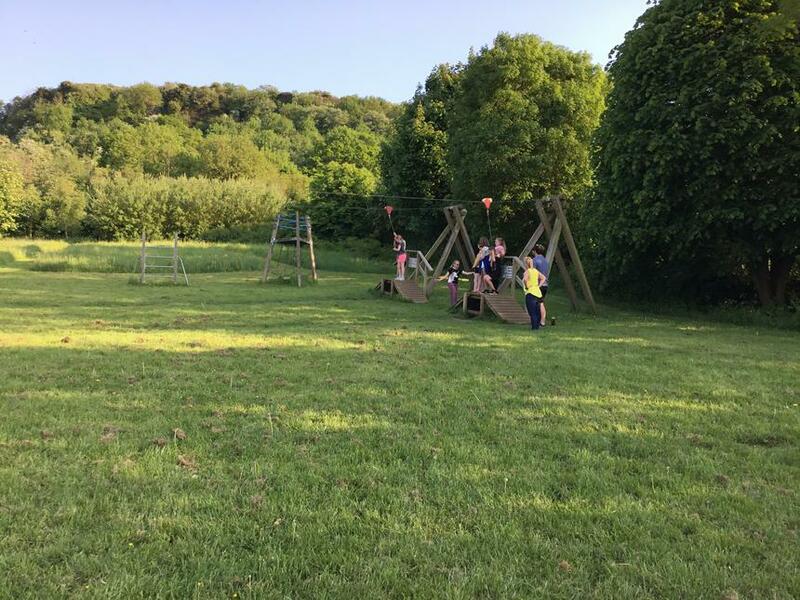 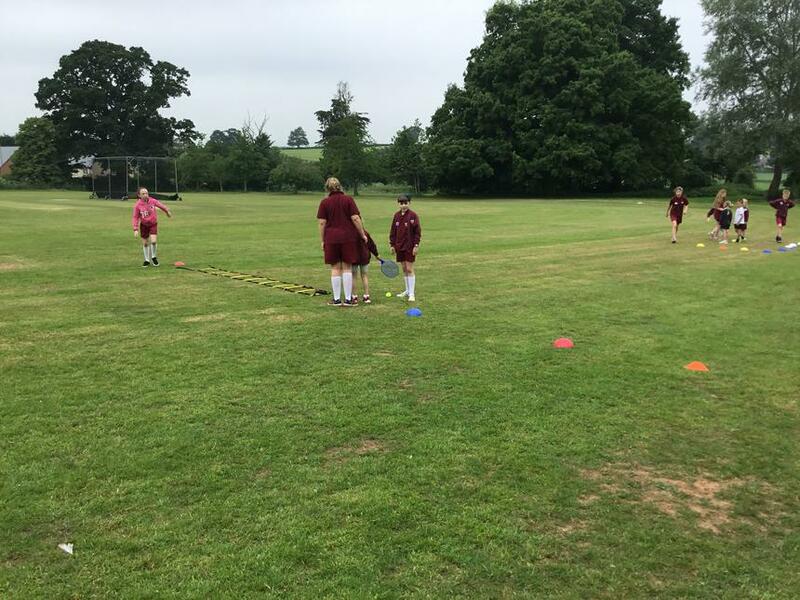 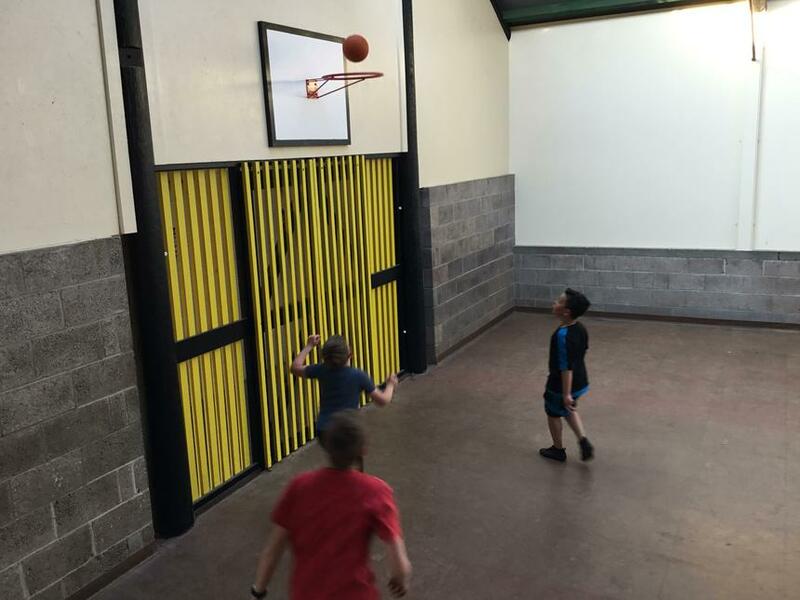 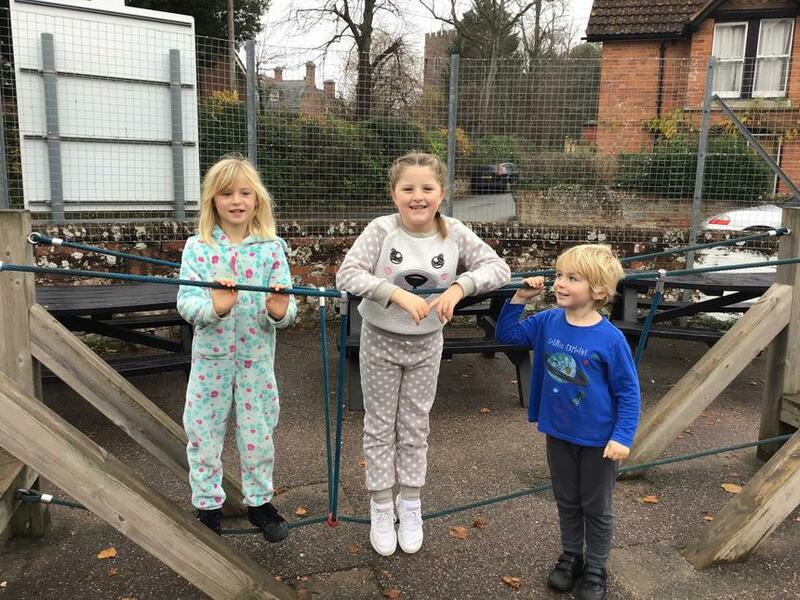 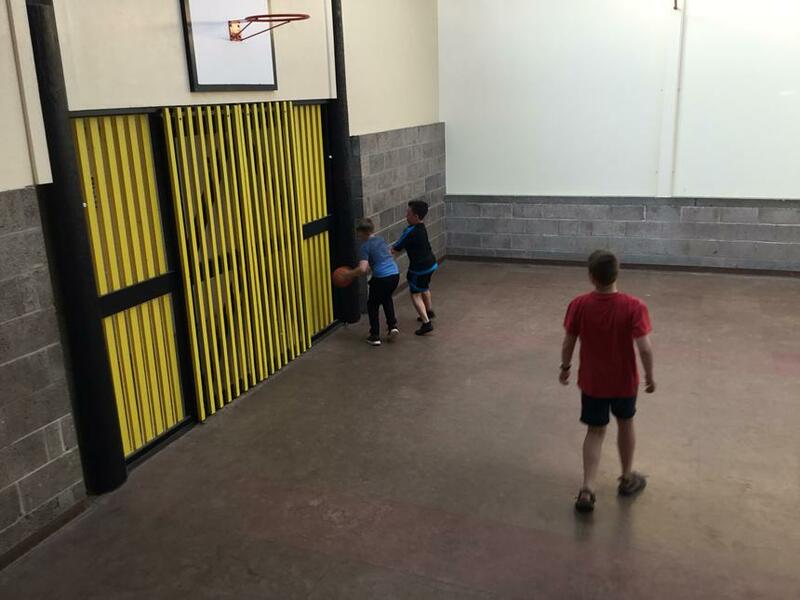 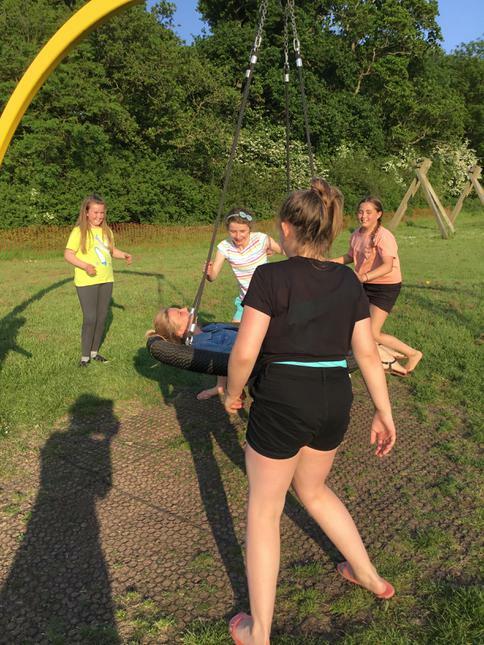 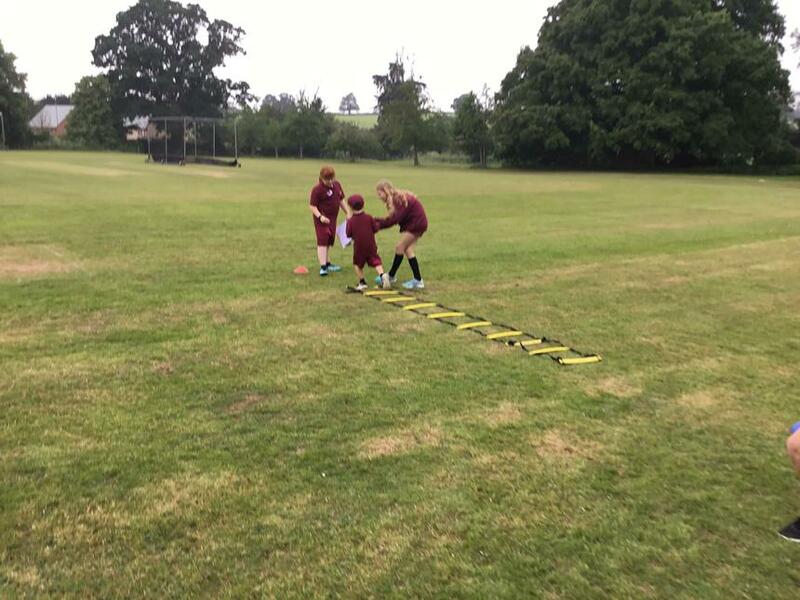 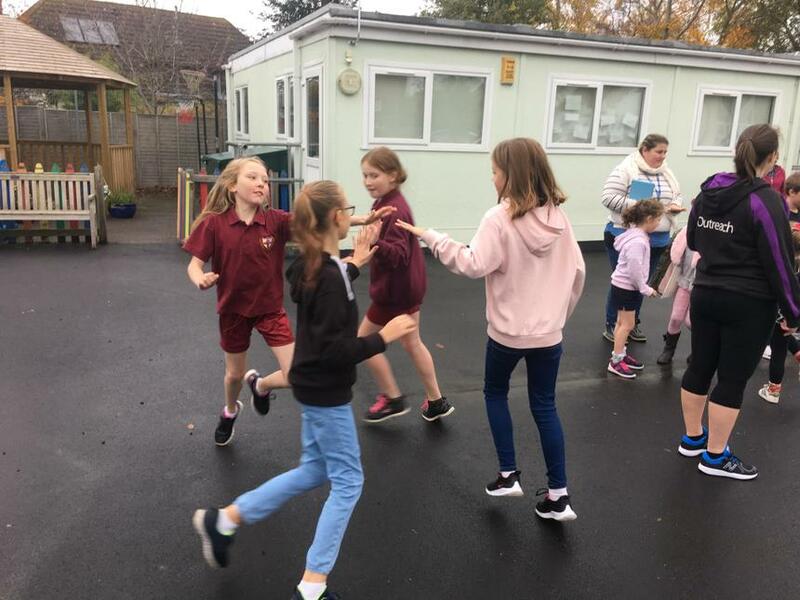 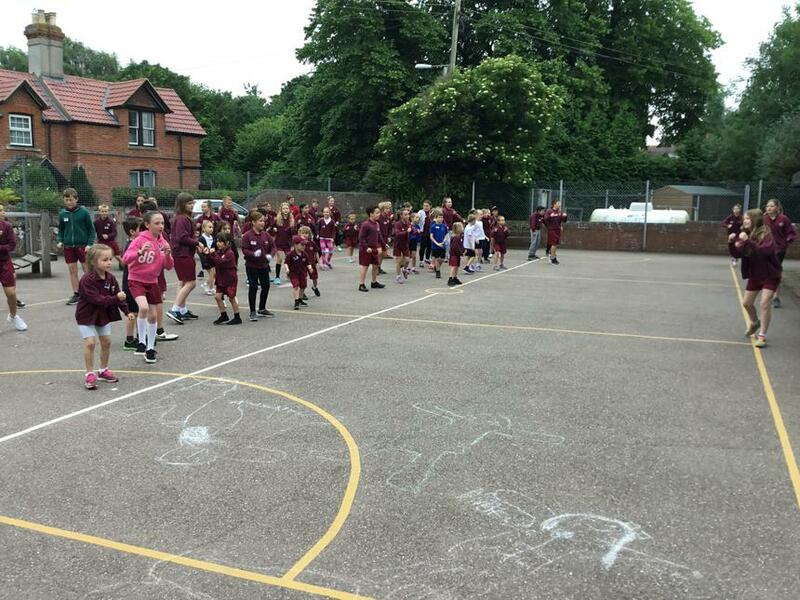 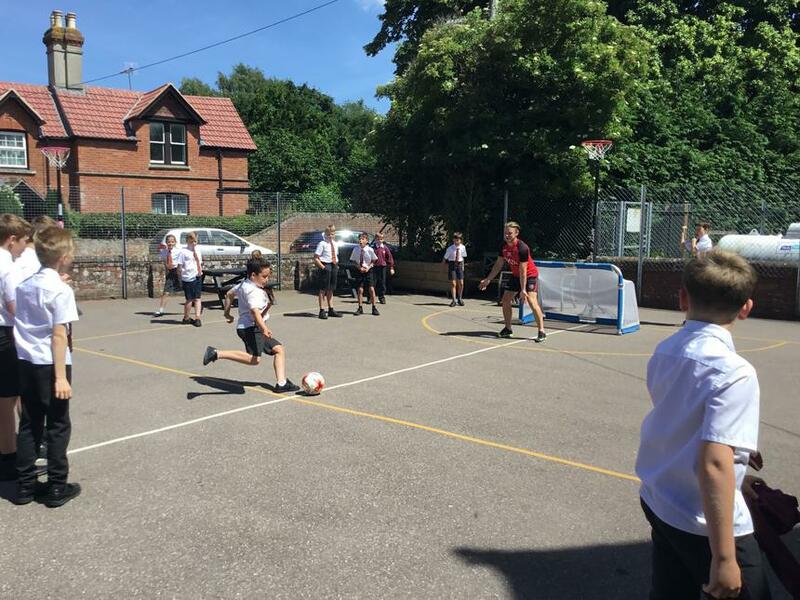 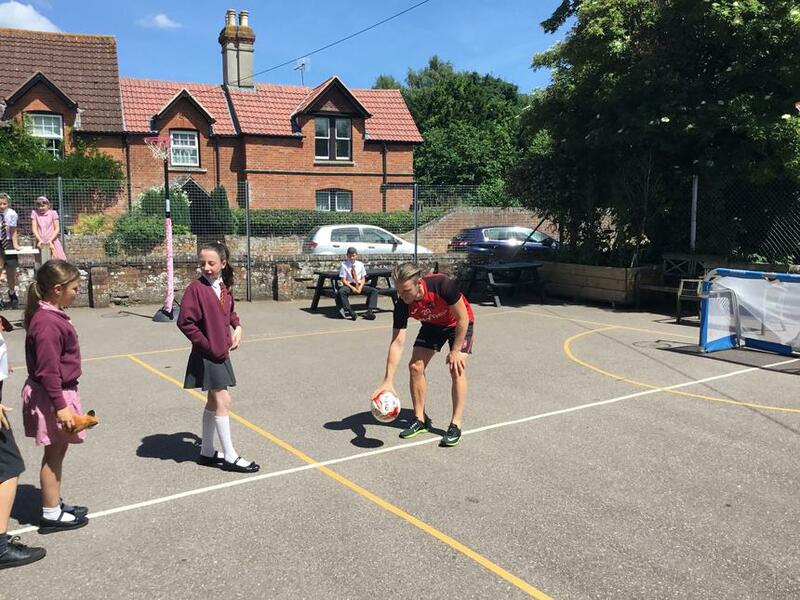 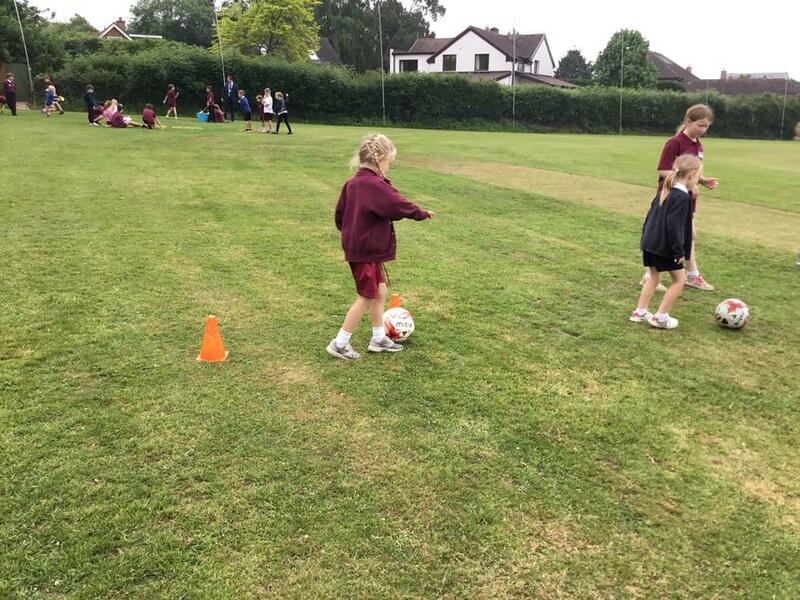 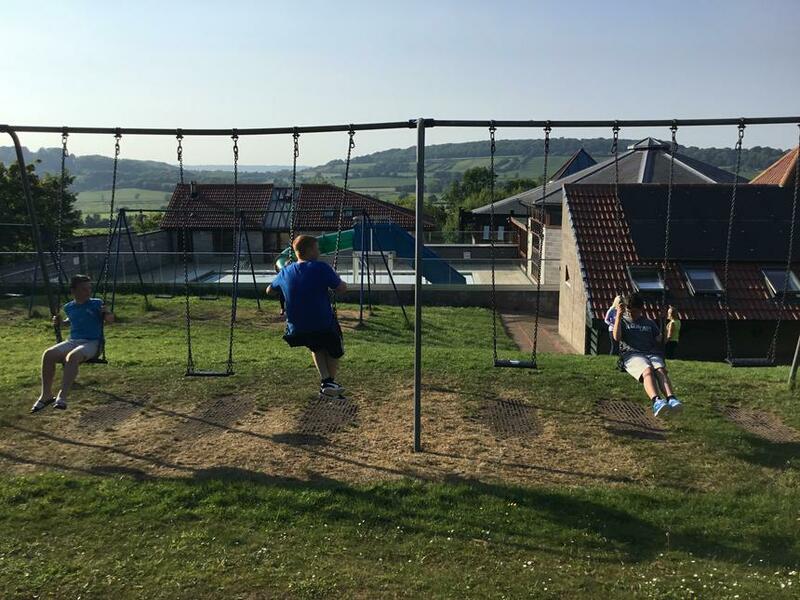 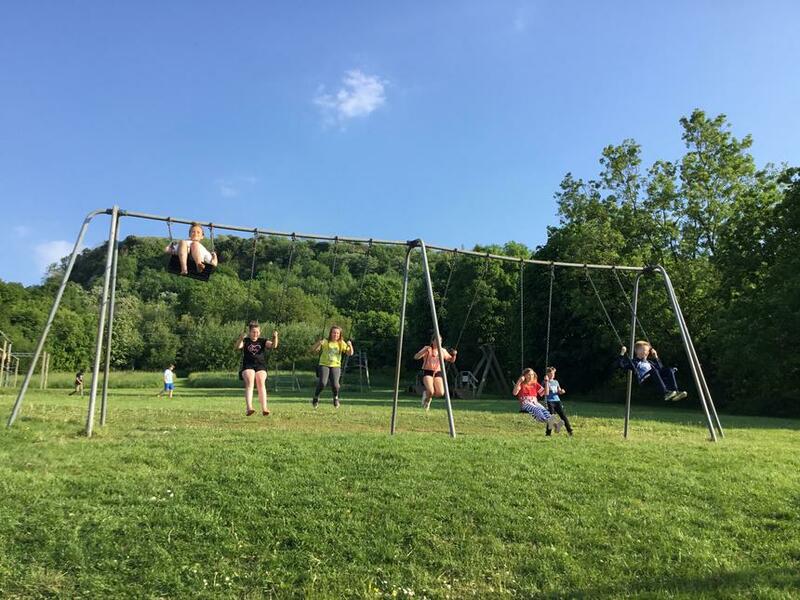 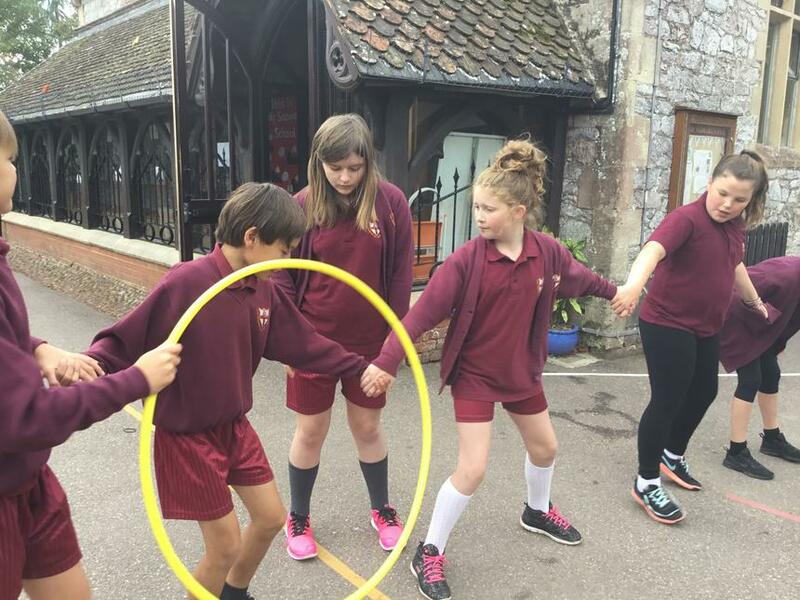 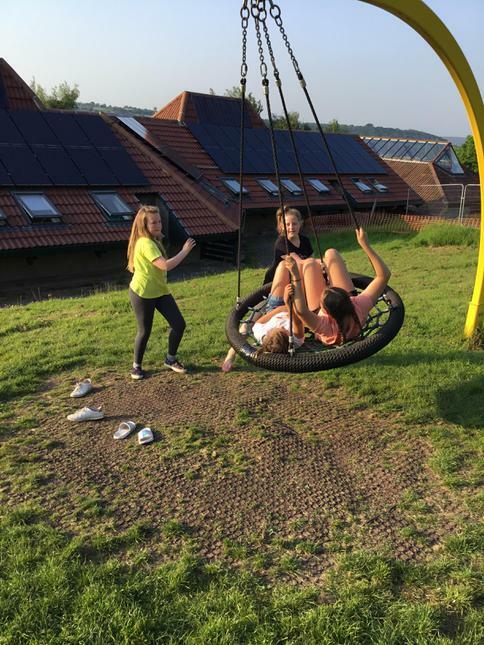 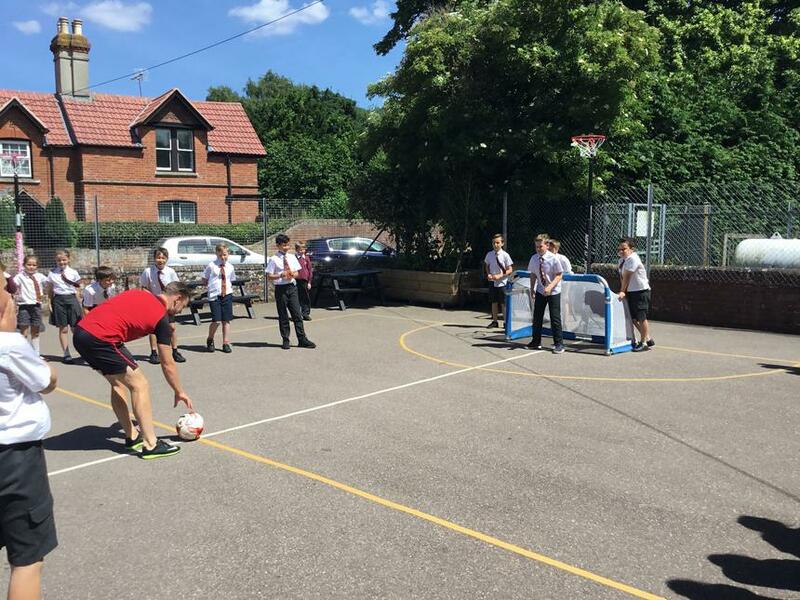 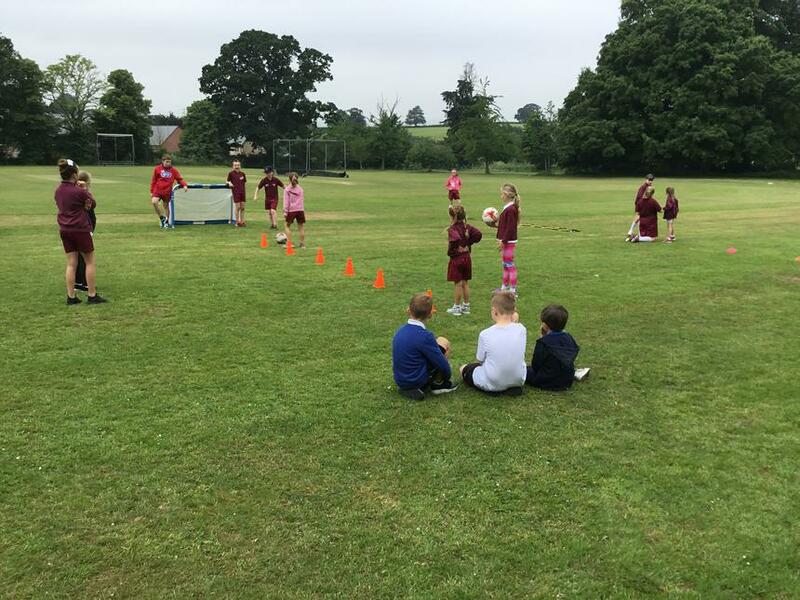 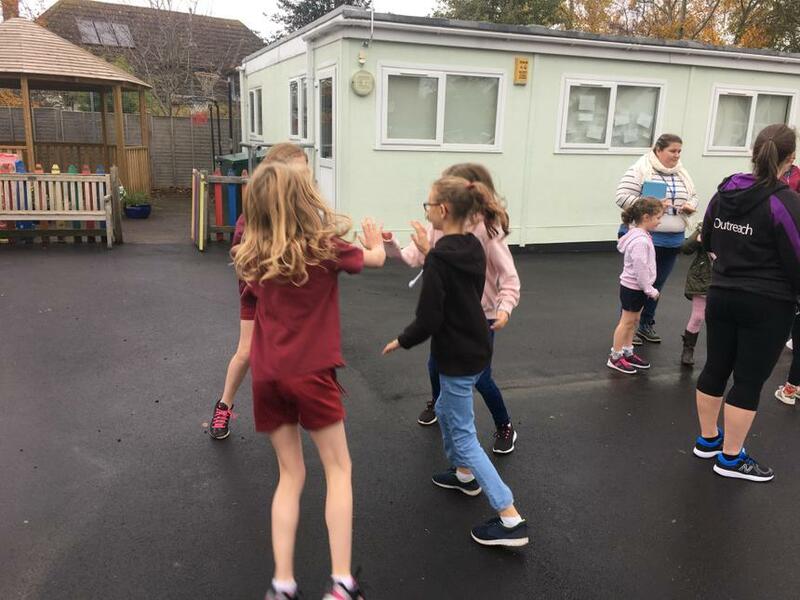 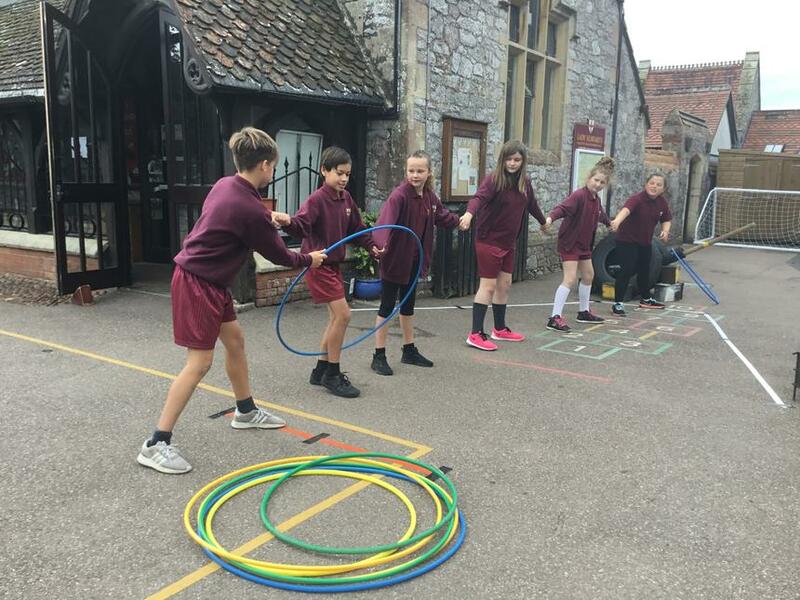 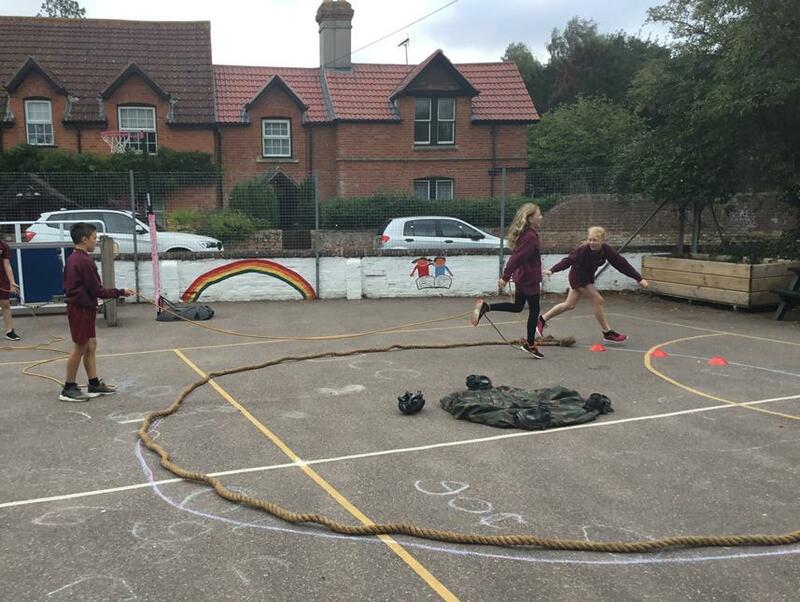 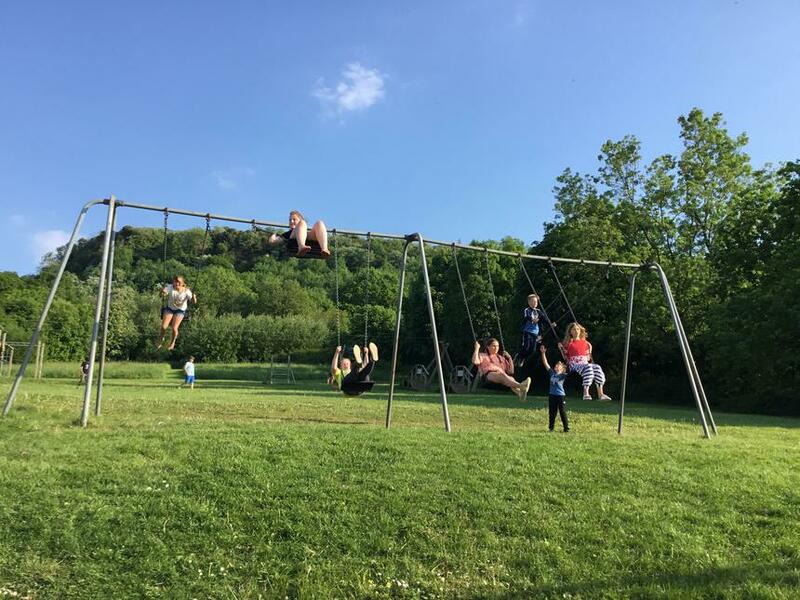 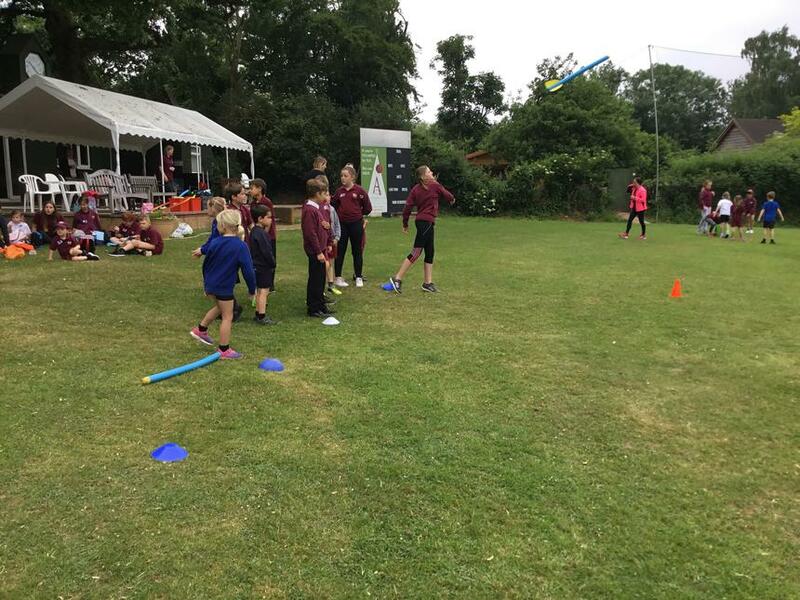 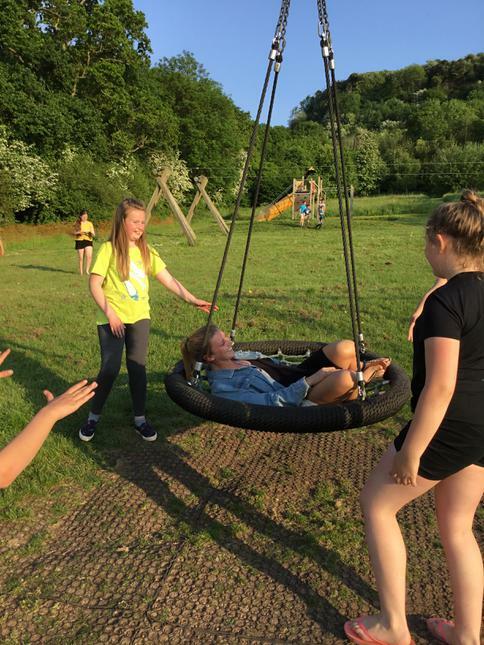 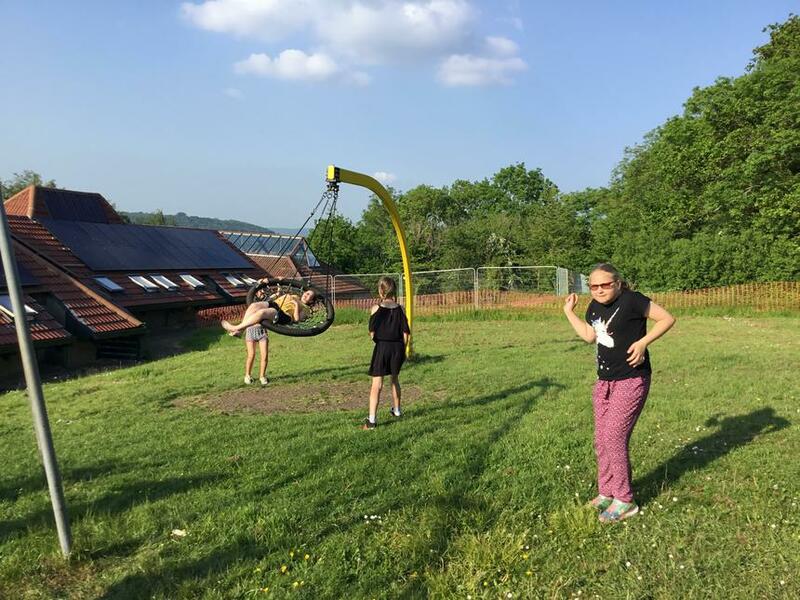 After dinner, the children made the most of the lovely weather with lots of free time outside on the swings and zip wires, playing basketball, football and rounders and they even got to go in the outdoor swimming pool! 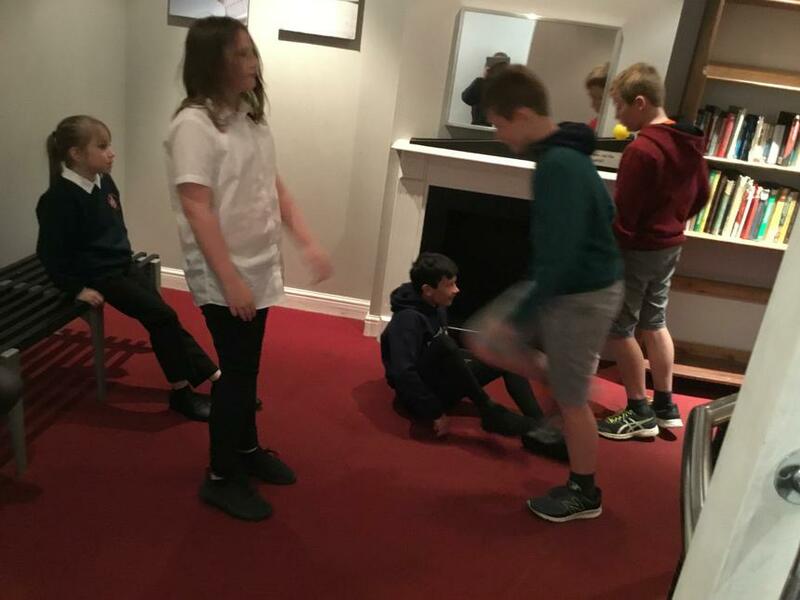 The evening was rounded off with hot chocolate and biscuits and the children spending some time in their rooms before bed. 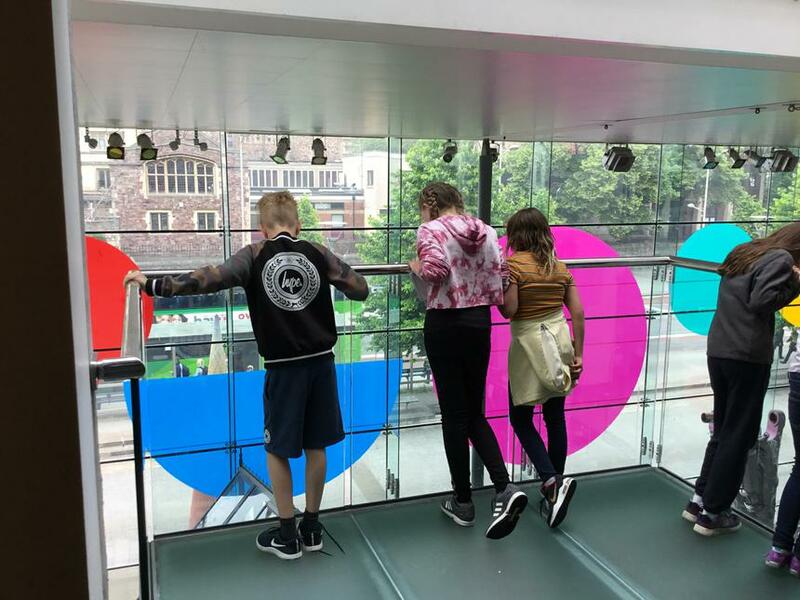 The following day, we travelled into the center of Bristol and spent the day at 'We are the Curious'. 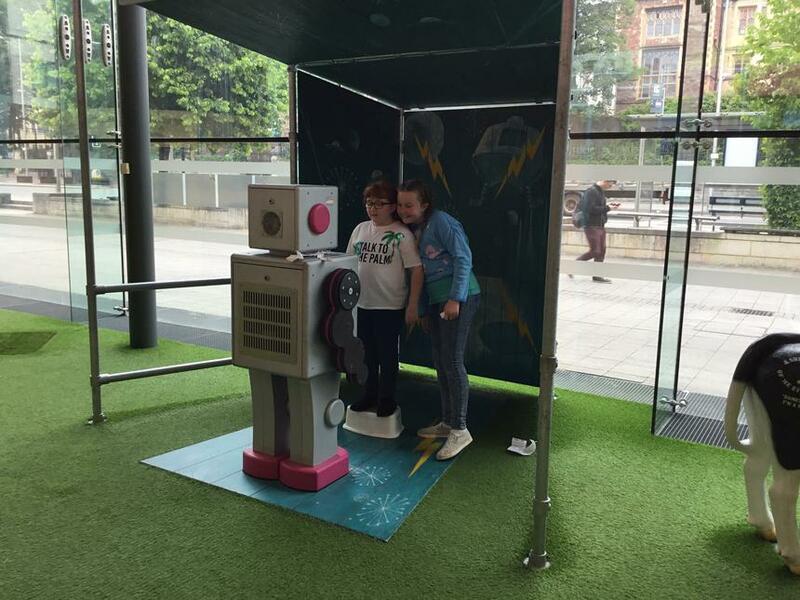 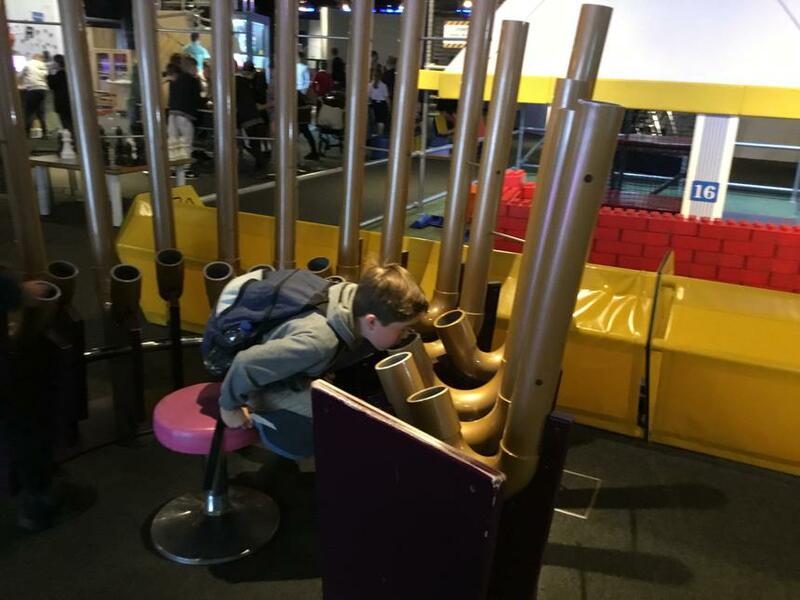 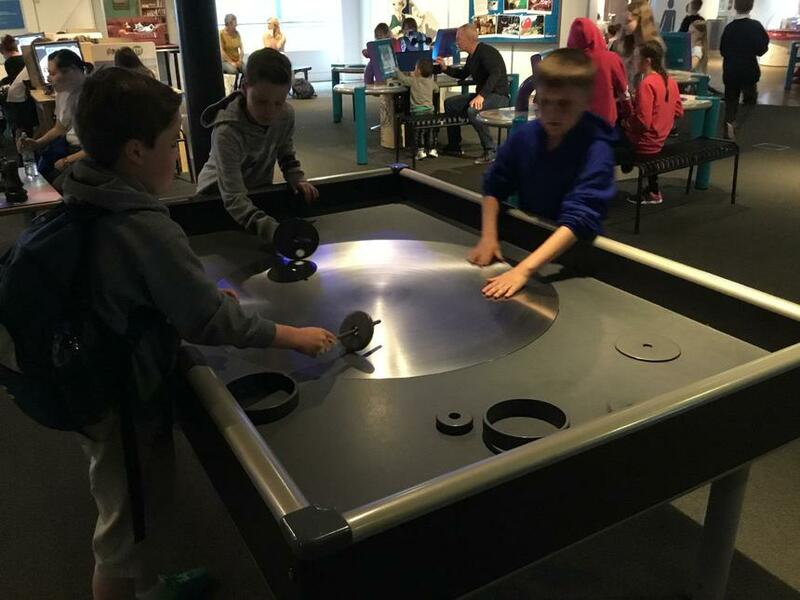 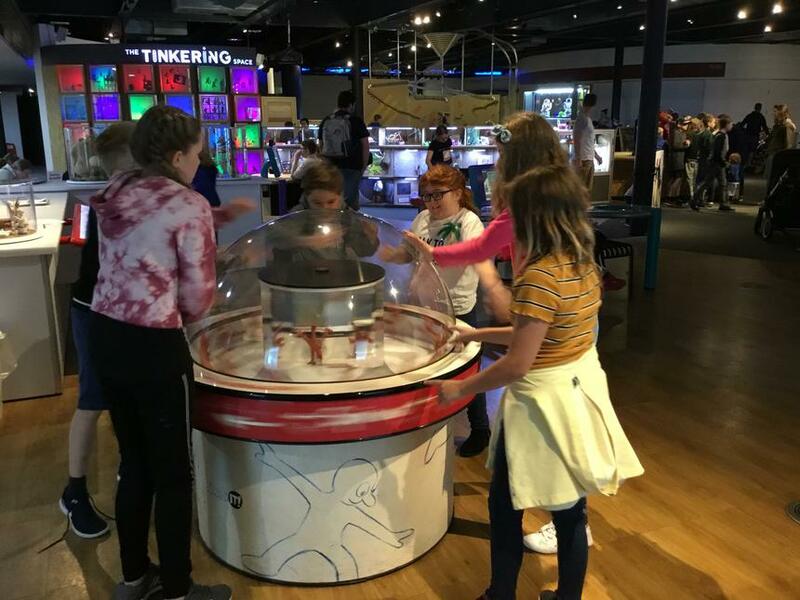 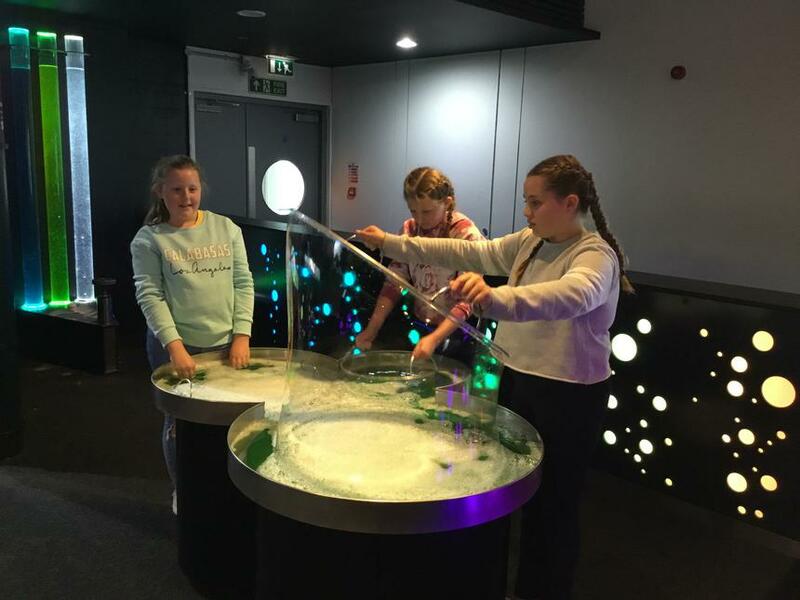 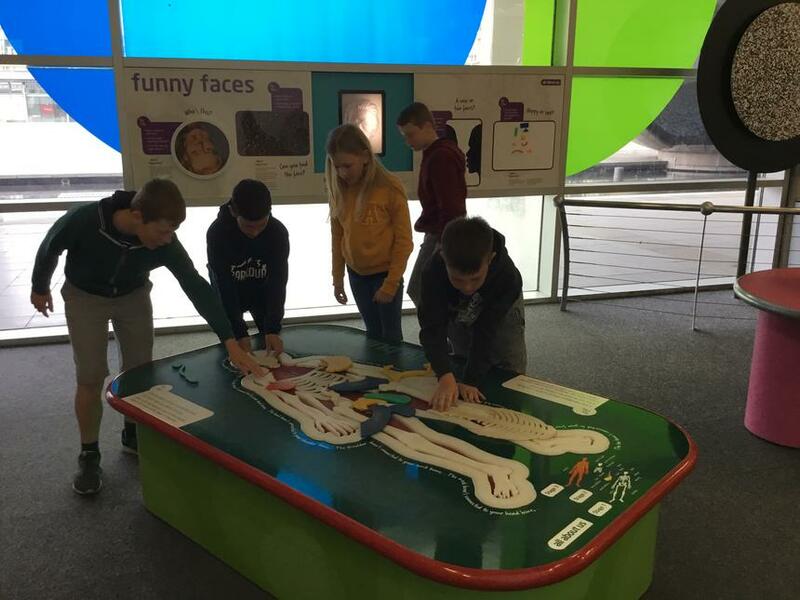 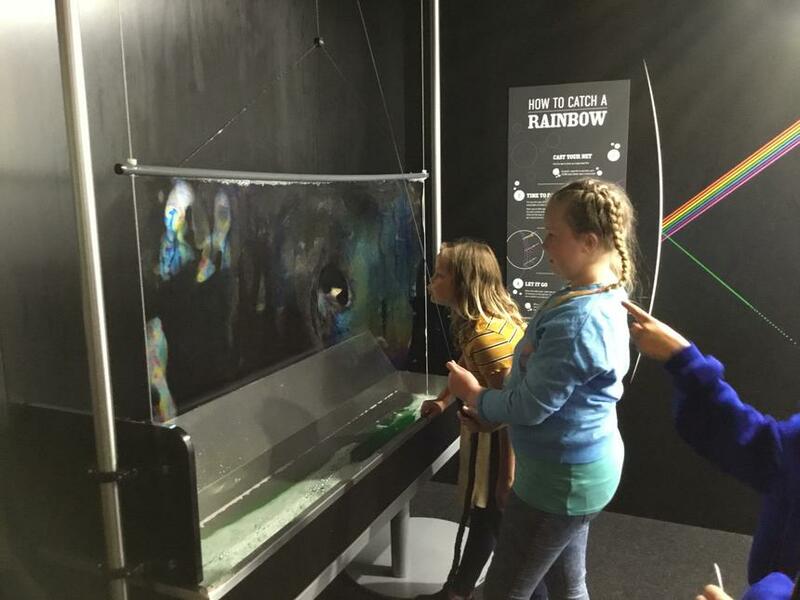 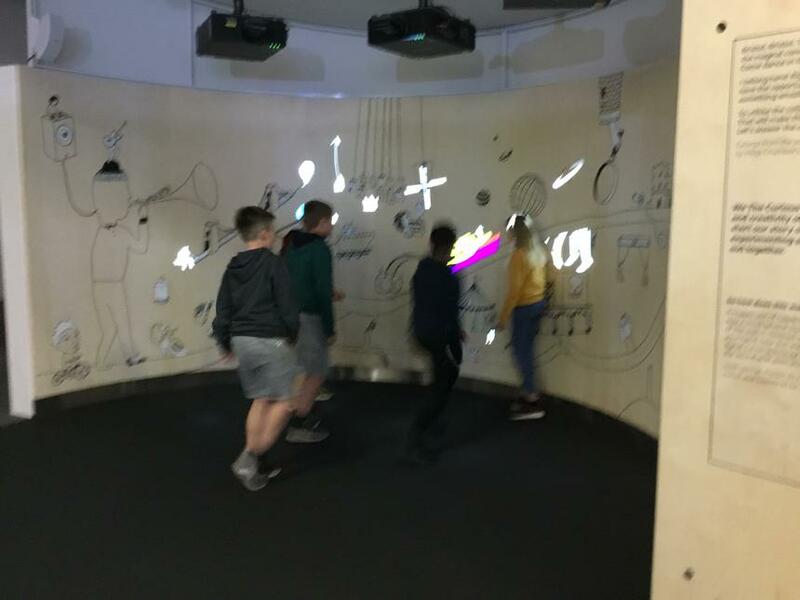 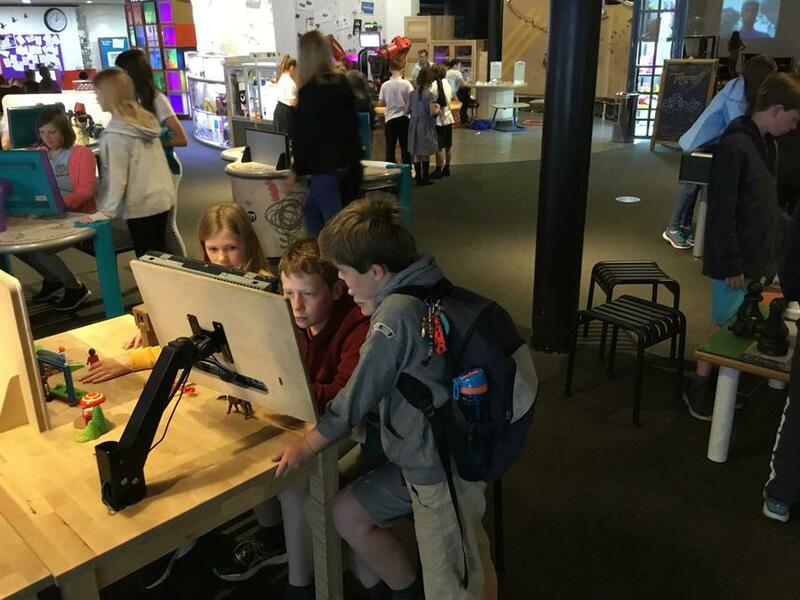 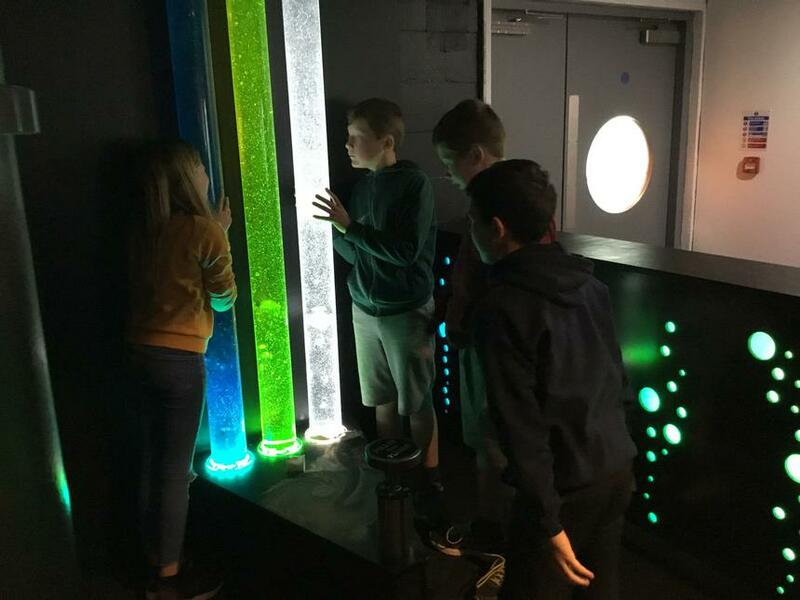 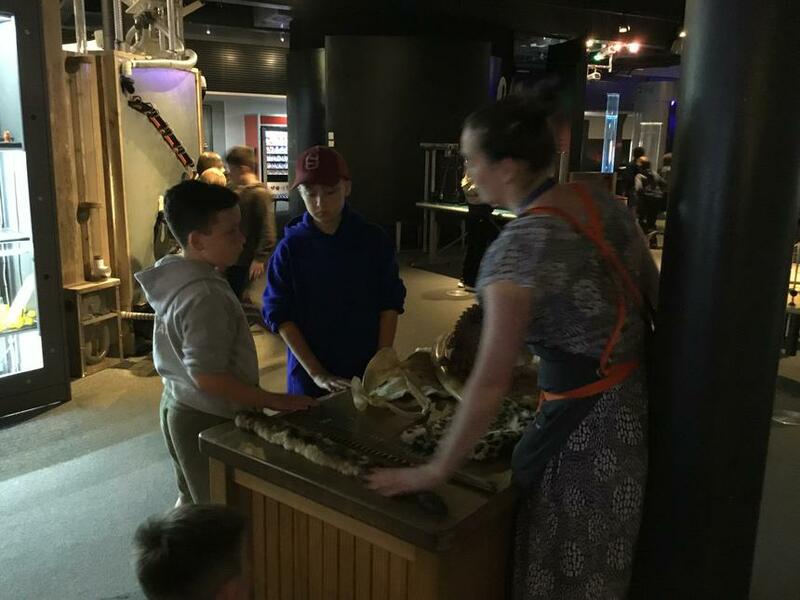 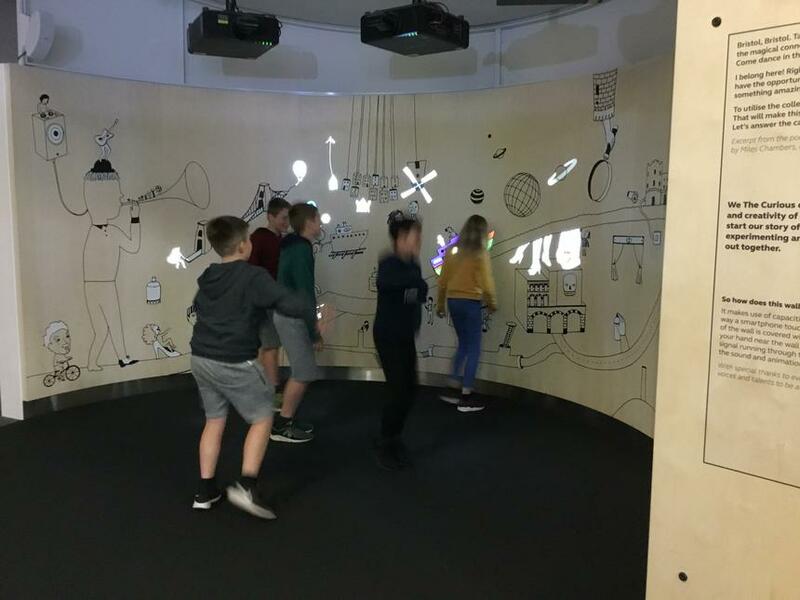 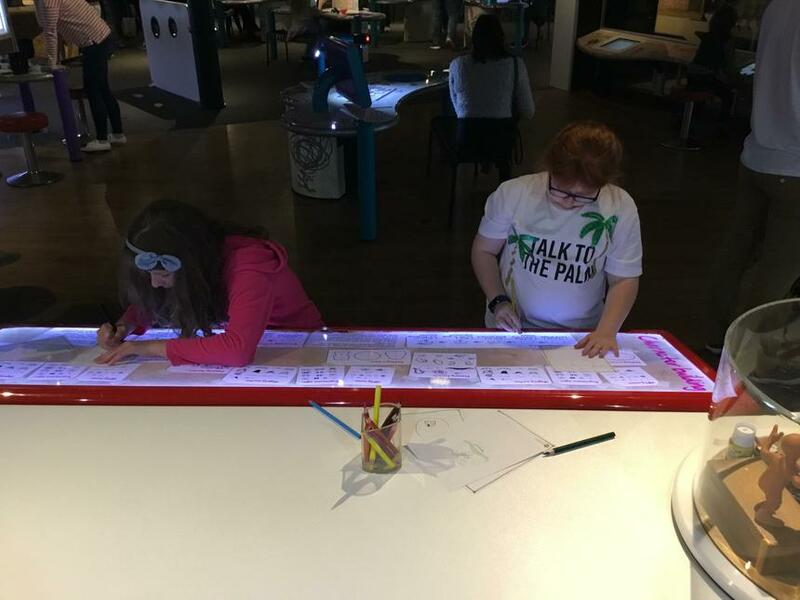 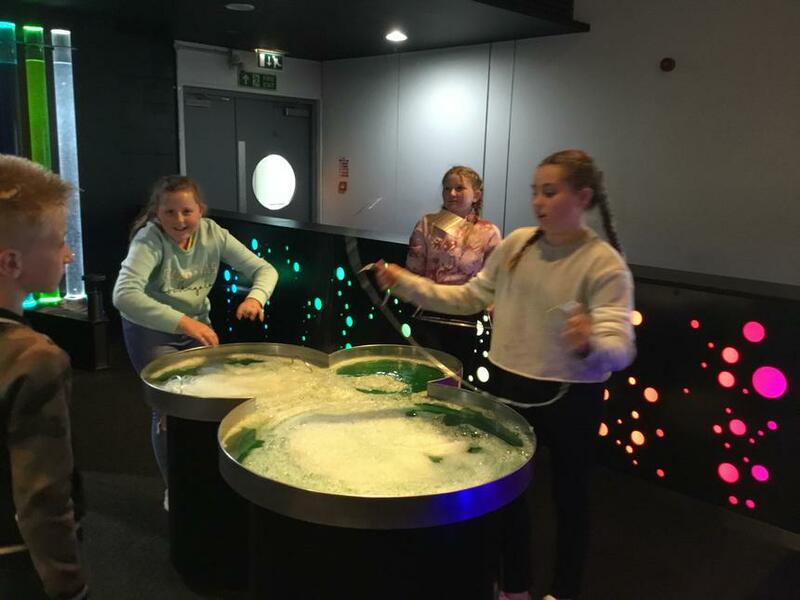 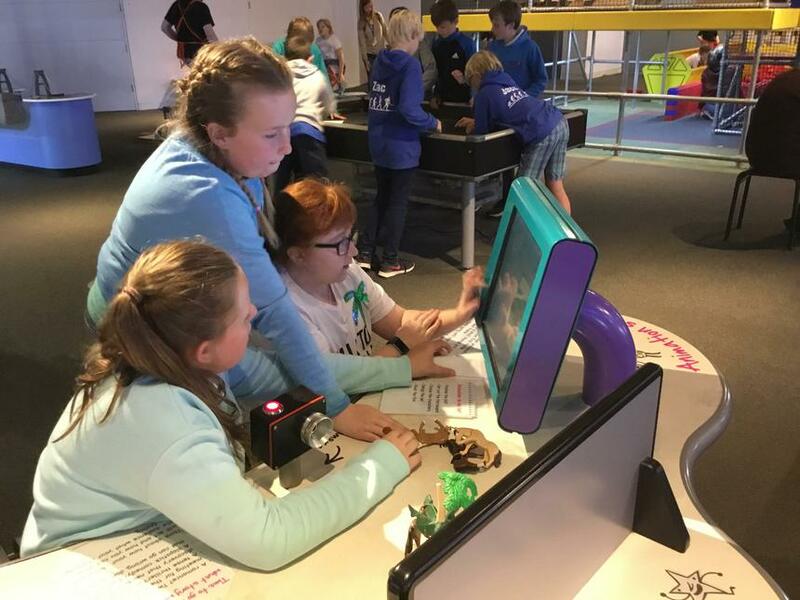 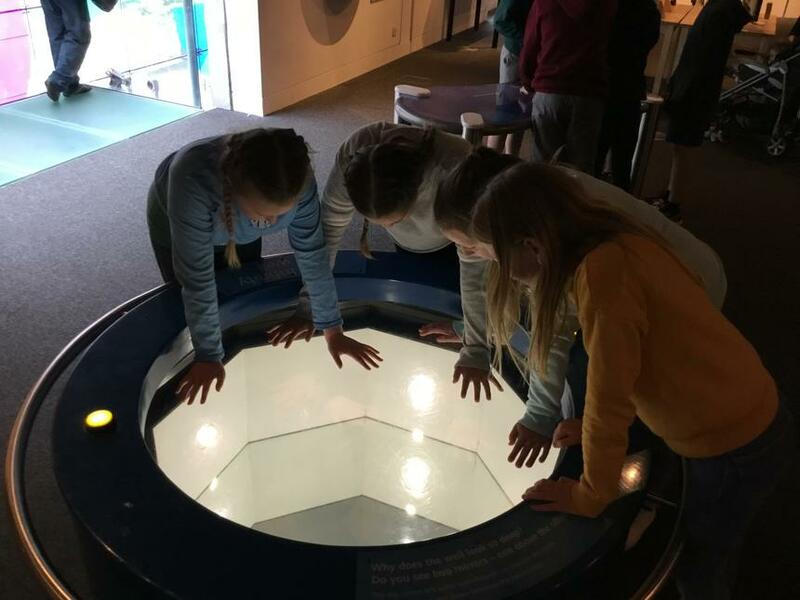 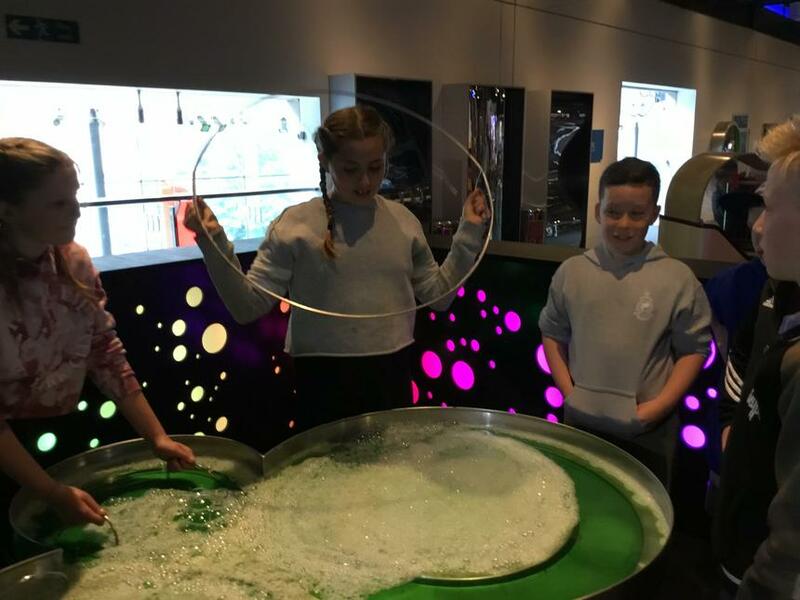 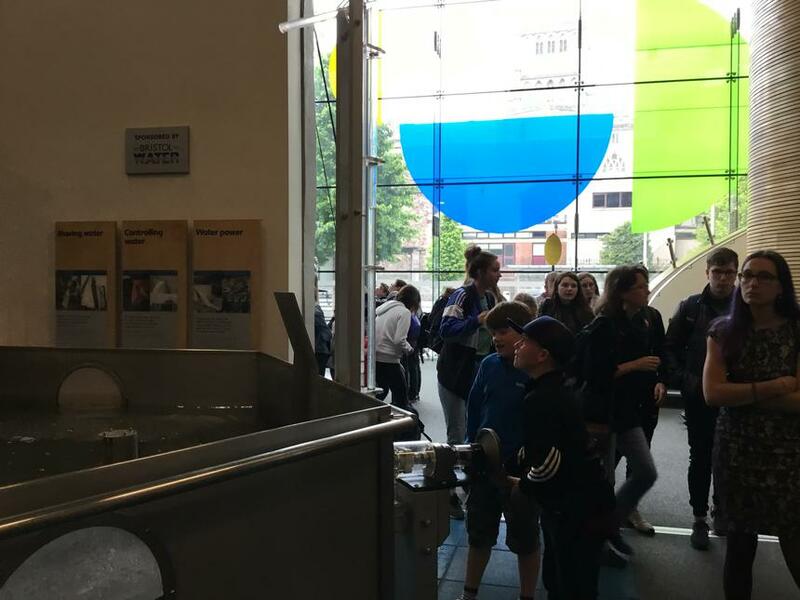 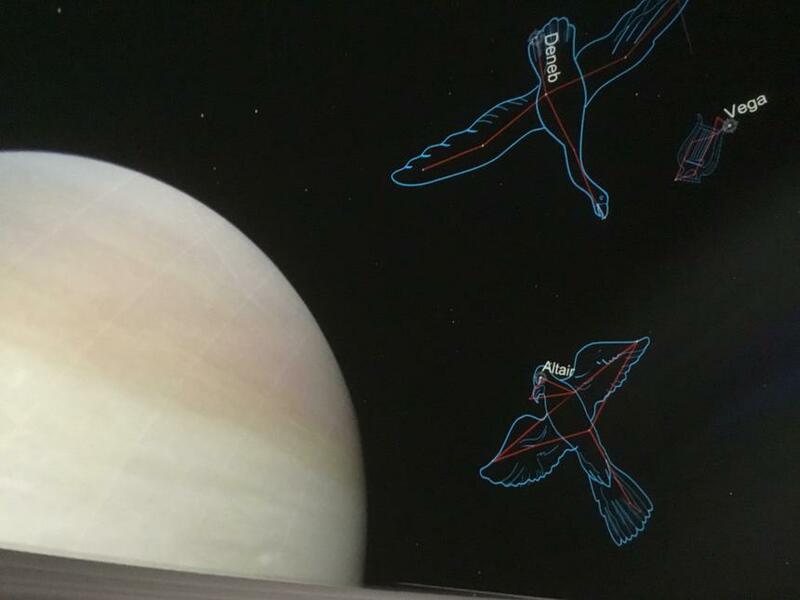 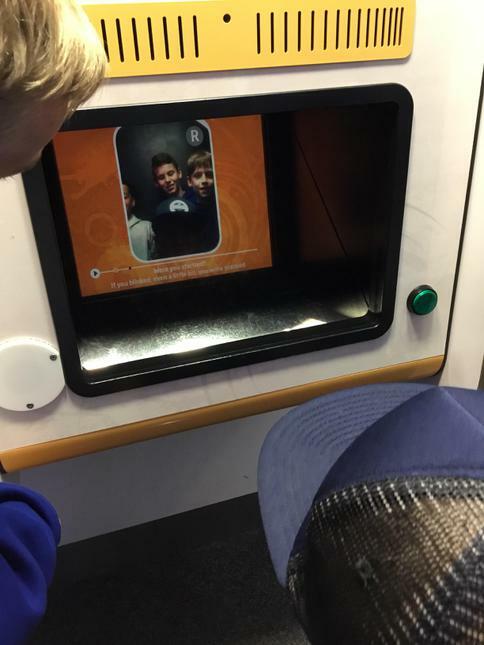 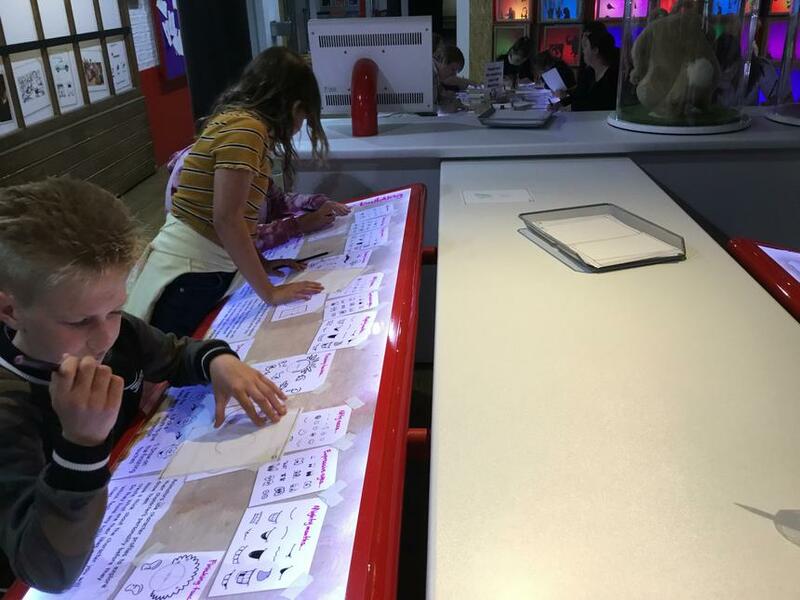 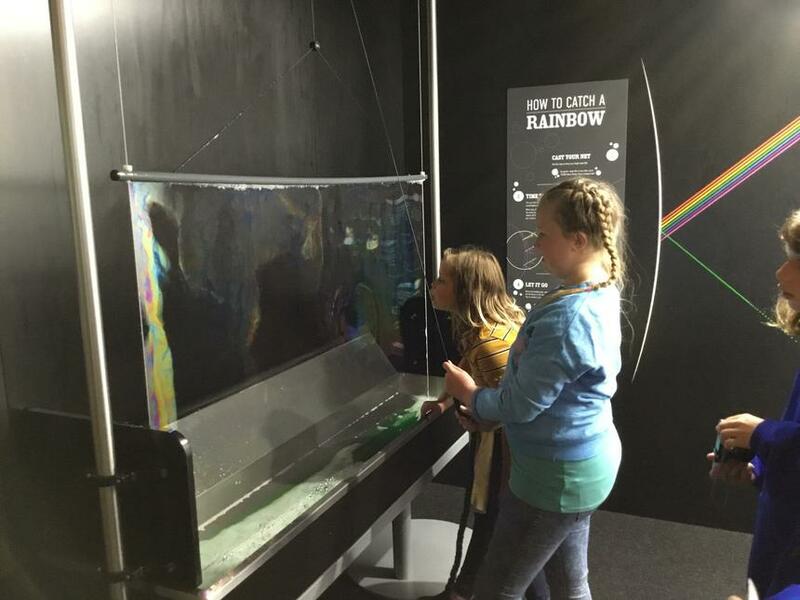 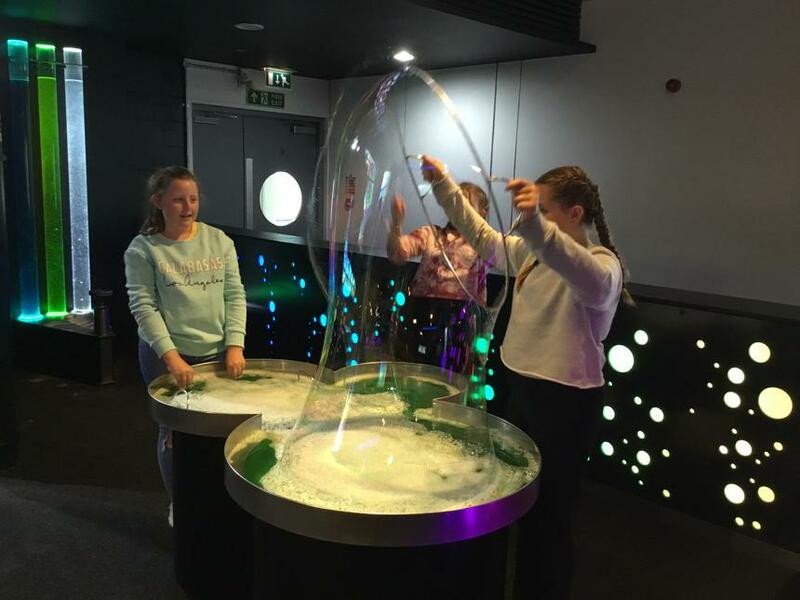 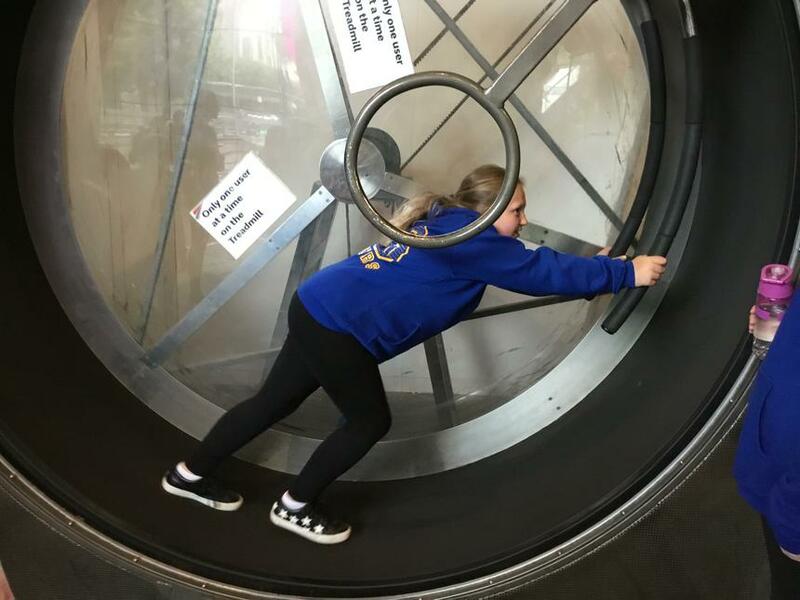 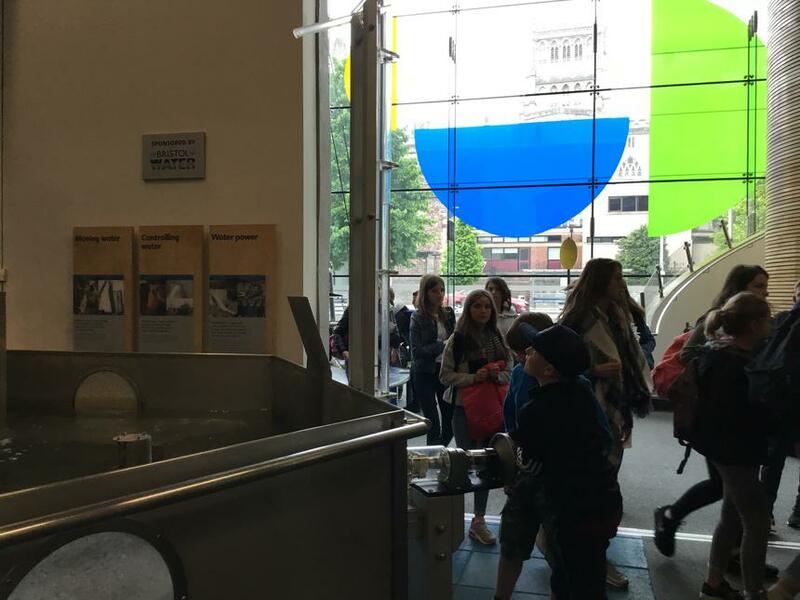 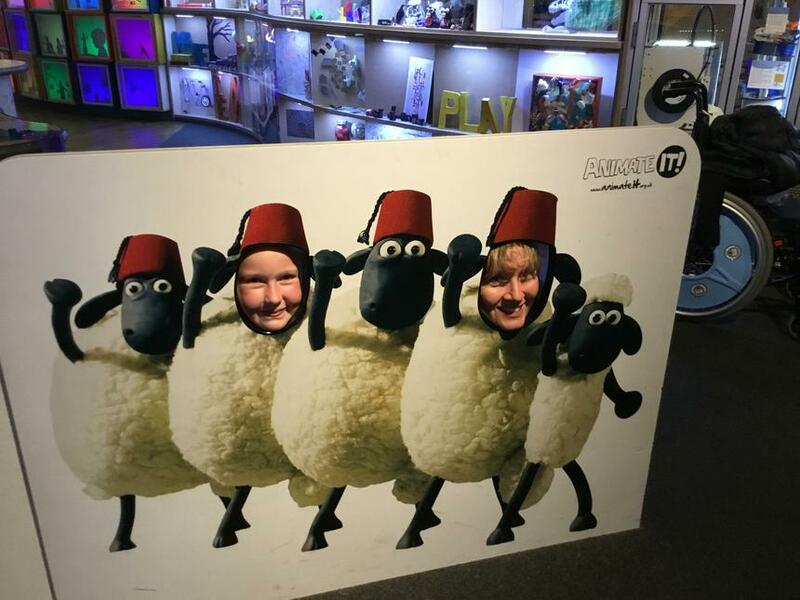 The science and technology museum had hundreds of exhibitions for the children to look at and explore in small groups. 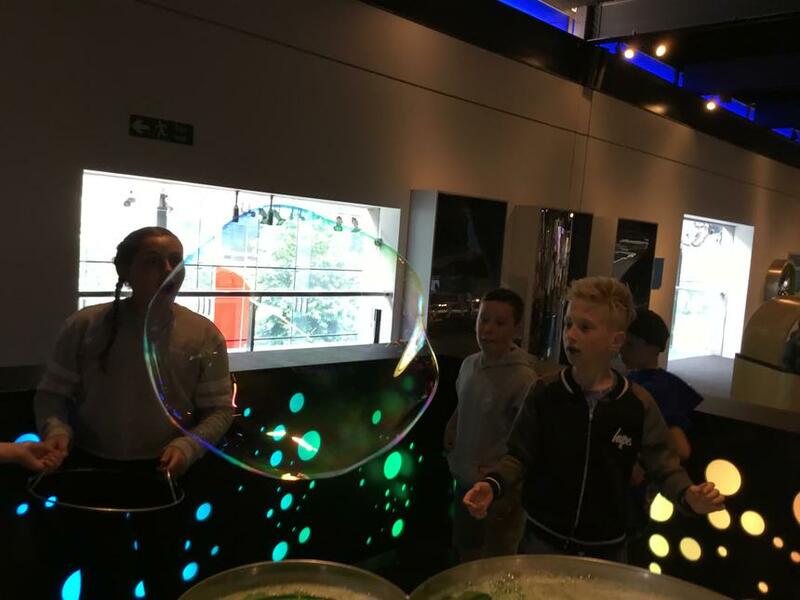 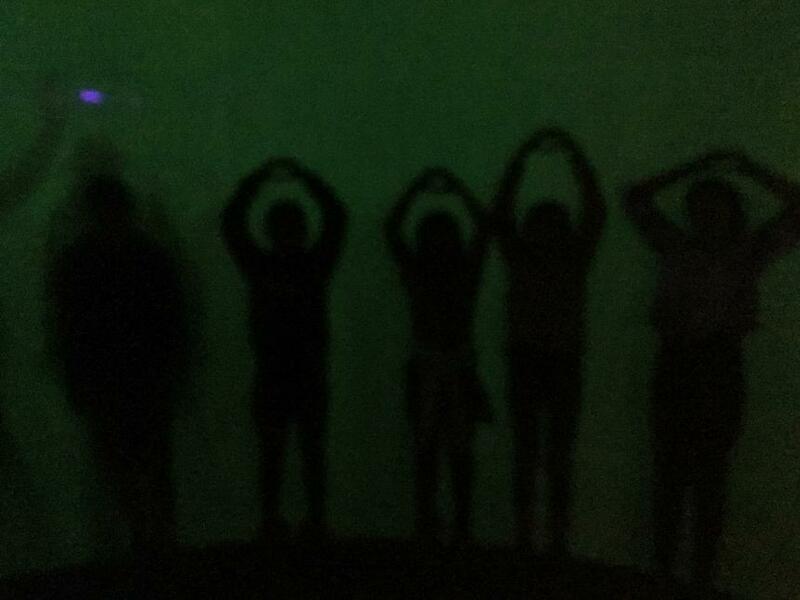 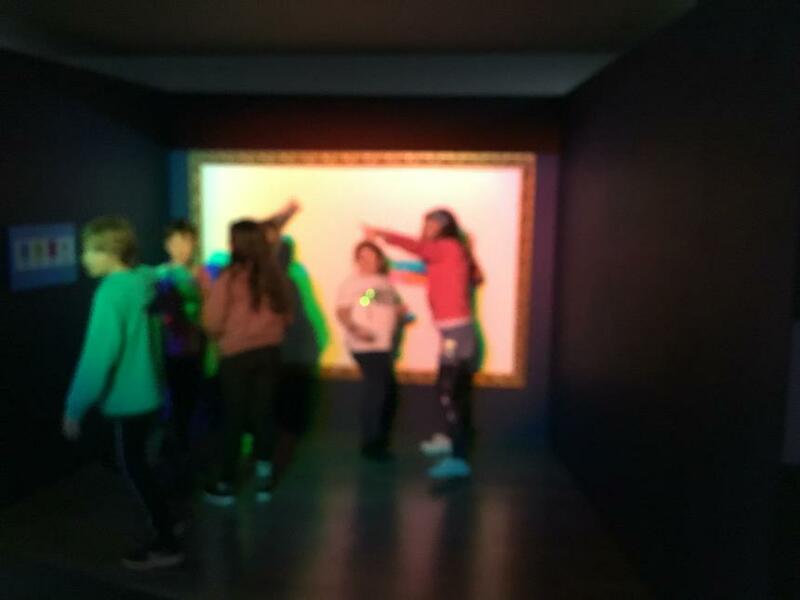 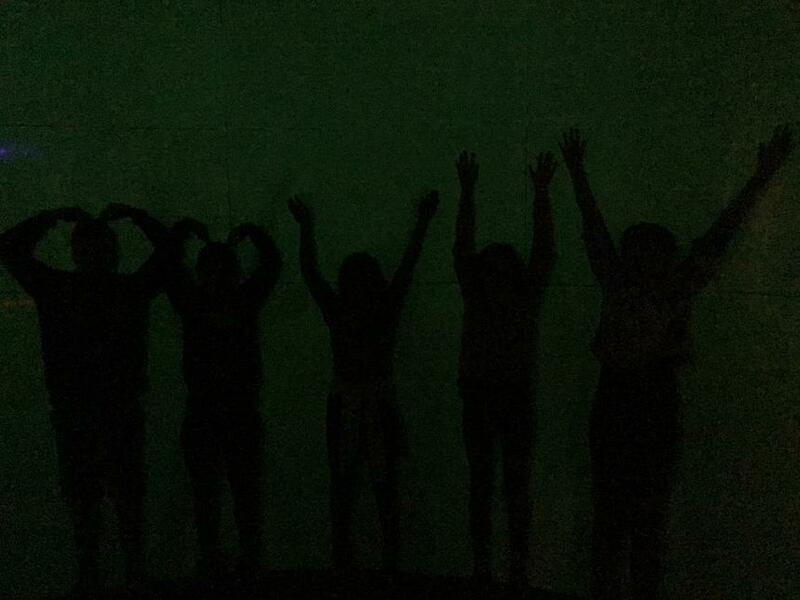 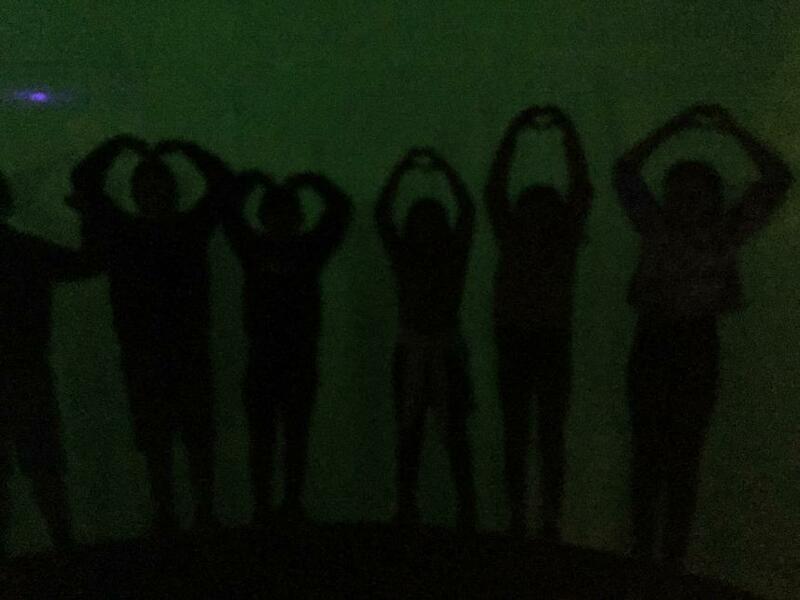 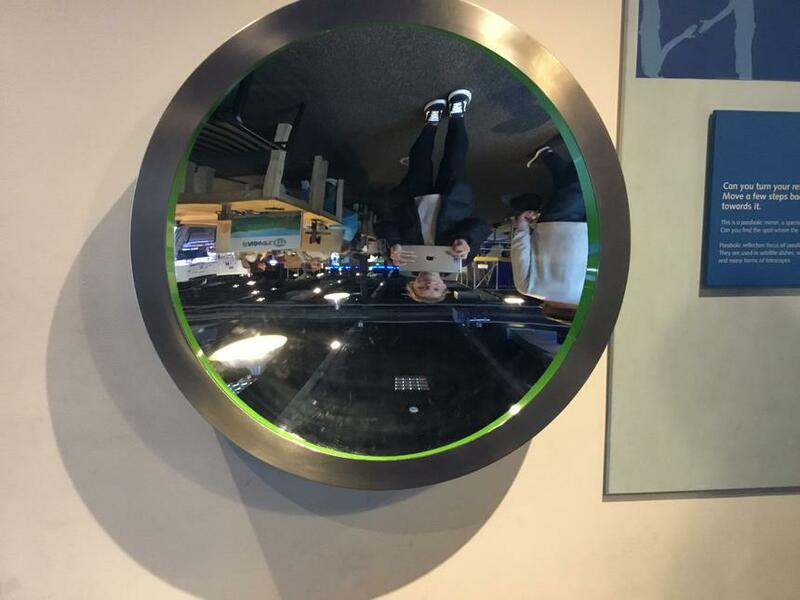 They experienced slanted rooms, shadow cameras, bubble-making machines and many more exciting things. 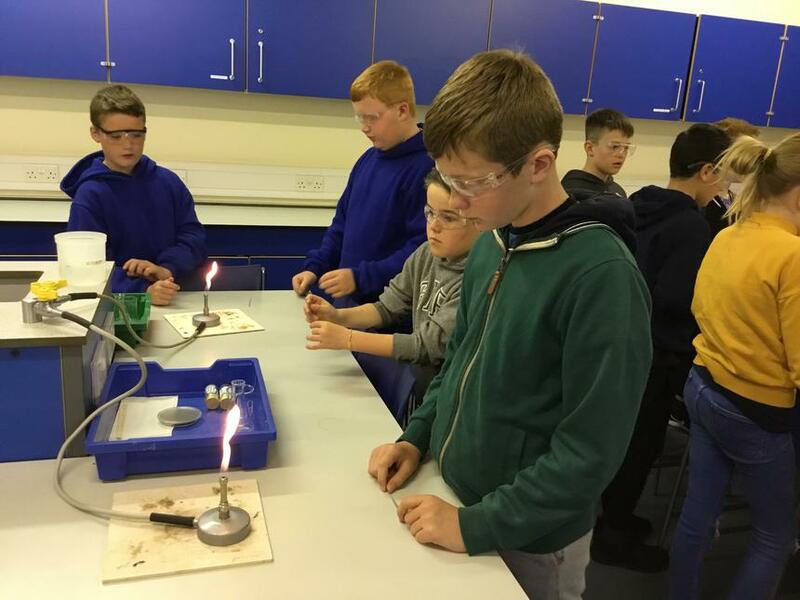 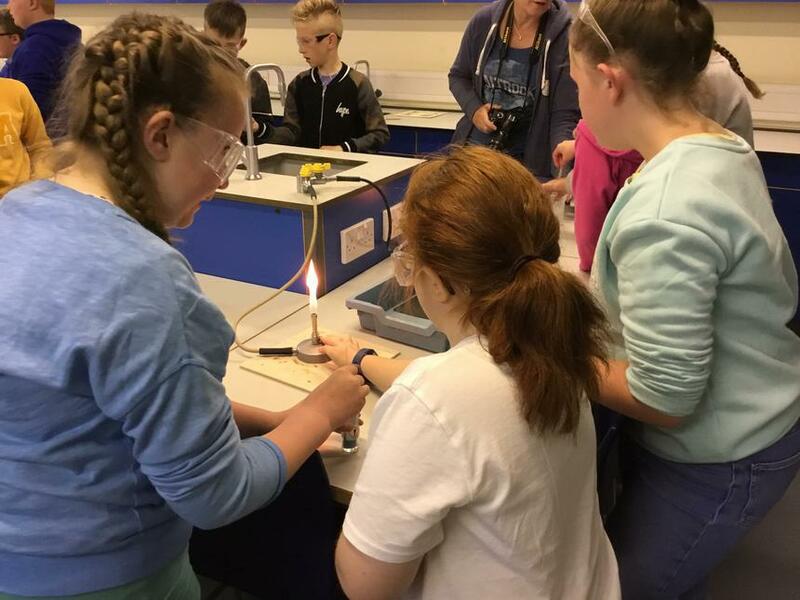 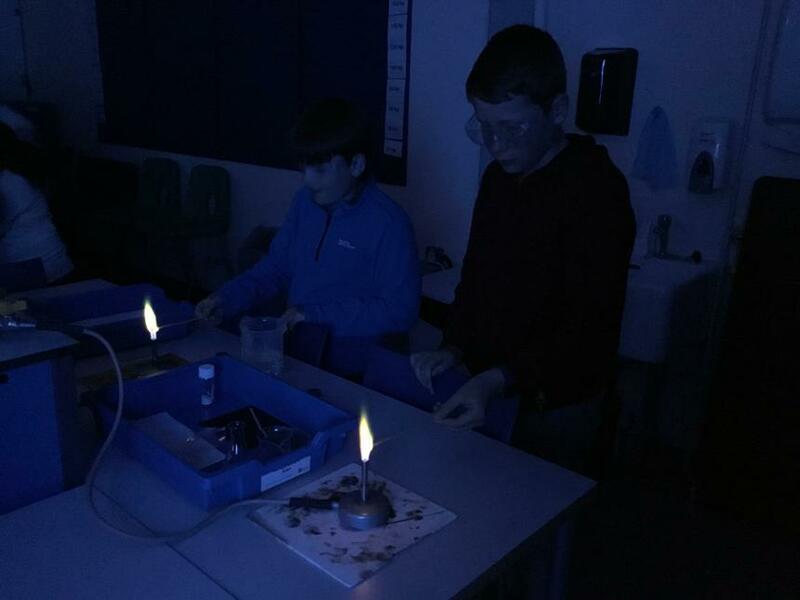 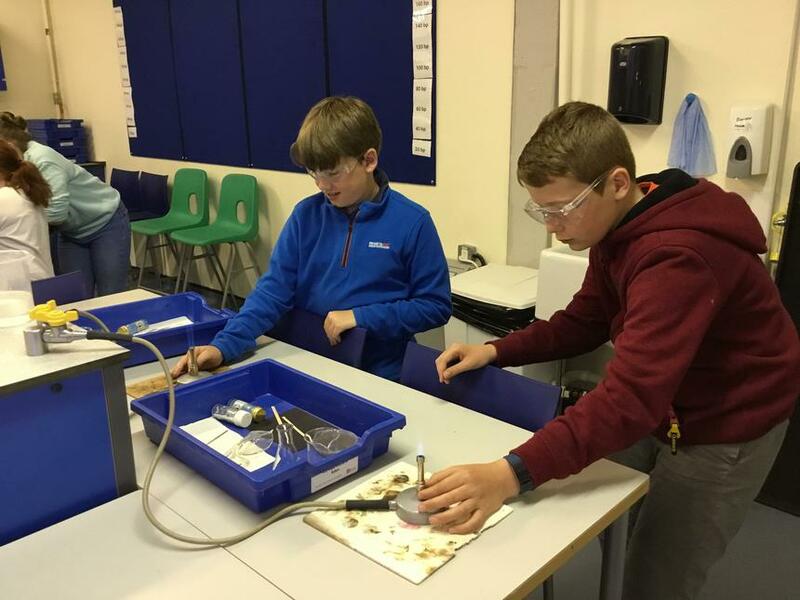 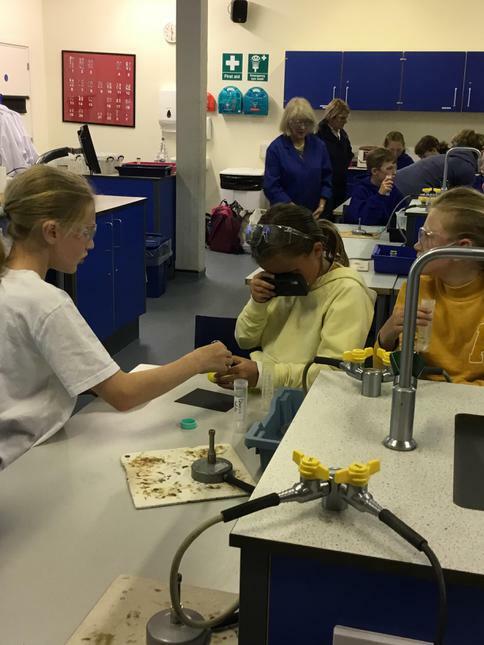 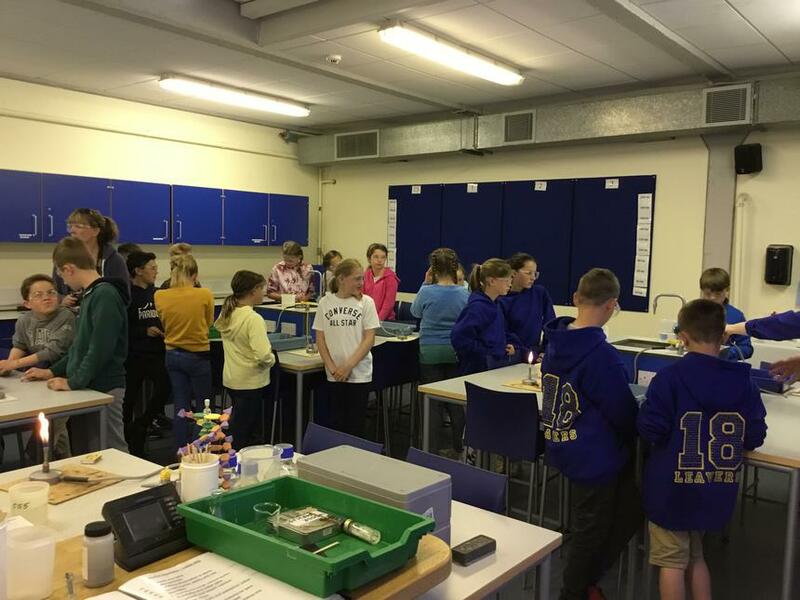 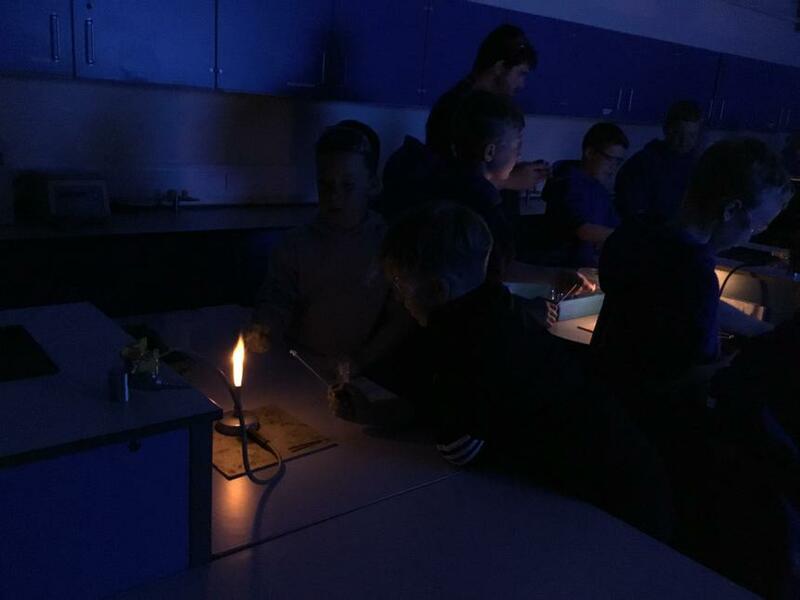 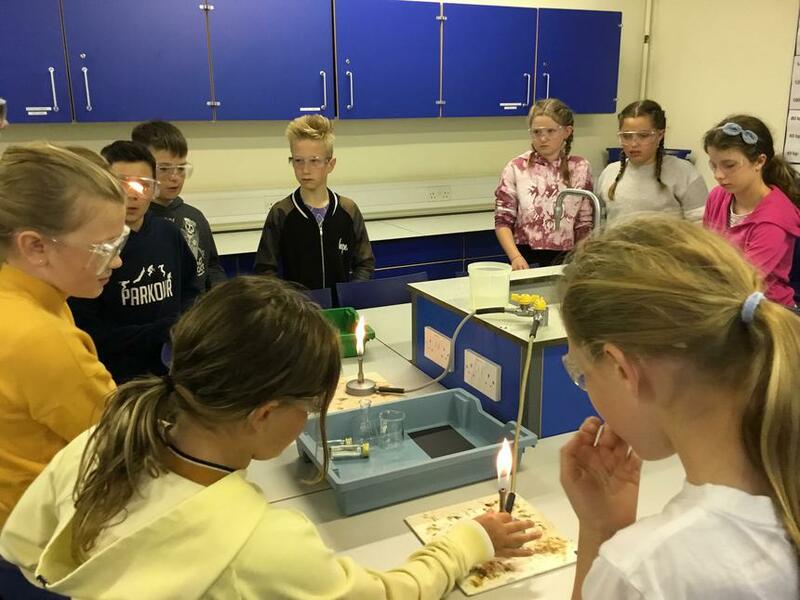 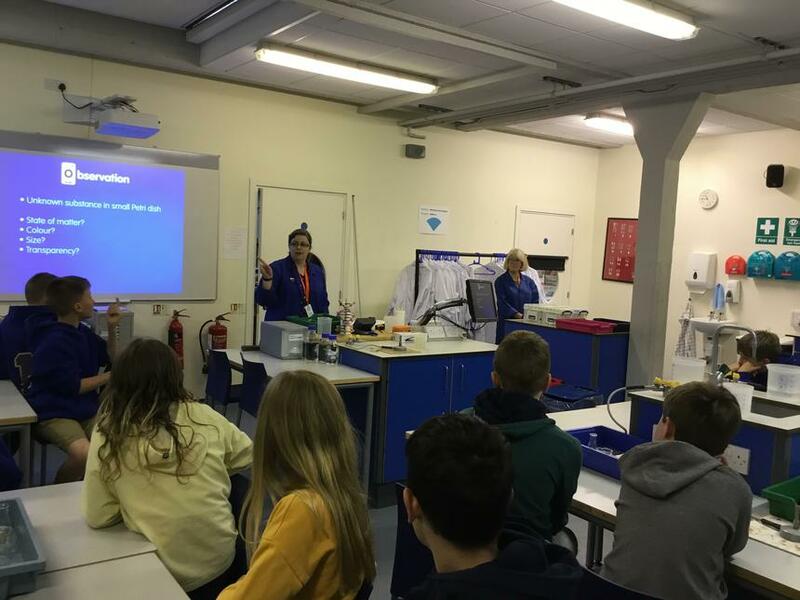 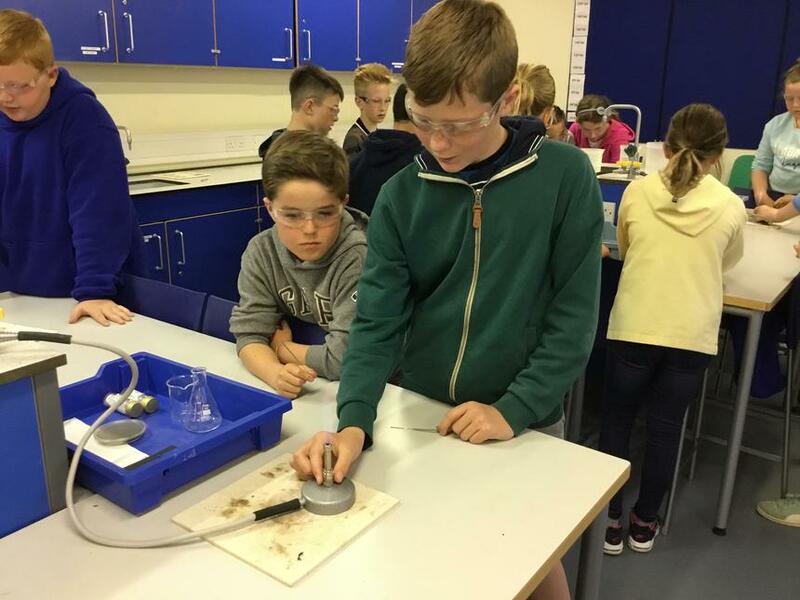 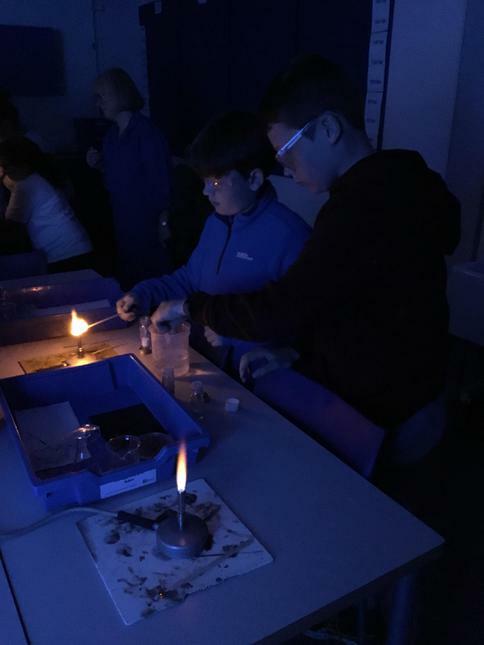 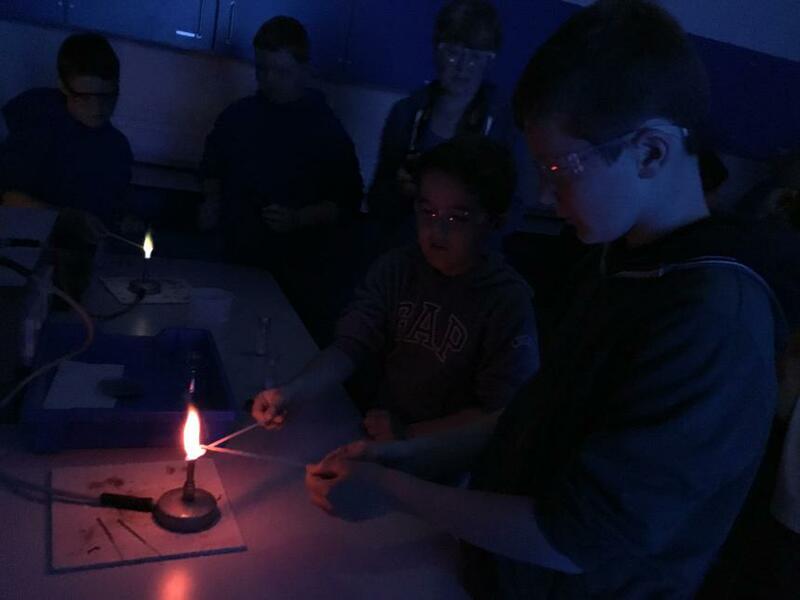 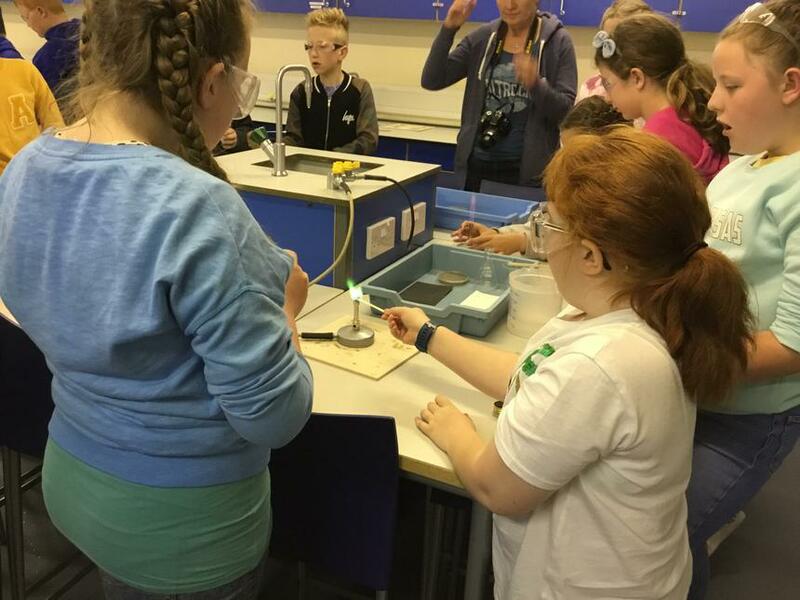 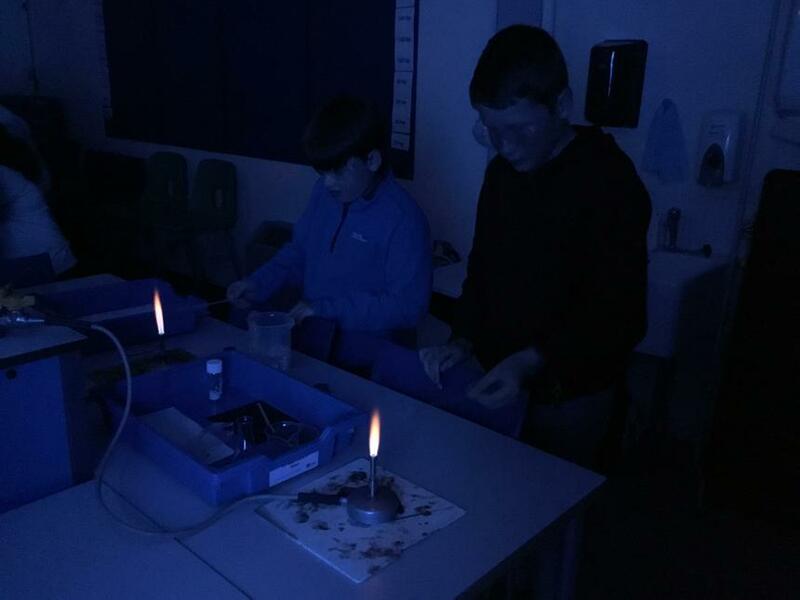 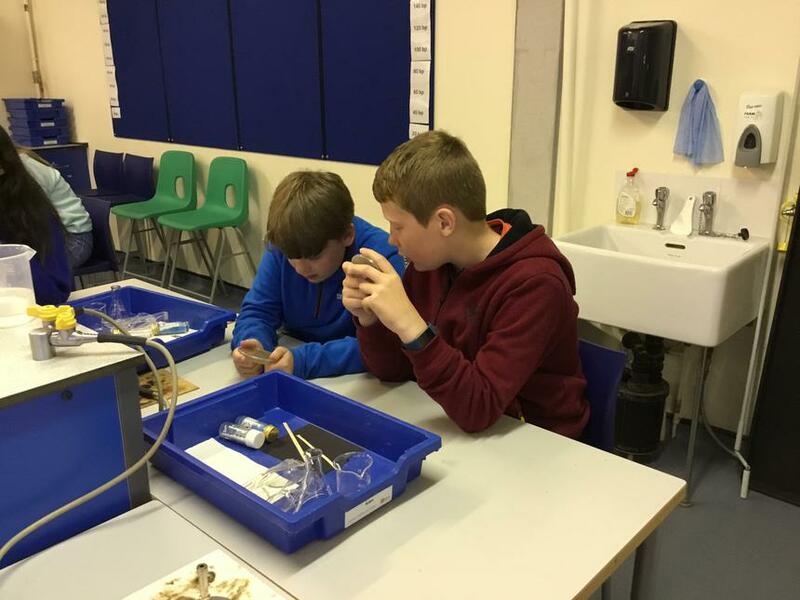 The children also took part in a 'Colourful Chemistry' workshop where they used bunsen burners to look at different reactions - this was a real insight into how some of their science lessons will work in secondary school! 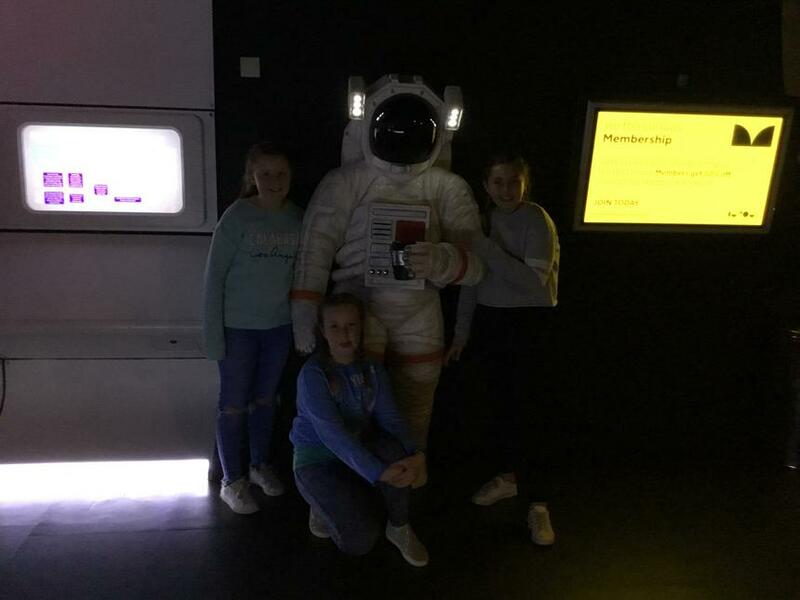 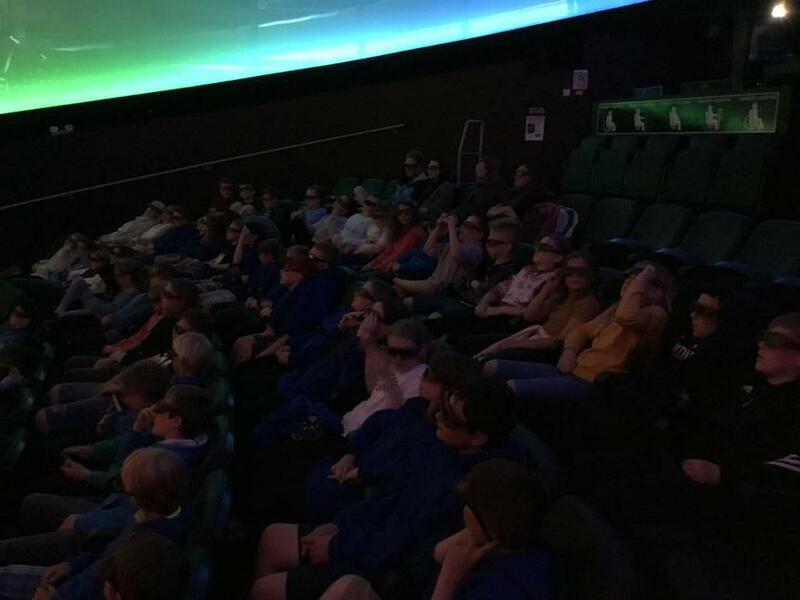 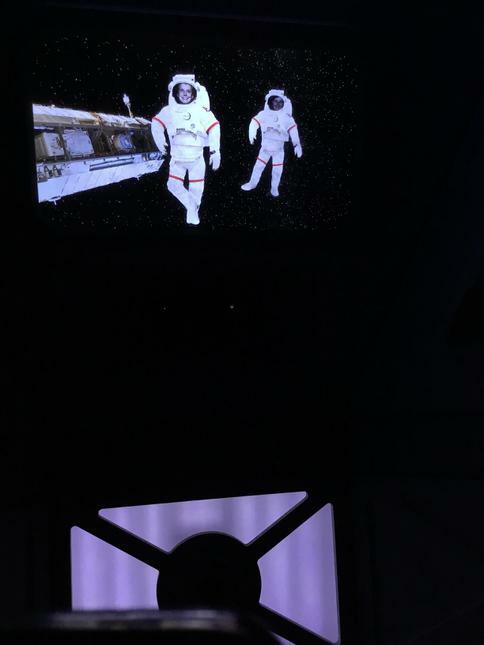 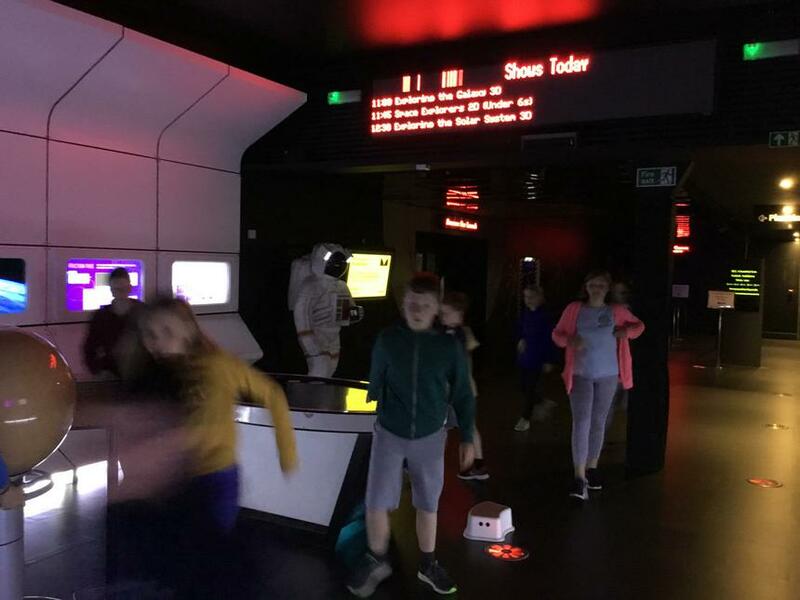 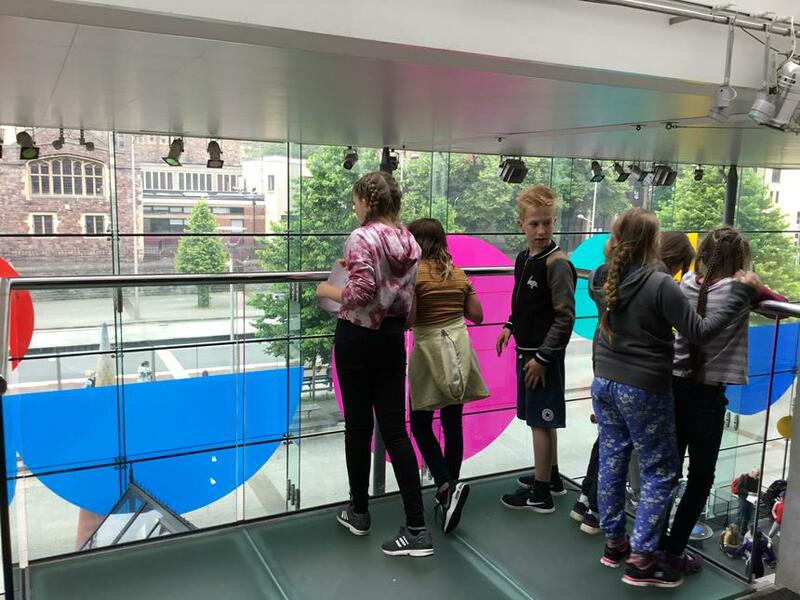 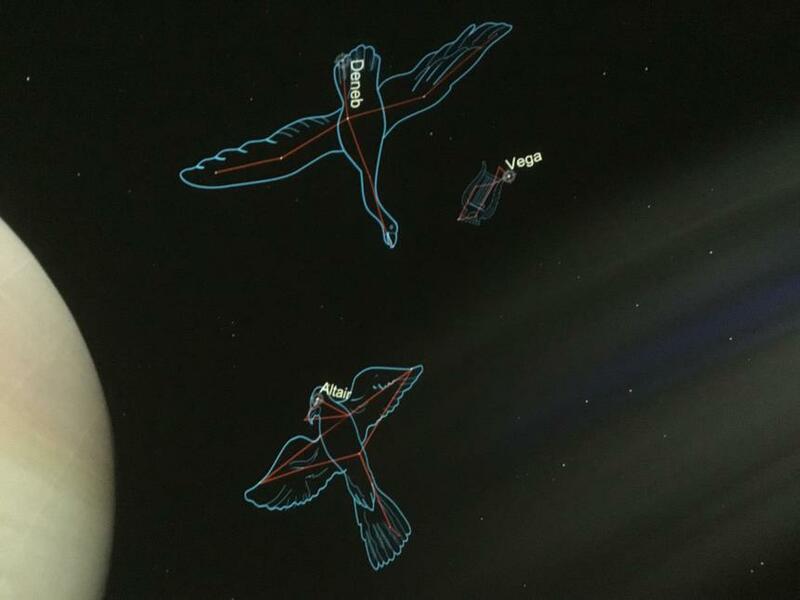 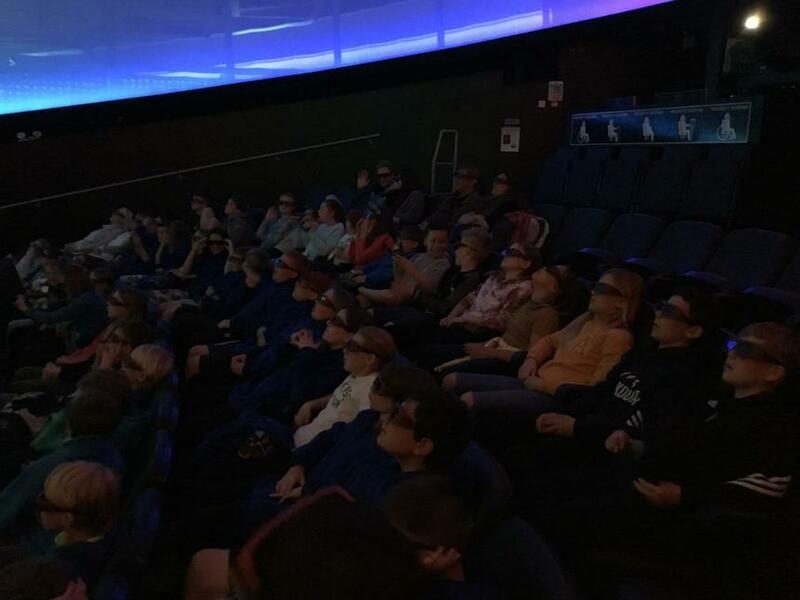 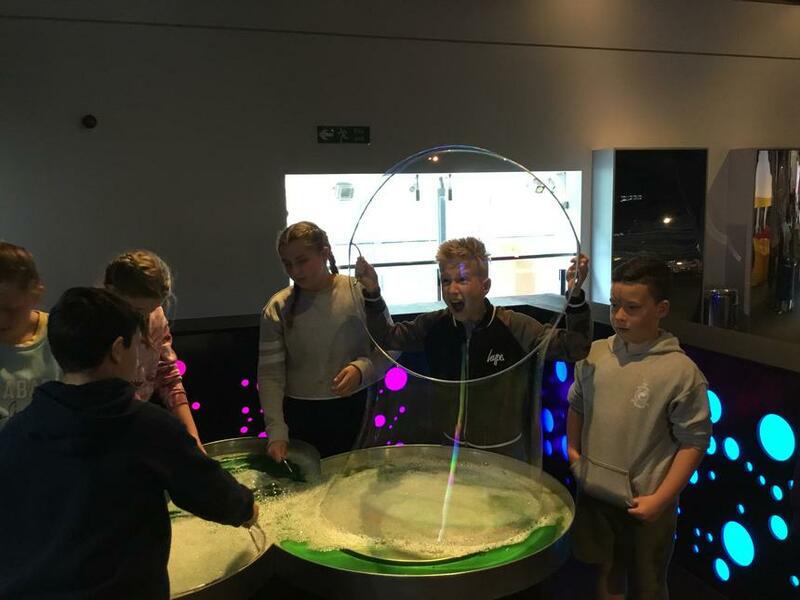 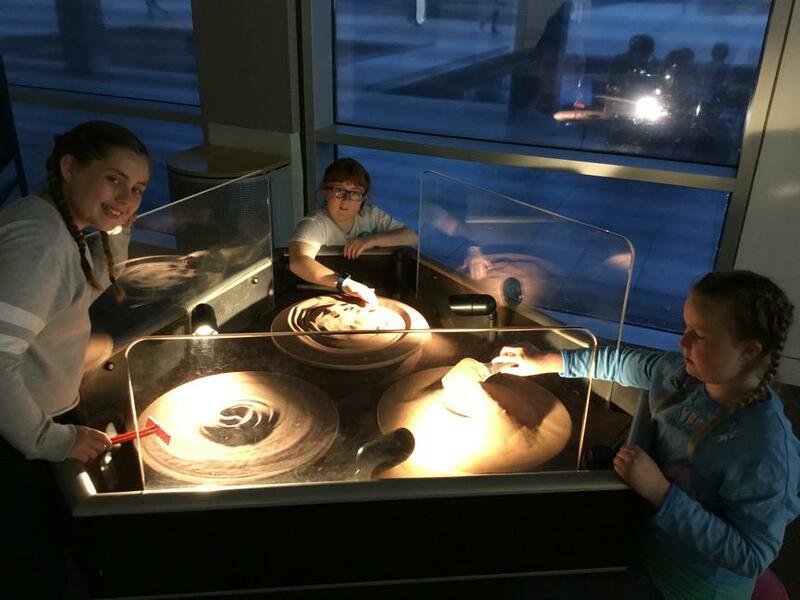 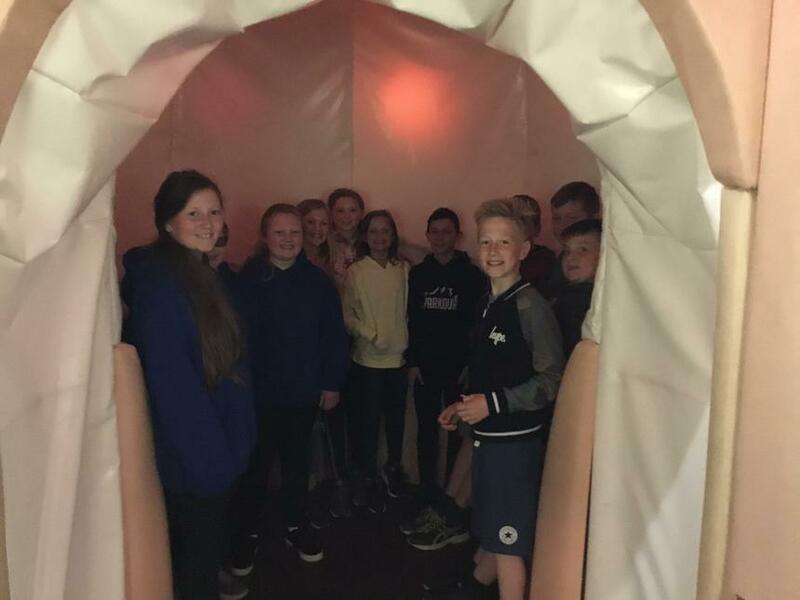 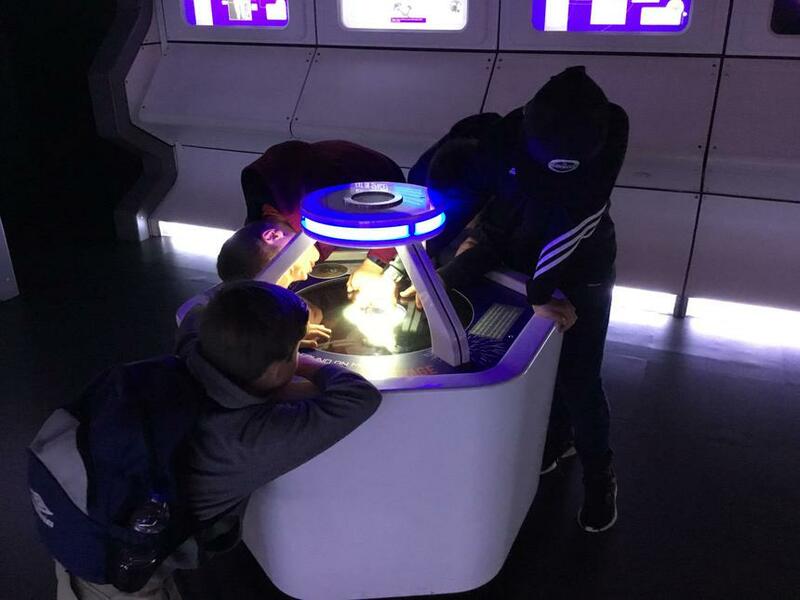 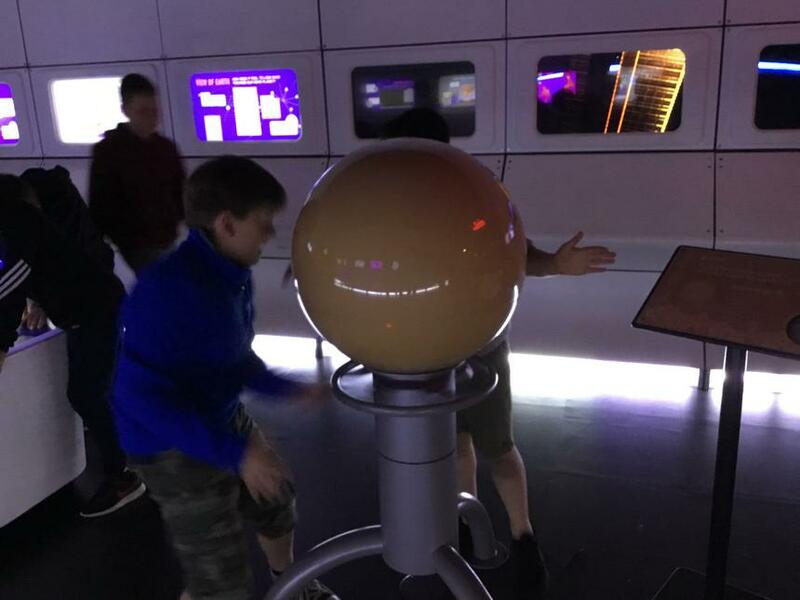 To end the day, the children visited the planetarium, looking at the largest stars in our solar system in great detail, all through a pair of 3D glasses! 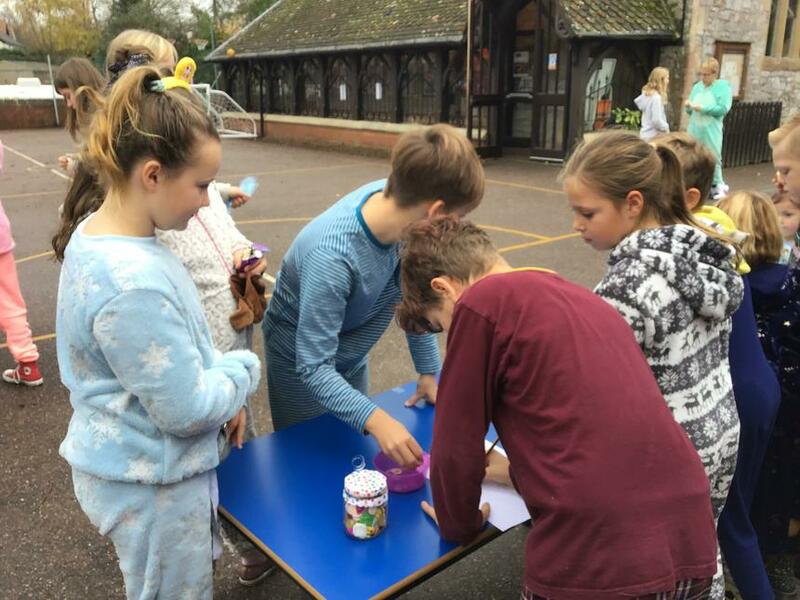 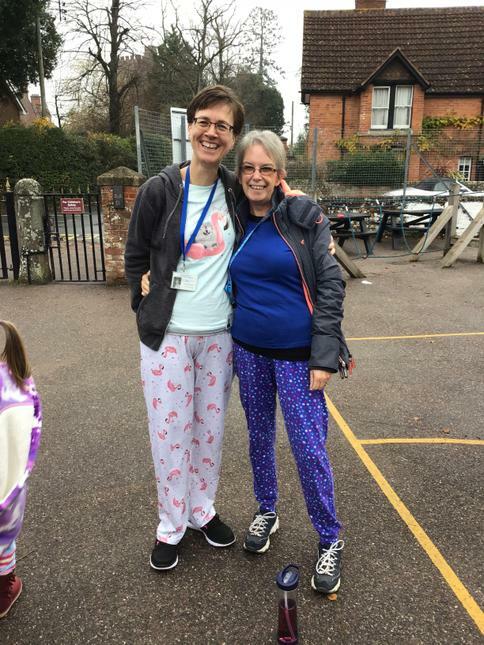 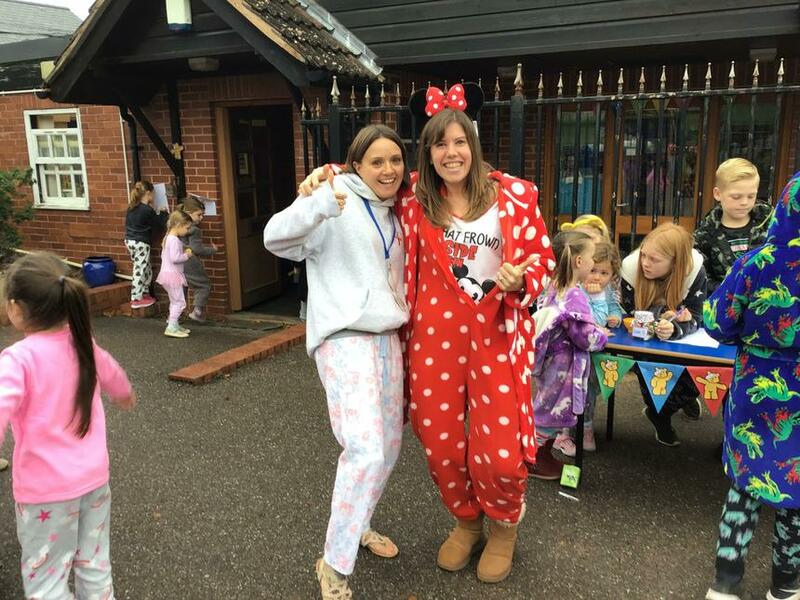 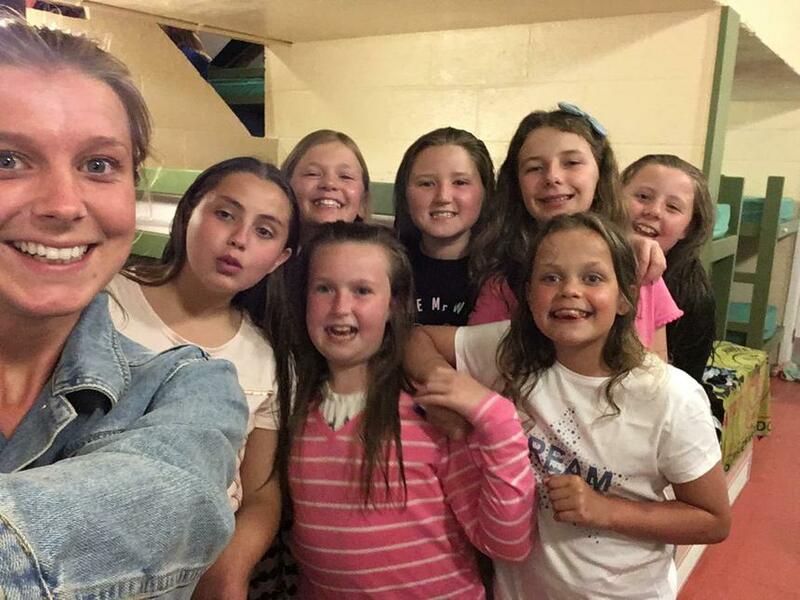 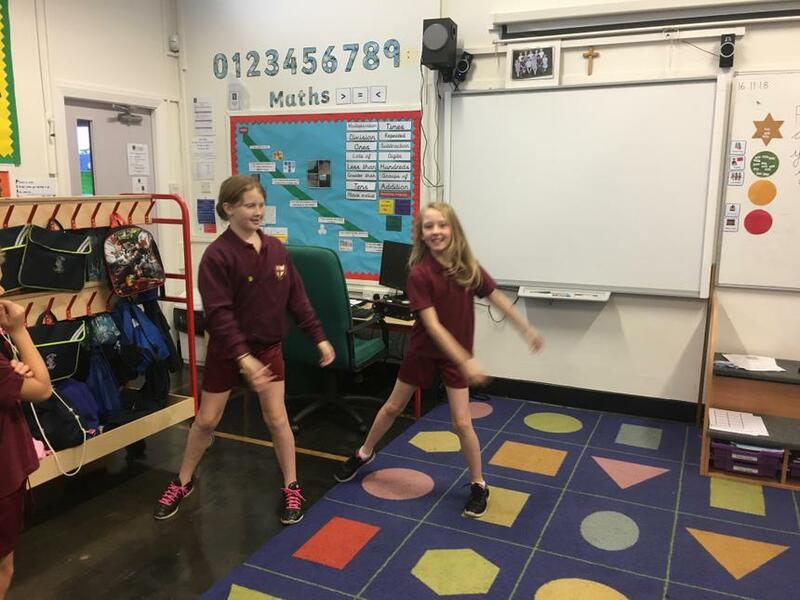 Again, back at Barton Camp, the children had more free time, more time in the pool and more hot chocolate and biscuits, this time enjoyed at the same time as a talent show, where children were able to showcase their singing, dancing and acting expertise in front of their peers and and teachers! 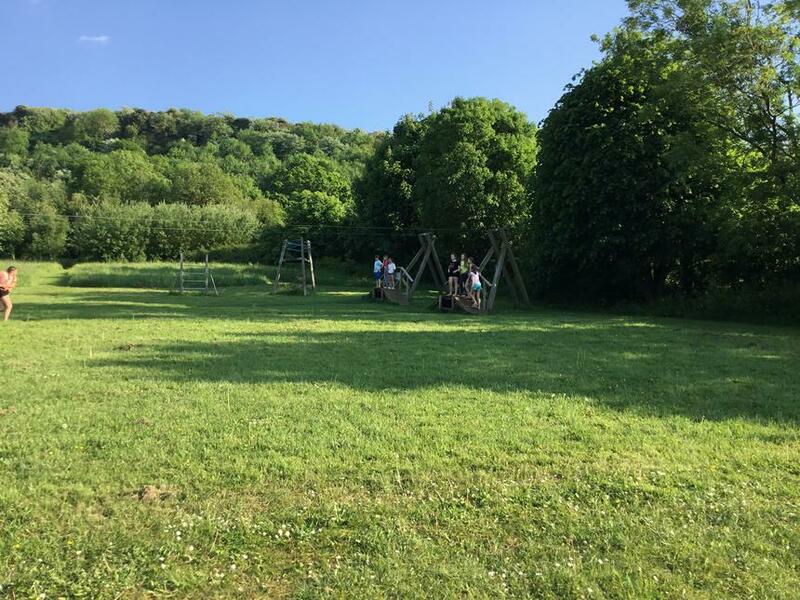 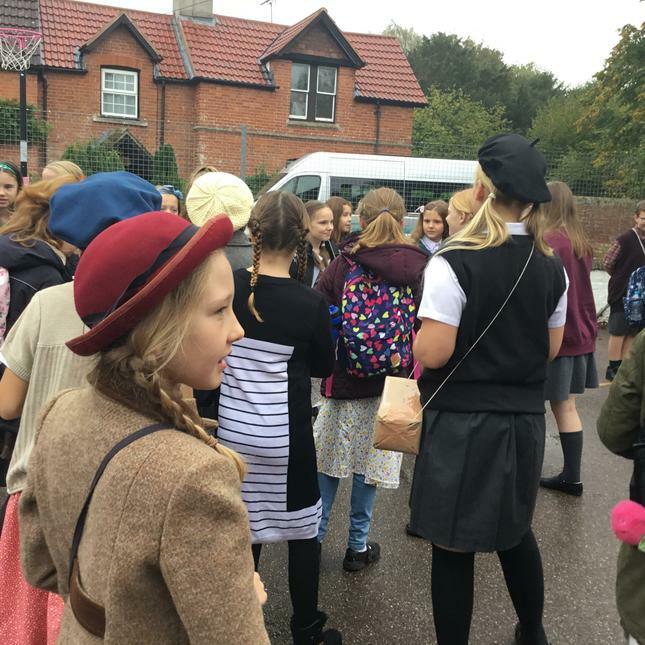 On Friday, the children were sad to have to pack their bags and leave Barton Camp. 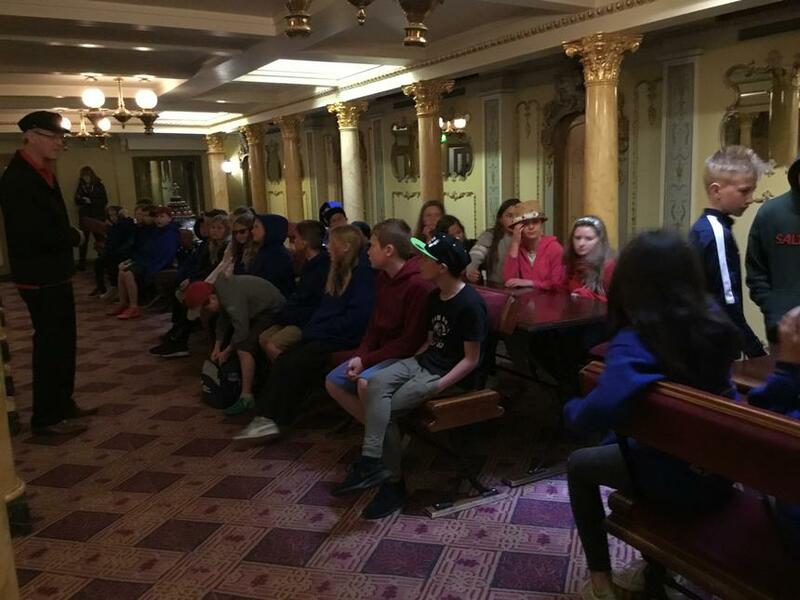 After room inspections and lots of lost property claims, we boarded the coach once more and travelled back into Bristol. 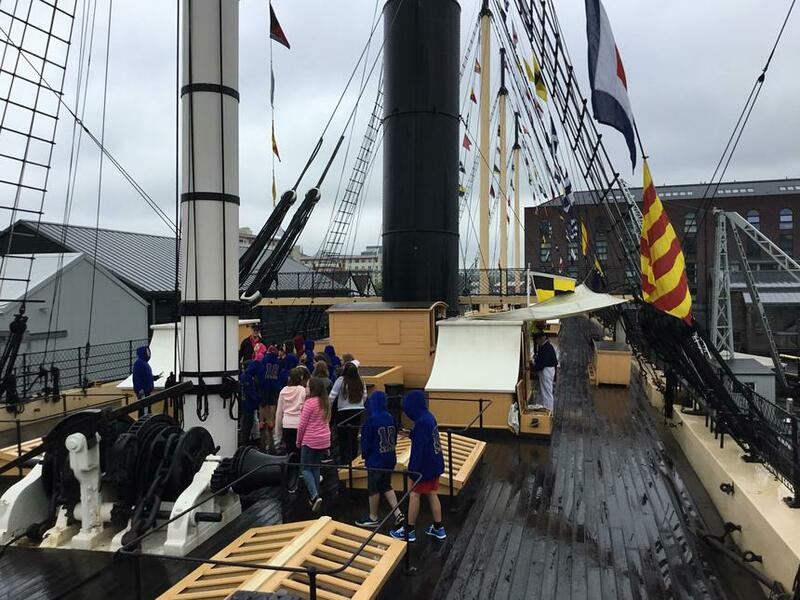 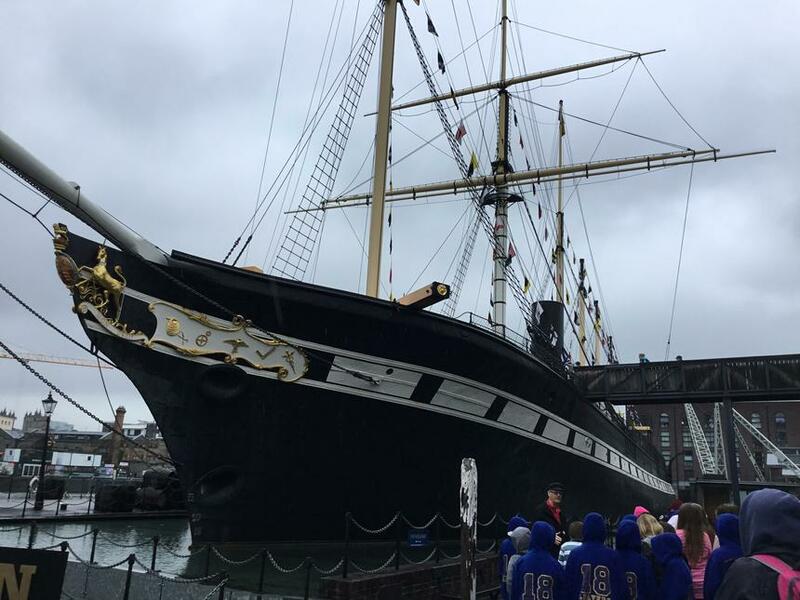 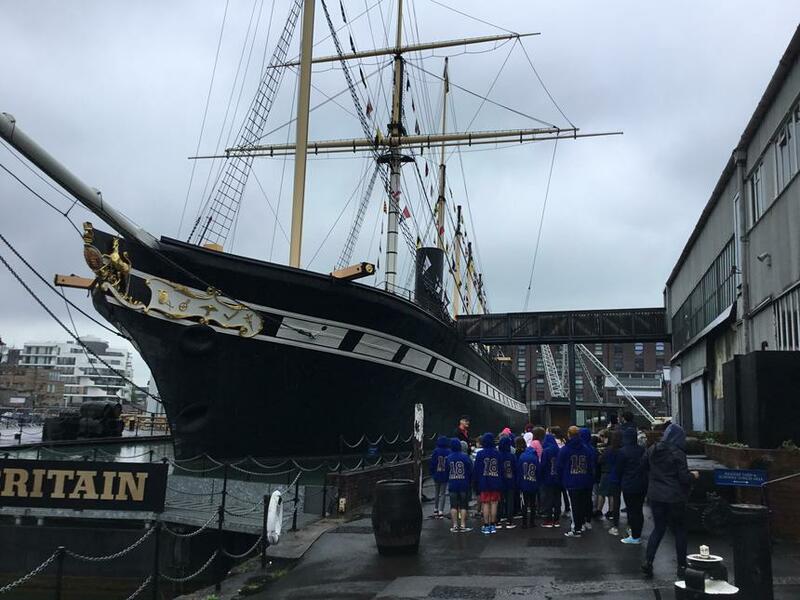 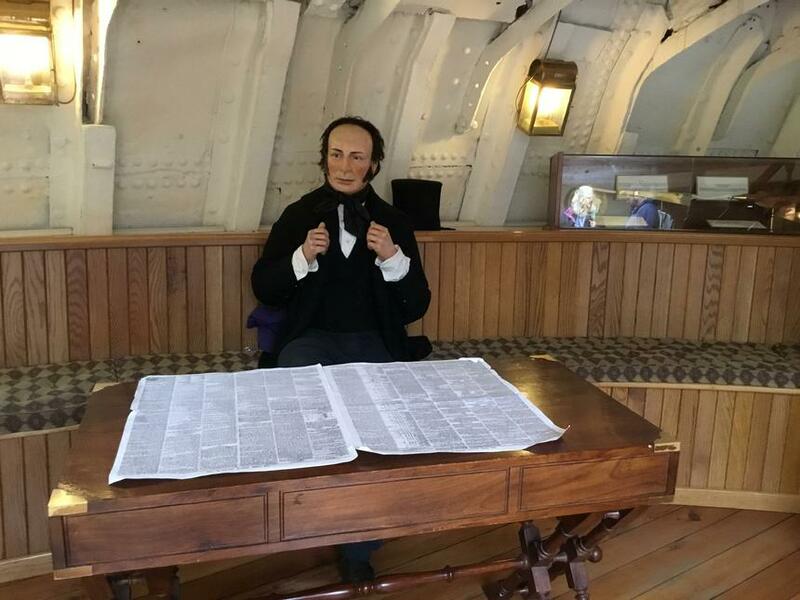 We took a long walk around the harbour admiring the boats and buildings (the weather not so nice this time), then we arrived at SS Great Britain. 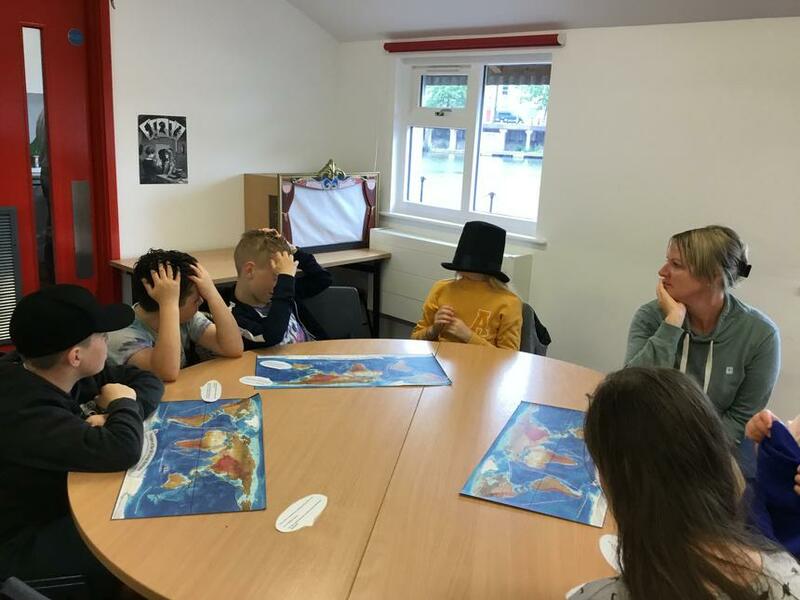 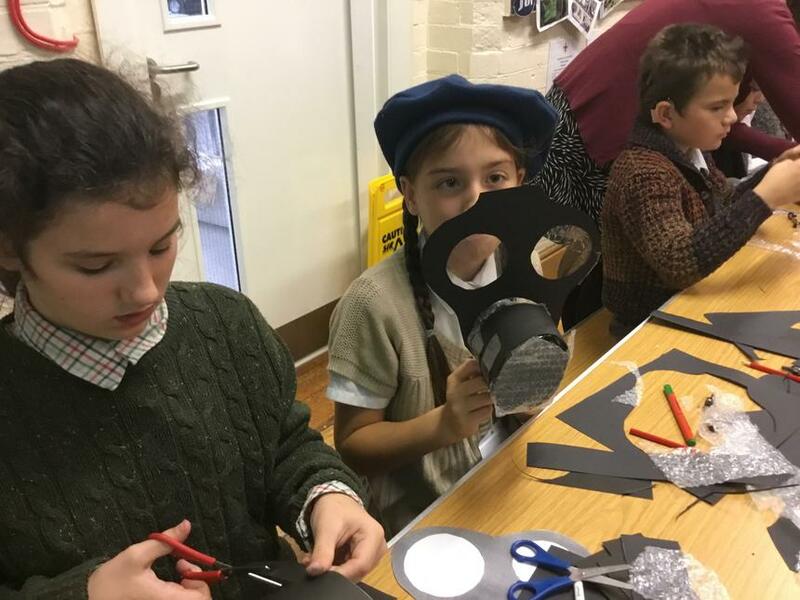 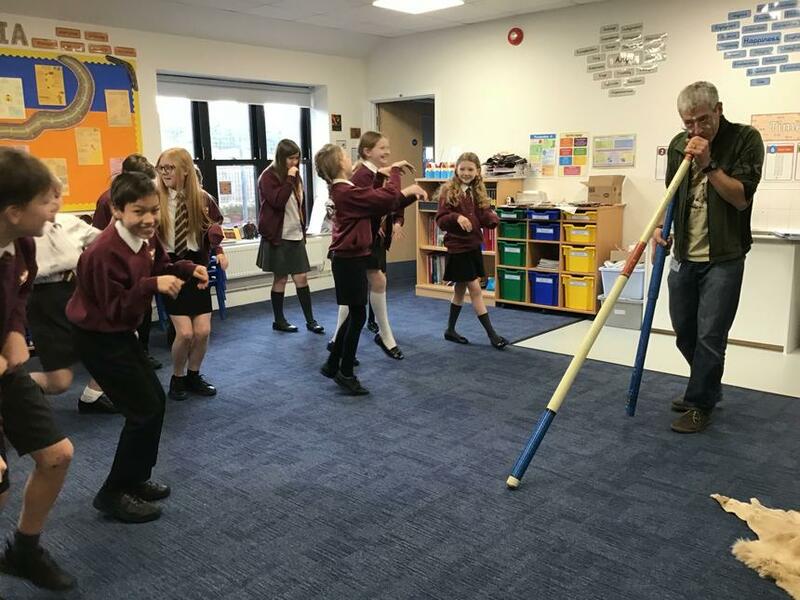 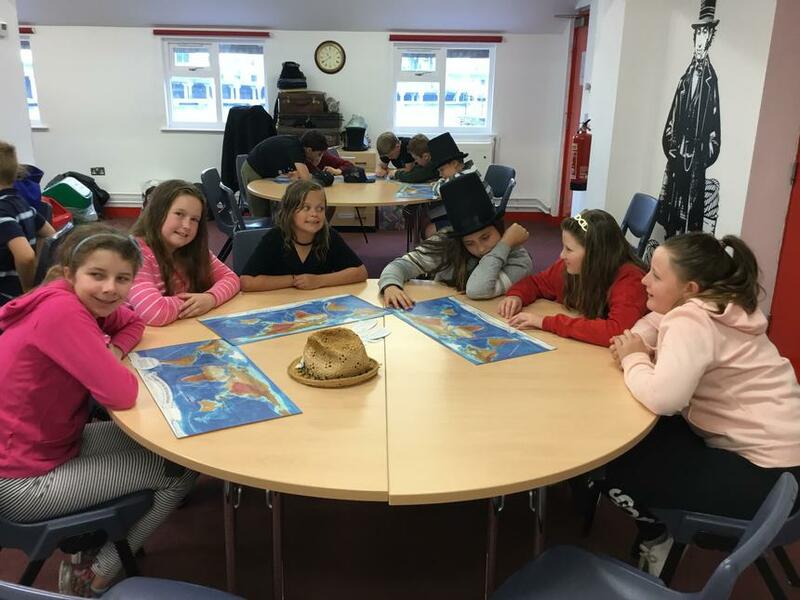 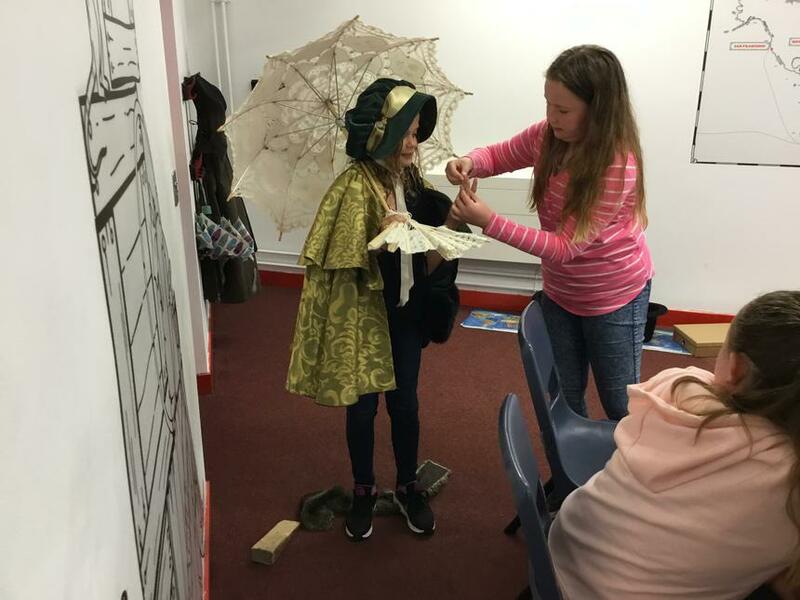 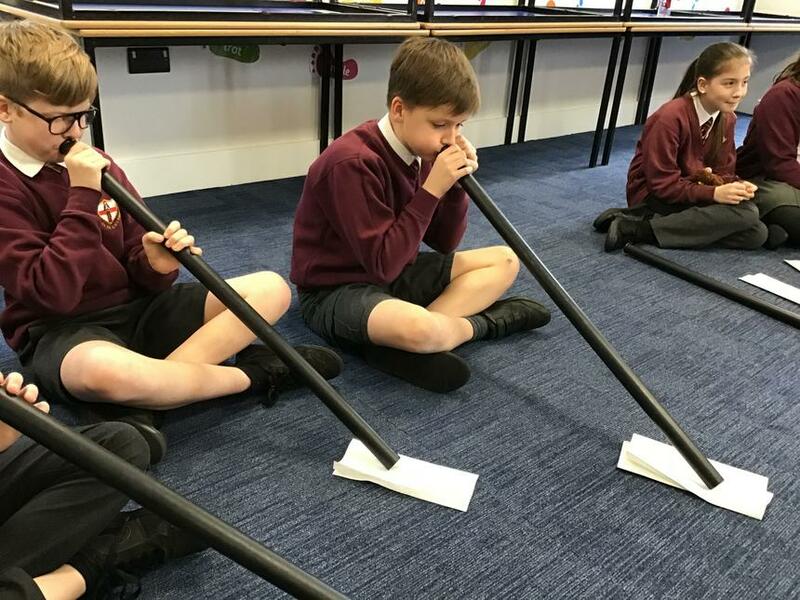 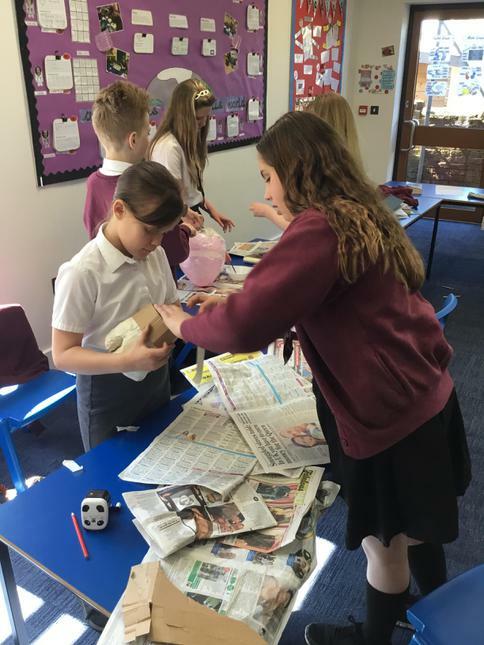 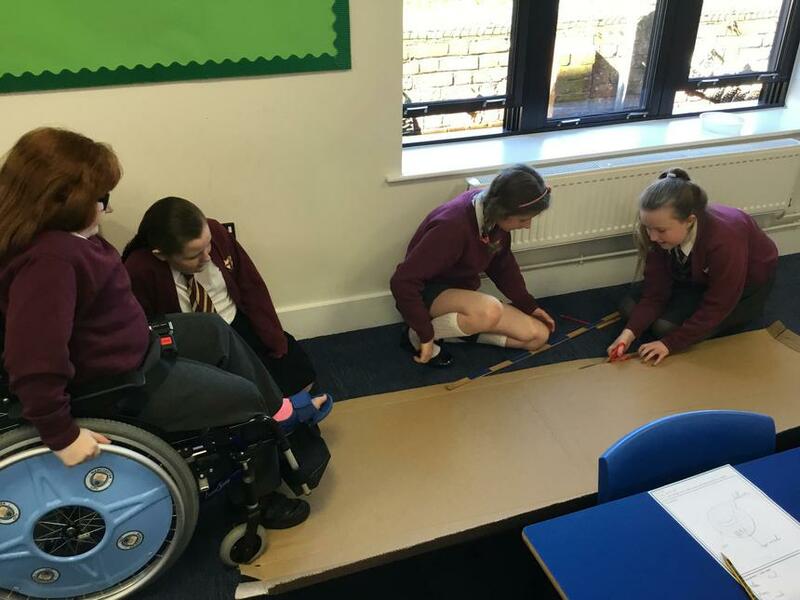 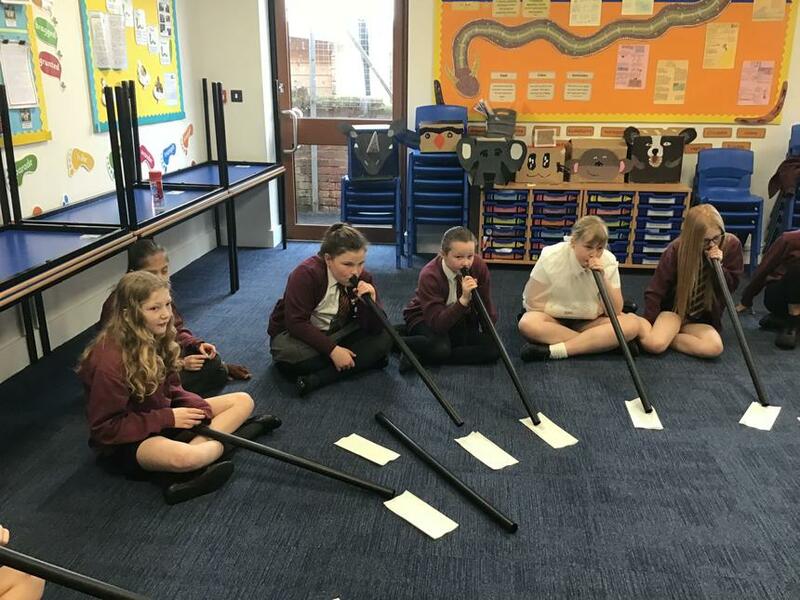 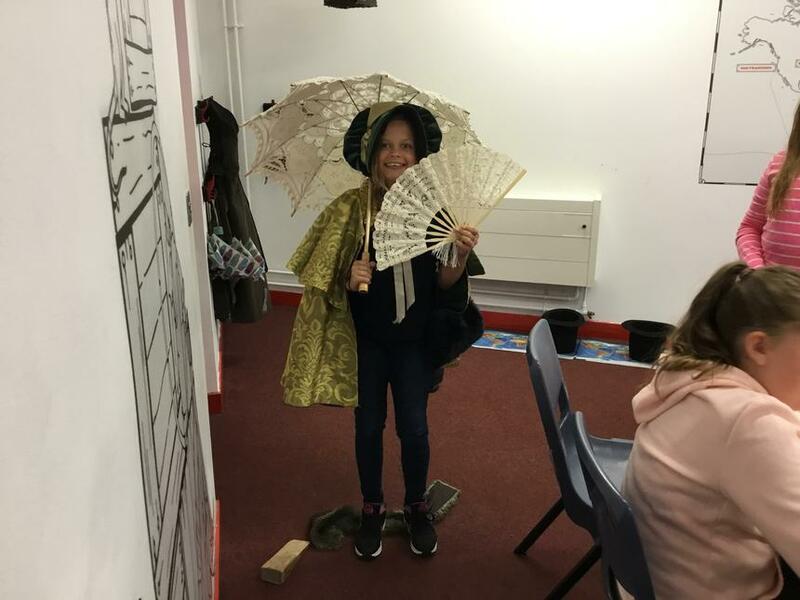 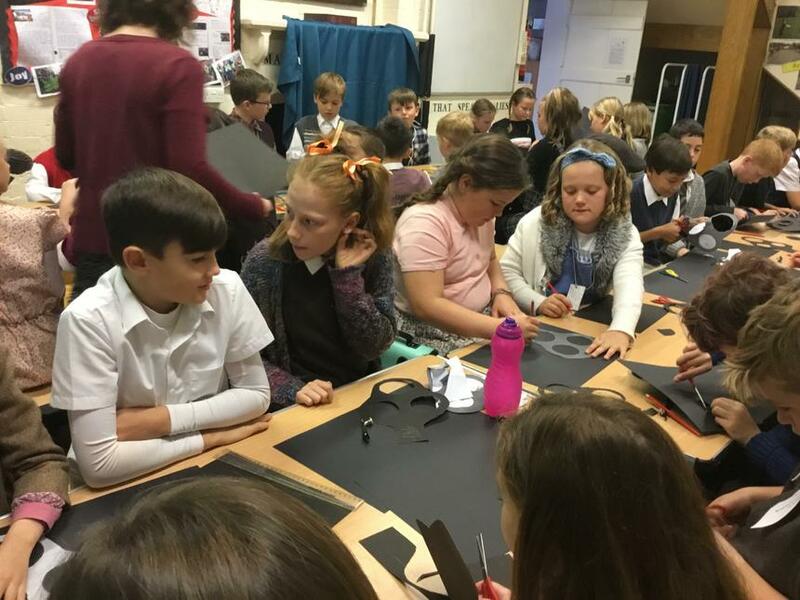 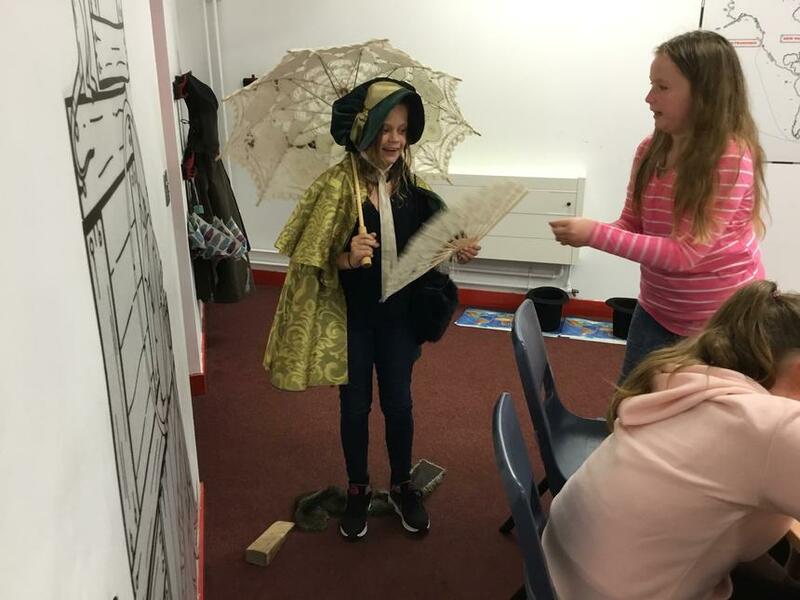 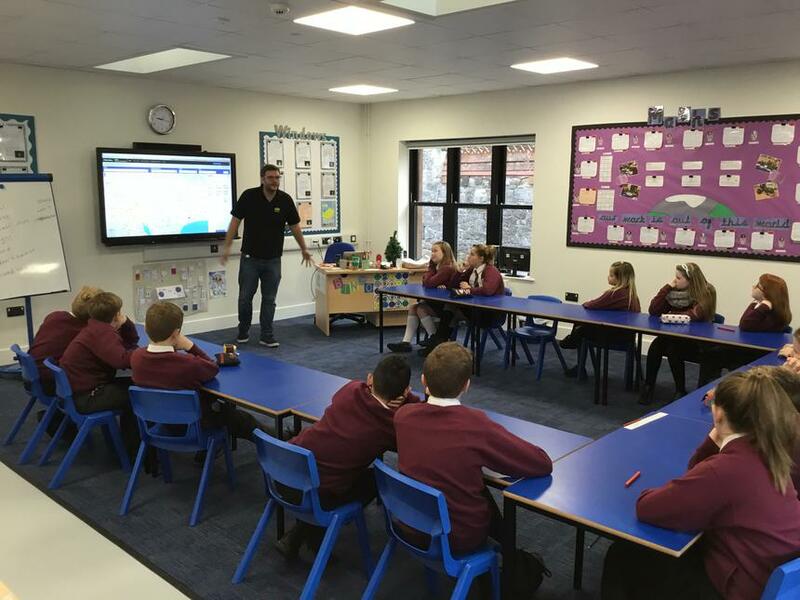 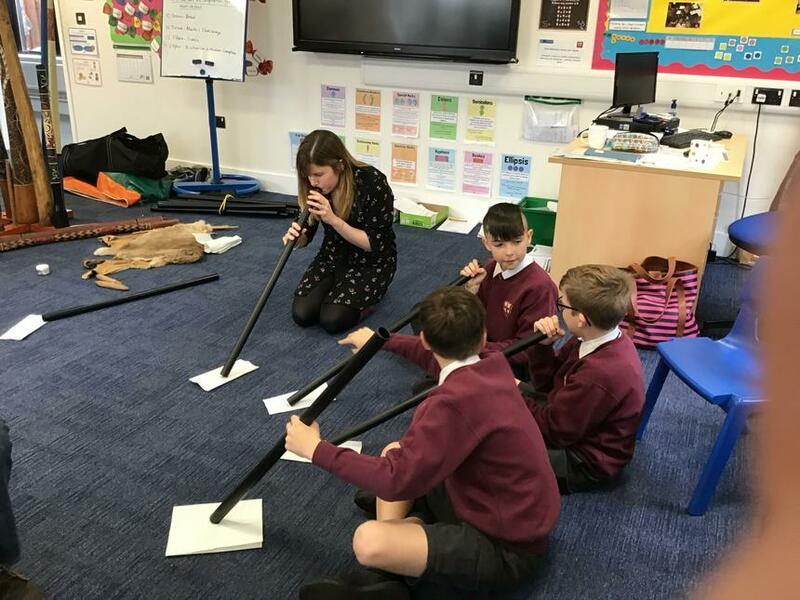 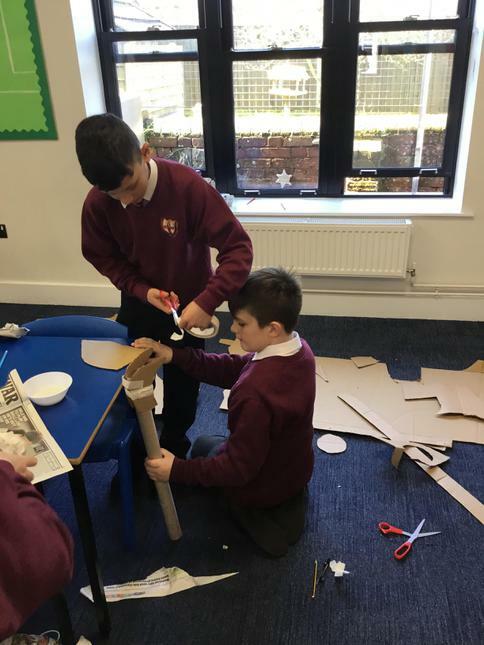 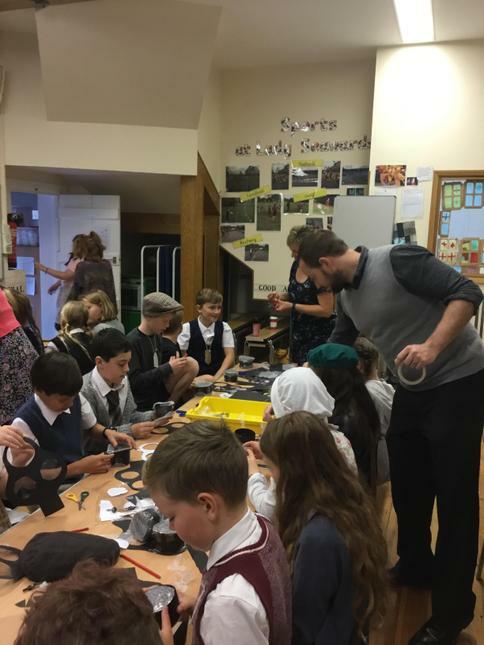 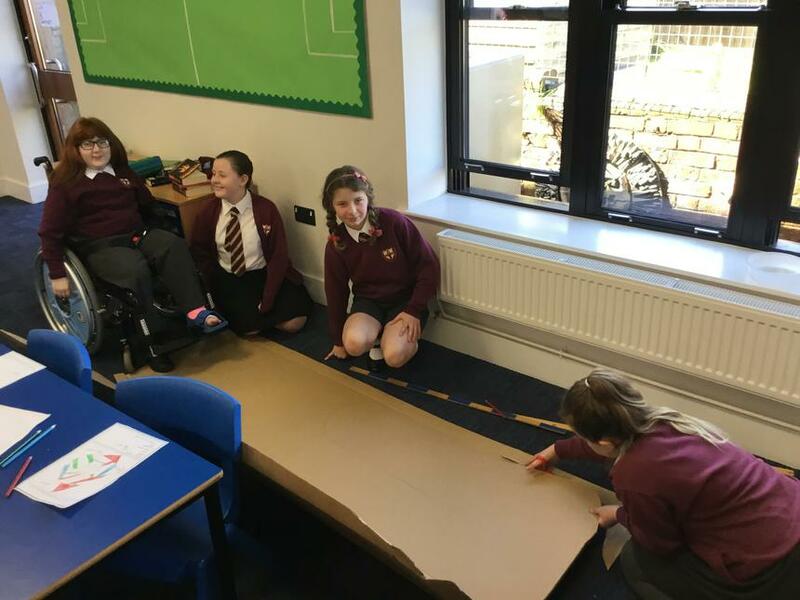 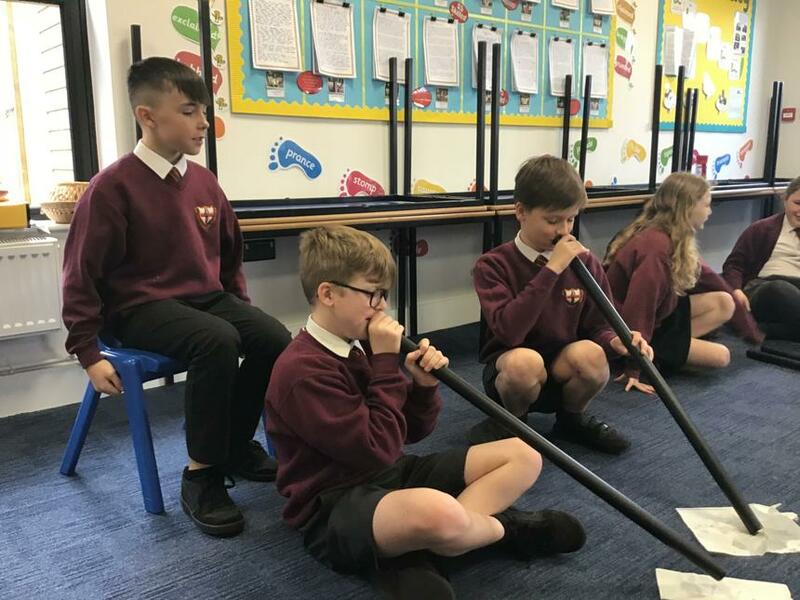 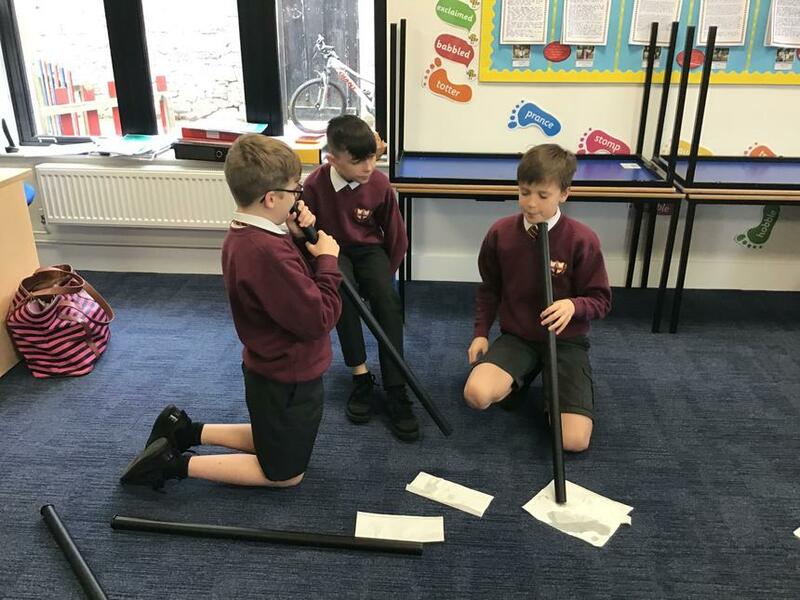 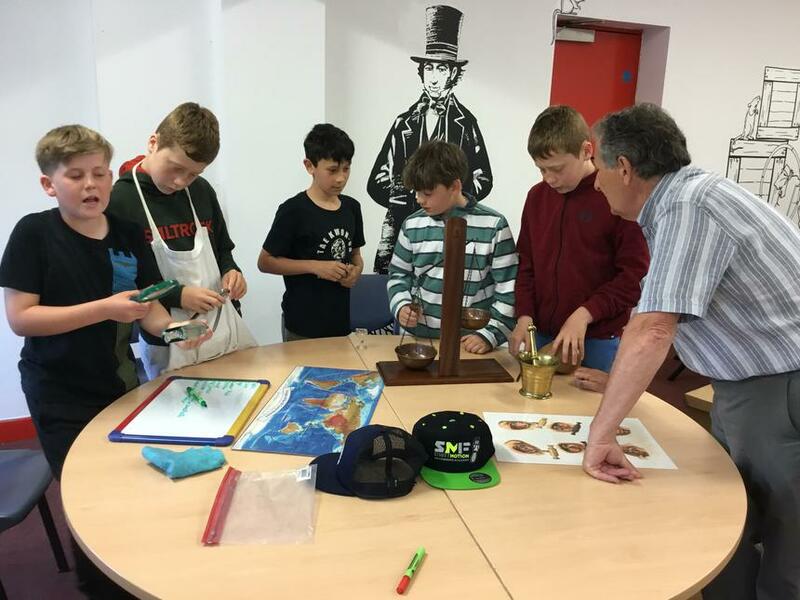 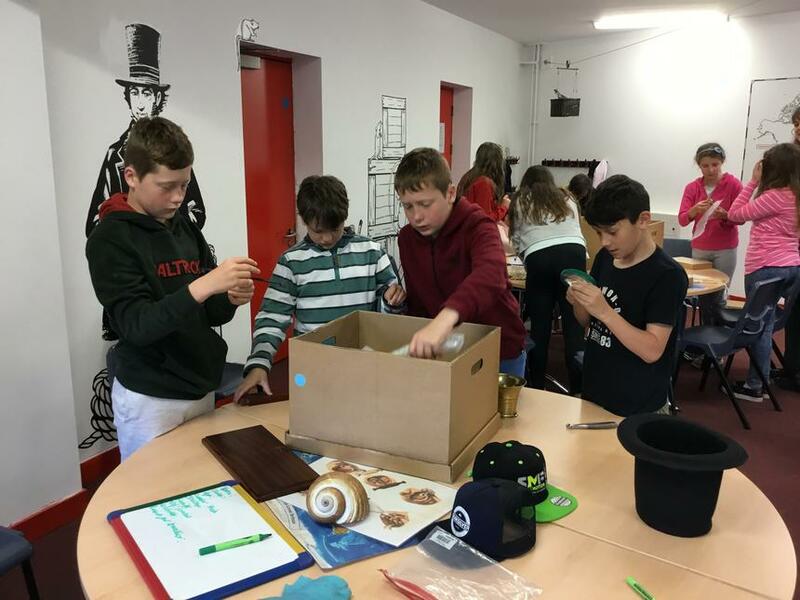 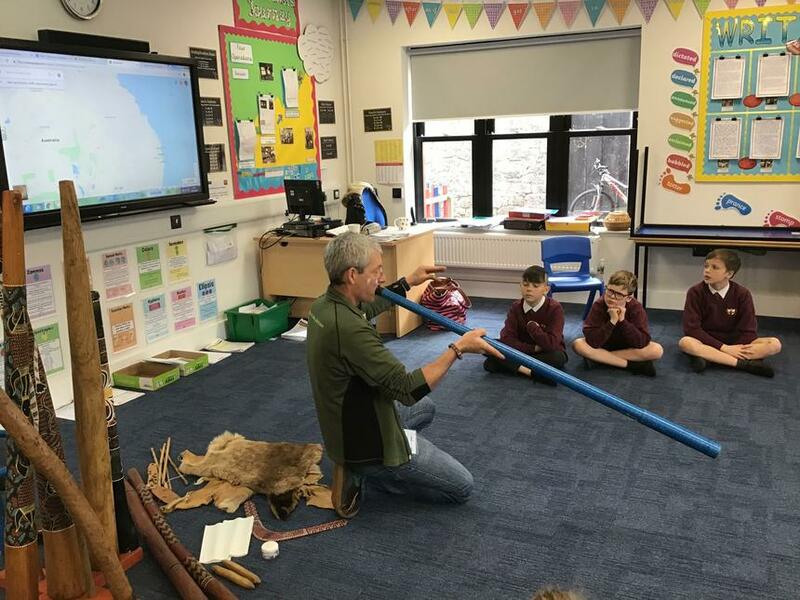 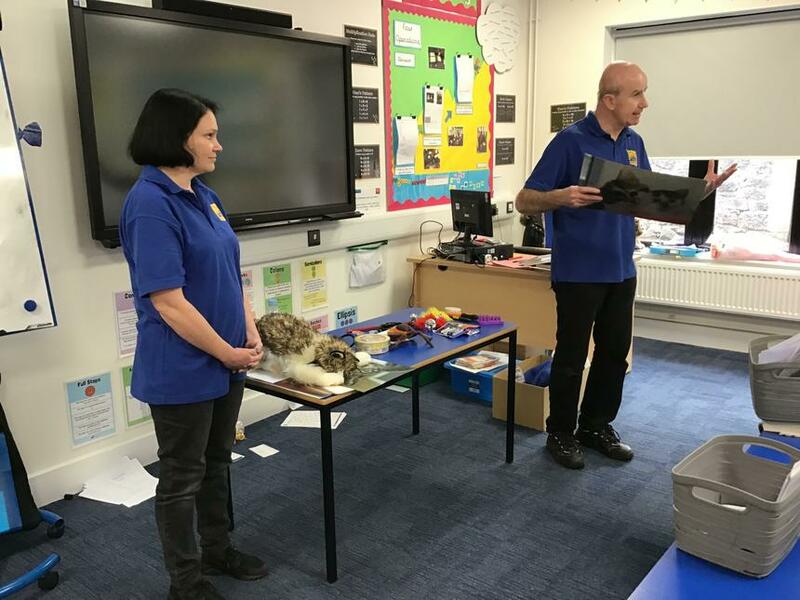 Here, the children took part in an engaging workkshop, looking at where the different roles the SS Great Britain had as a boat as well as where it travelled. 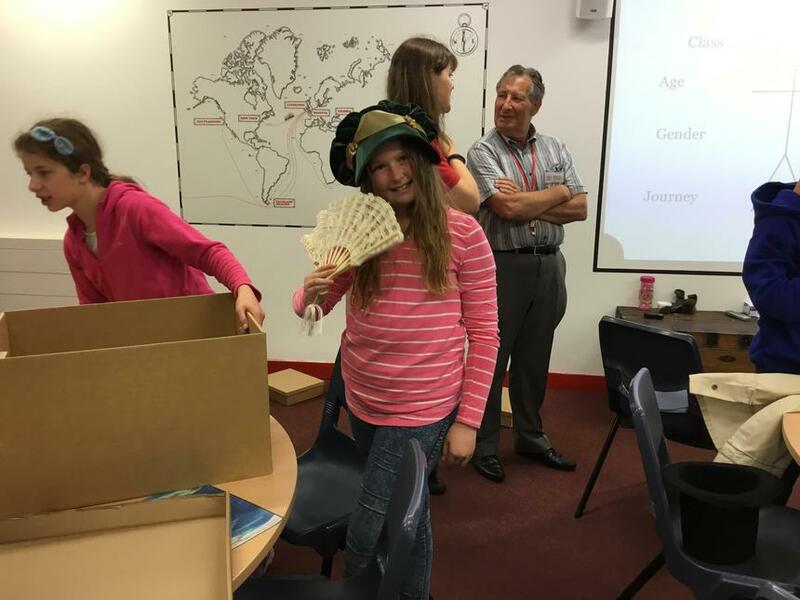 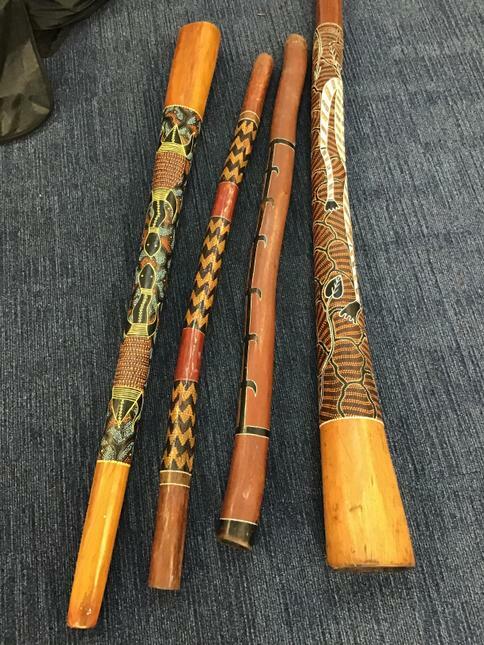 They were given real-life artifacts recovered from the boat as well as diary entries and letters. 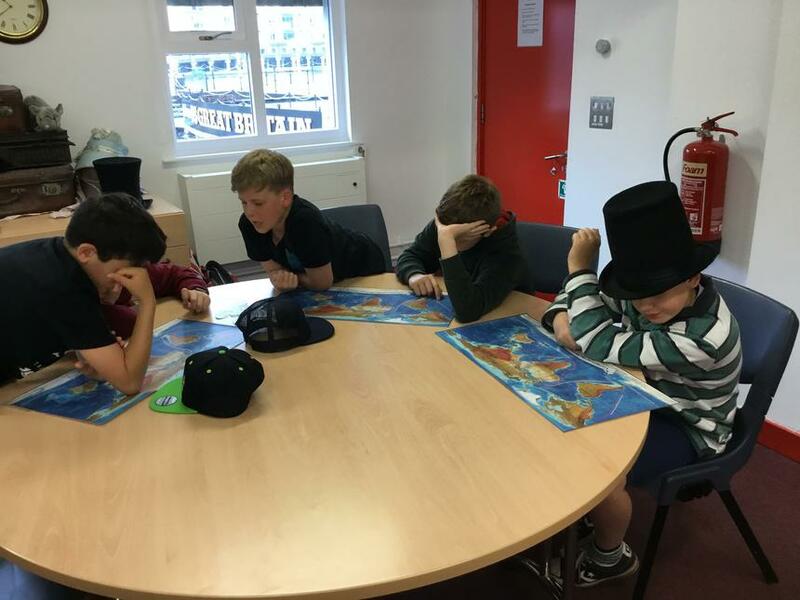 From this, the children had to use these clues to identify a given person who travelled on the SS Great Britain. 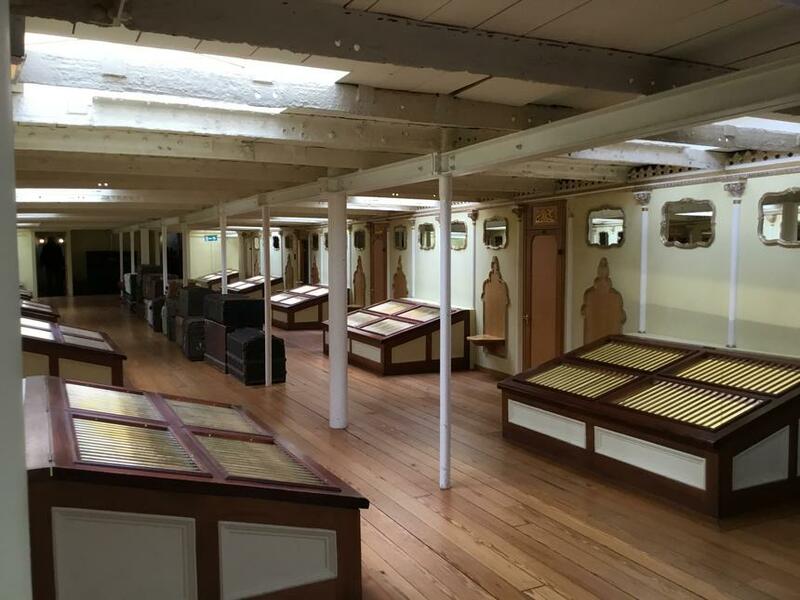 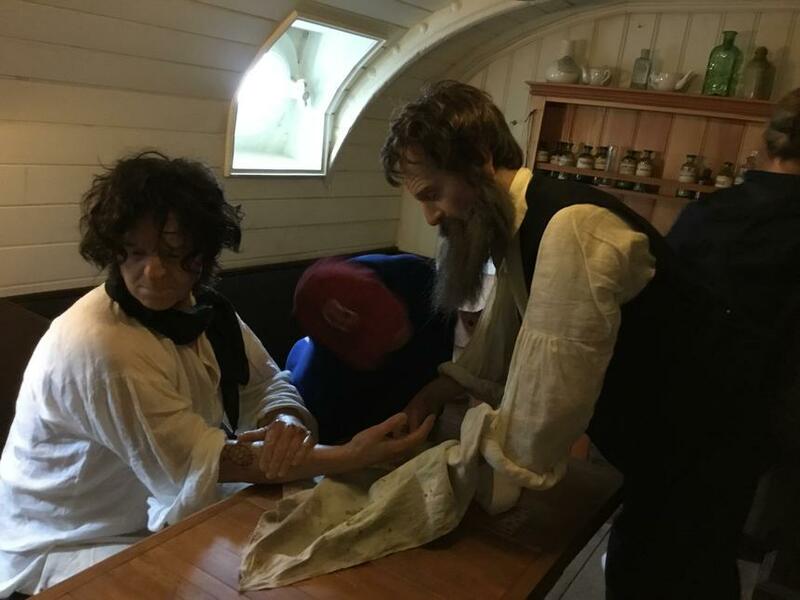 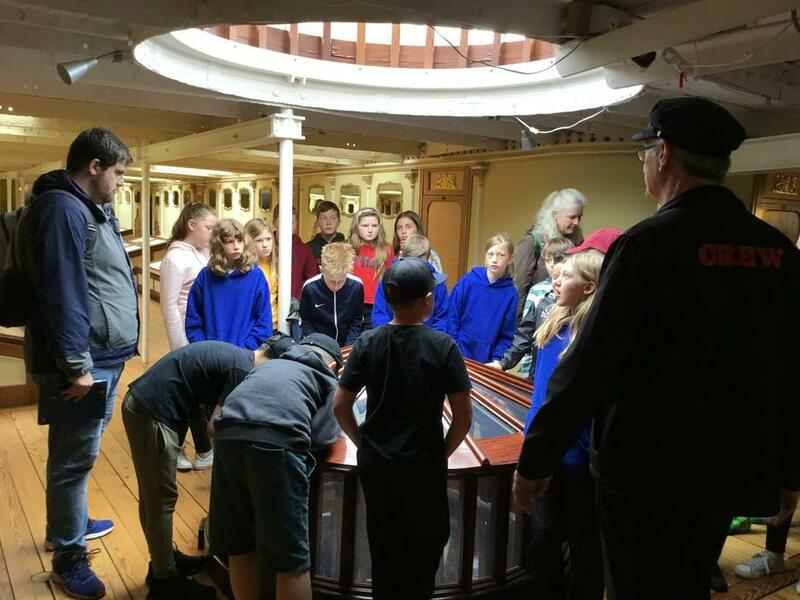 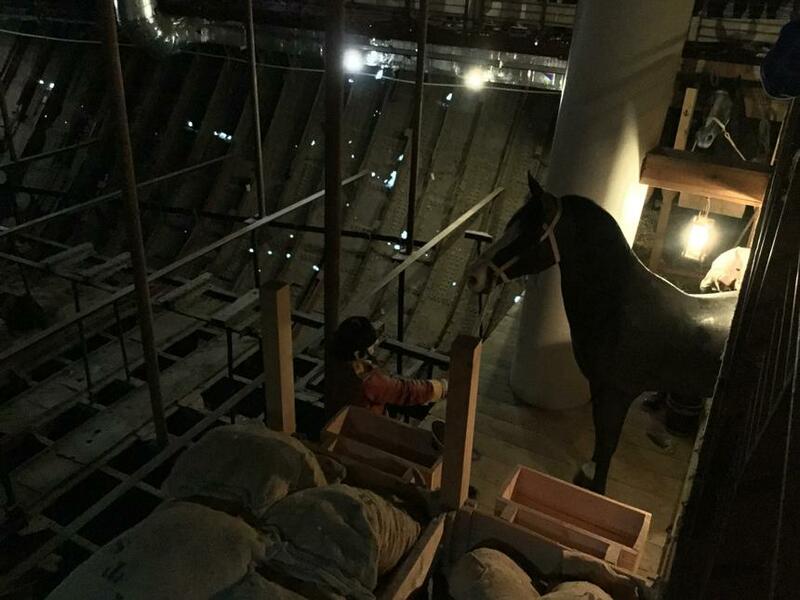 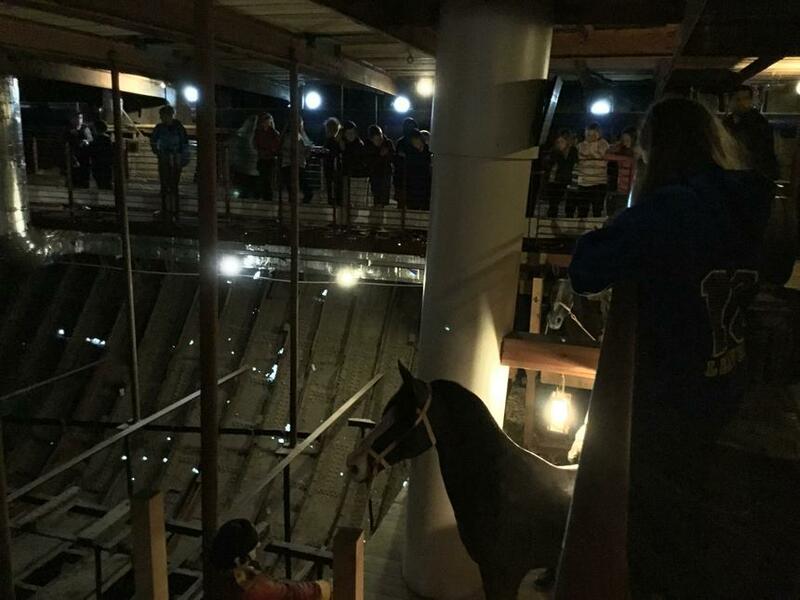 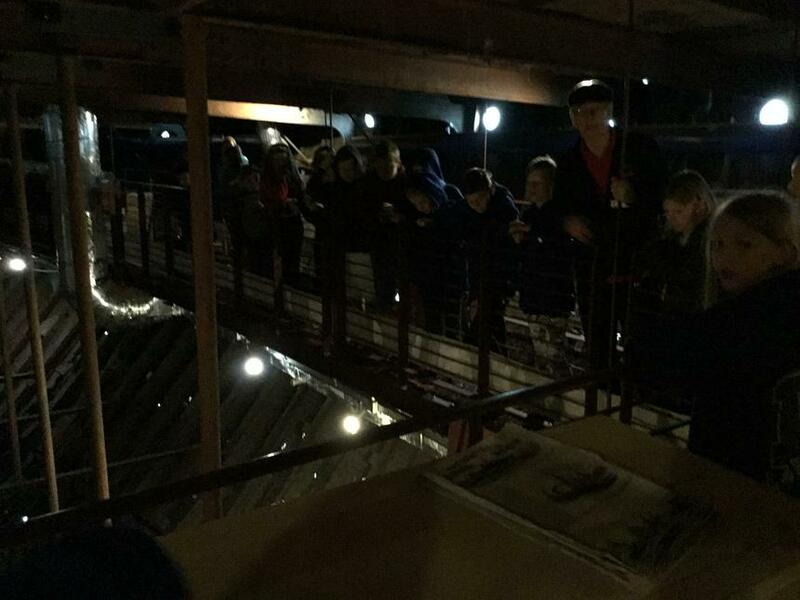 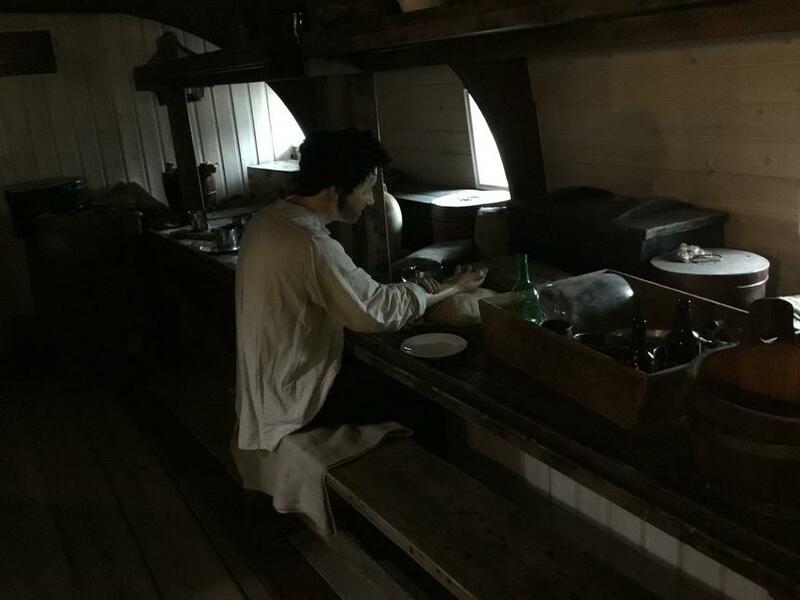 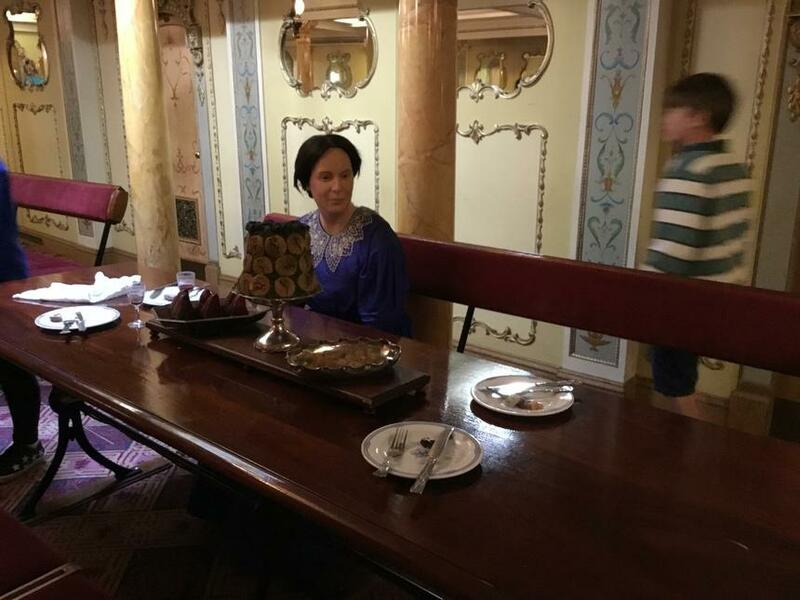 Following this, the chidlren were given a guided tour of the boat, looking in the different rooms and experiencing what it would have been like to be on board the boat when it was sailing. 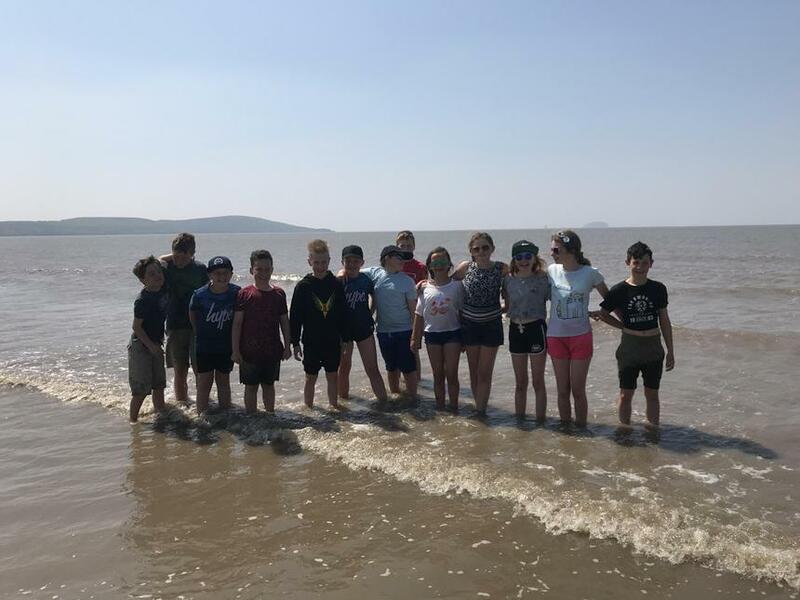 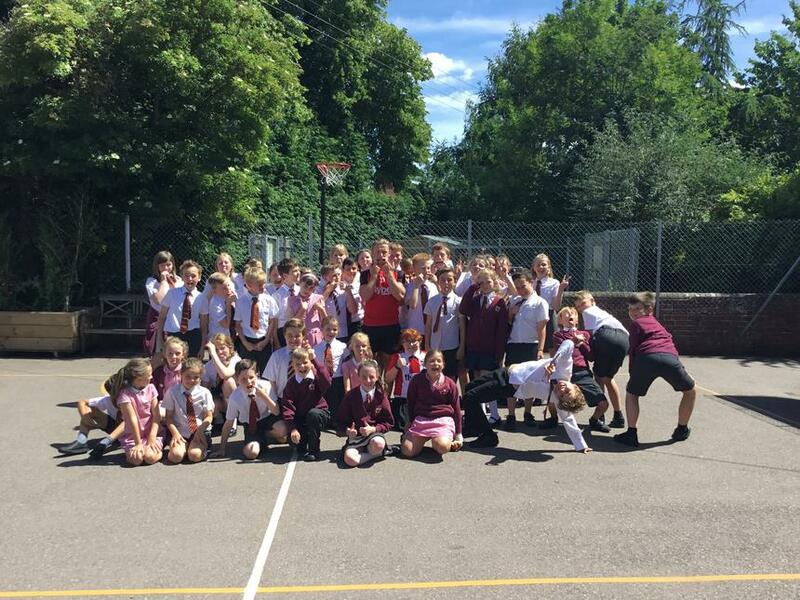 What a fantastic few days we have had as a class! 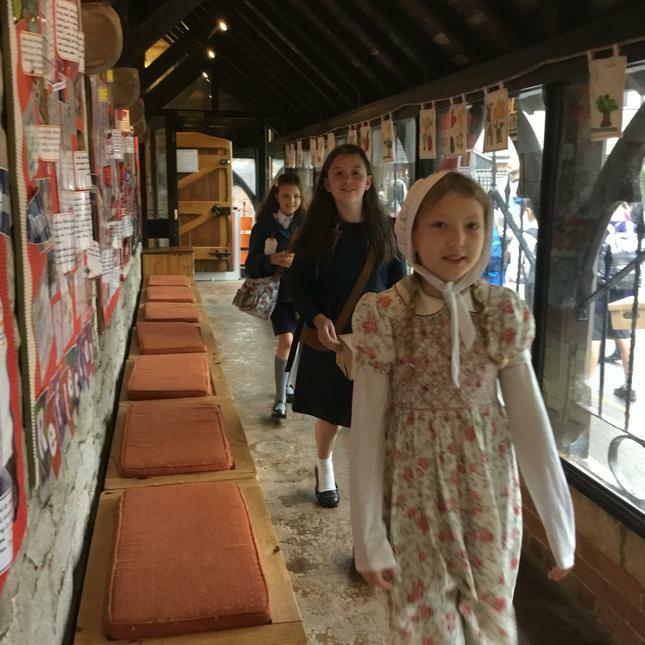 I am sure that the children have made many exciting memories which they will remember in years to come. 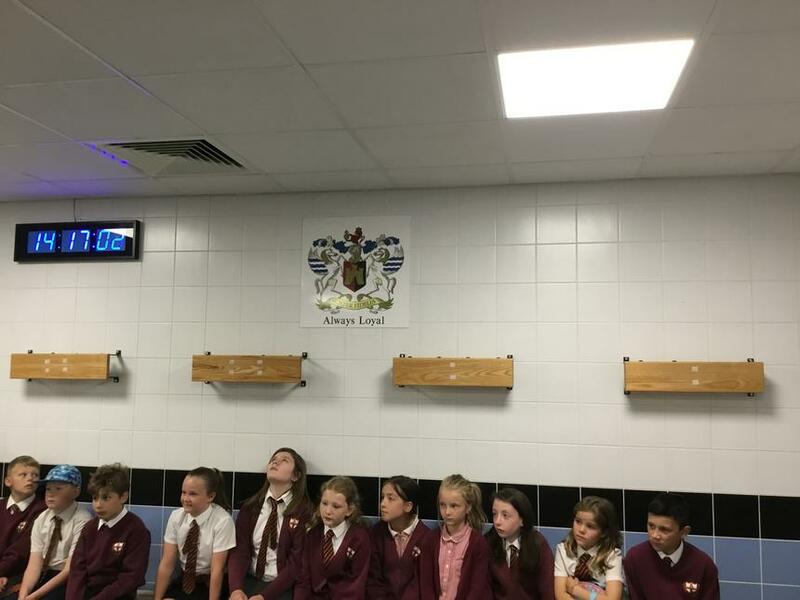 Well done to all the children who have made me feel extremely proud and lucky to have experienced this with them! 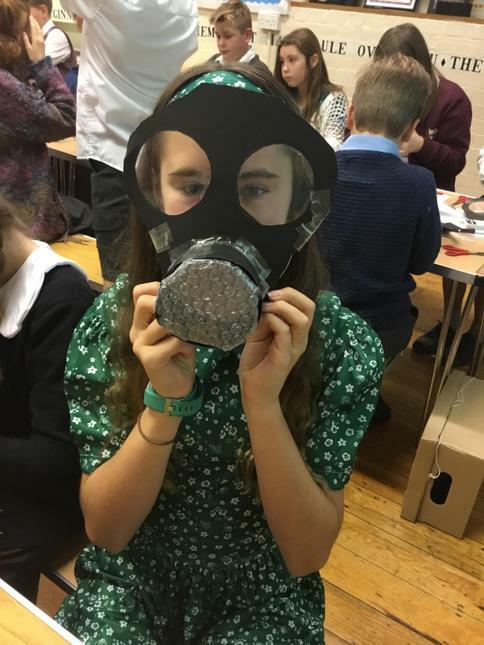 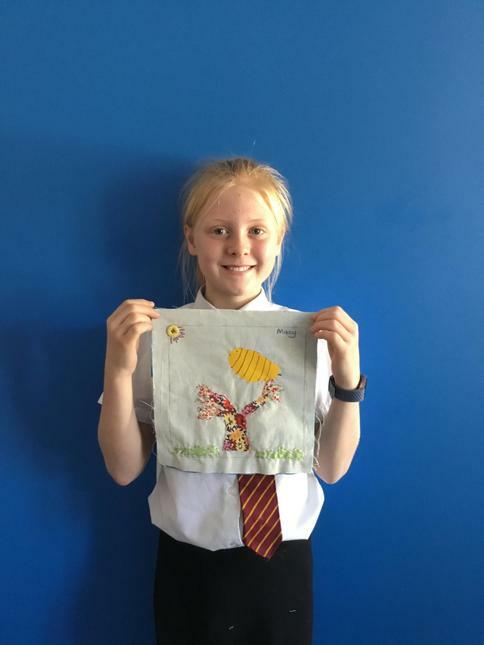 A huge well done to Olivia for also taking part in a sponsored silence at home on Sunday. 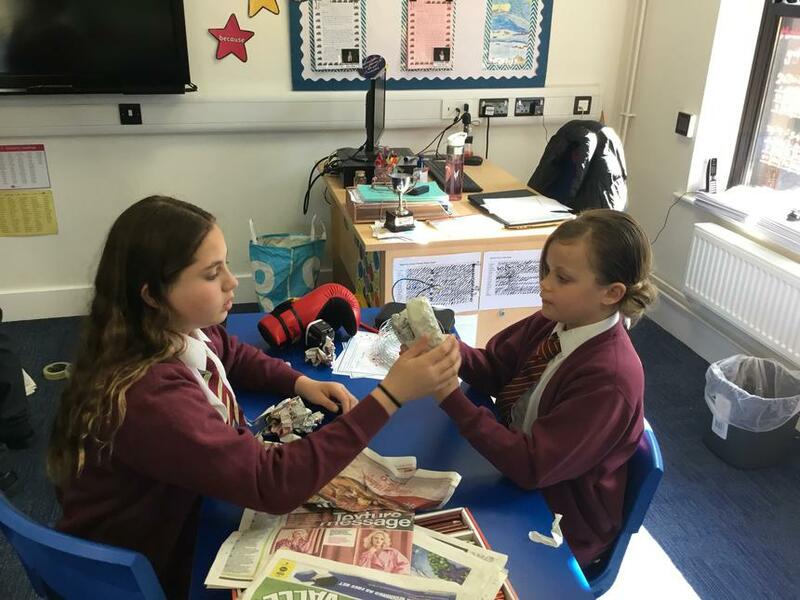 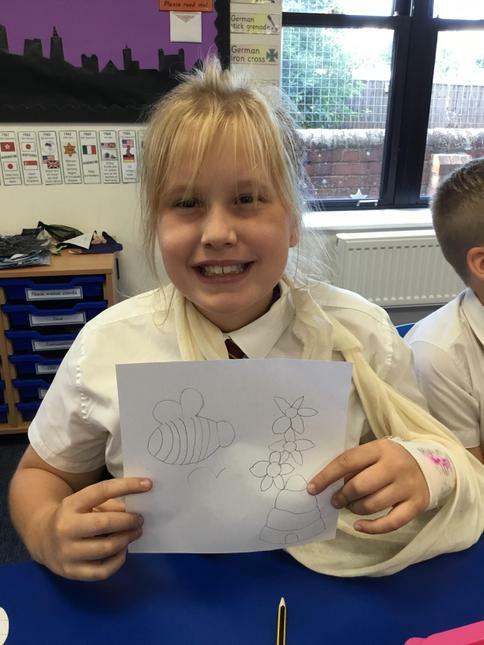 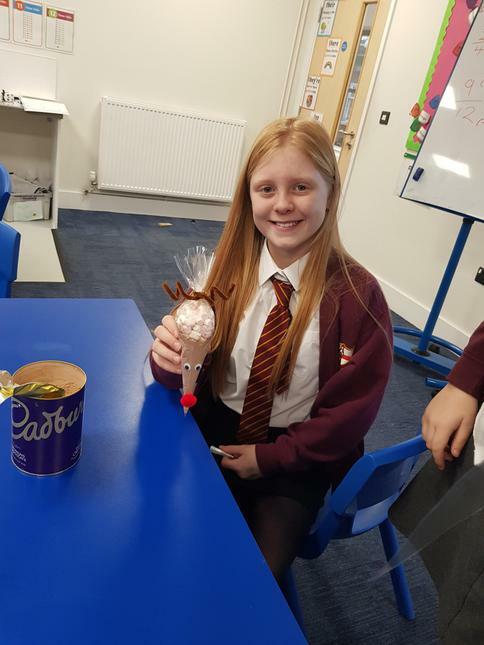 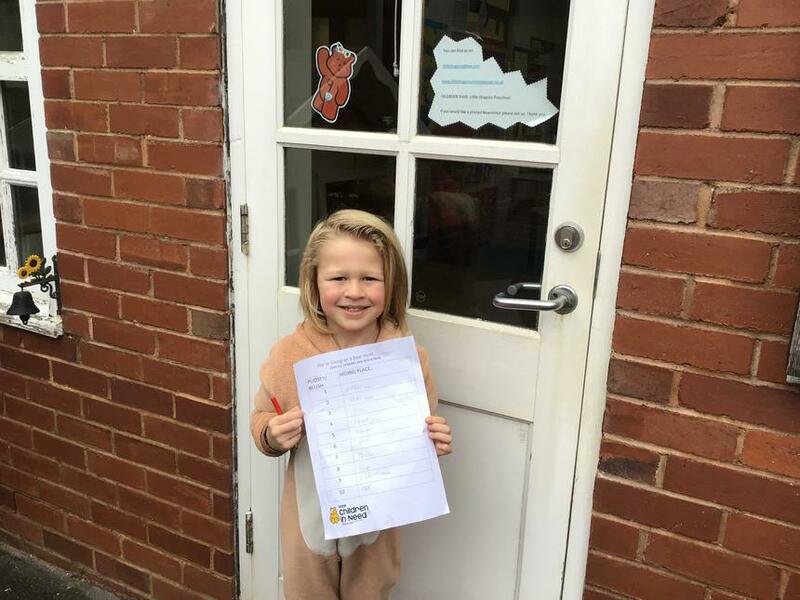 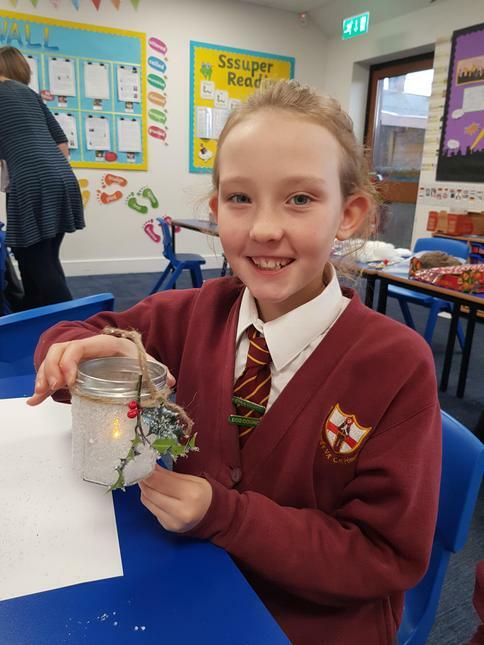 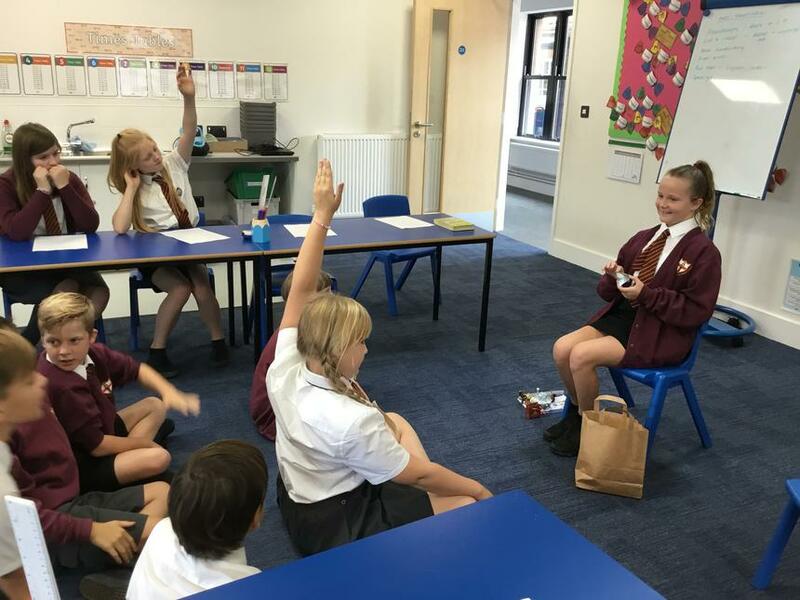 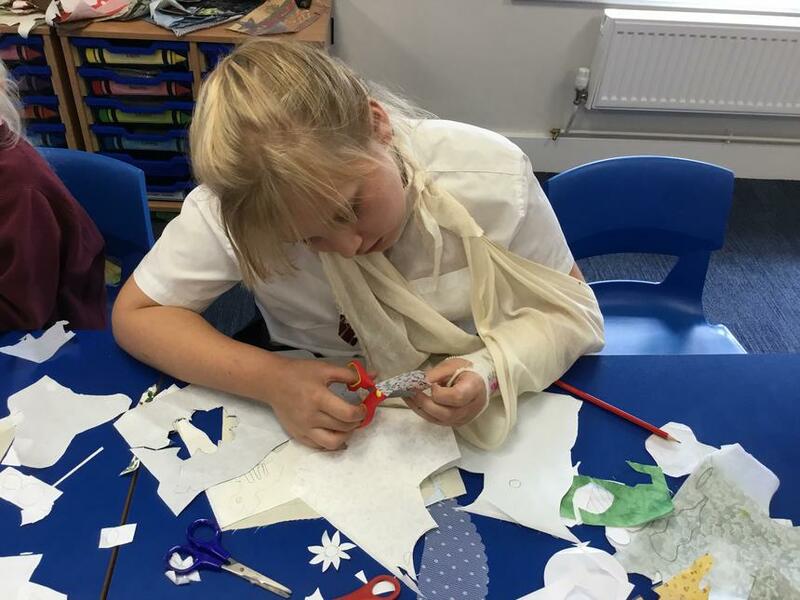 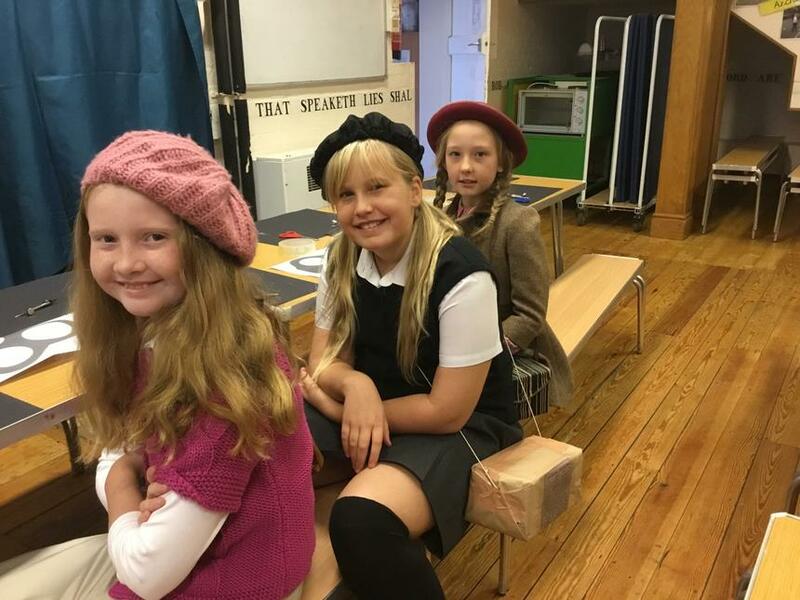 She (somehow) managed to stay quiet for the whole day, raising a further £220 for The Brittle Bones Society - well done Olivia! 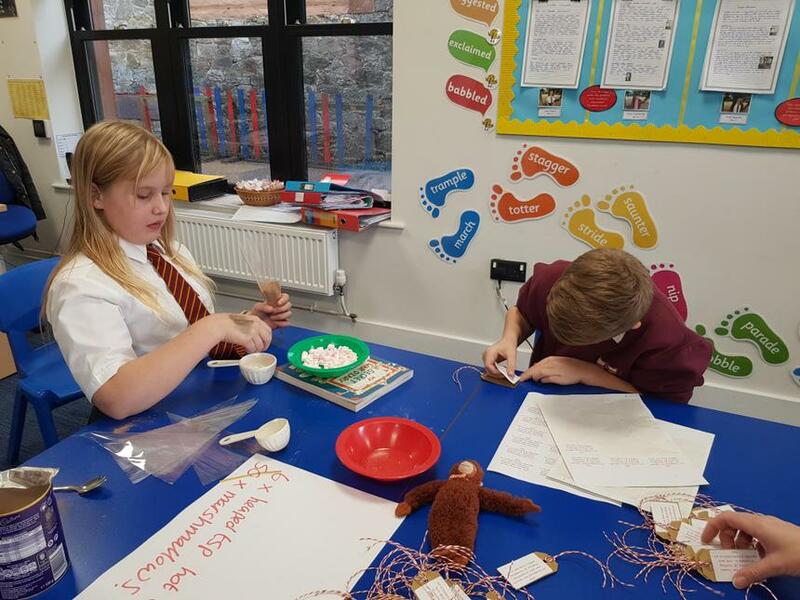 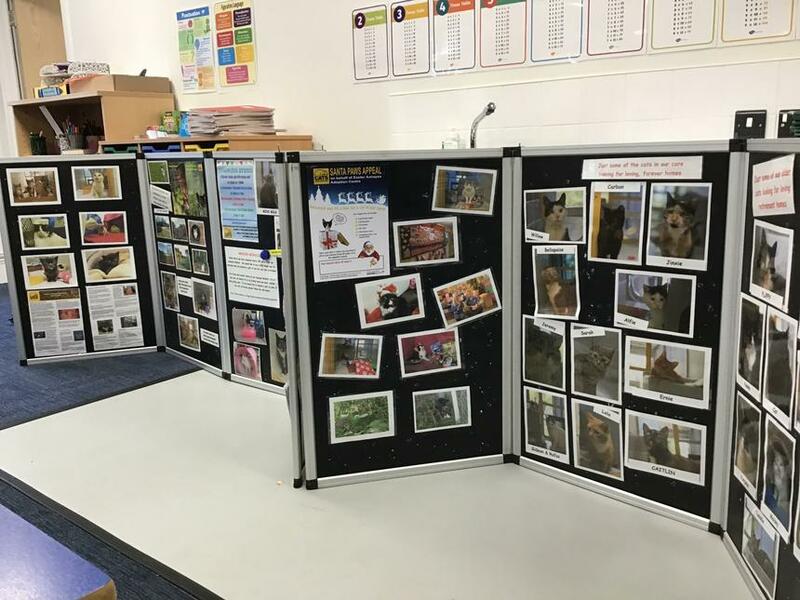 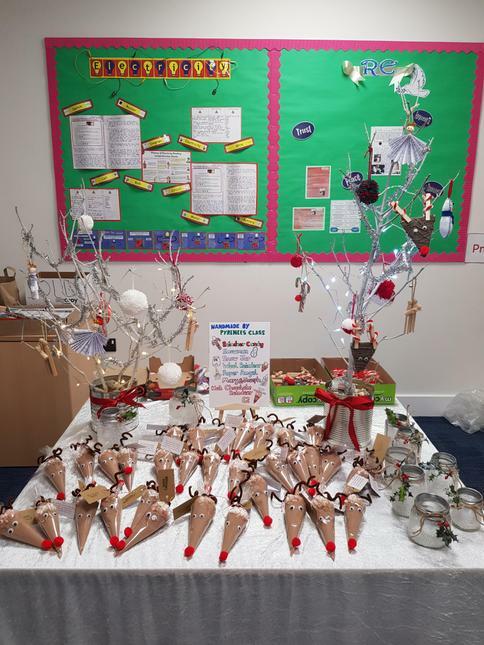 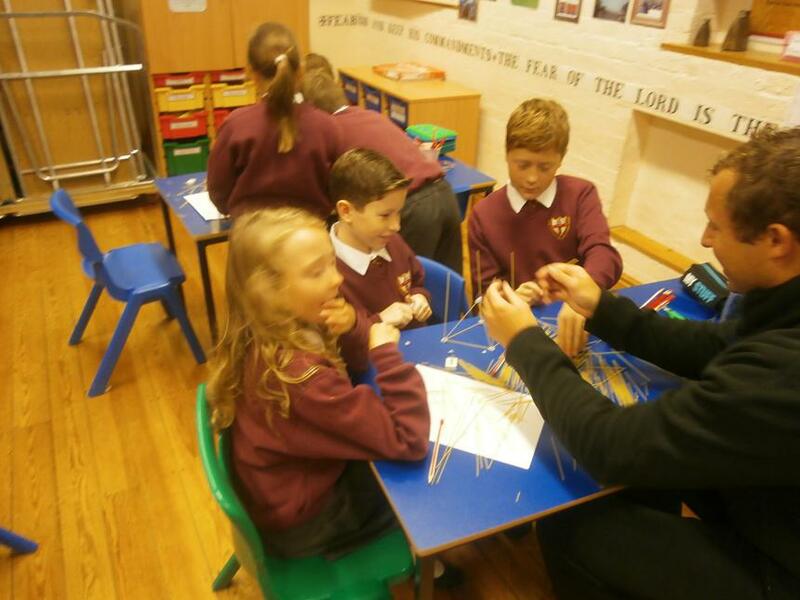 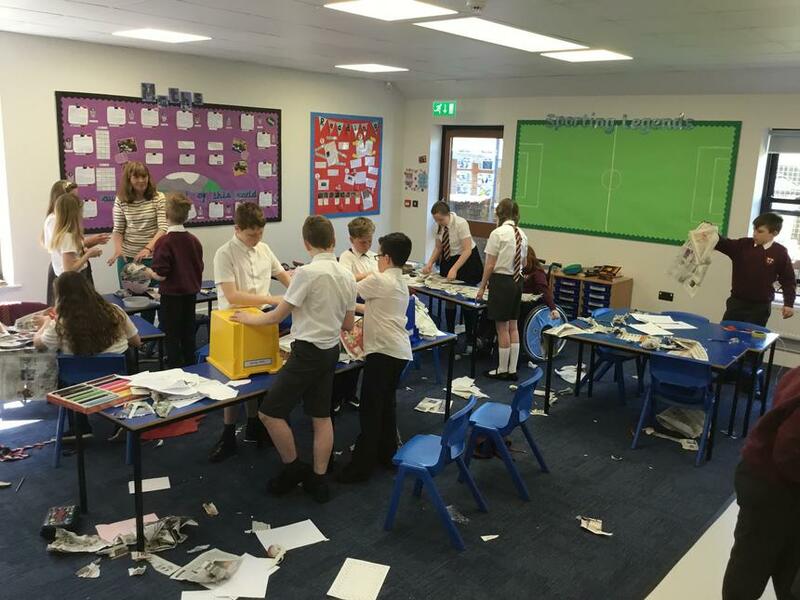 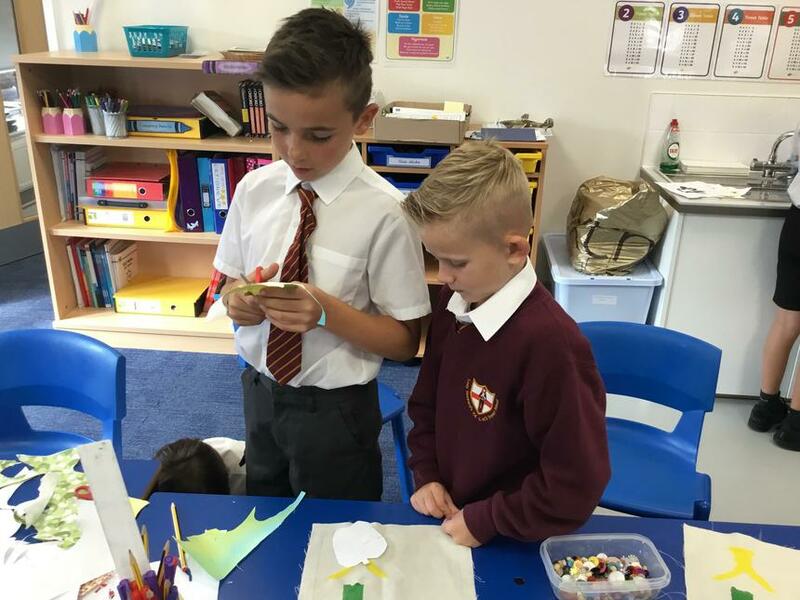 Class 4 started their new topic on Tuesday and have been very busy creating their new display. 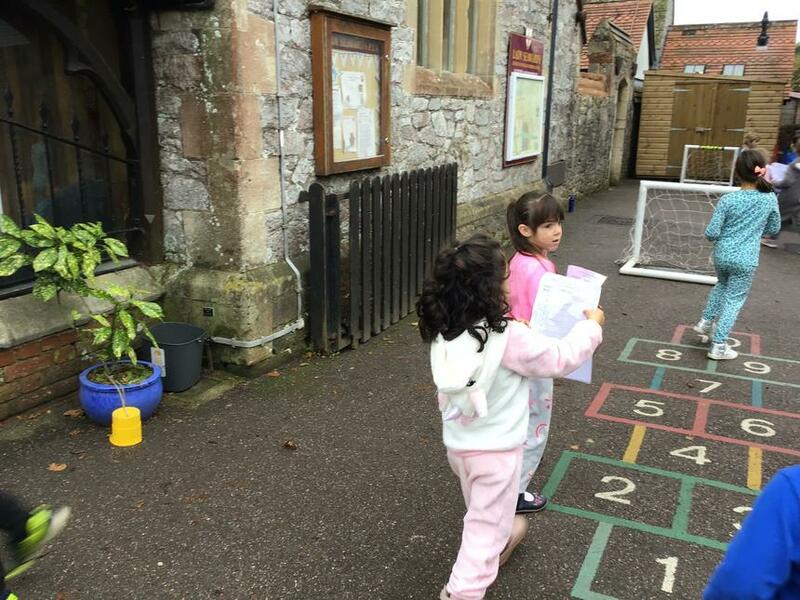 The children got into groups and researched different sports equipment. 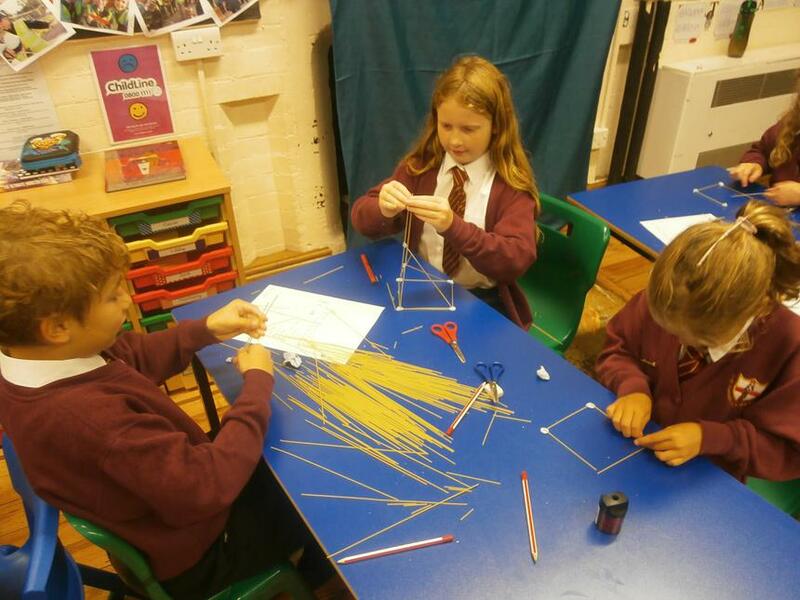 They then designed and created life-sized objects using a variety of materials. 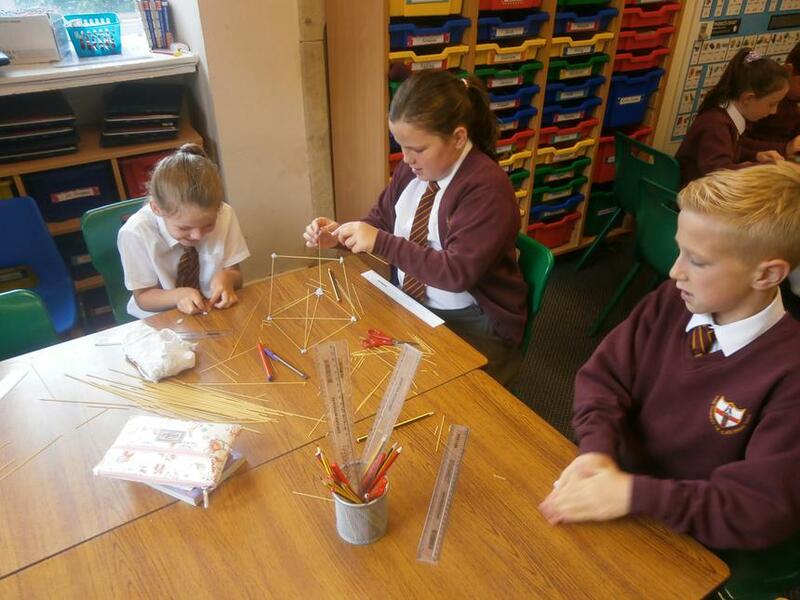 Some children created their models from wire while others used papier mache to create a sturdy structure. 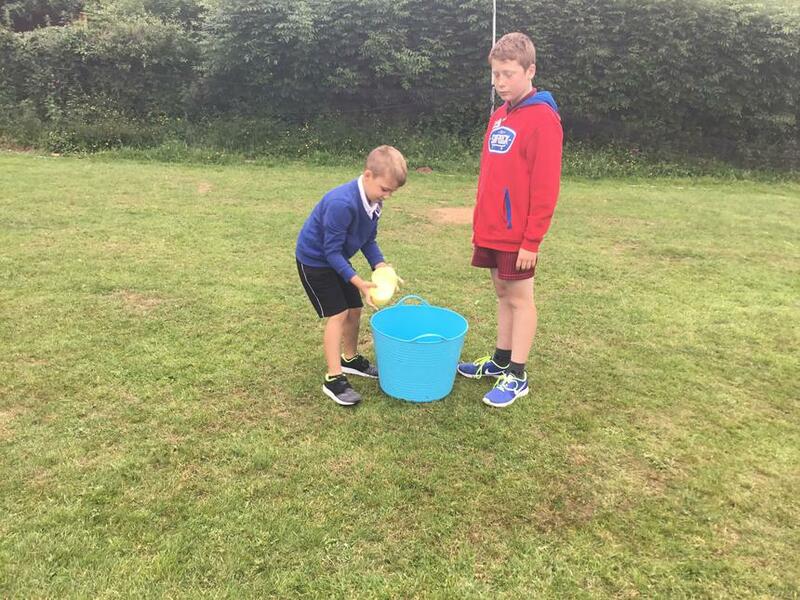 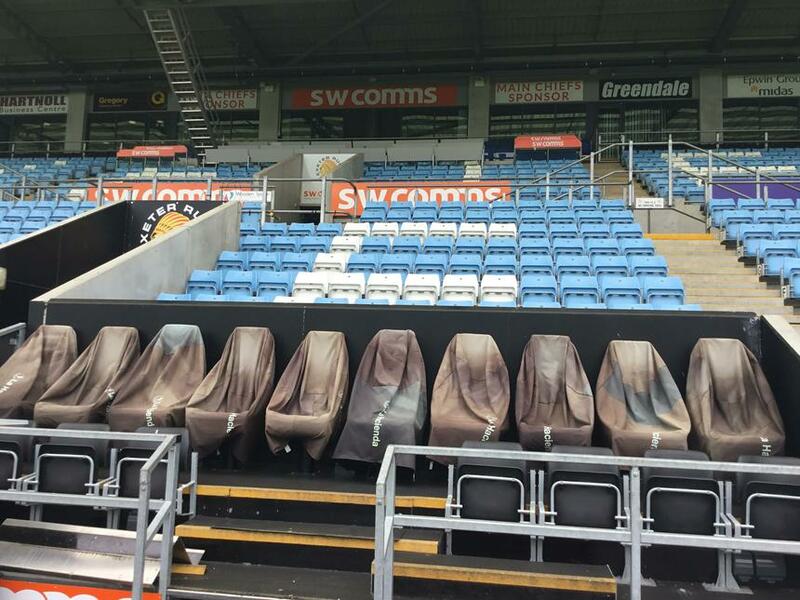 We are painting our equipment next week... stay tuned to see the finished products! 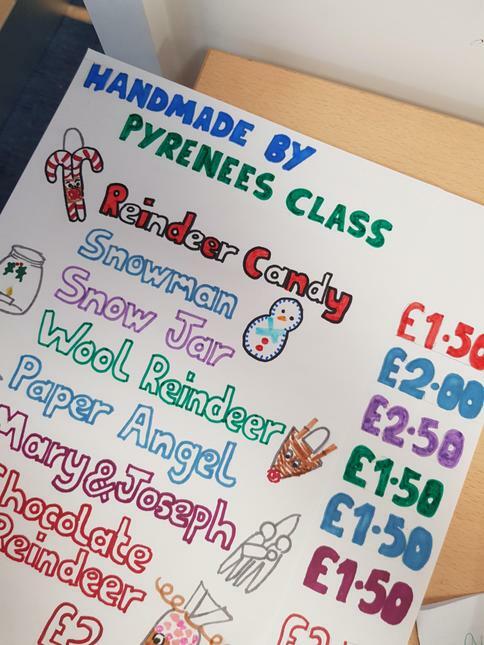 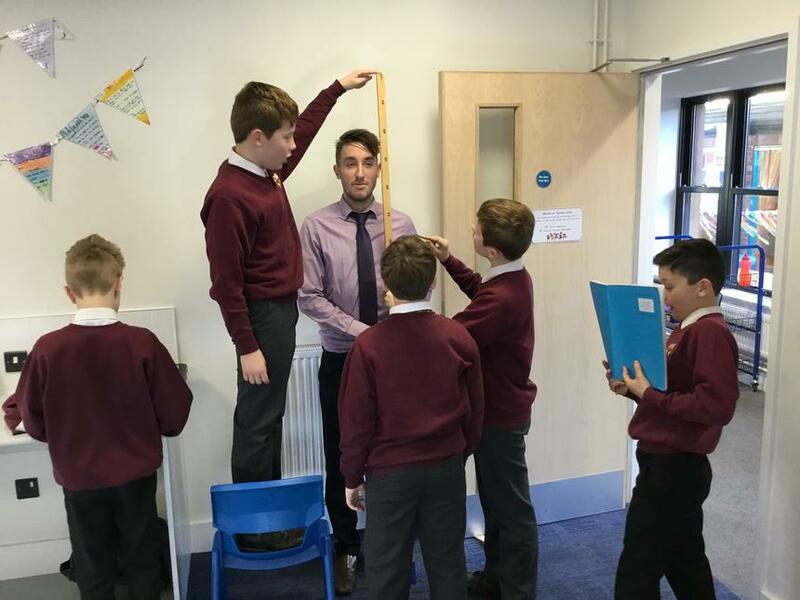 Pyrenees Class maths focus over the last couple of weeks has been measurement. 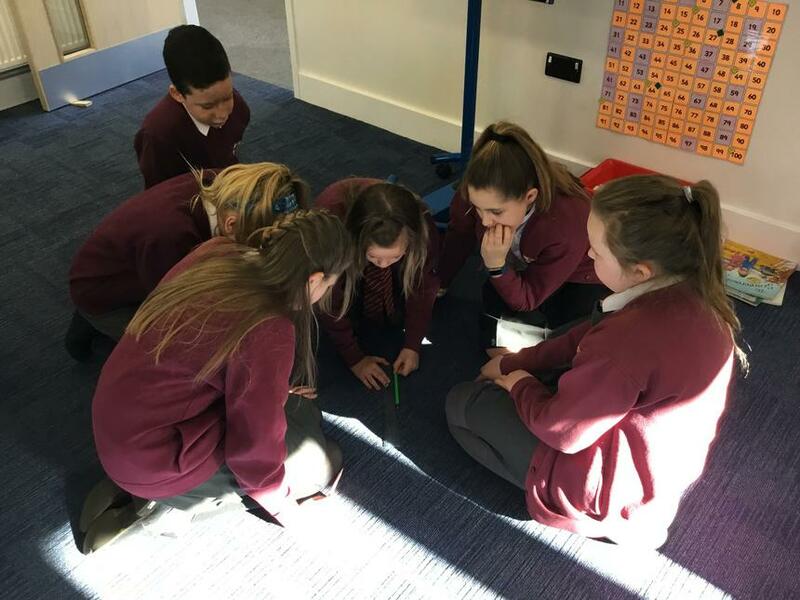 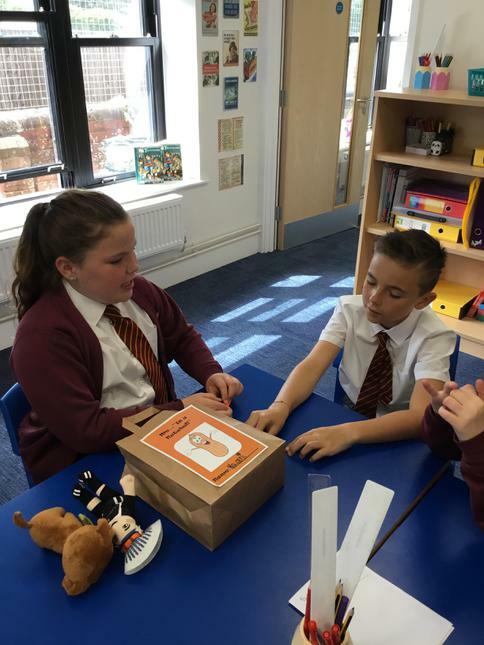 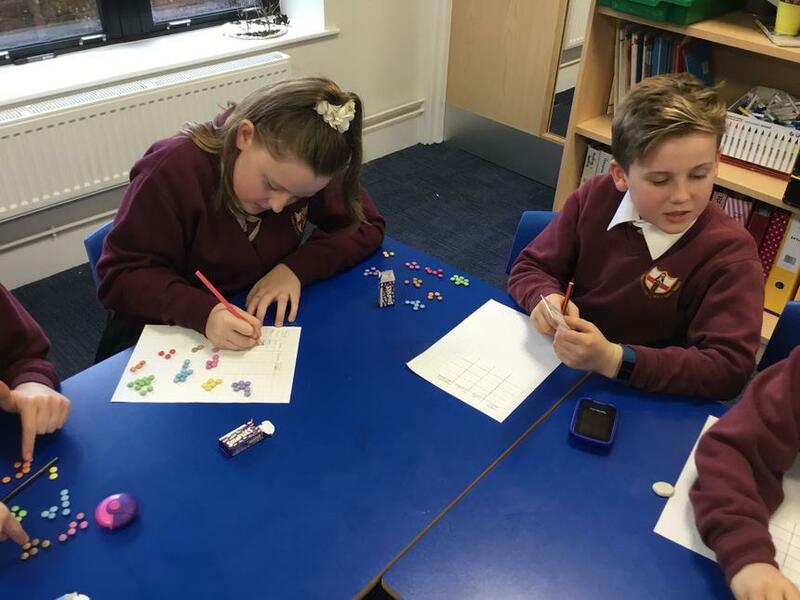 The children have been choosing appropriate units of measure, estimating and calculating using these measures as well as converting metric measures using their multiplication and division knowledge. 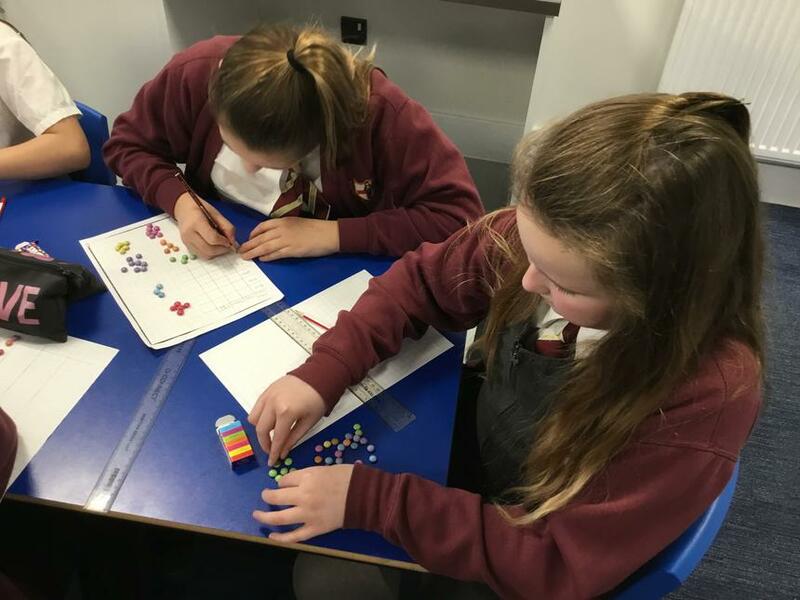 In addition to this, the children have been looking at converting miles and km, looking specifically at methods to calculate this conversion. 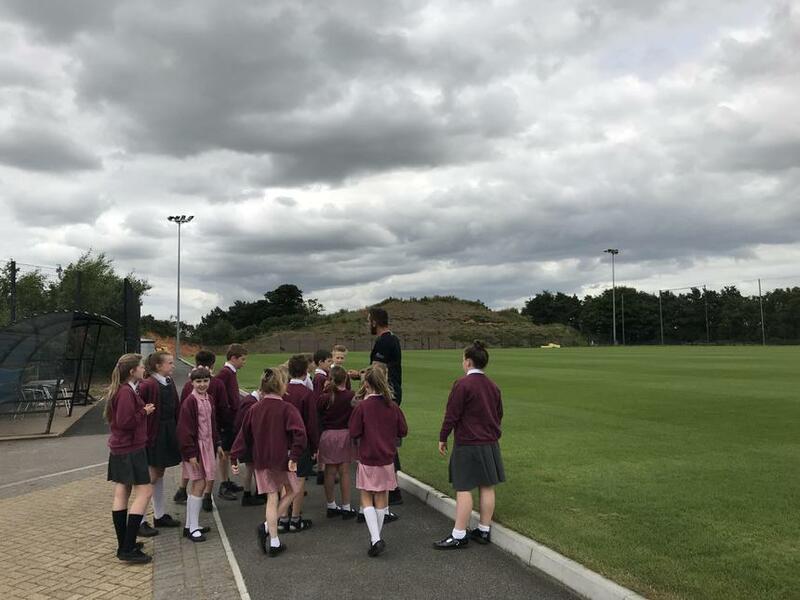 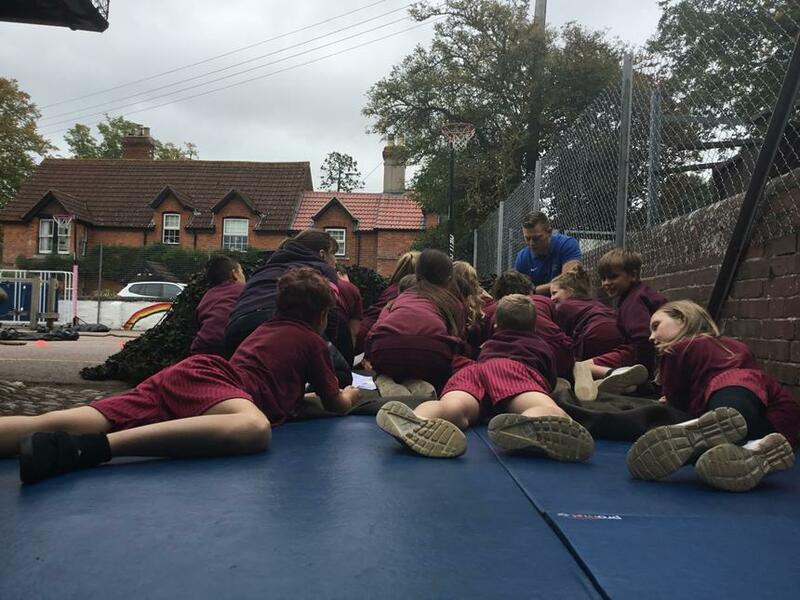 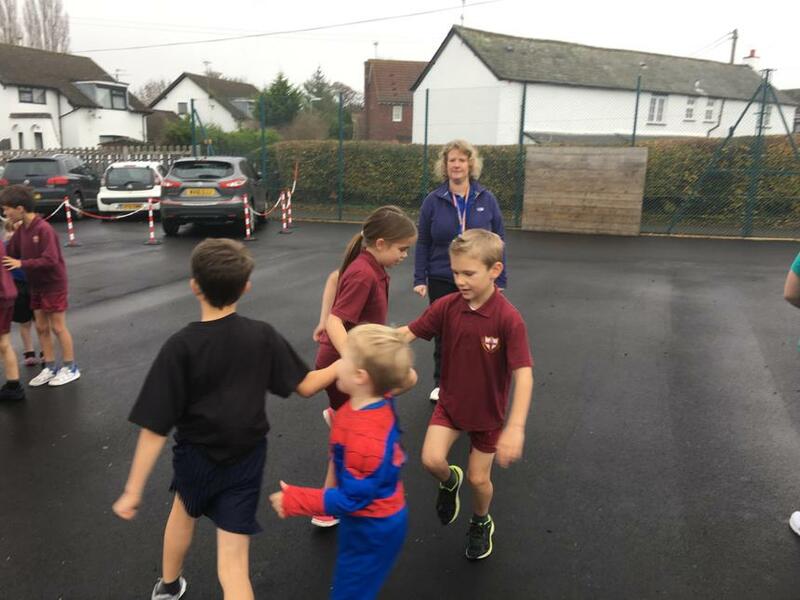 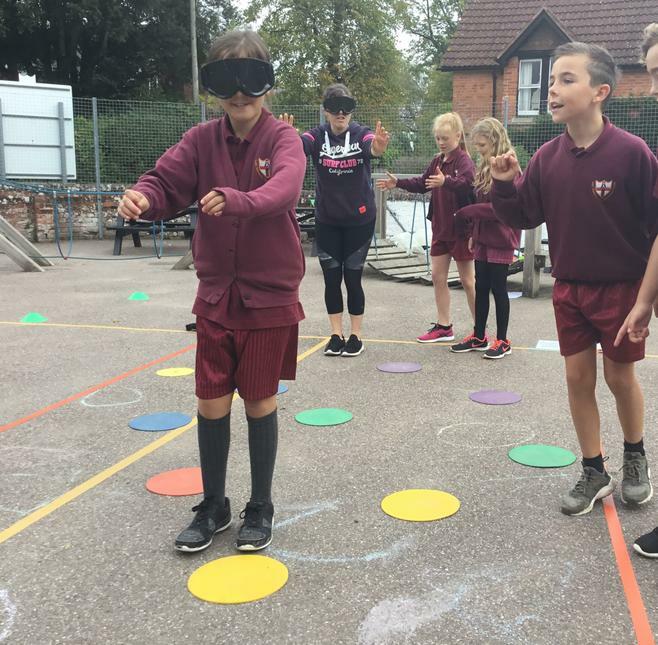 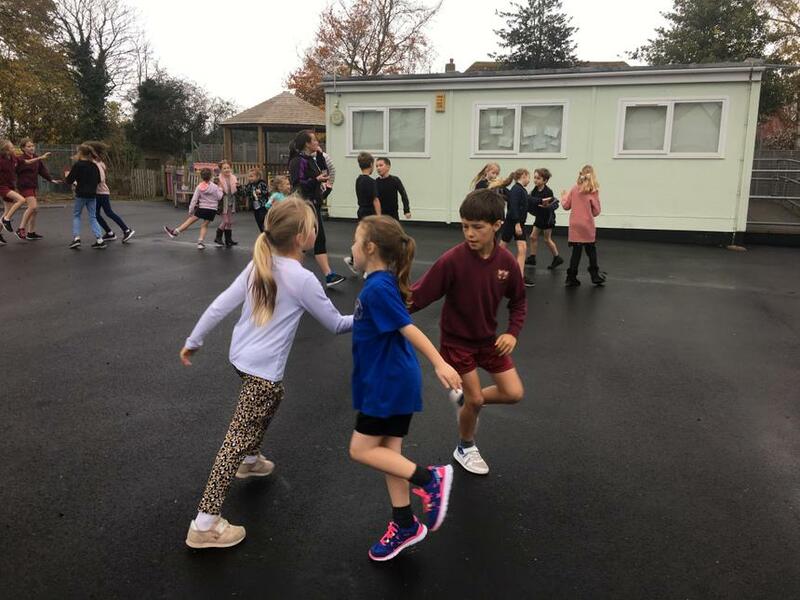 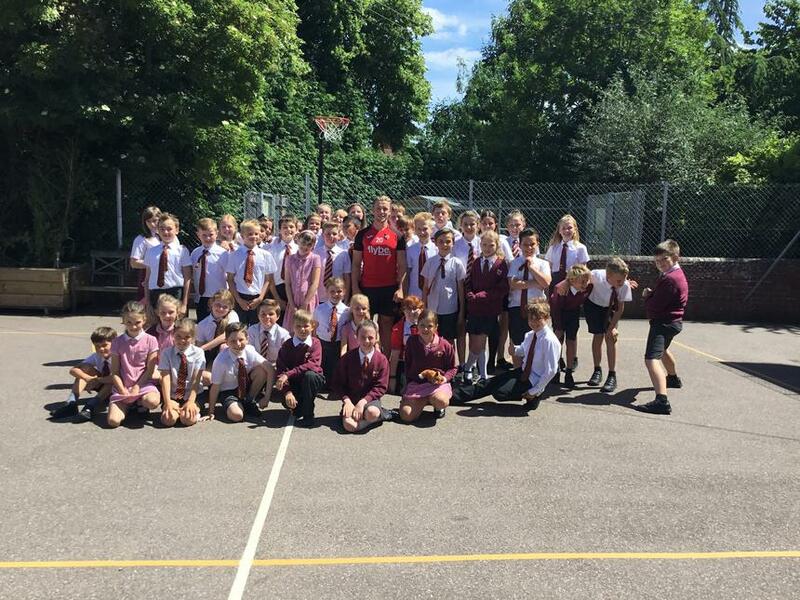 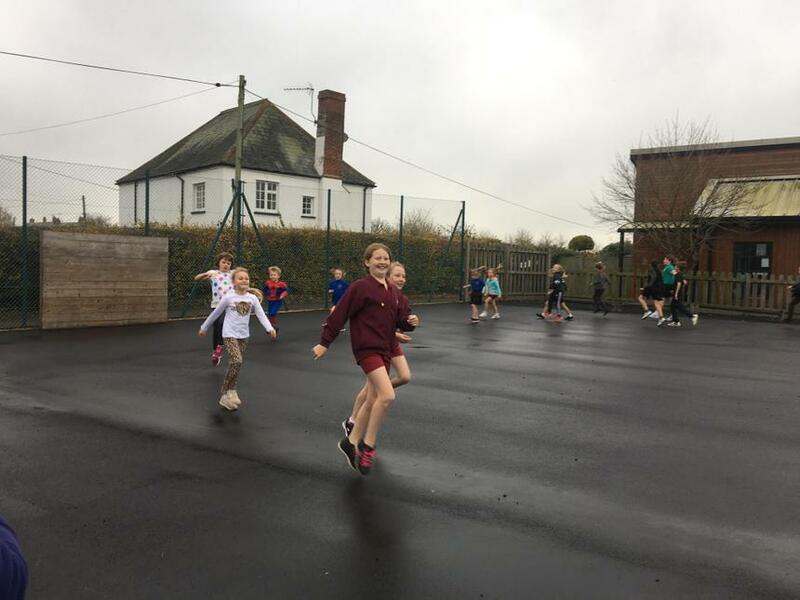 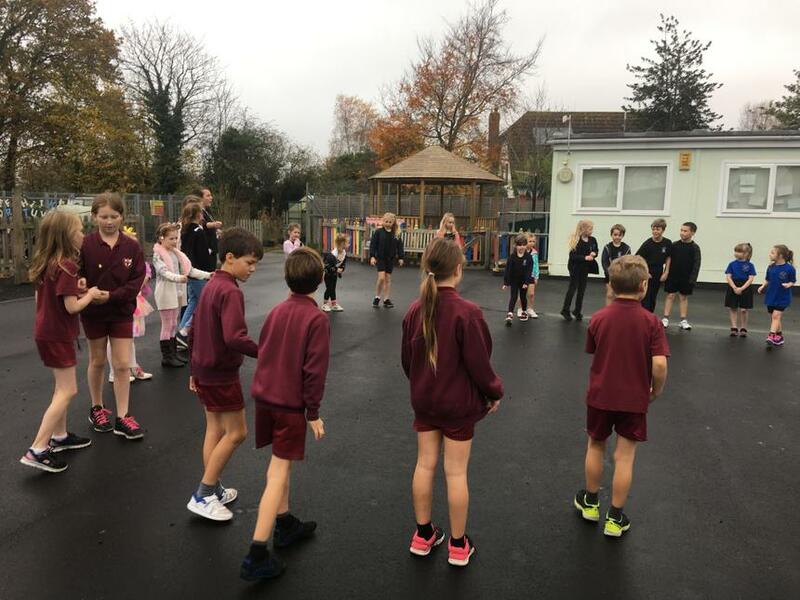 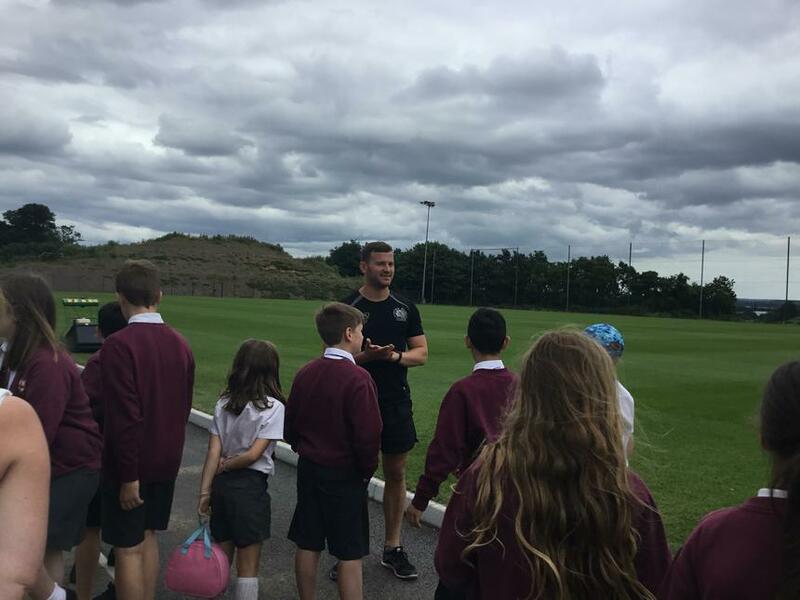 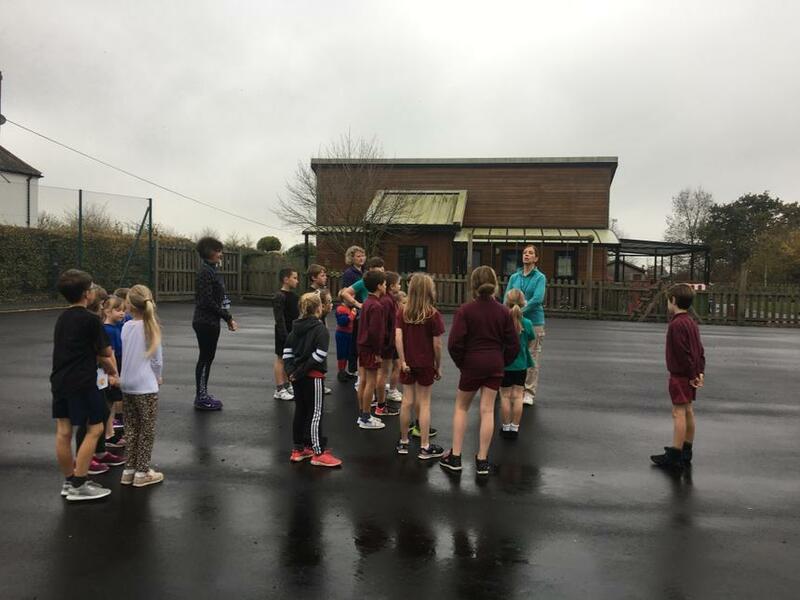 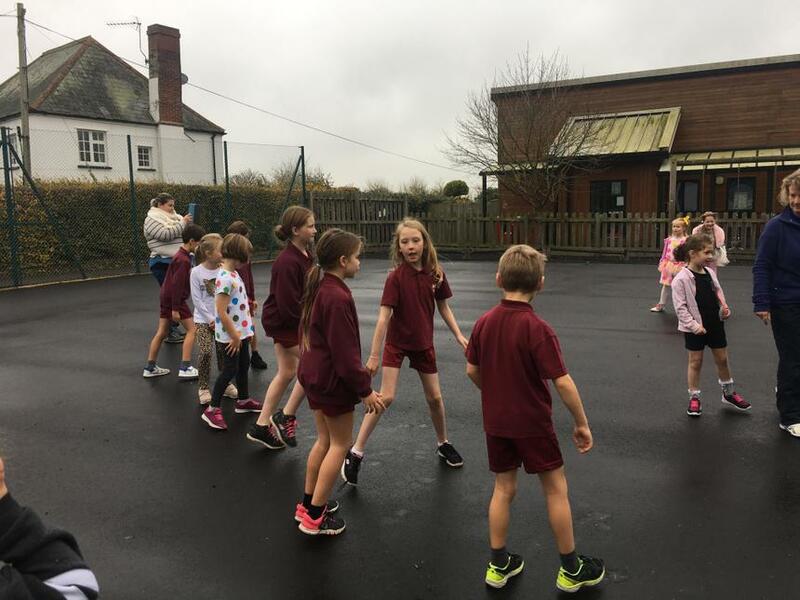 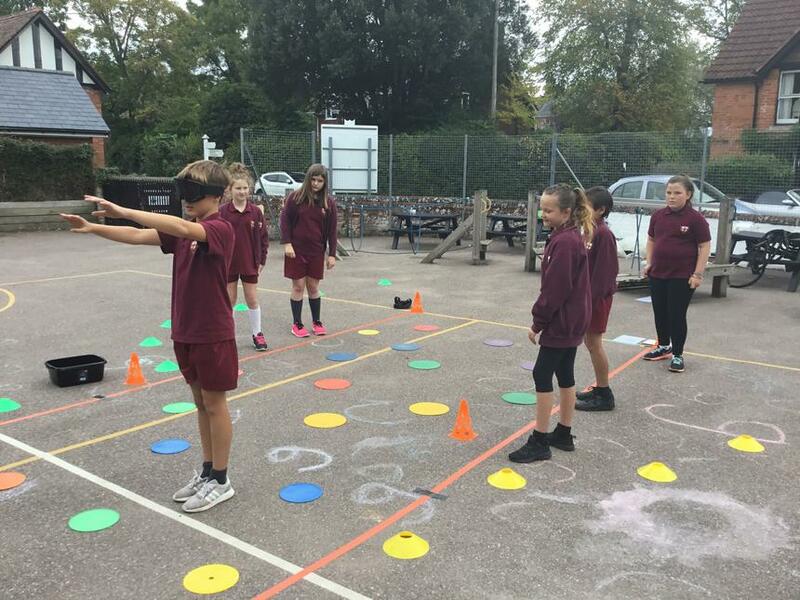 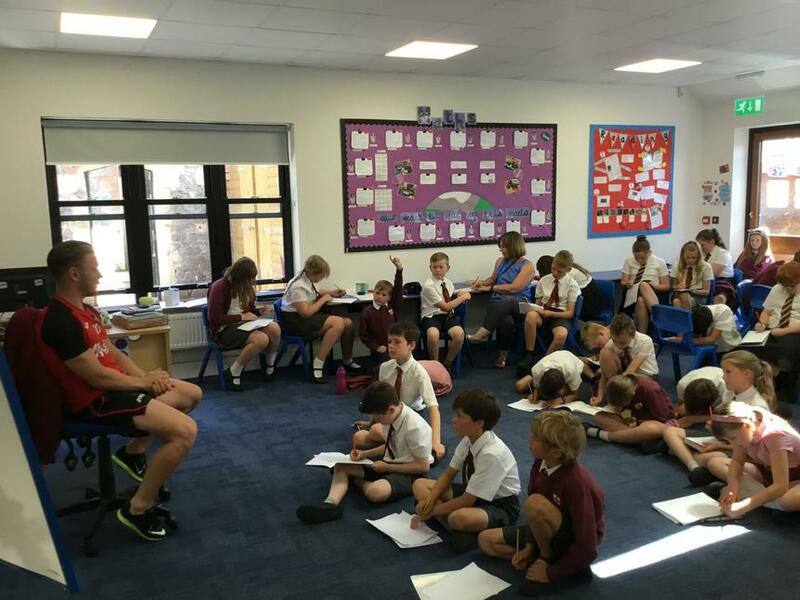 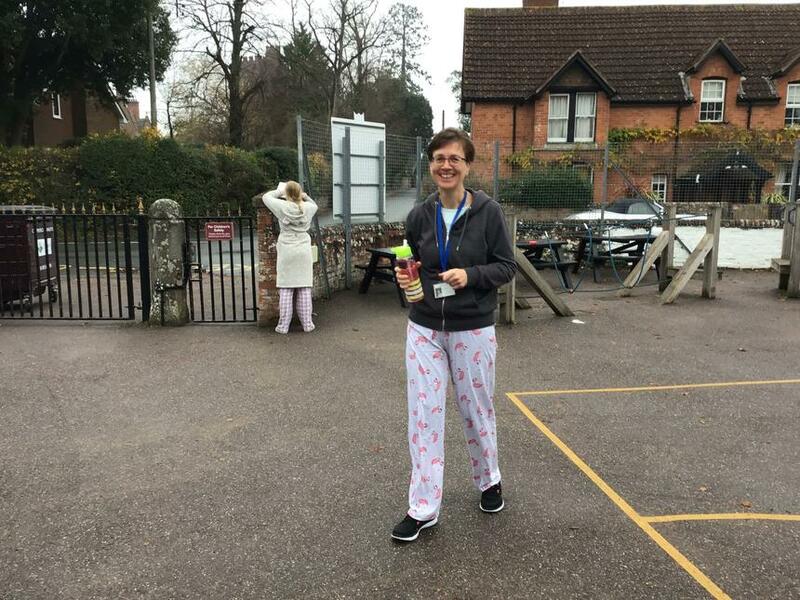 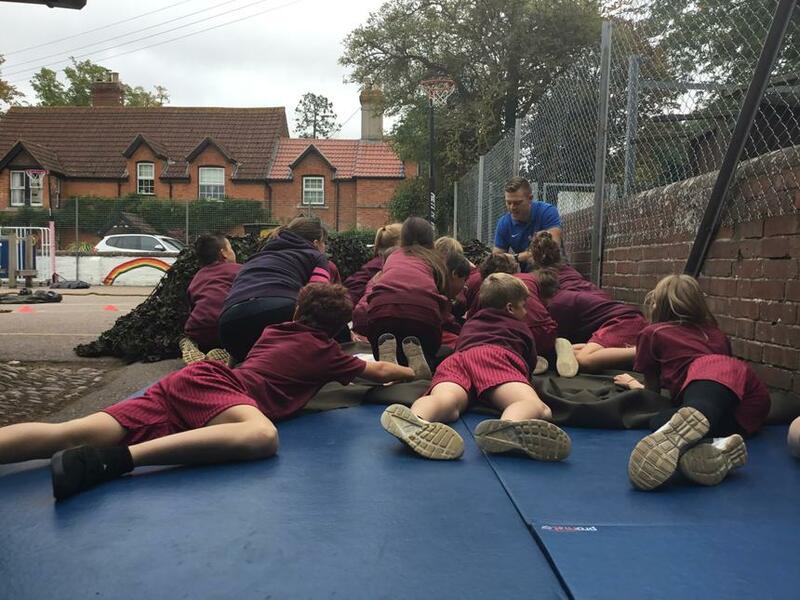 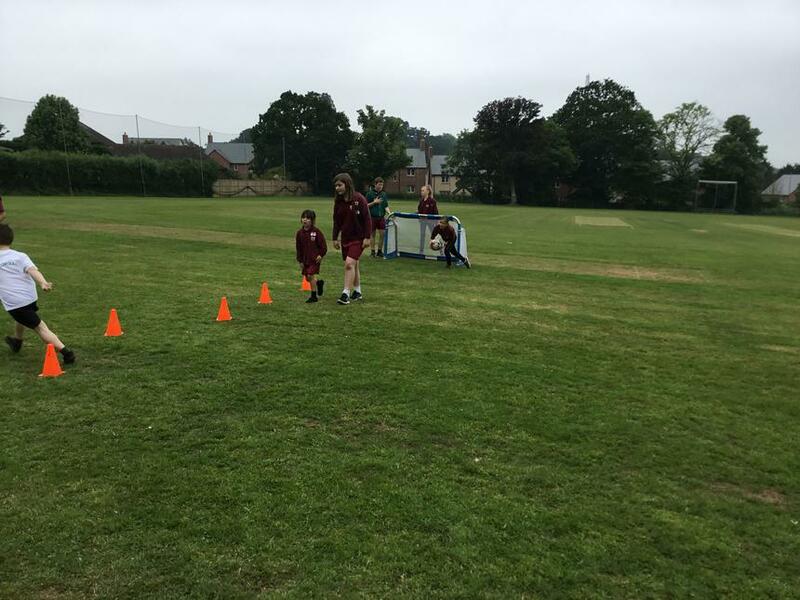 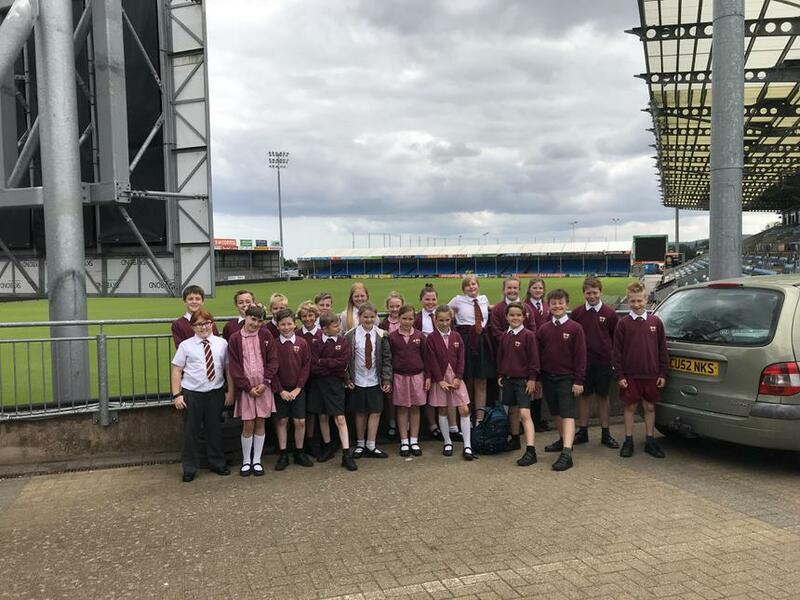 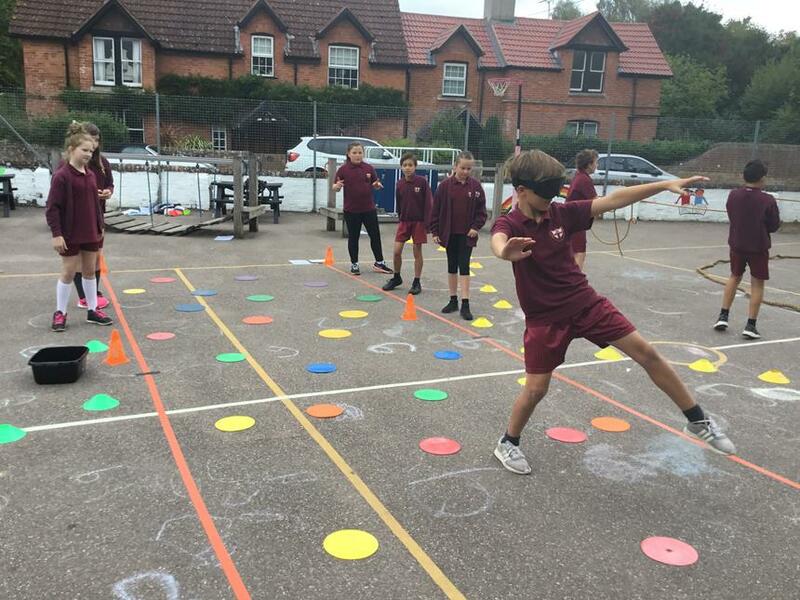 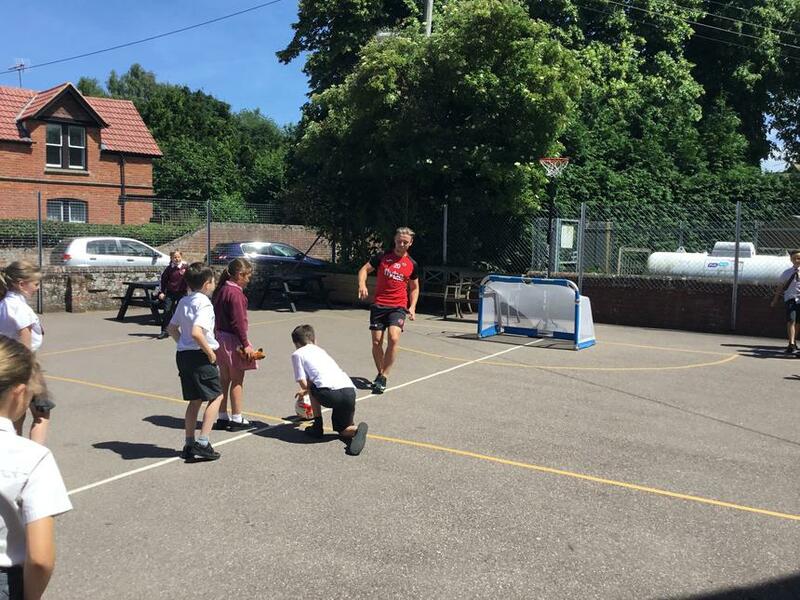 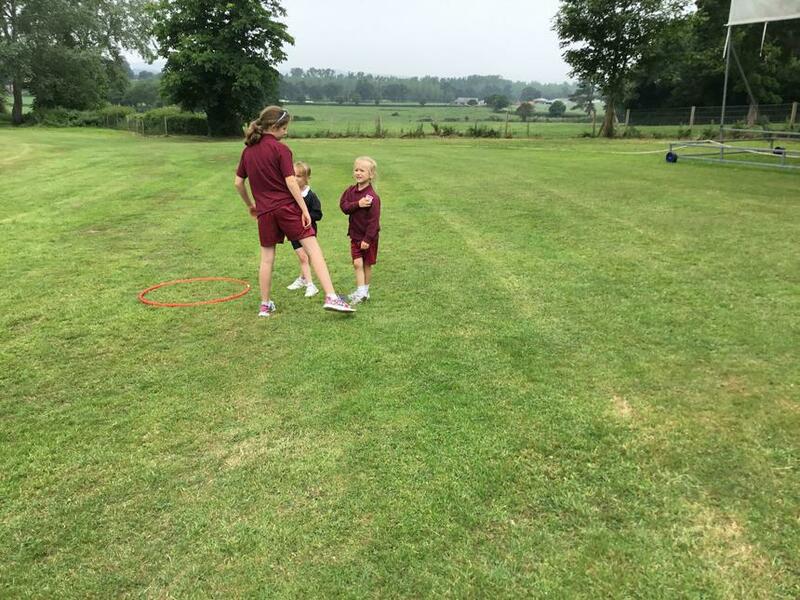 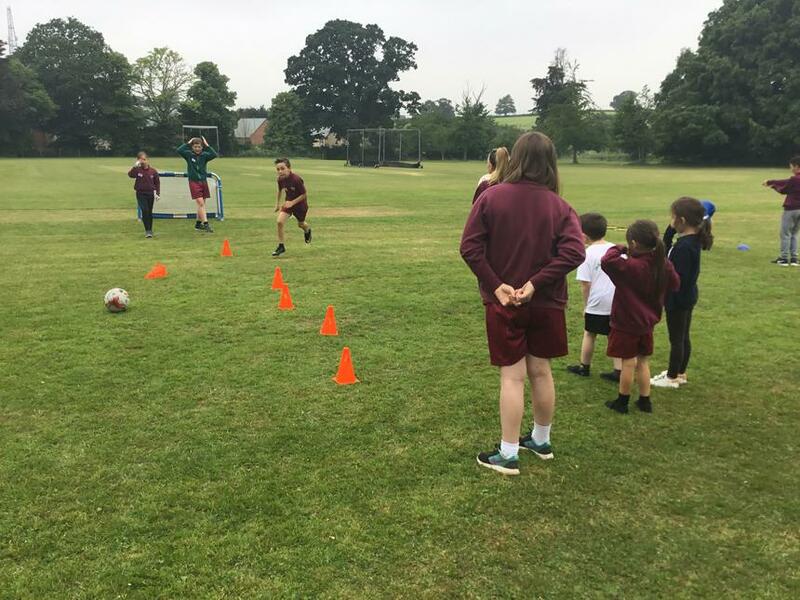 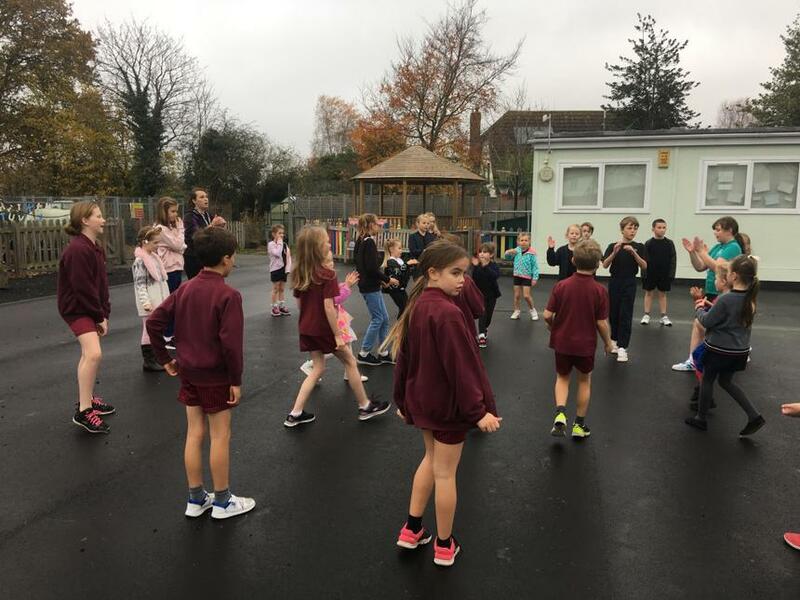 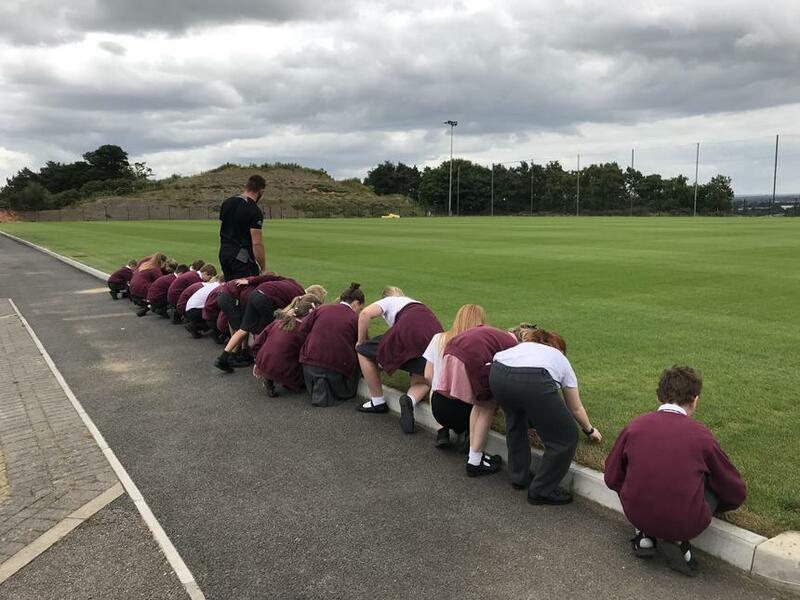 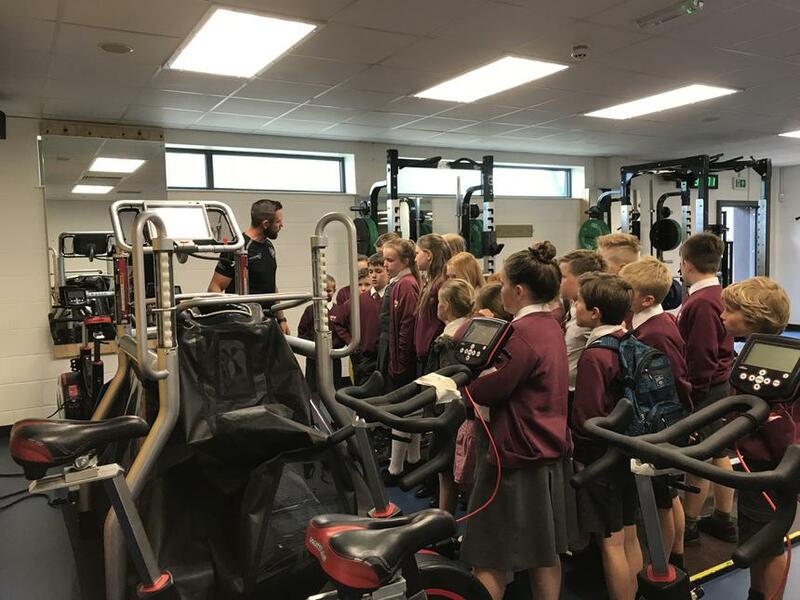 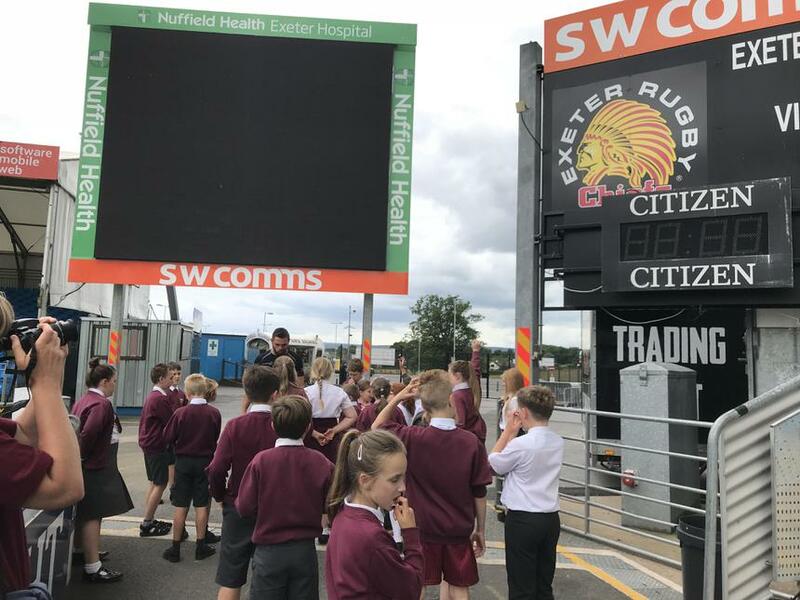 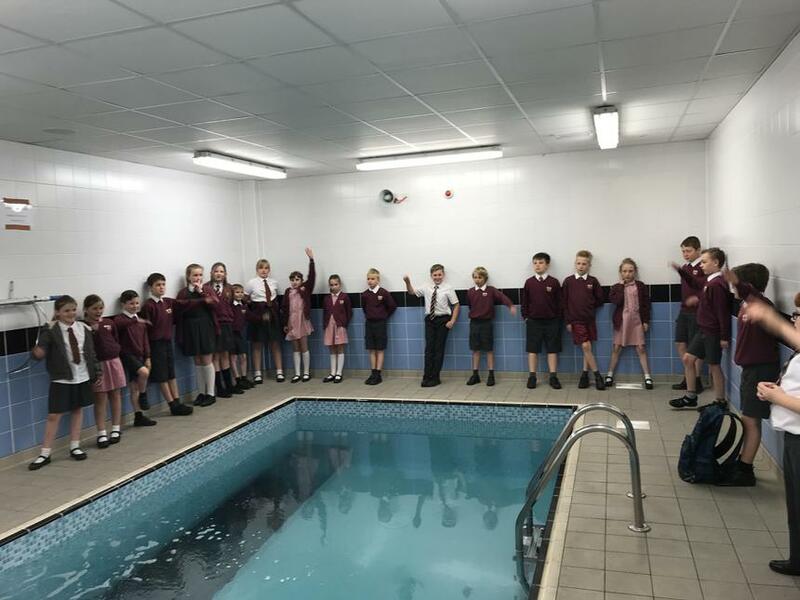 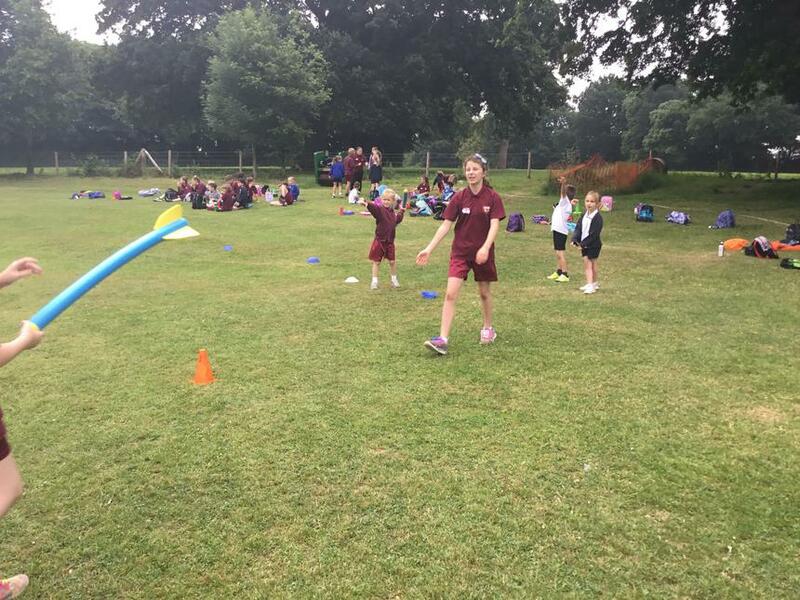 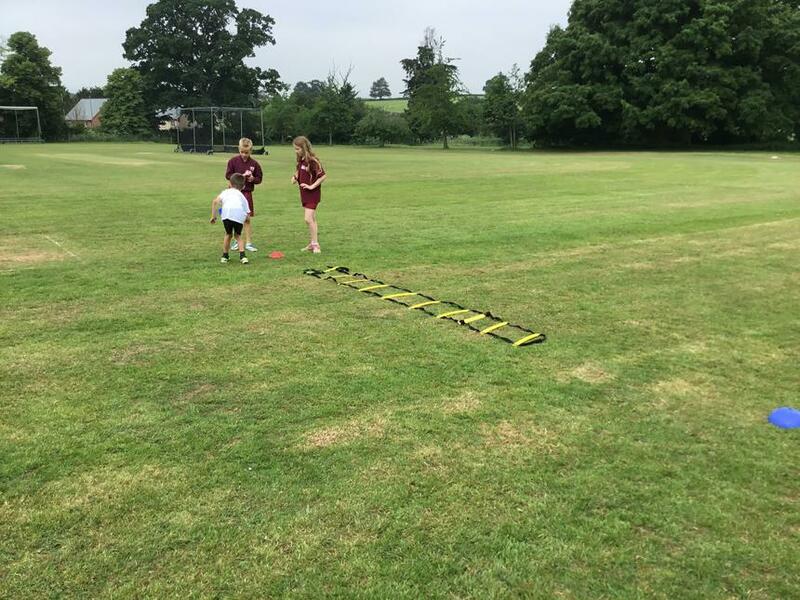 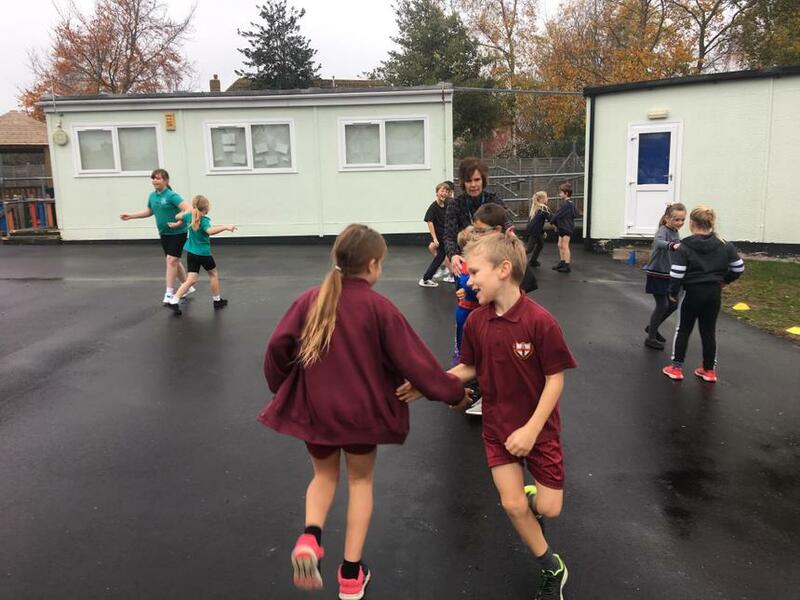 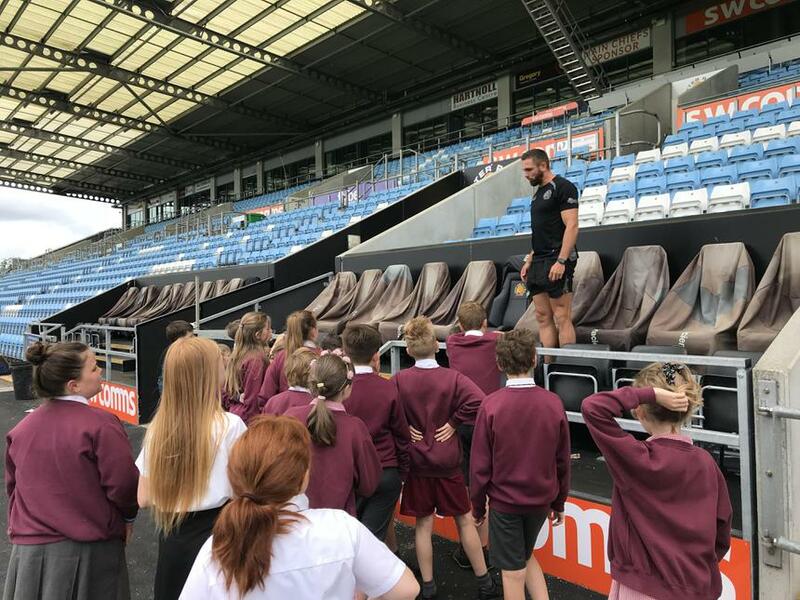 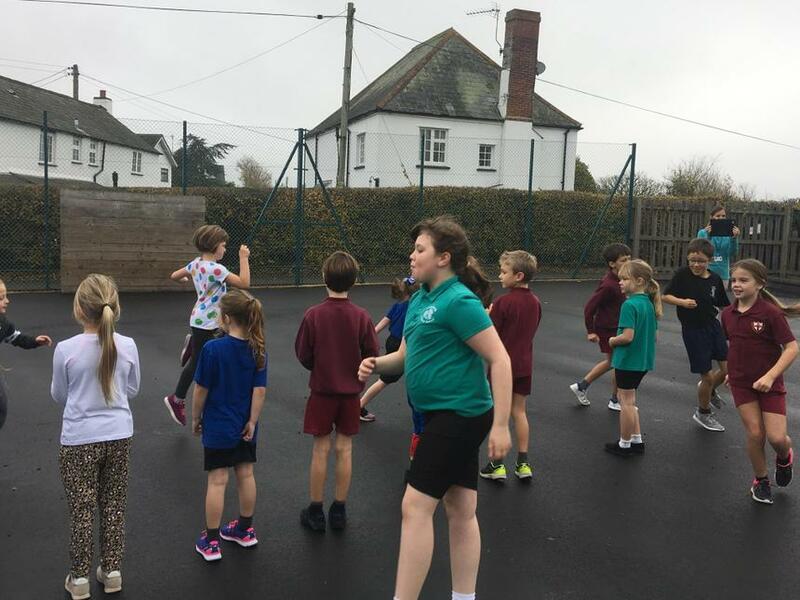 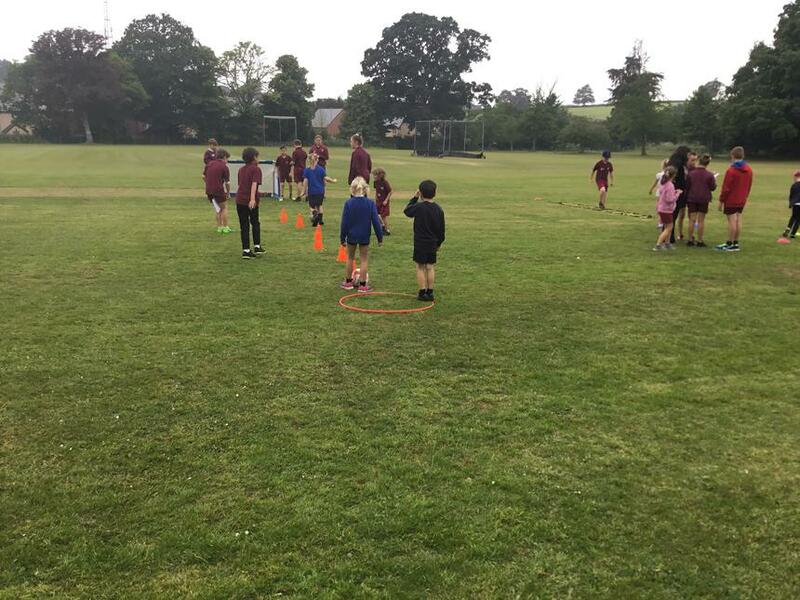 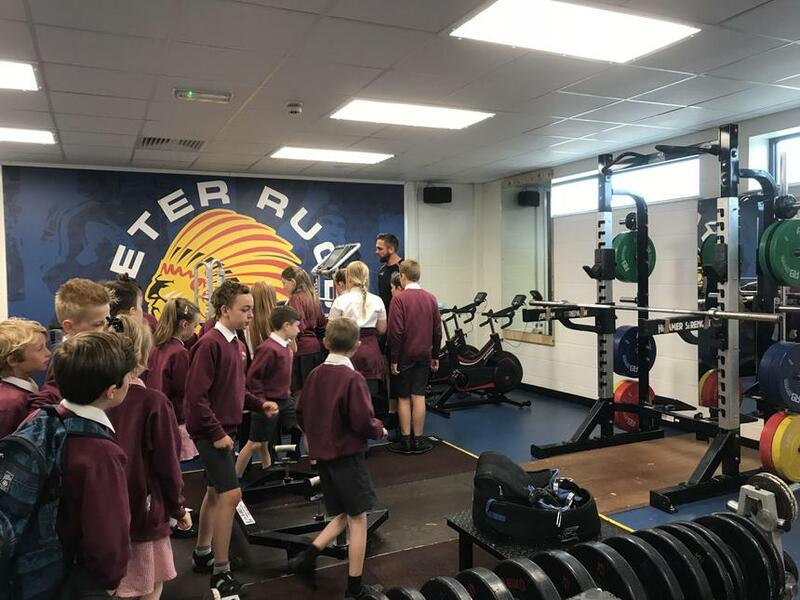 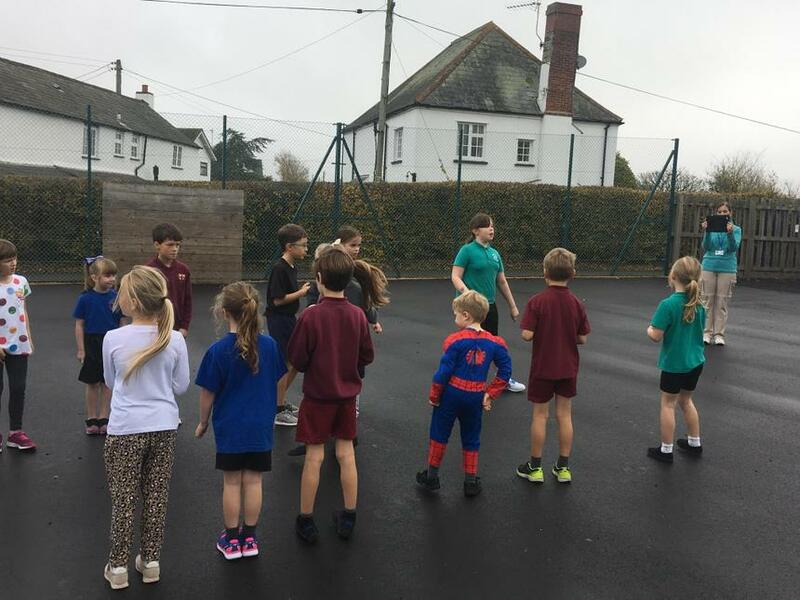 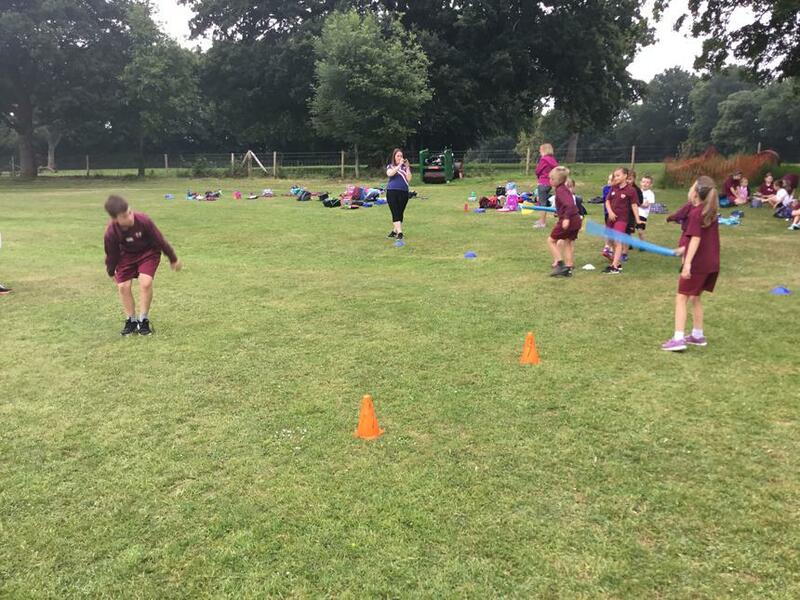 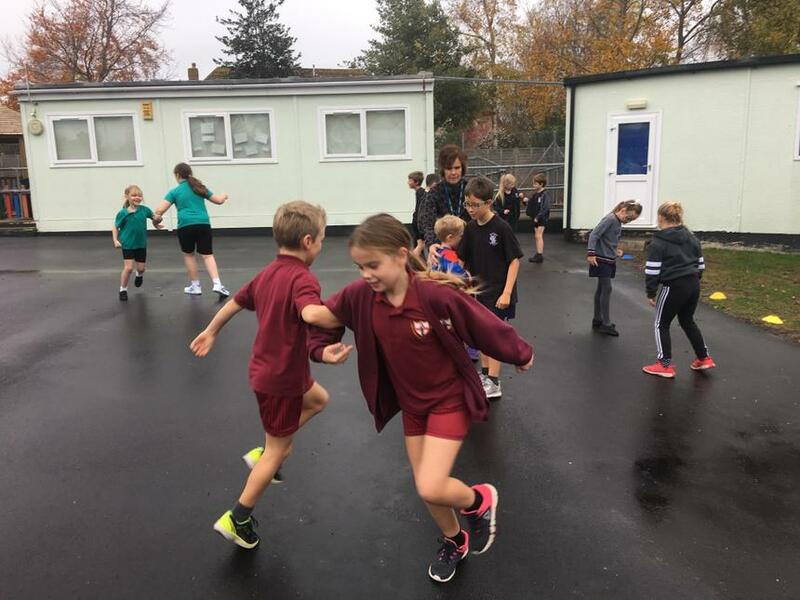 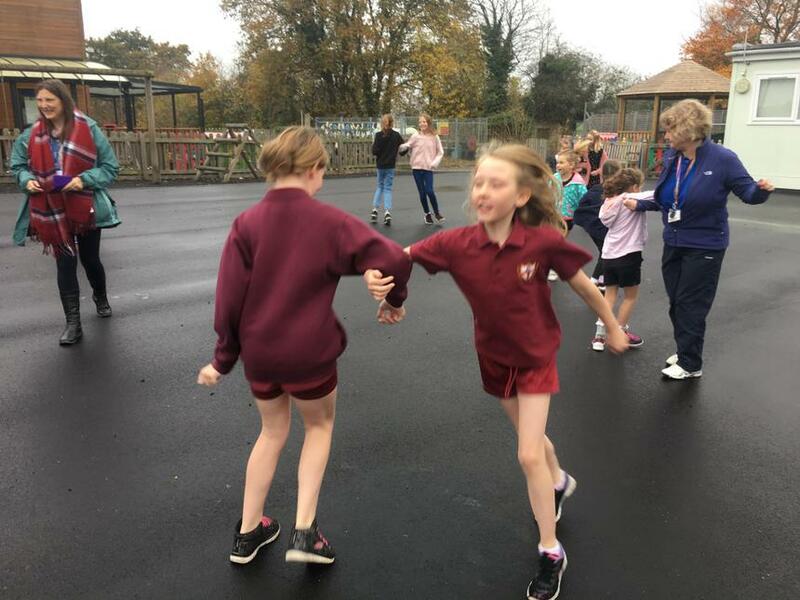 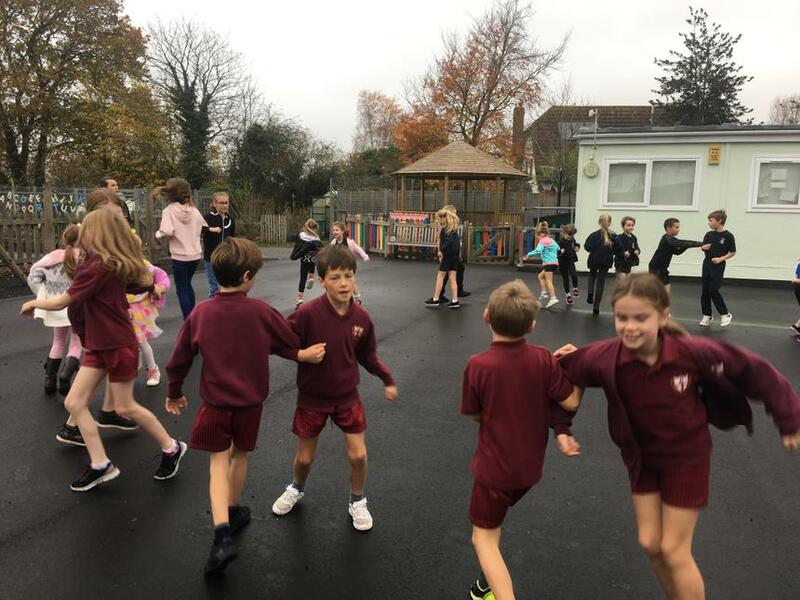 This linked in nicely to the Sports Marathon that was completed recently, giving the children to calculate the number of laps run by each child and converting these into miles and km. 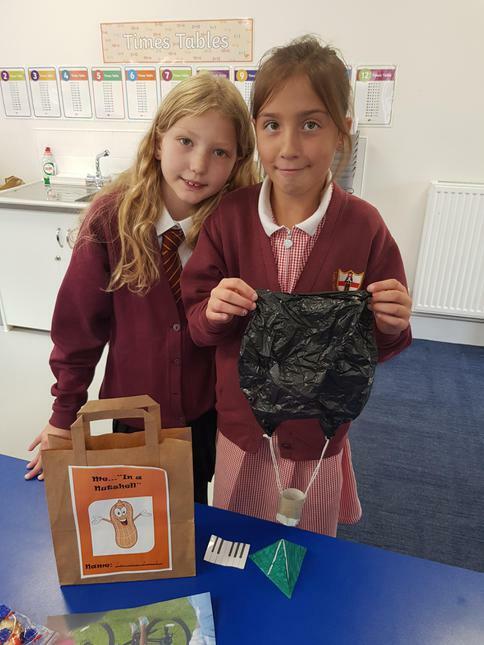 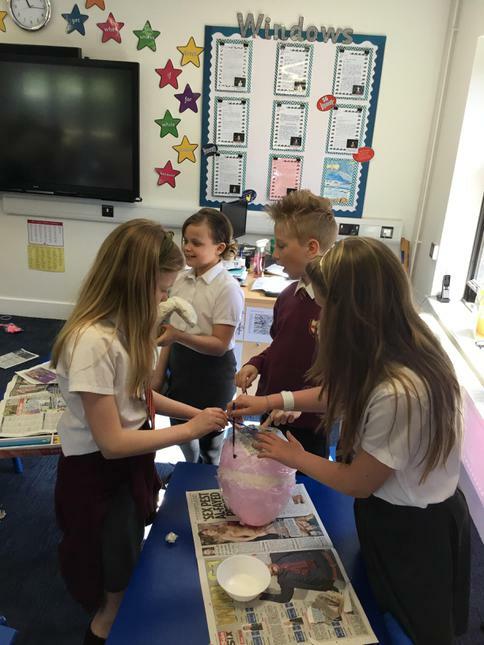 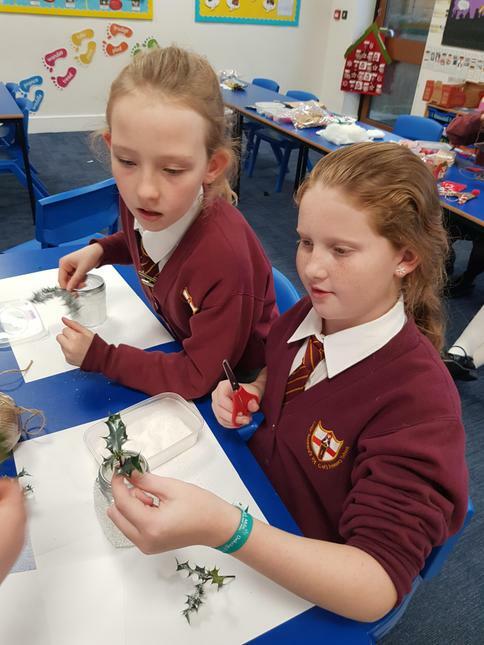 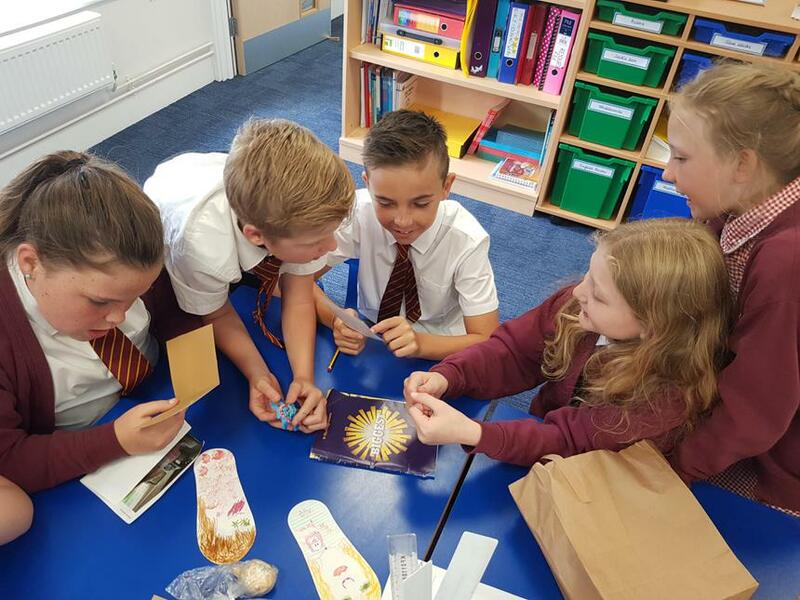 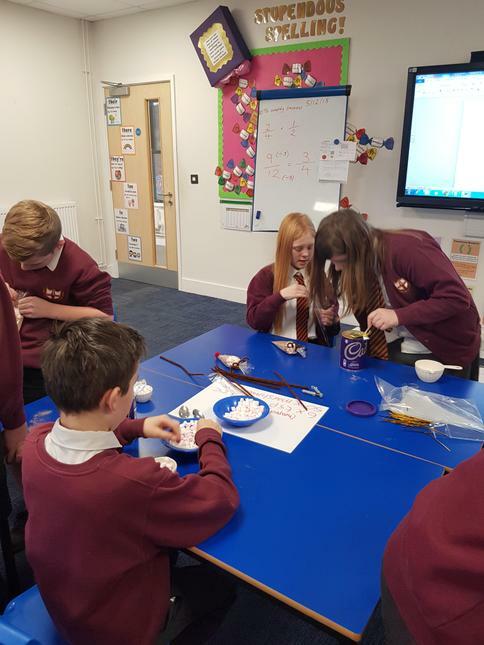 Roald Dahl Science in Action! 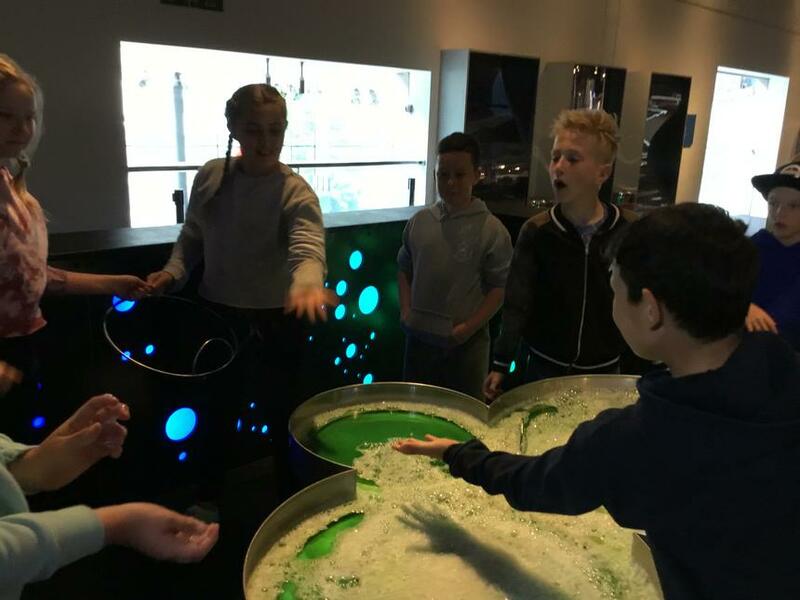 During the morning they looked the properties of different liquids and the scientific laws governing how they interact. 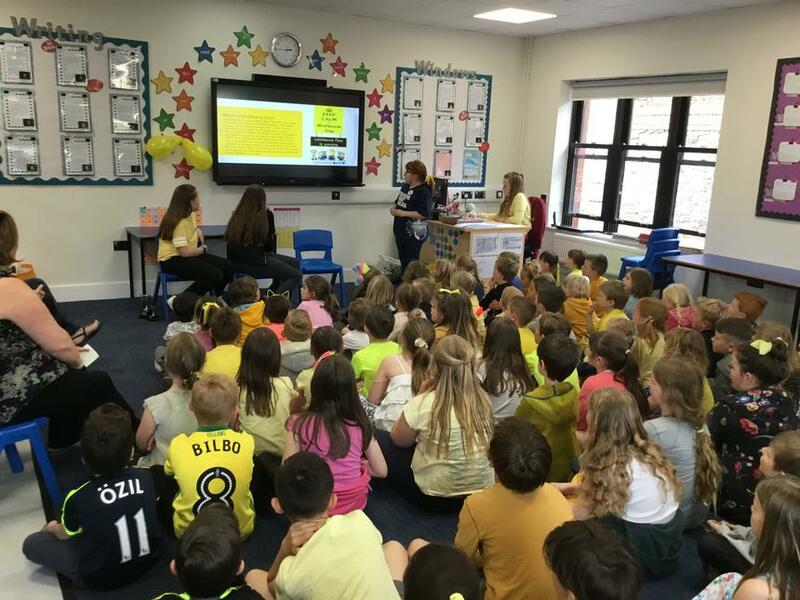 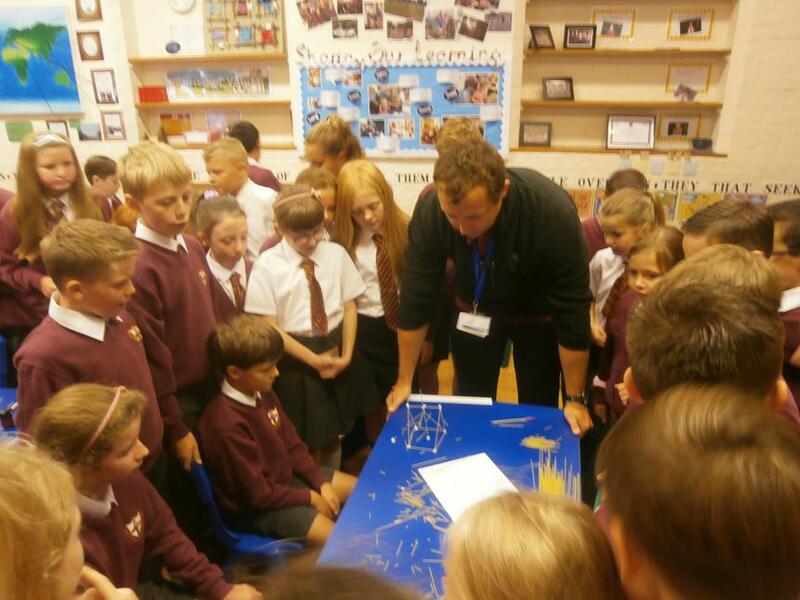 A number of challenging questions were posed to the children as part of this challenge. 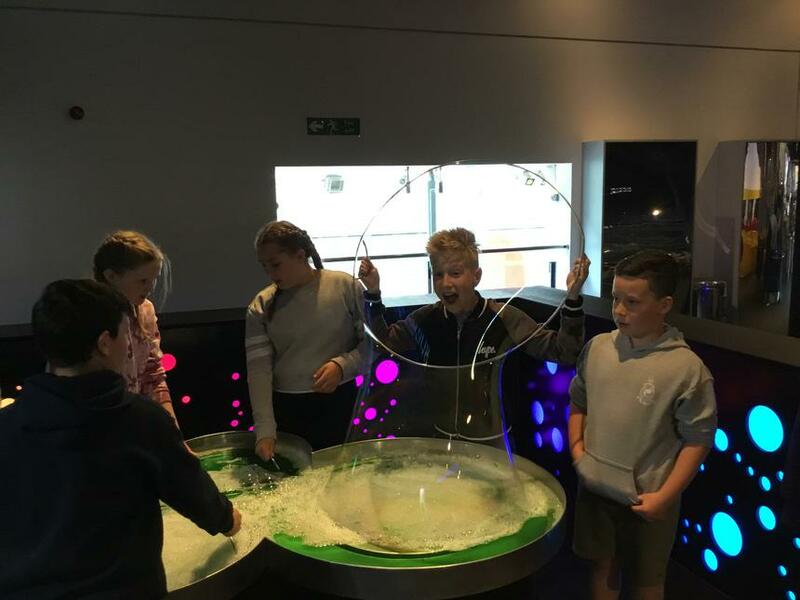 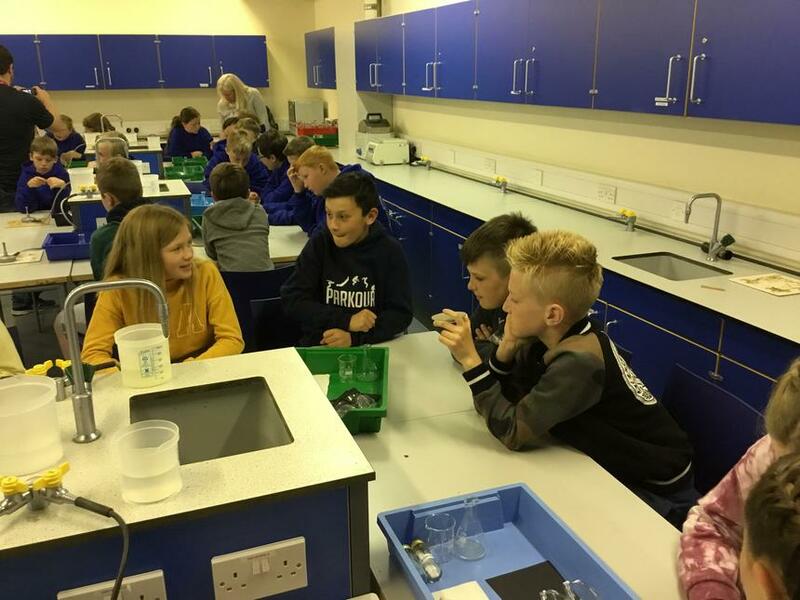 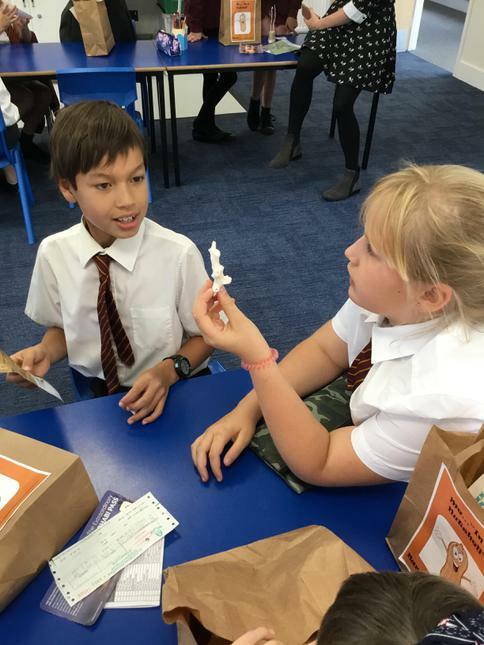 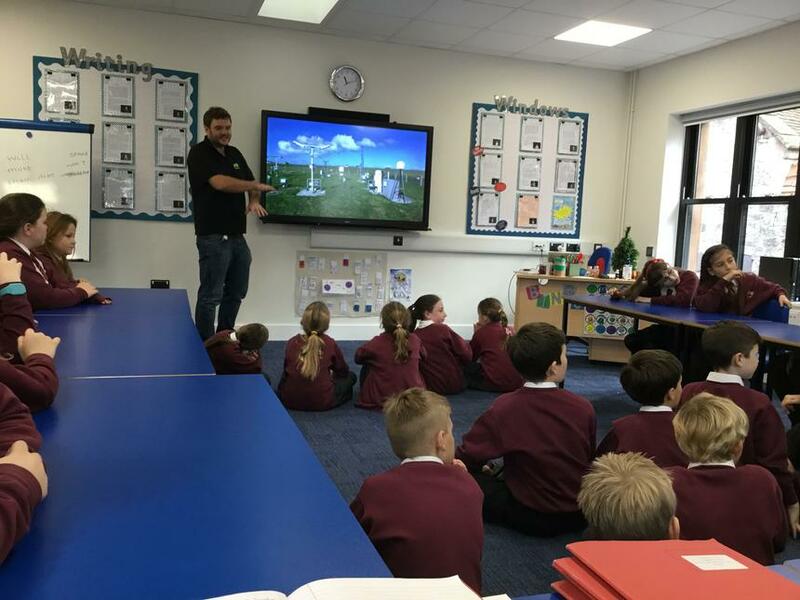 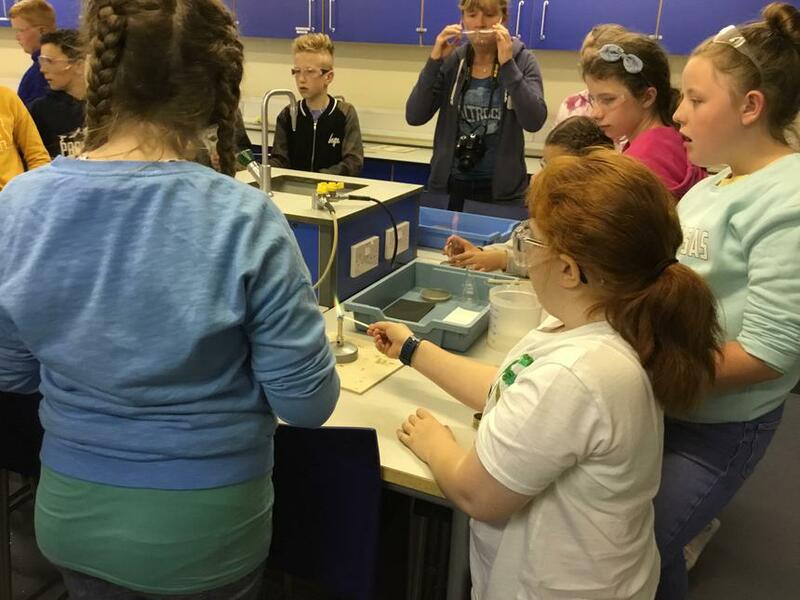 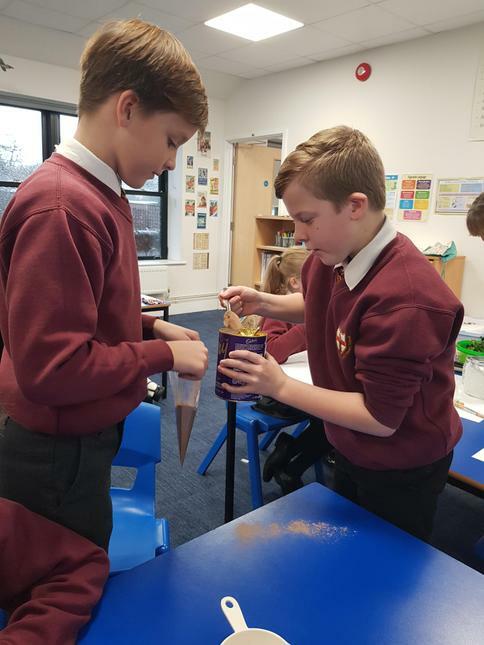 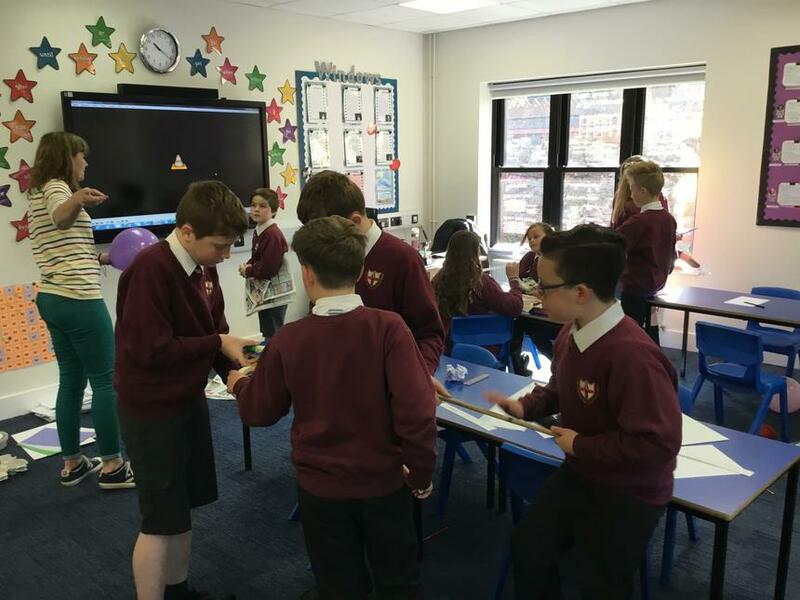 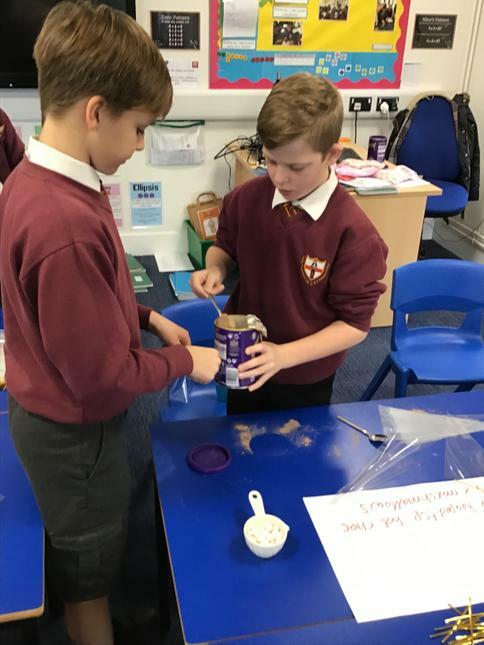 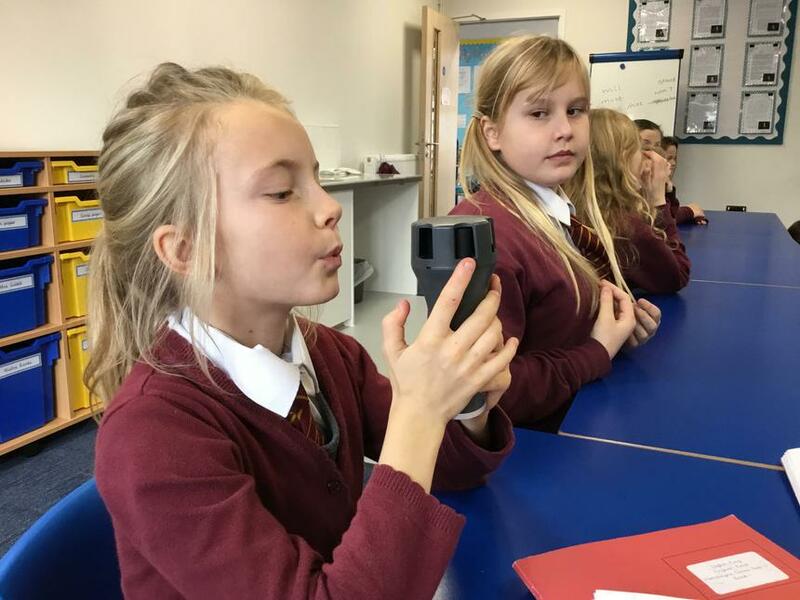 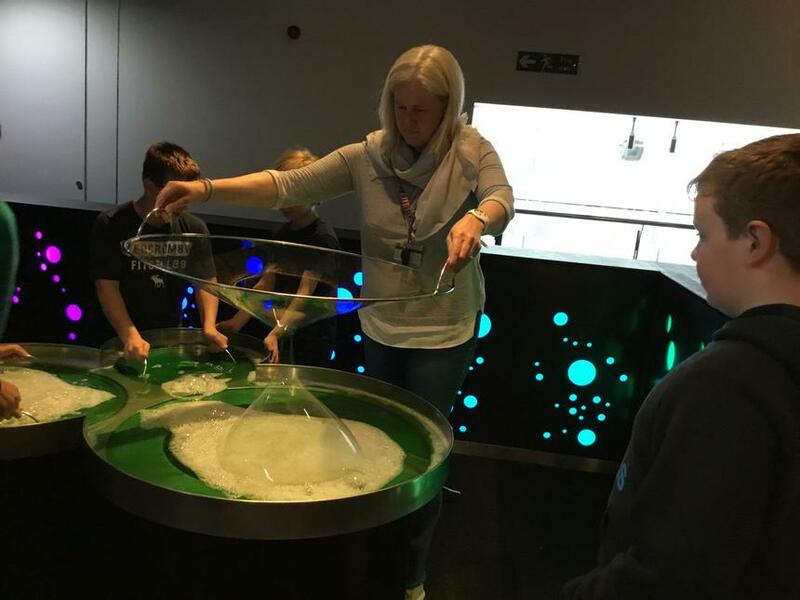 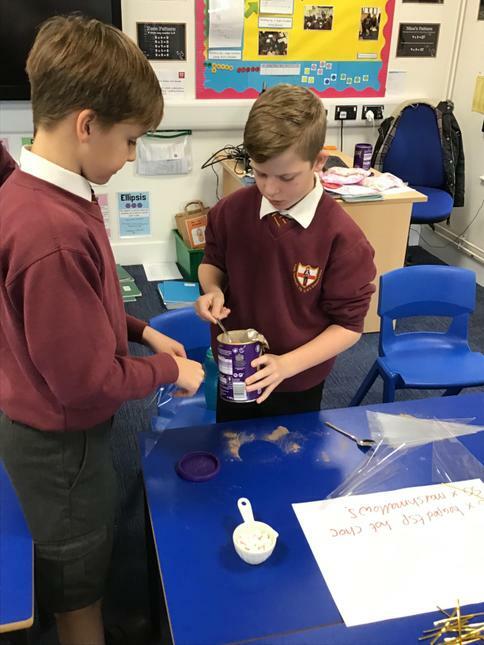 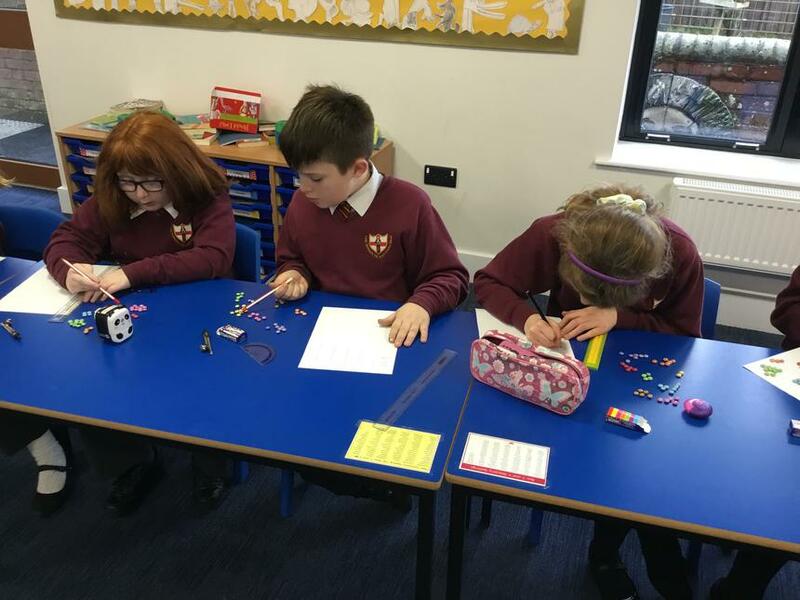 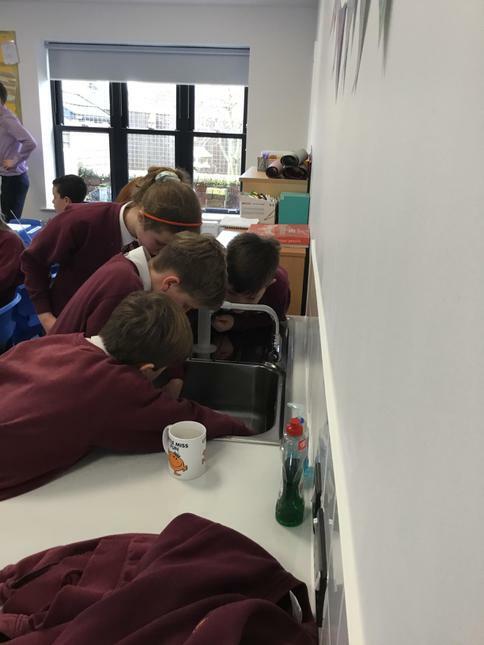 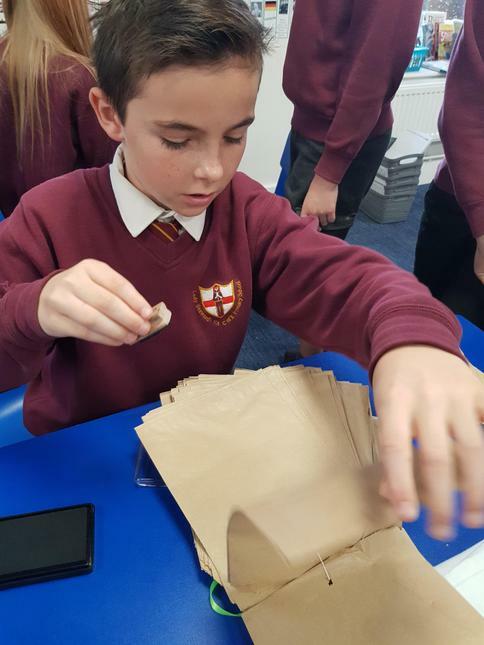 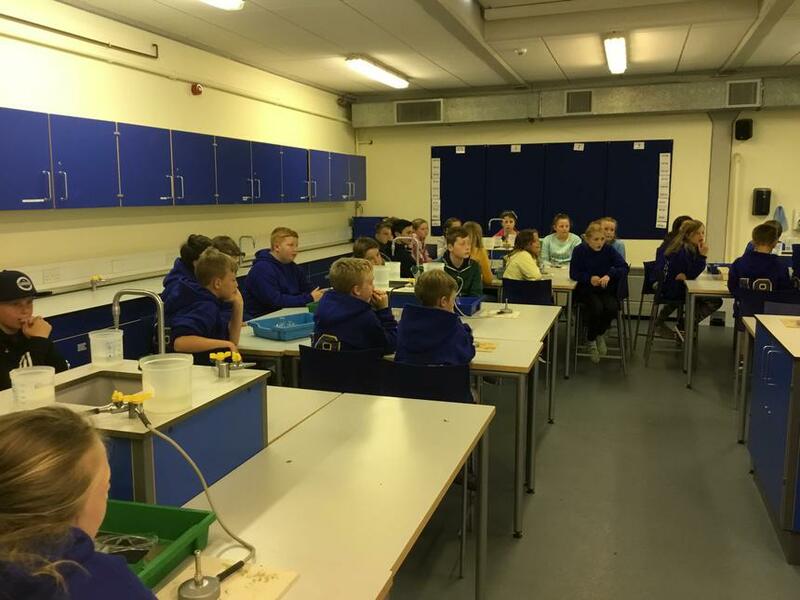 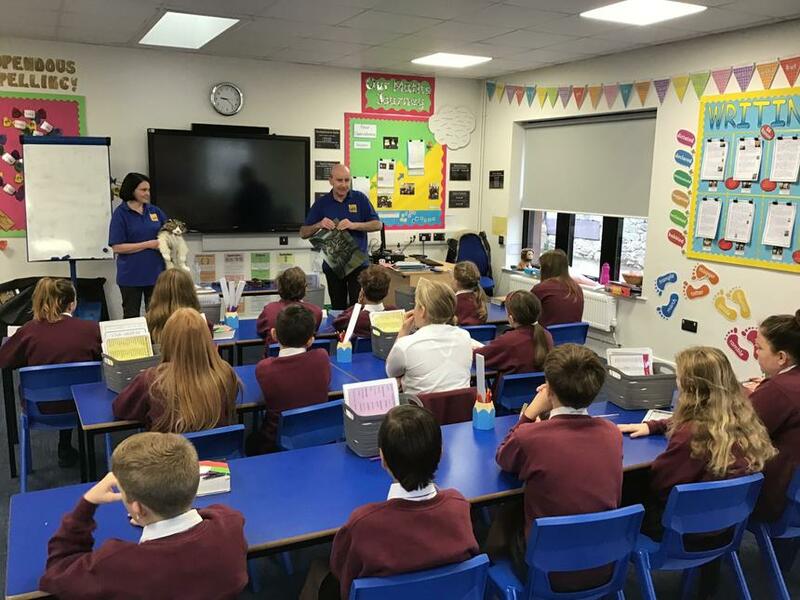 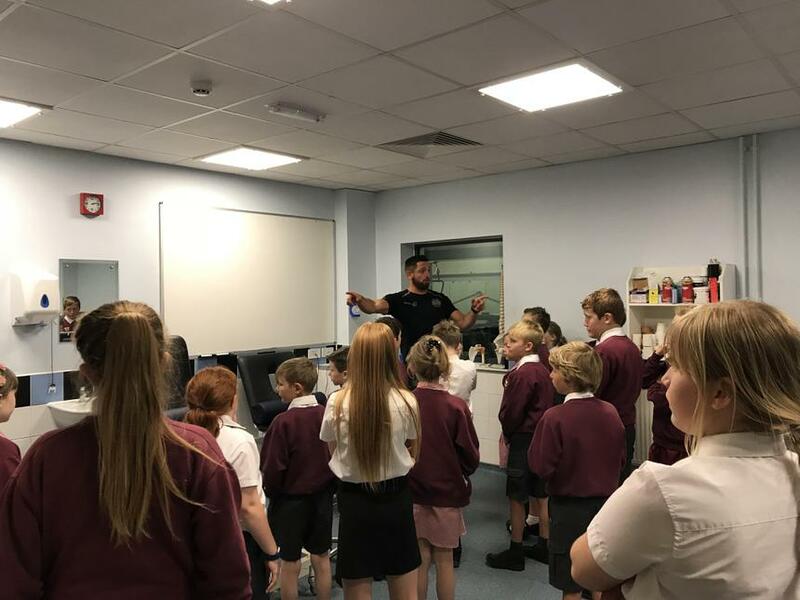 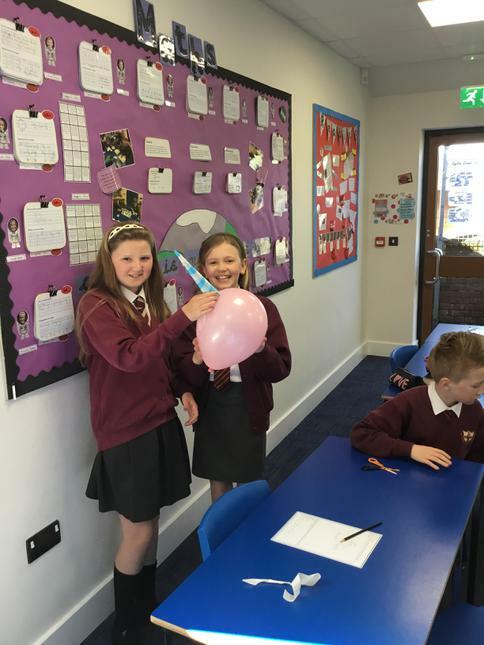 There were some excellent responses showing the children's understanding of both the density and molecular structure of water and oil as well as the knowledge of how effervescent tablets work to release specific gases. 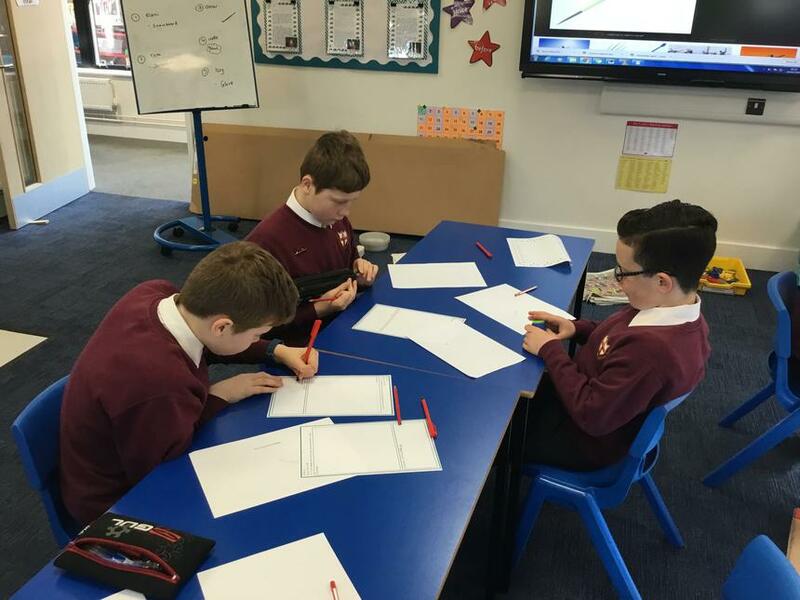 Class 4 have been putting their knowledge of fractions and pie charts to the test! 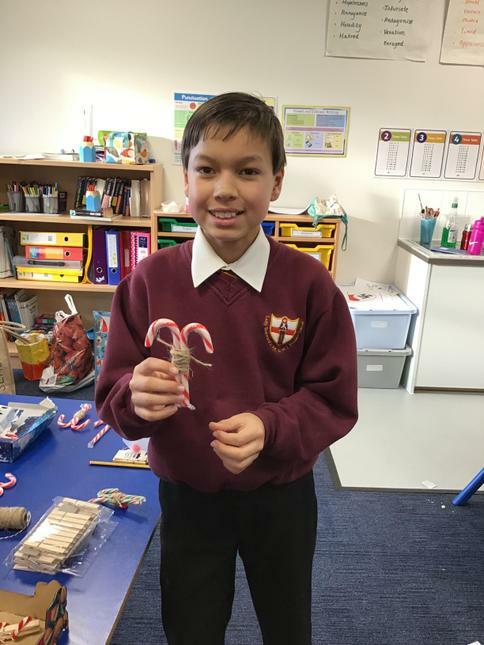 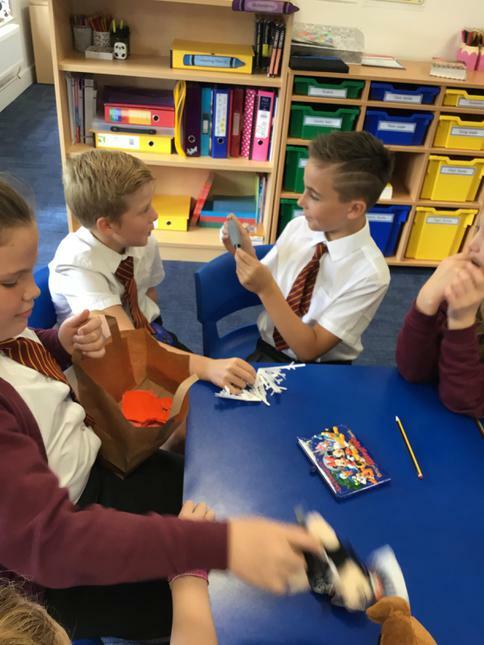 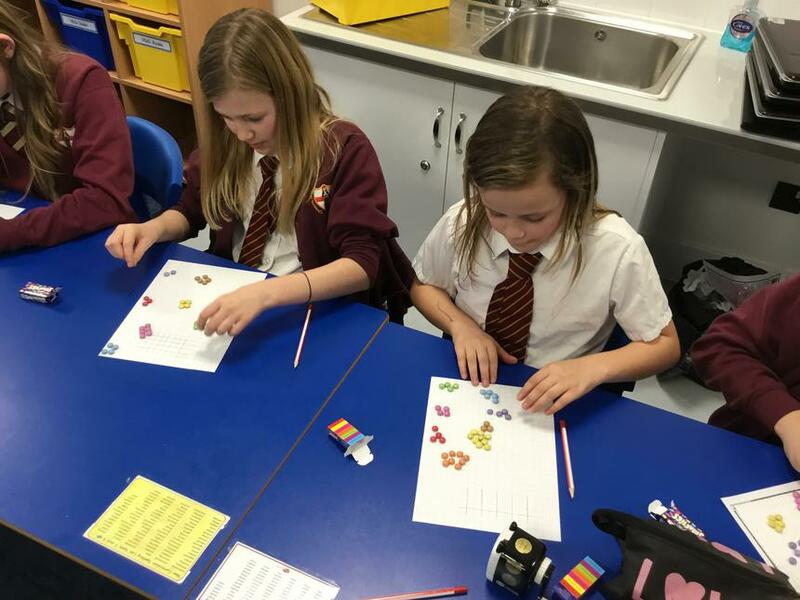 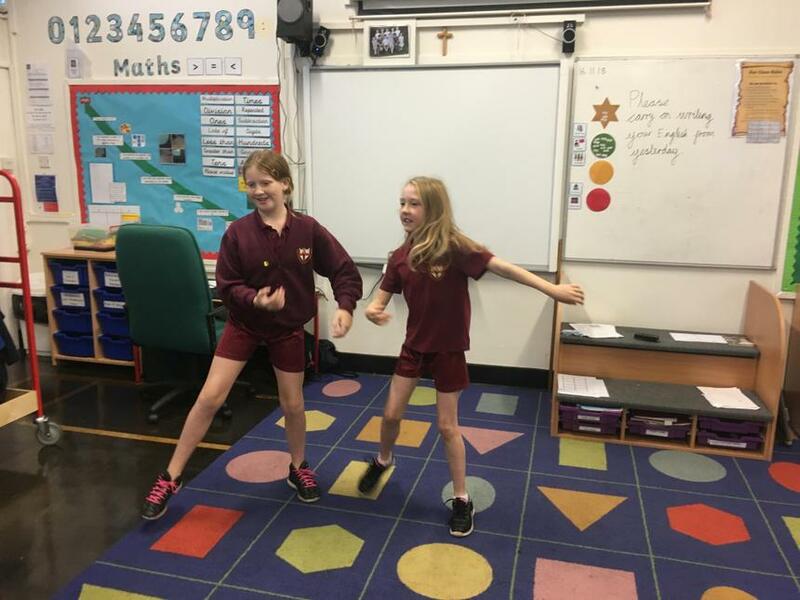 Each child was given a tube of Smarties and had to demonstrate their fraction knowledge in a number of ways. 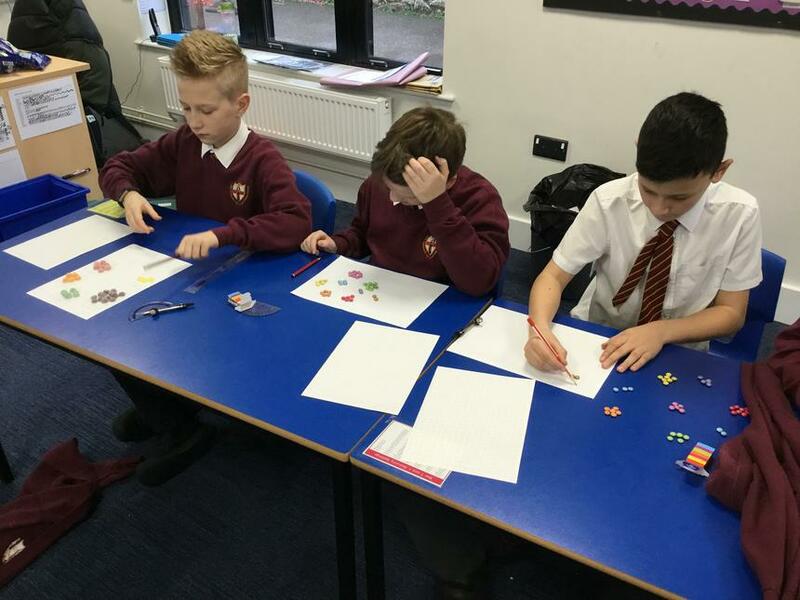 They began by recording their Smarties colours as fractions, simplifying these wherever possible. 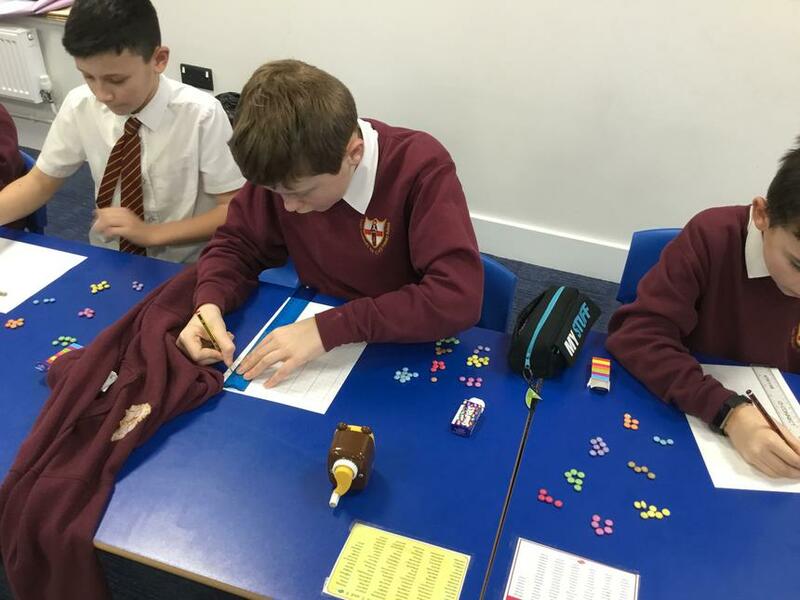 If they were unable to simplify their fractions, they had to reason about why this was. 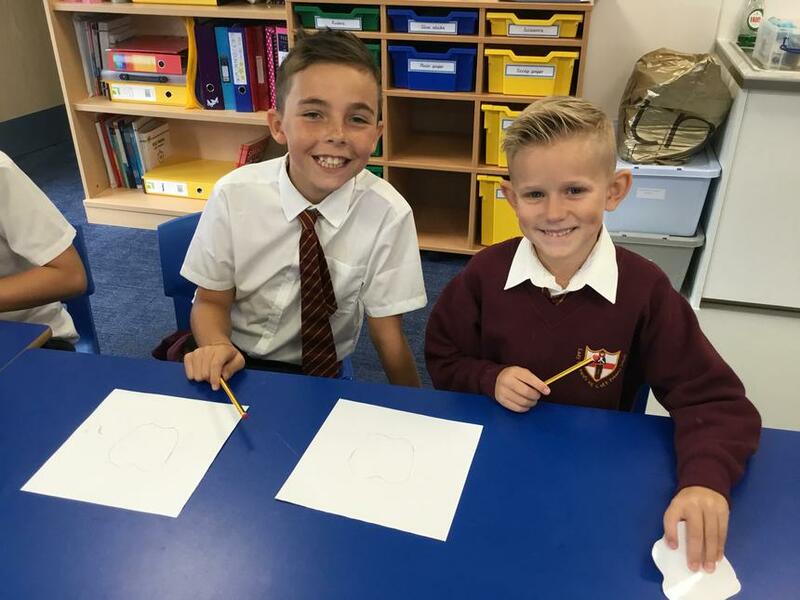 Following this, Class 4 had to create a pie chart to present their results. 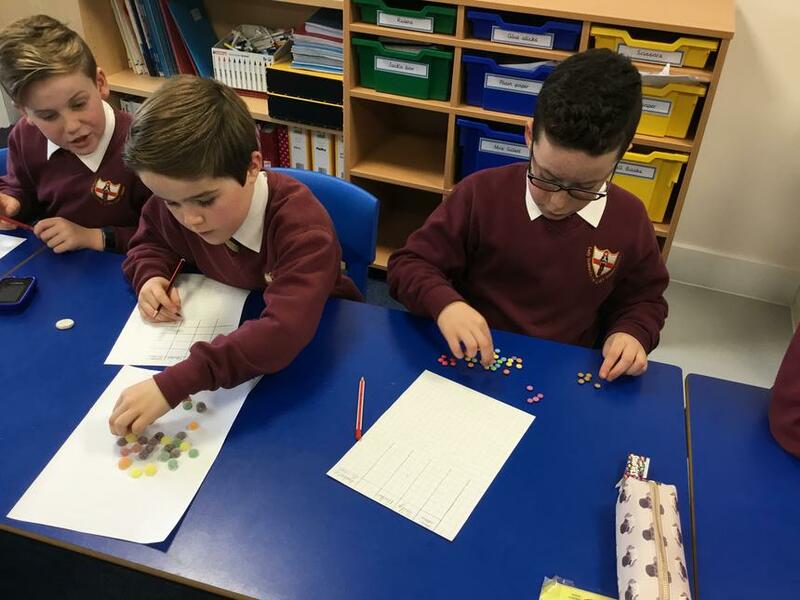 To do this they had to work out how many degrees each Smartie represented, before multiplying this by the number of each colour in their pack. 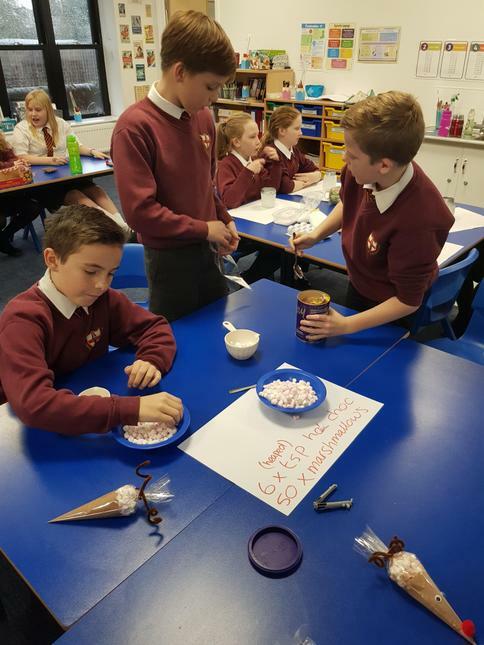 Lastly, when the children had checked that their results and pie chart were correct... they were allowed to eat the Smarties! 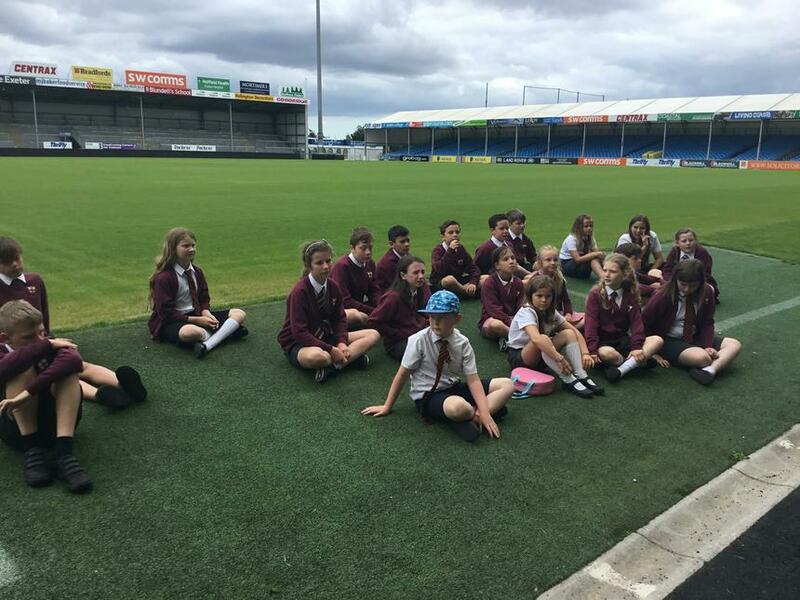 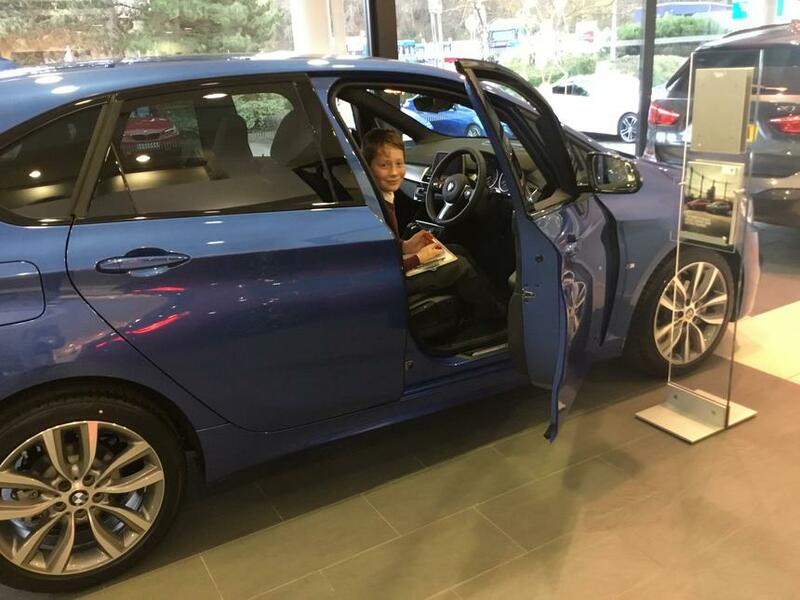 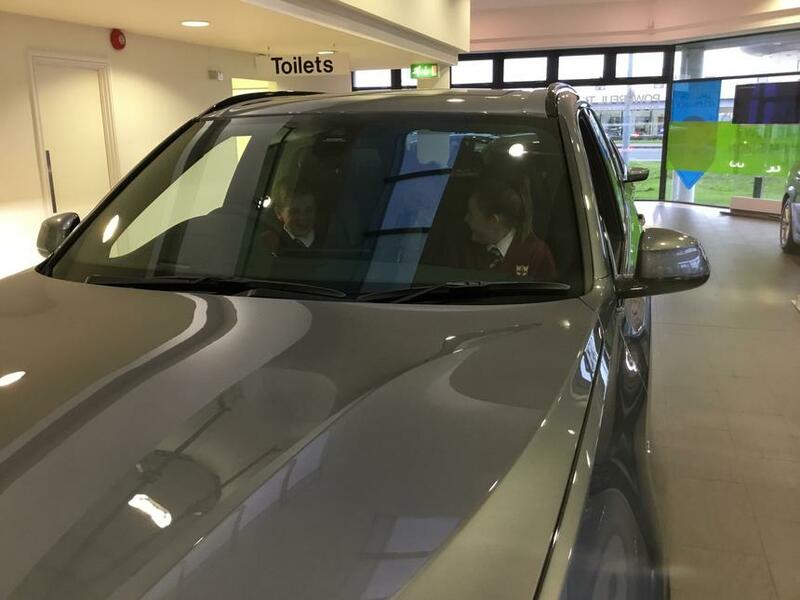 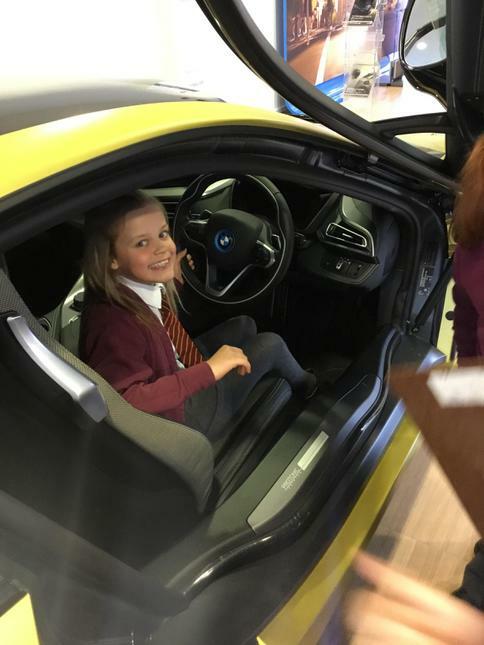 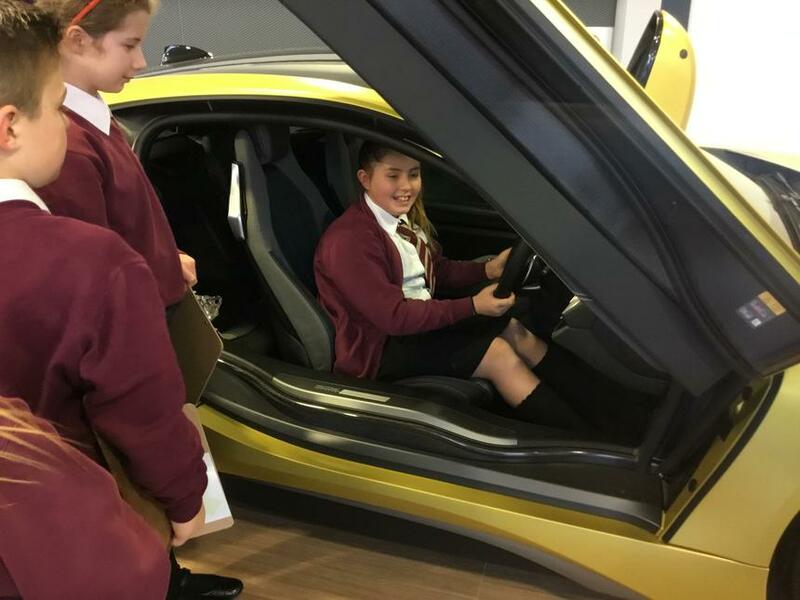 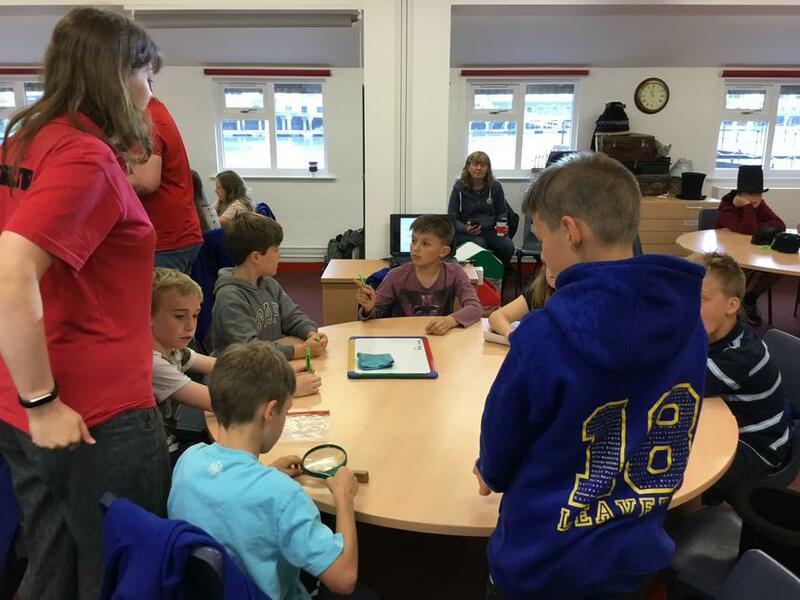 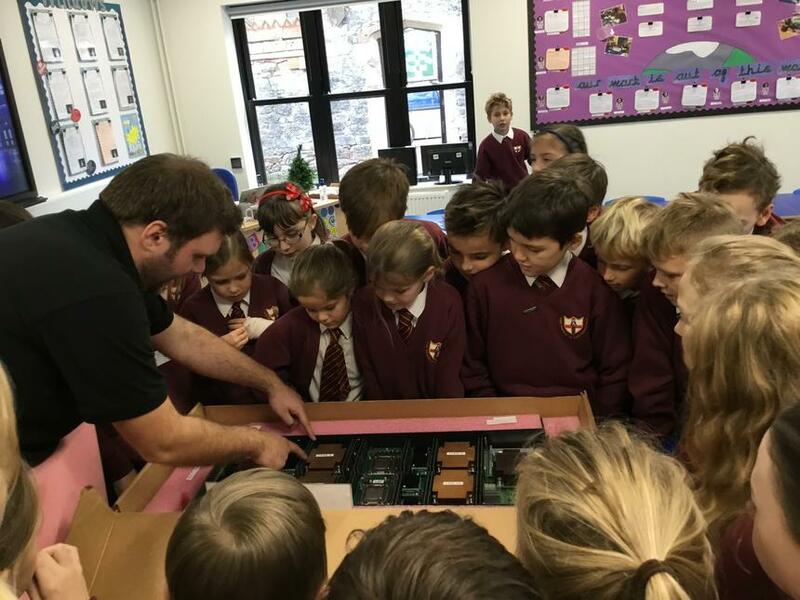 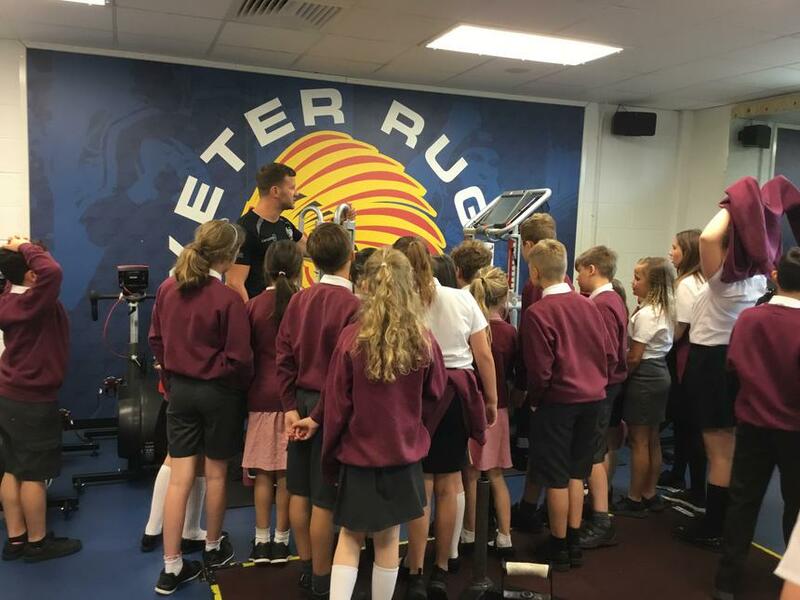 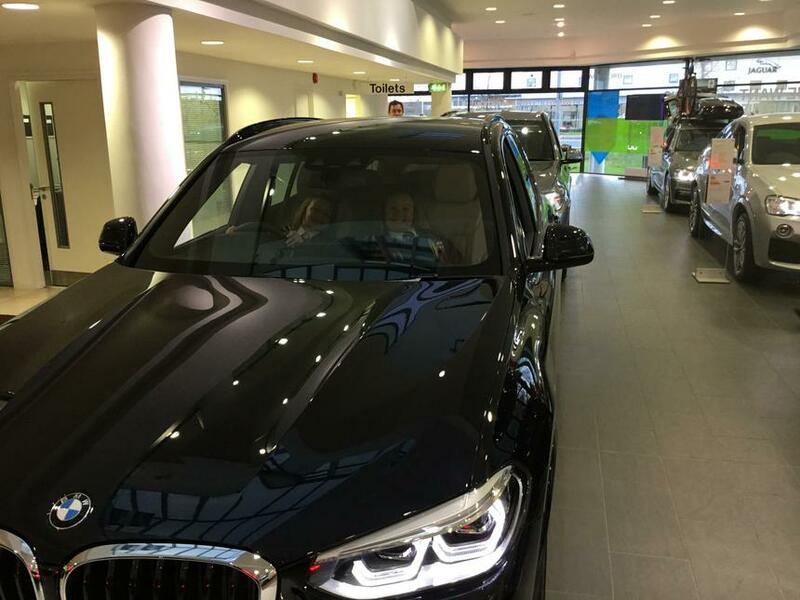 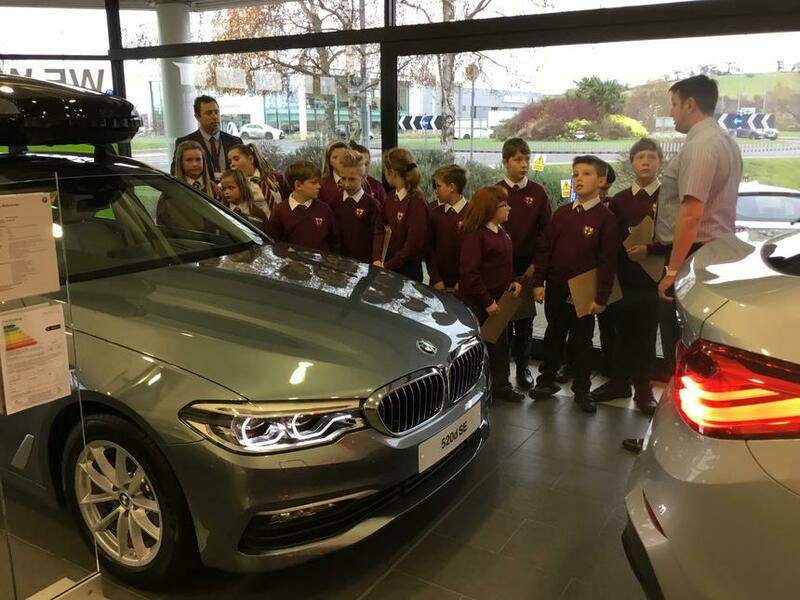 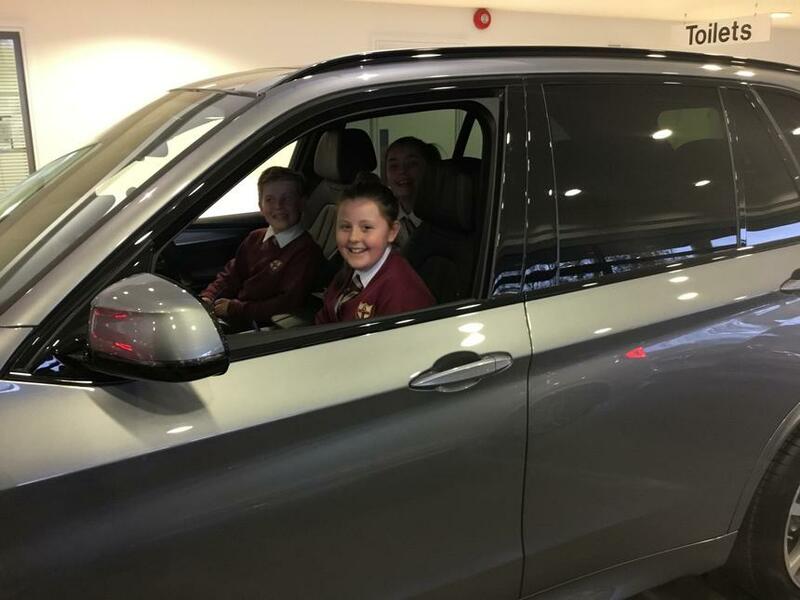 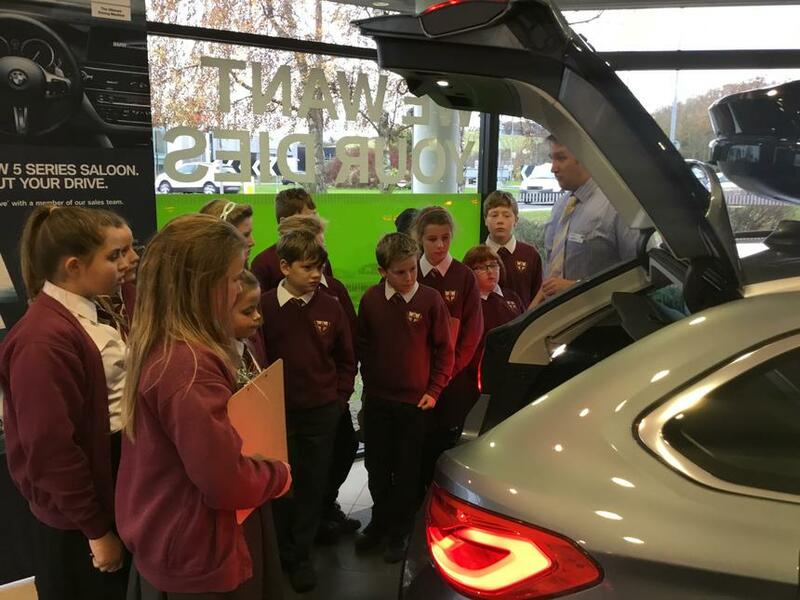 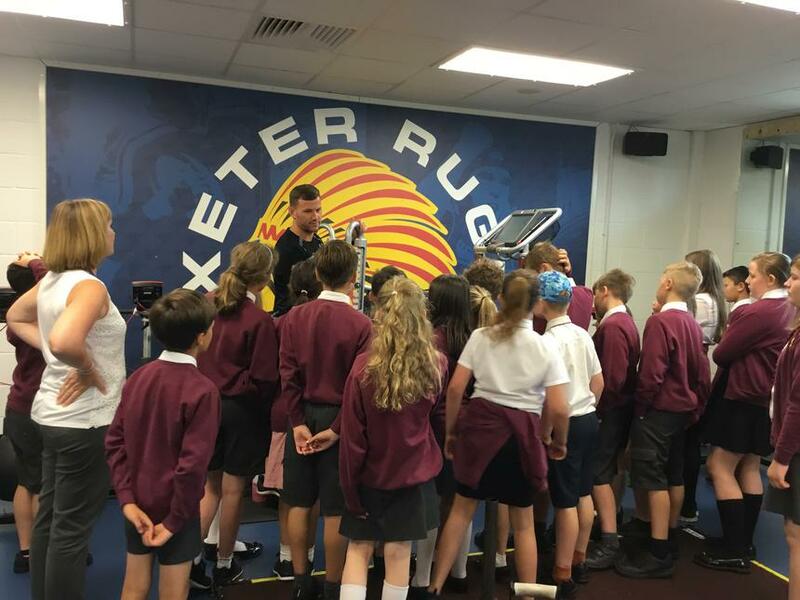 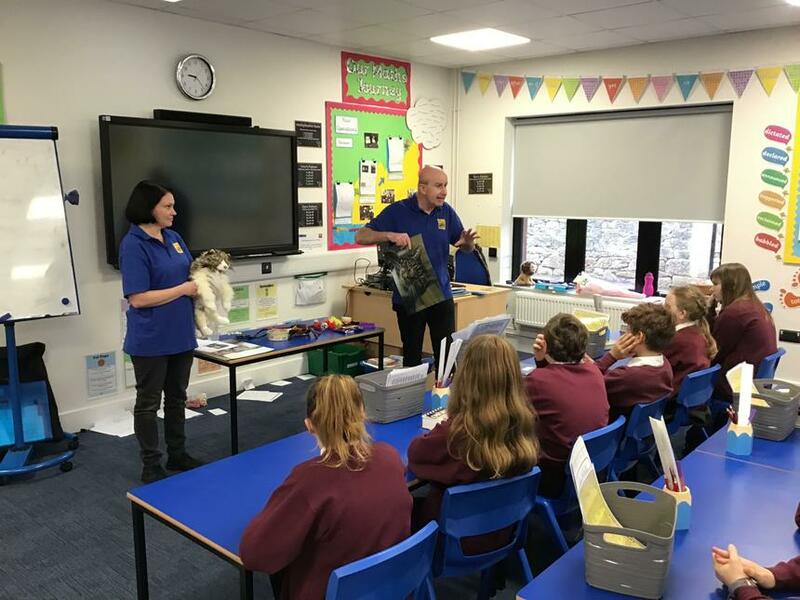 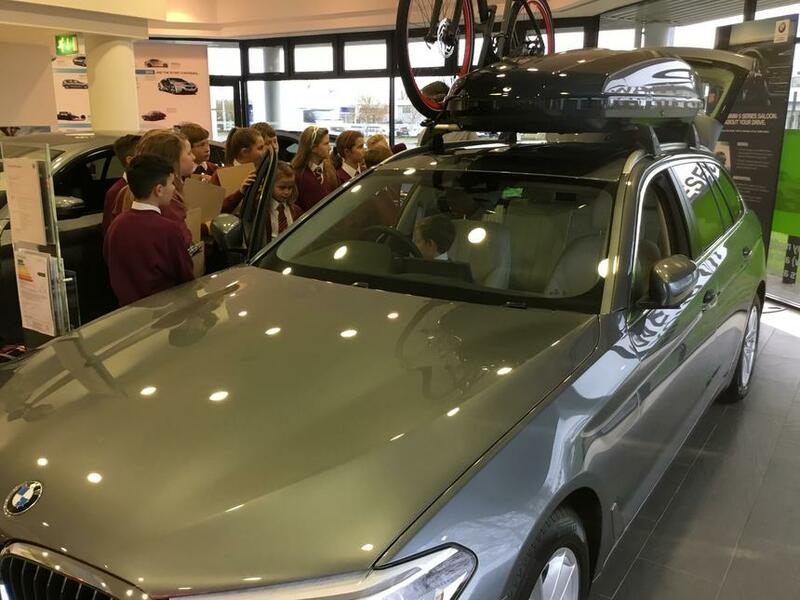 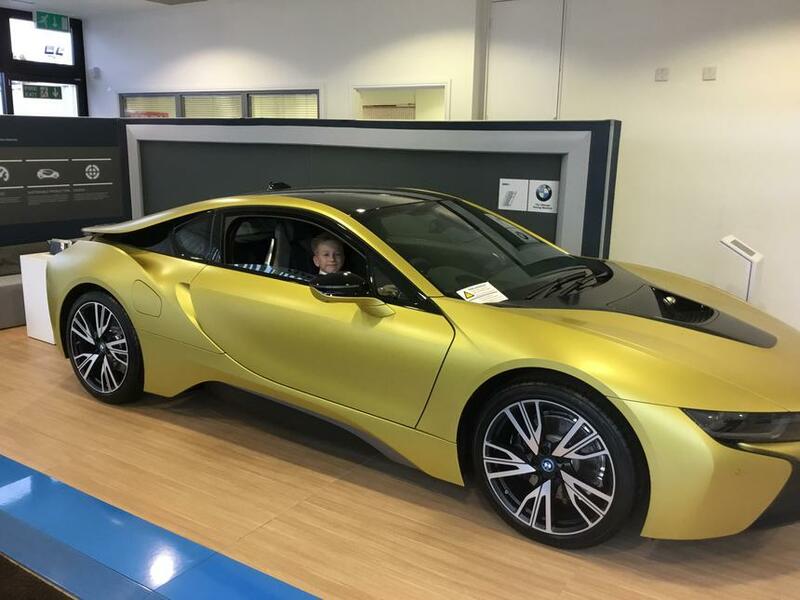 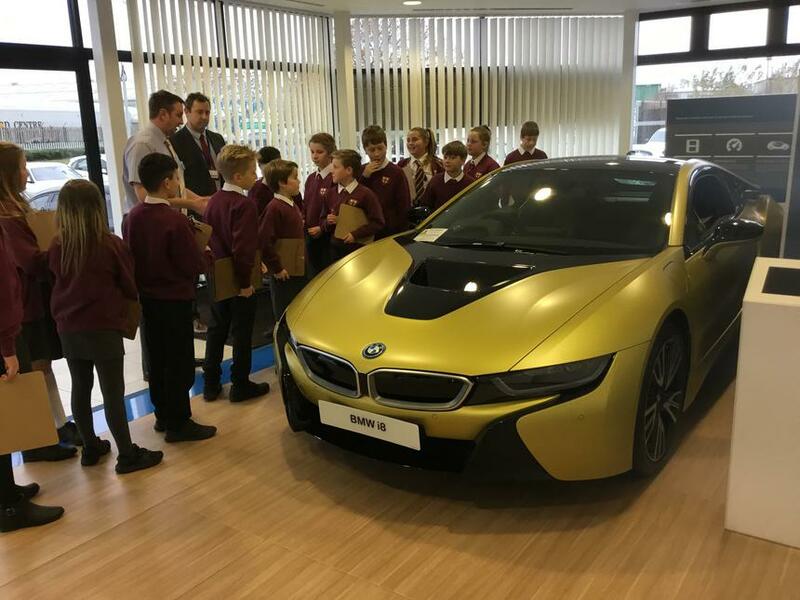 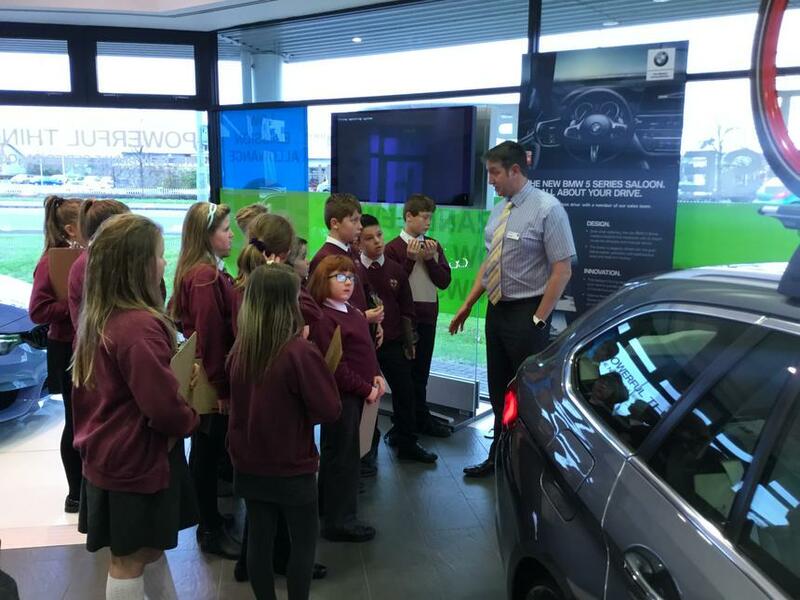 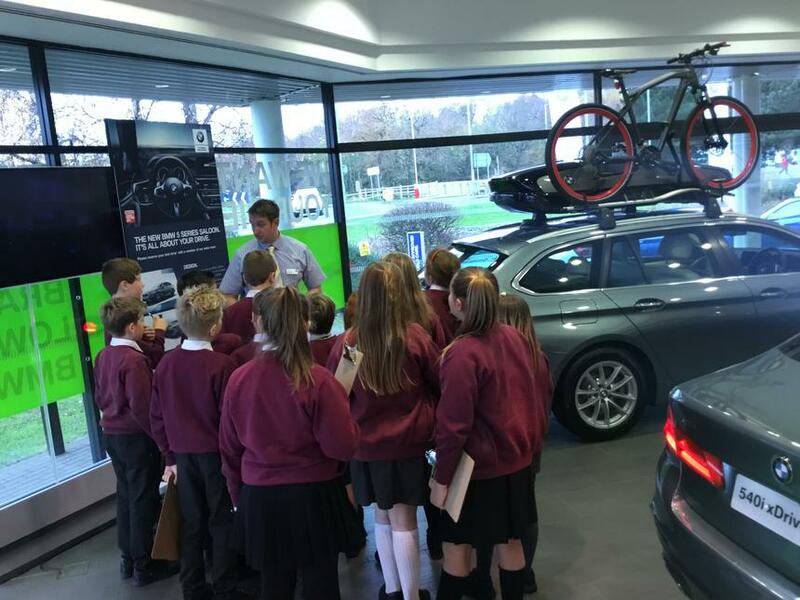 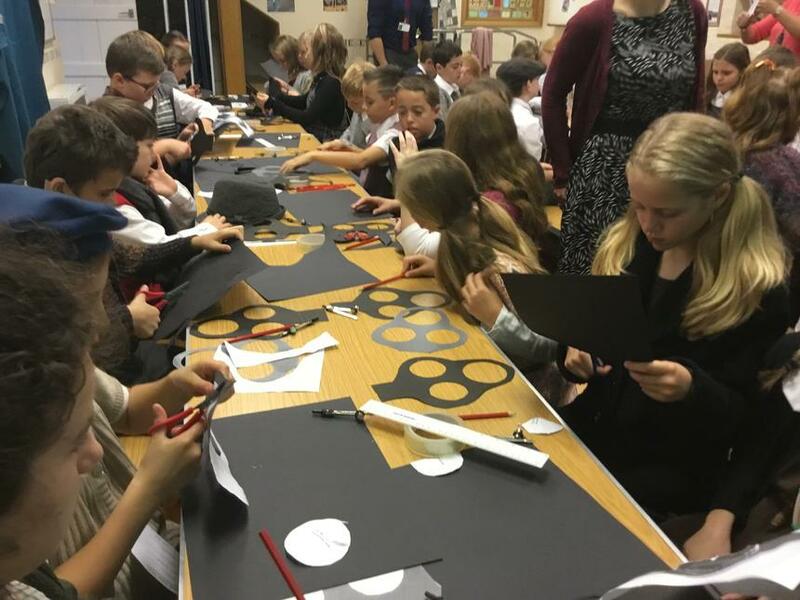 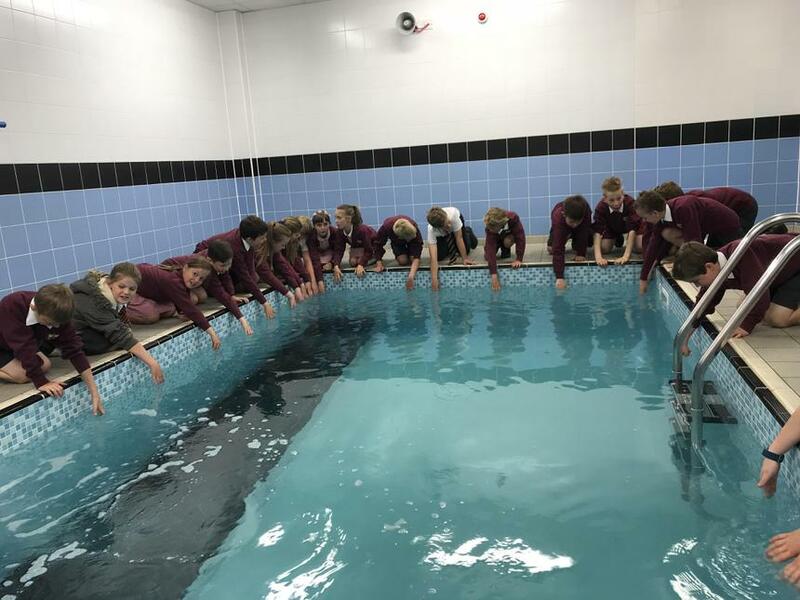 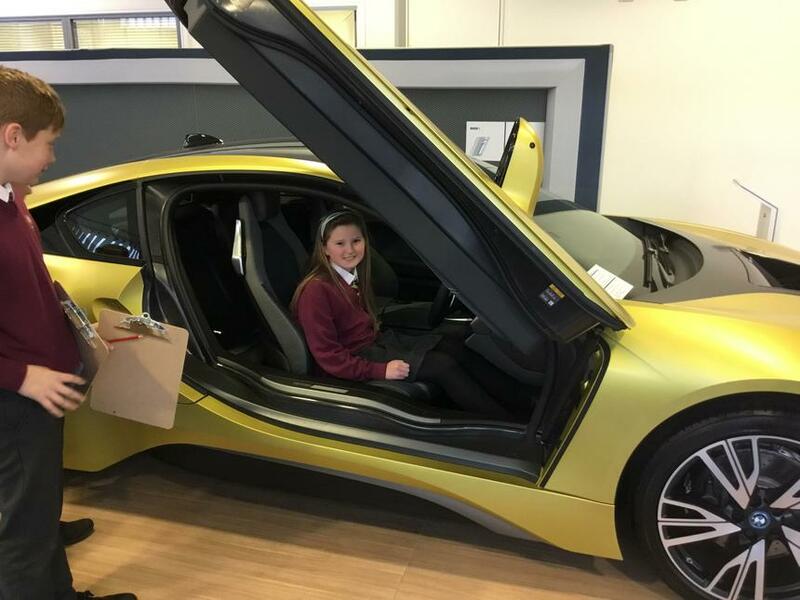 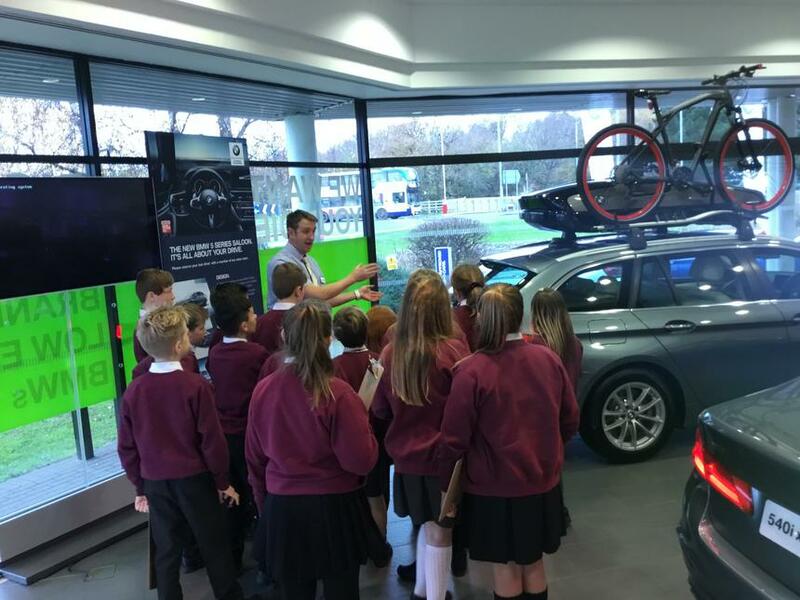 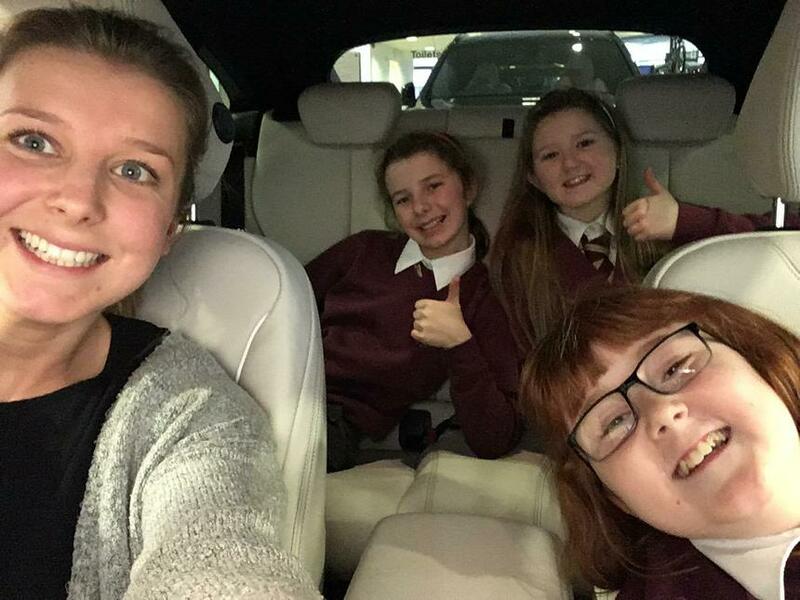 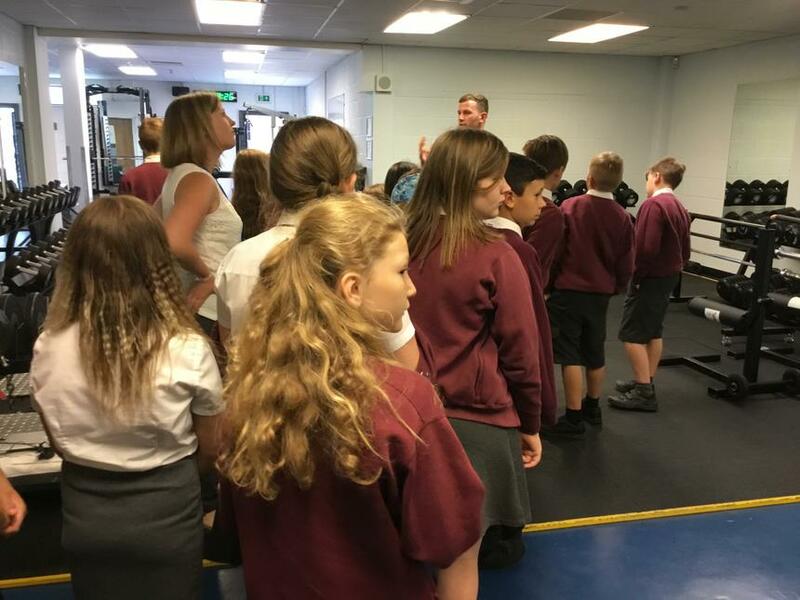 On Tuesday 5th December, Year 6 visited the BMW showroom in Marsh Barton, Exeter. 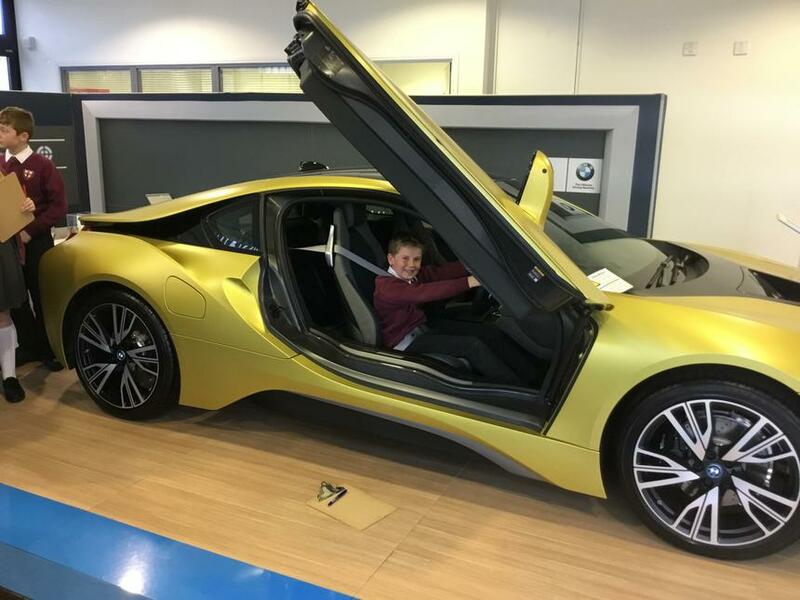 James, one of the salesmen, showed us around and delivered us a sales pitch, showing us what we needed to do in order to sell our own cars. 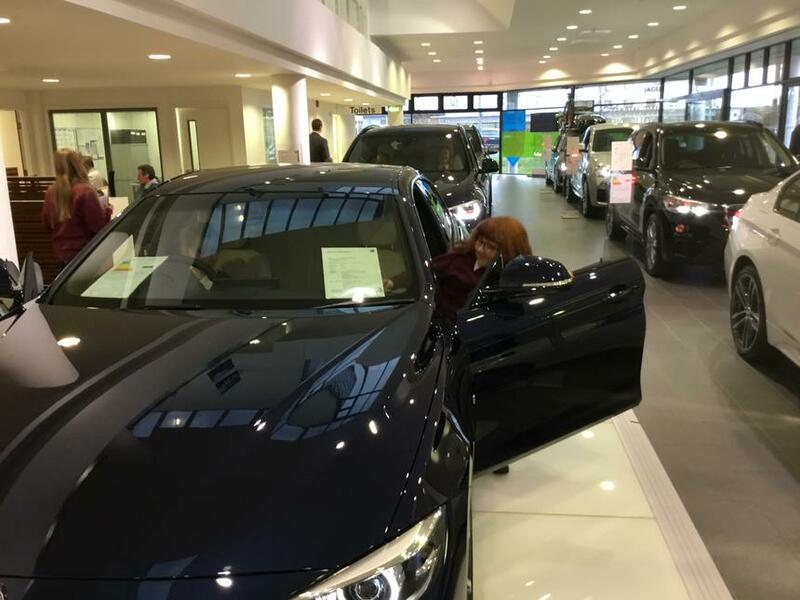 After this, we were able to look around the showroom independently. 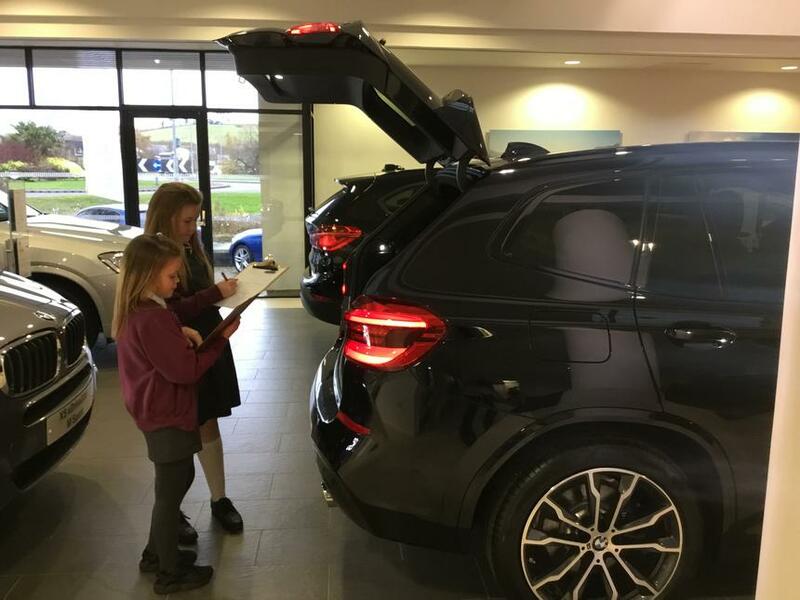 We each chose a car to focus on and filled in a car specification sheet to highlight the specifications of our chosen car. 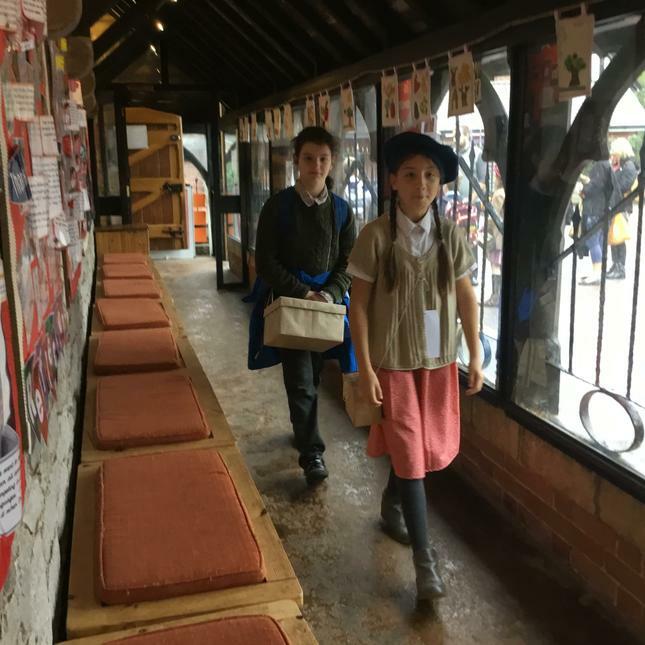 We will then be completing a piece of writing back in the classroom all about this exciting and engaging real-life writing experience. 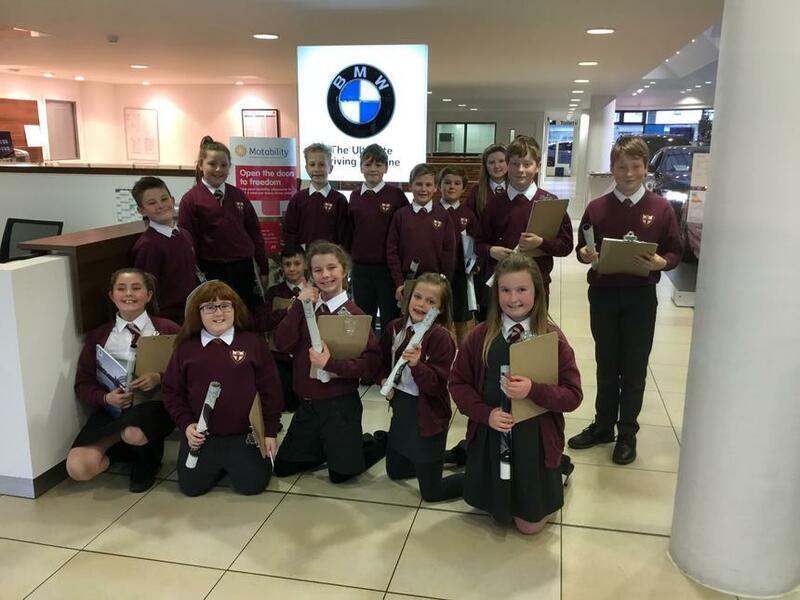 Class 4 would all like to say a huge thank you to James, Lewis and everyone at BMW for allowing us this incredible opportunity! 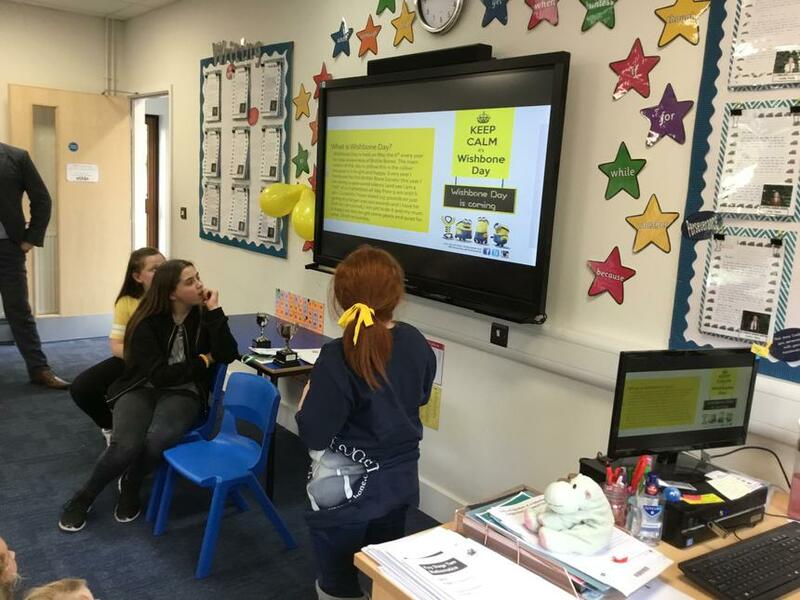 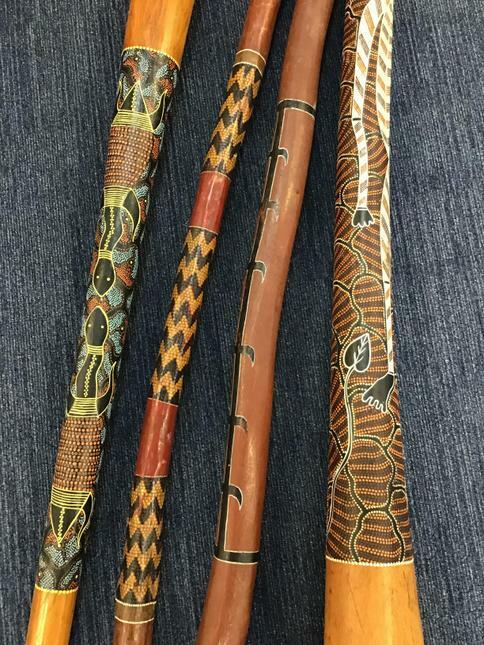 We now welcome three new prefects to our team: congratualtions to Caitlin, Eleni and Harmony who recieved their prefect ties on Friday 3rd November in Celebration Assembly. 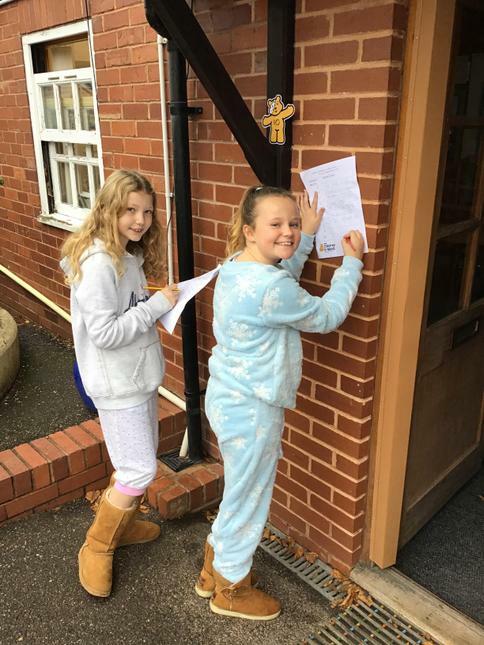 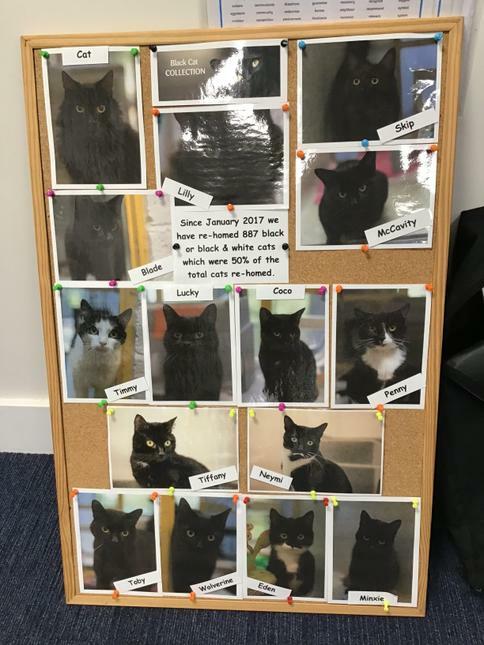 These were recieved as a result of the consistently high standard of work, positive role modelling and fantastic behaviour around school. 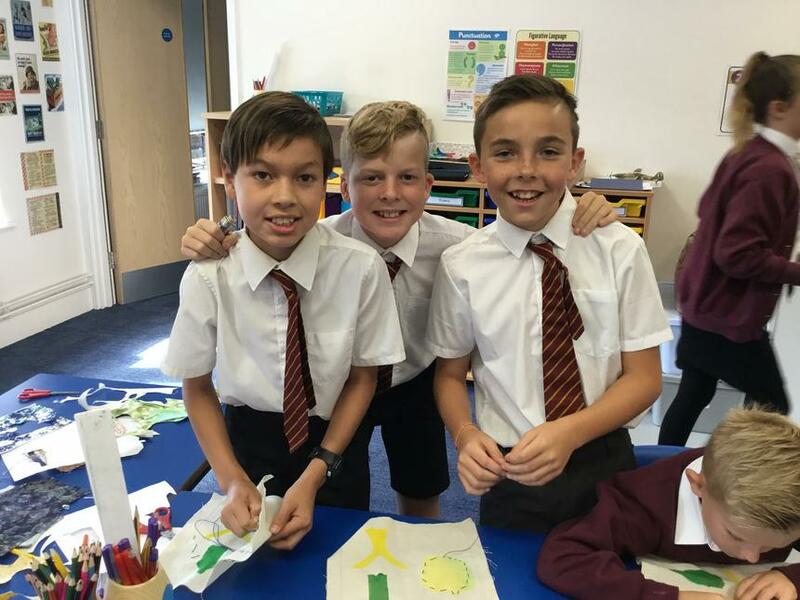 These children will now join Jack, Sam, Libby and Holly on the prefect team and will take on extra responsibilities around the school. 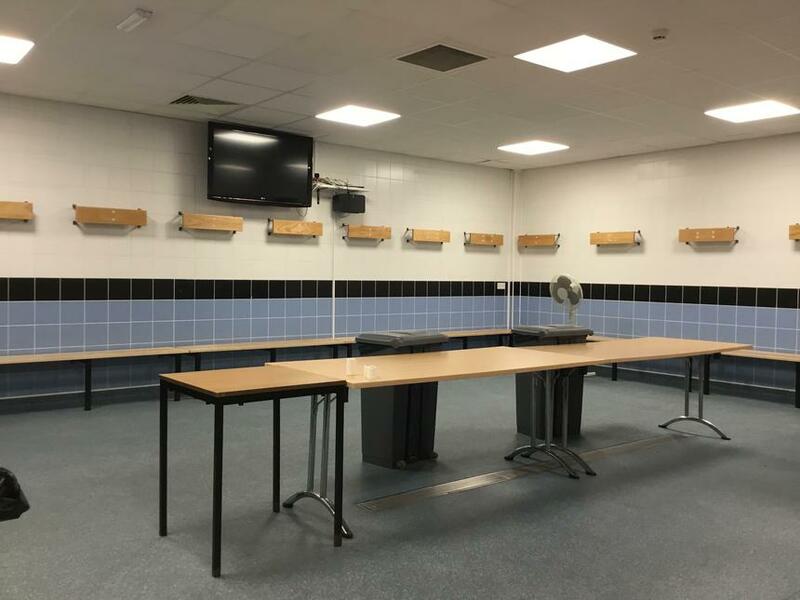 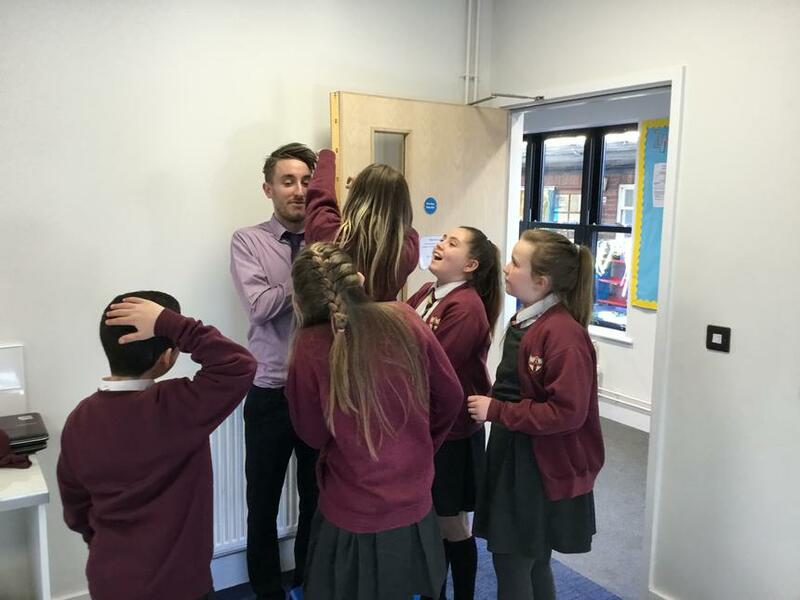 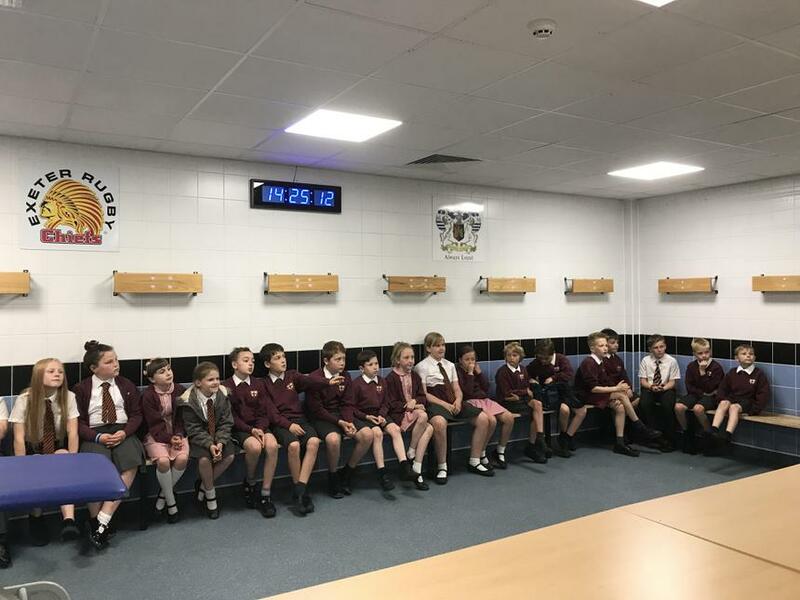 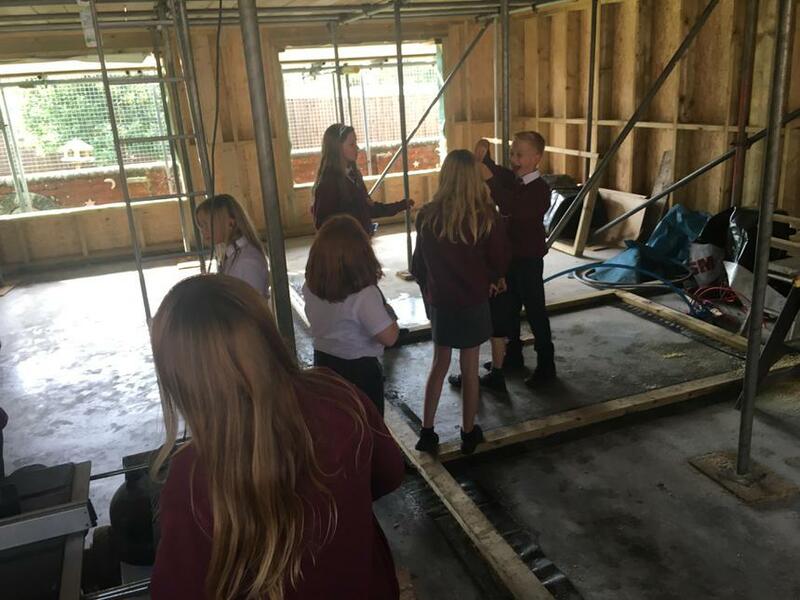 On Thursday 28th September, Class 4 were very fortunate to be granted permission to visit our new classroom! 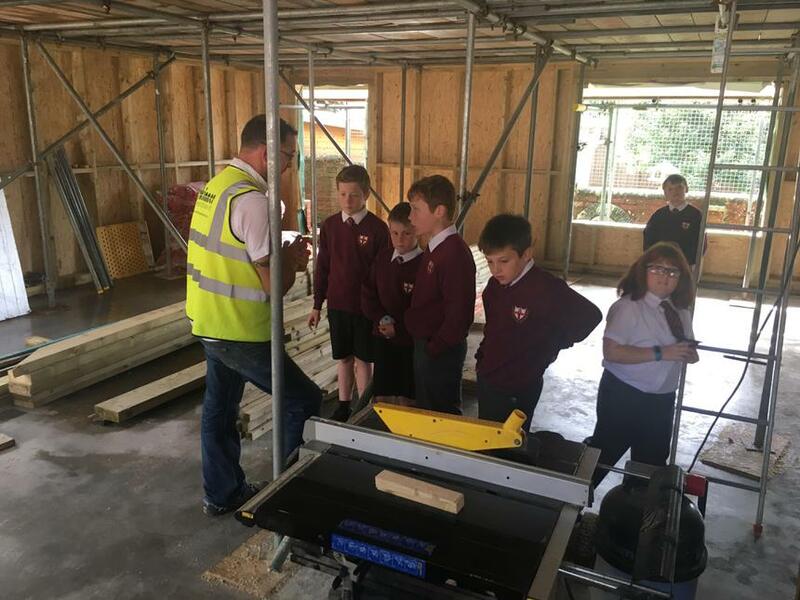 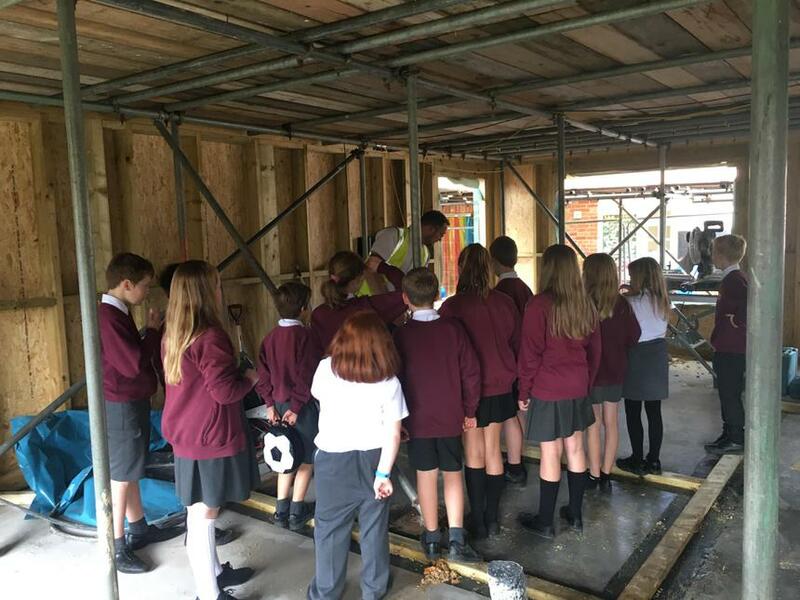 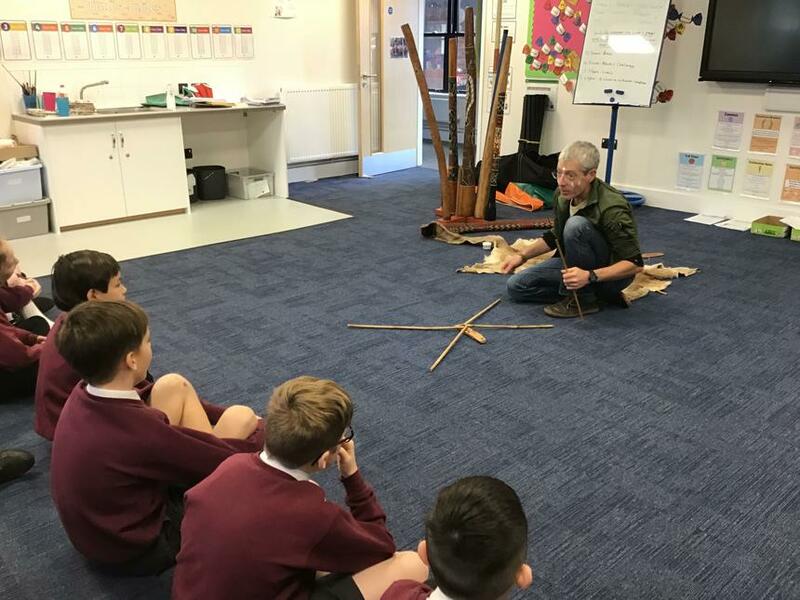 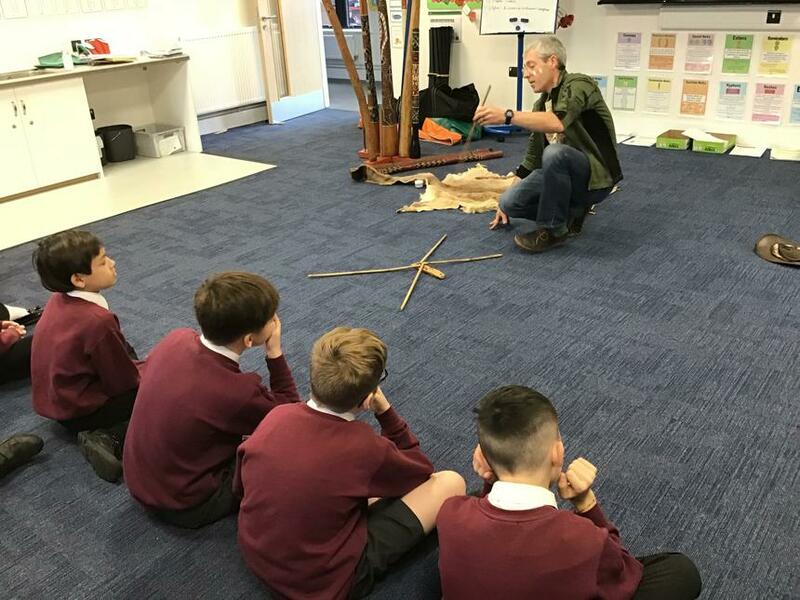 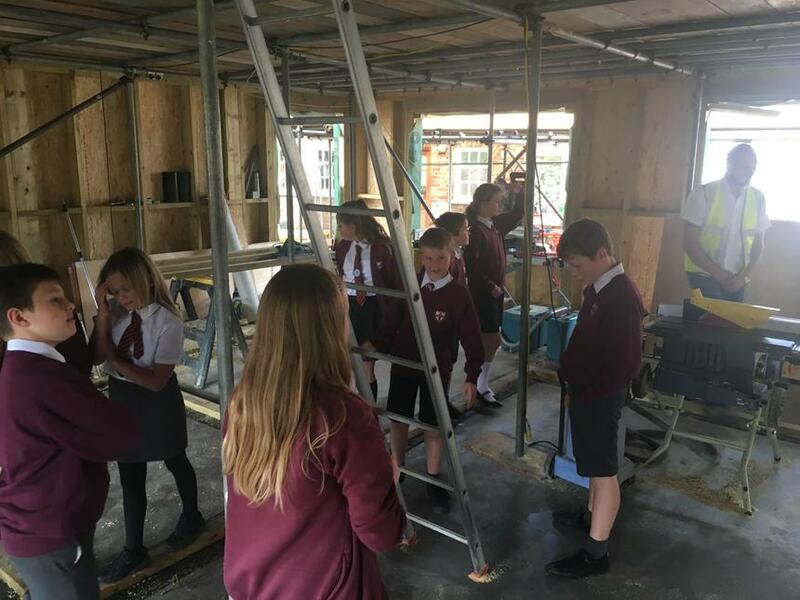 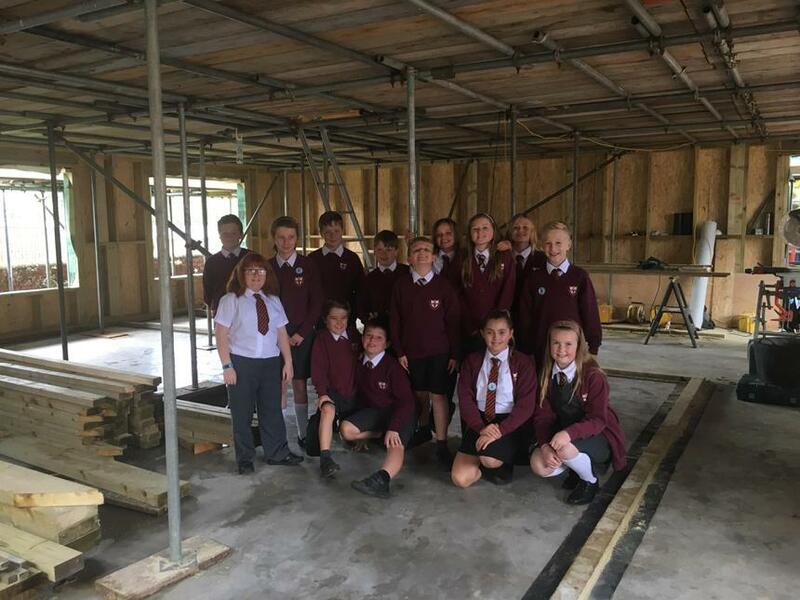 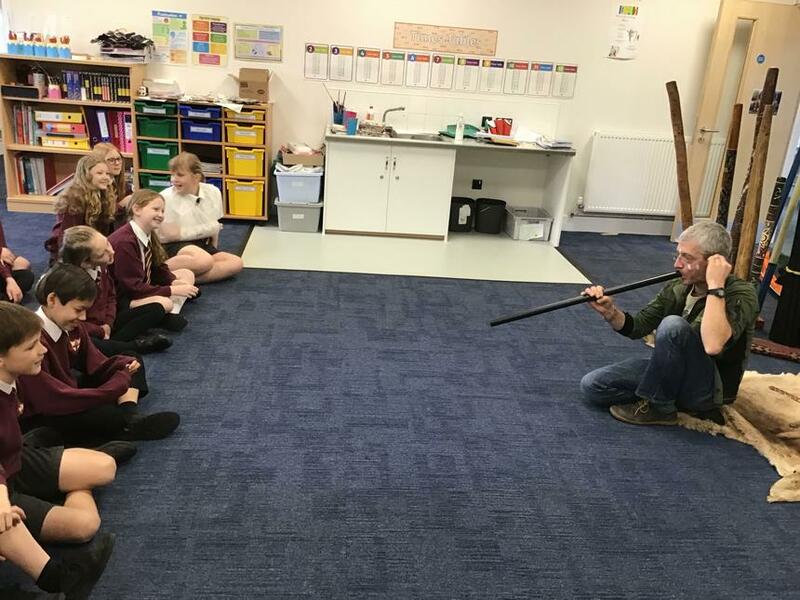 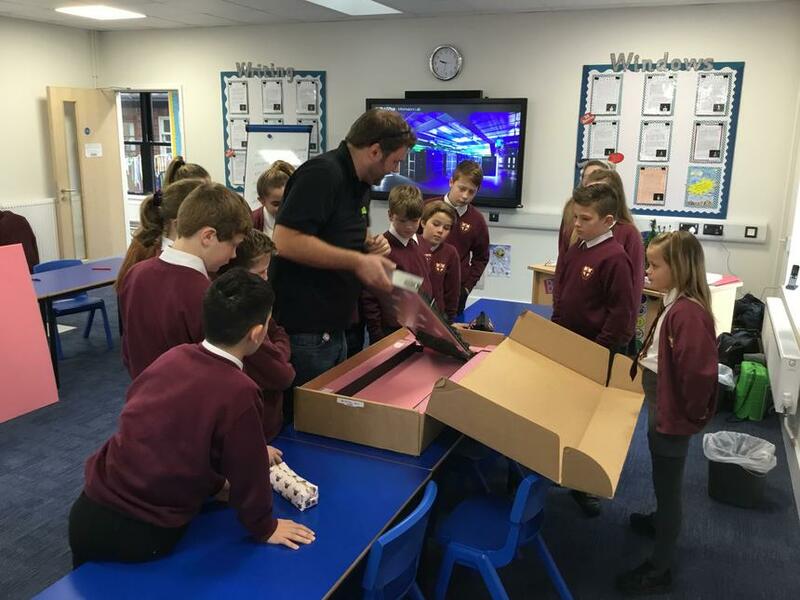 Simon showed us around and explained to the class where each room was going to be and how different materials were being used to support the structure and insulate the building. 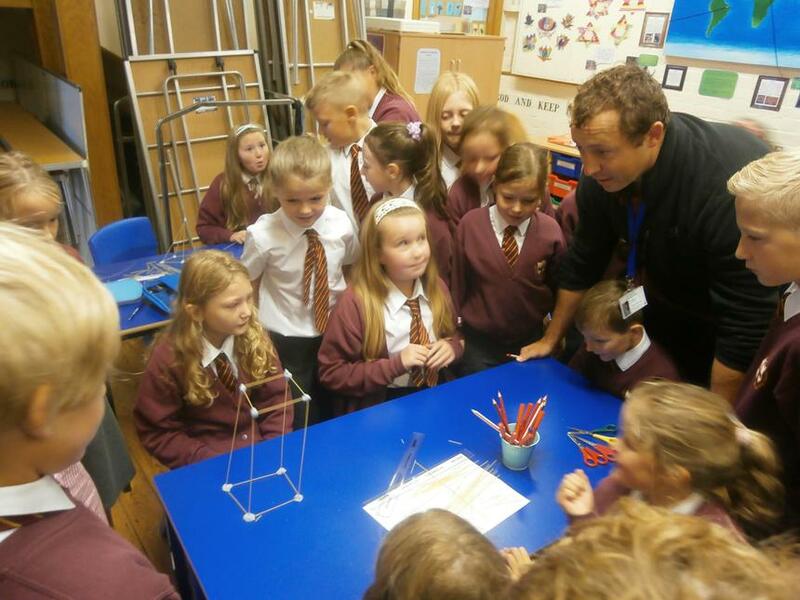 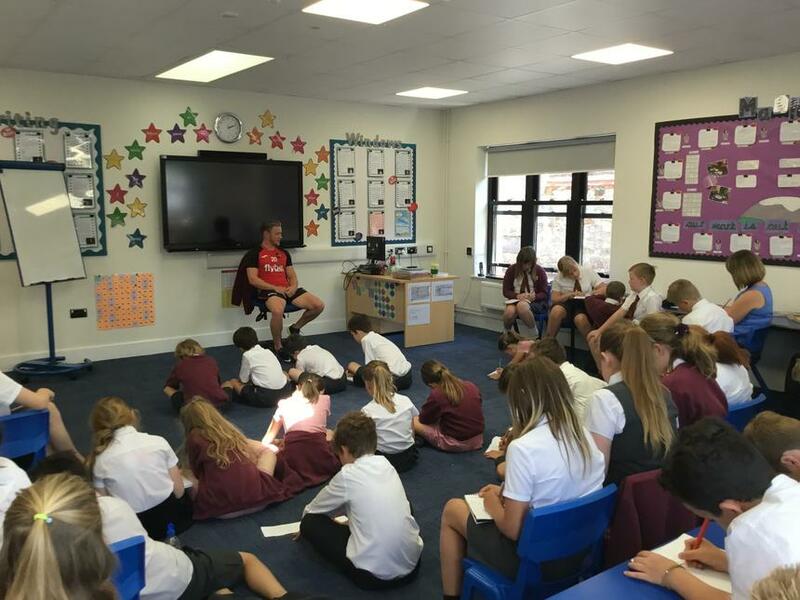 The children interviewed him and asked some very exciting questions which he was able to answer. 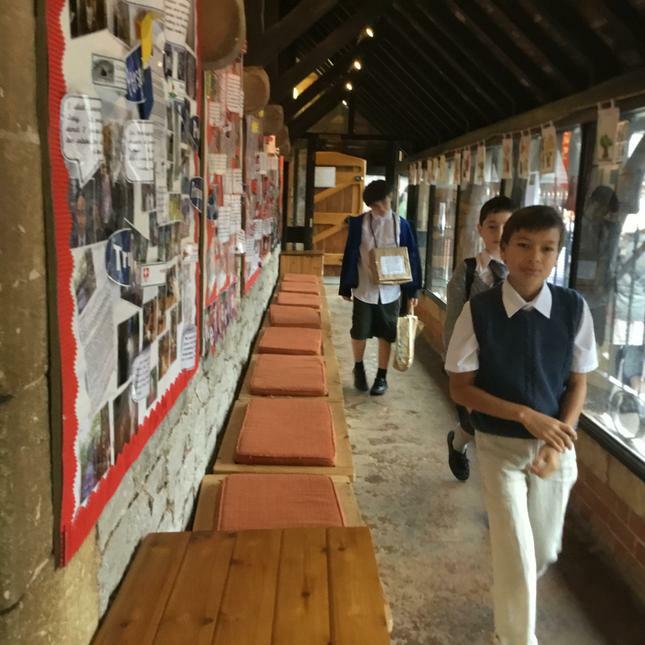 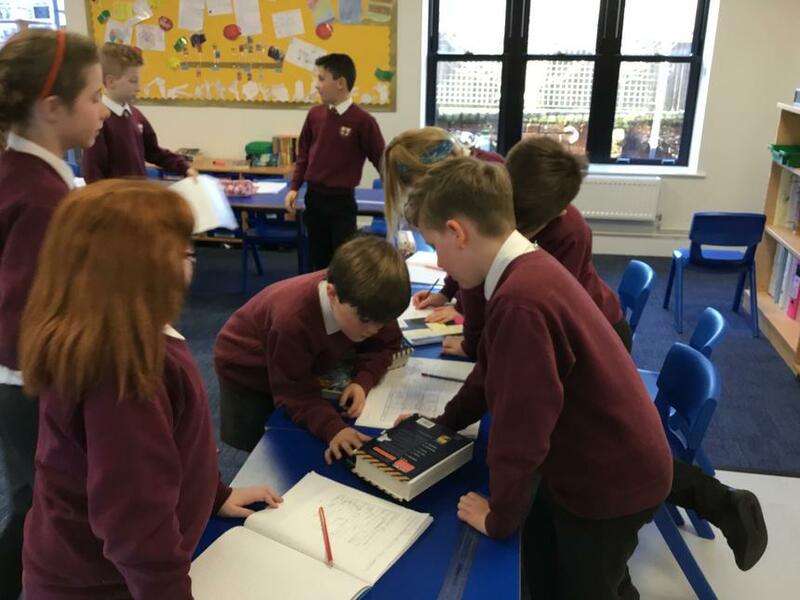 From this, the children wrote up their interviews and created site plans, looking carefully at the original drawings that were conducted before the building work began, using their understanding of scale and ratio to support this. 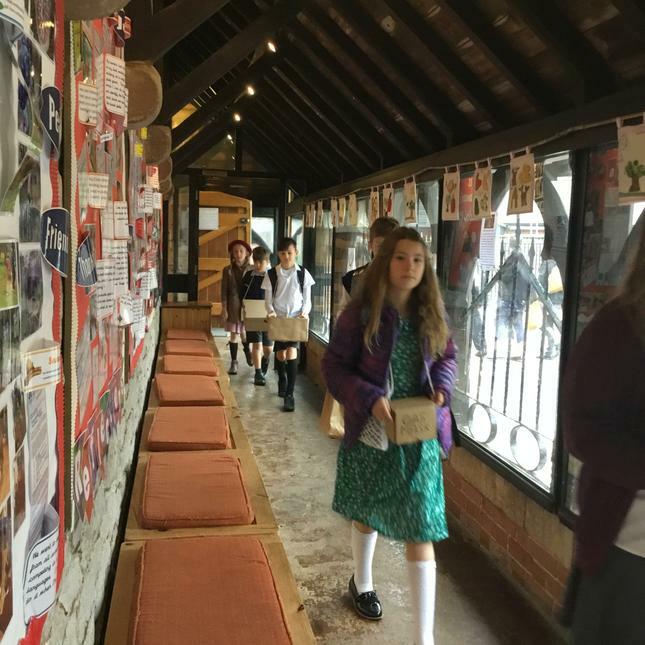 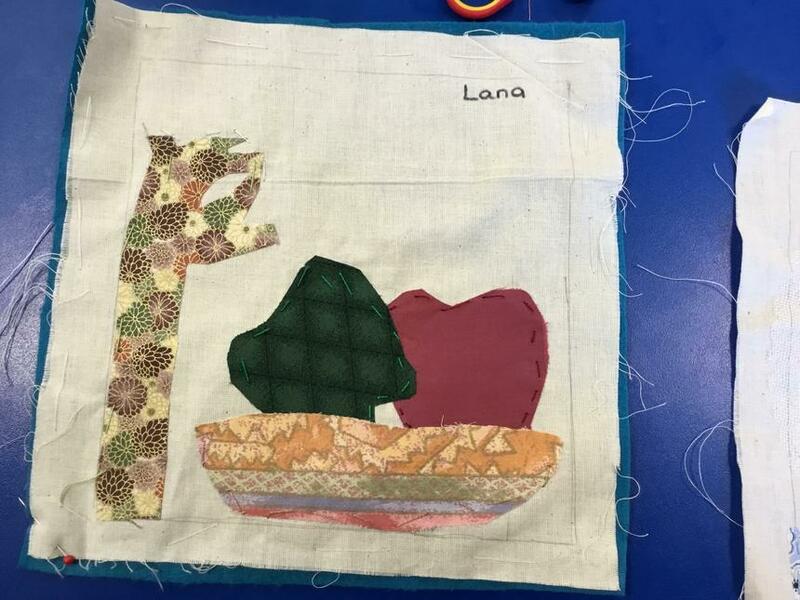 Class 4 have been very lucky to have been involved with a project with the local community in which they designed, made and evaulated a quilt linking to the seasons seen at Killerton Orchards. 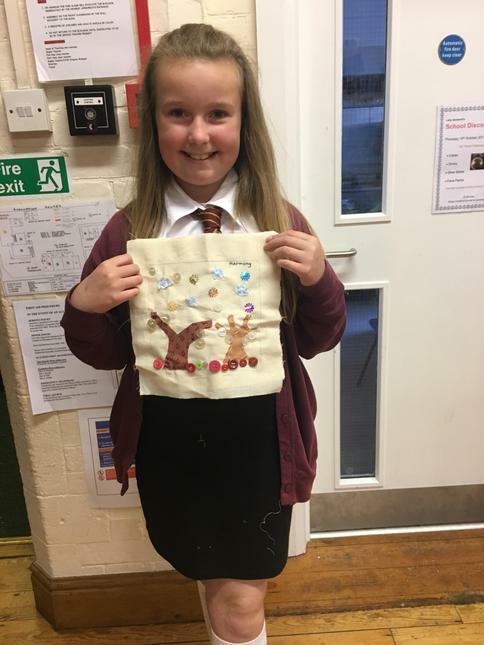 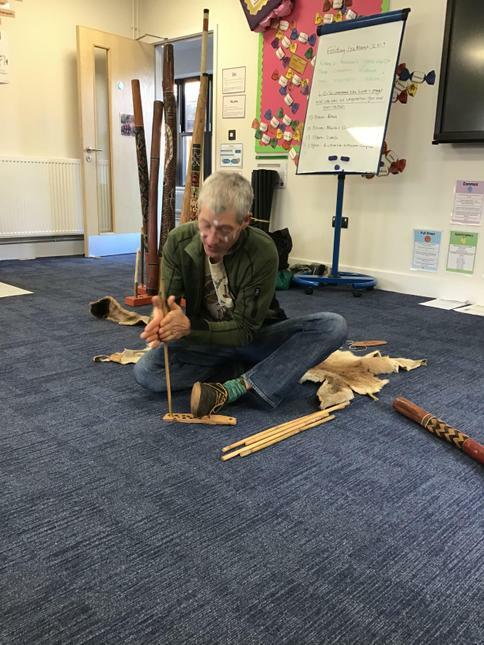 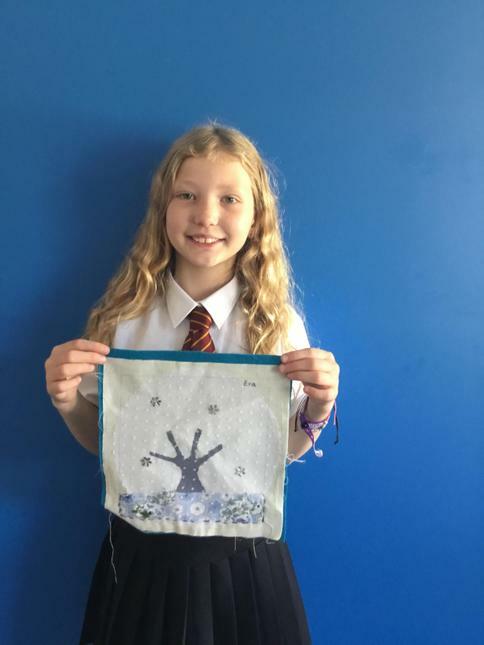 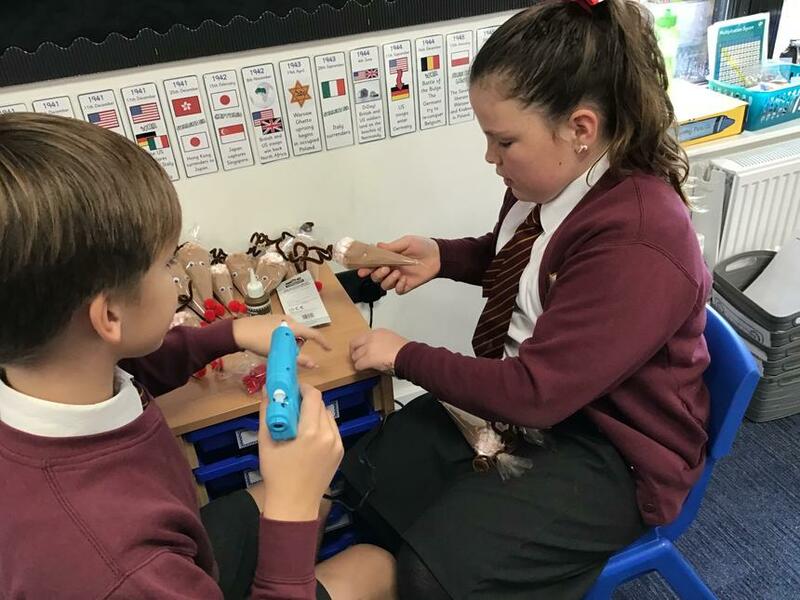 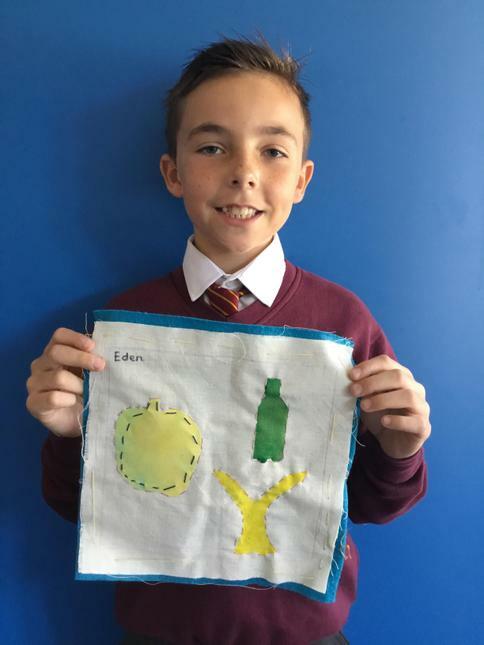 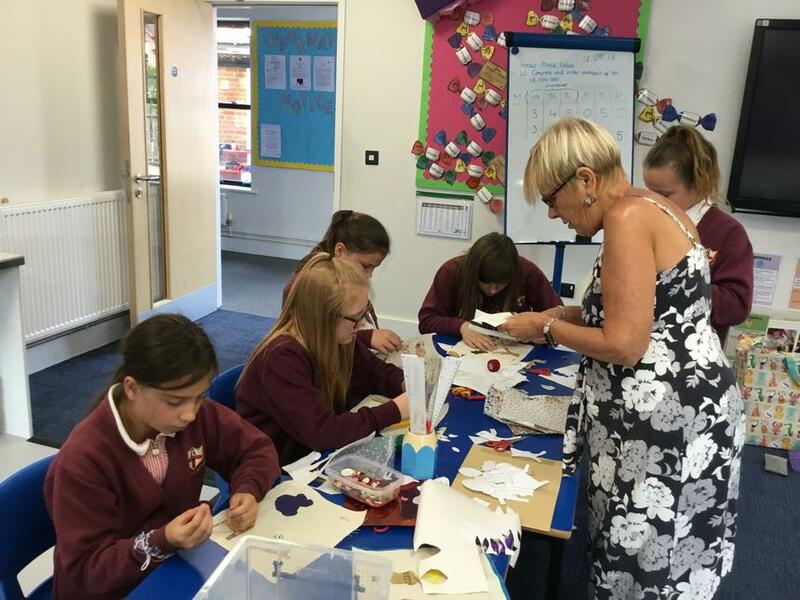 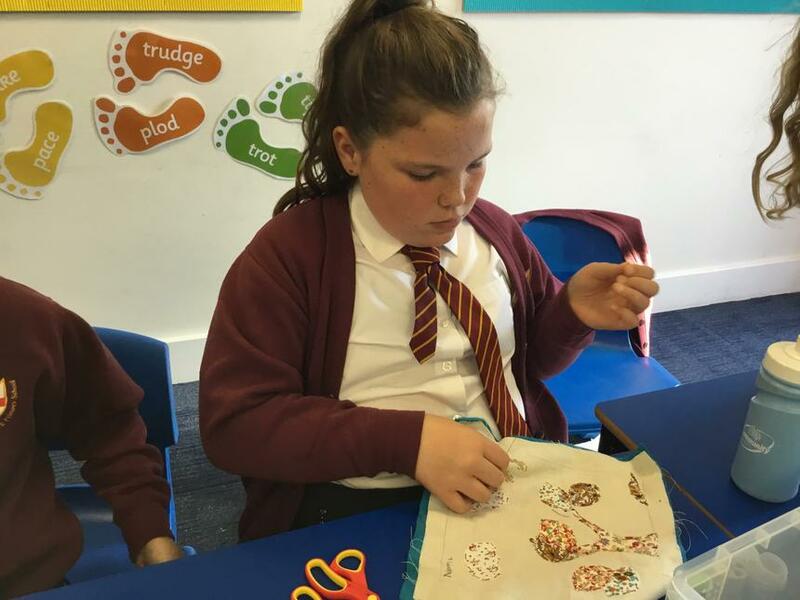 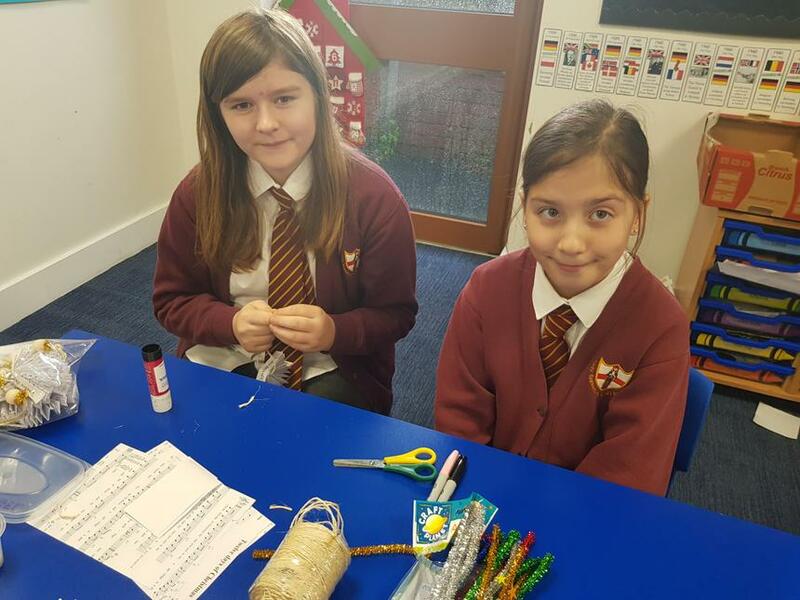 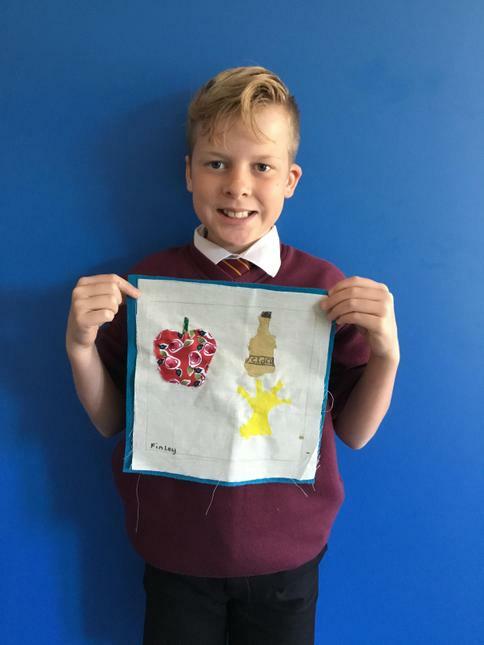 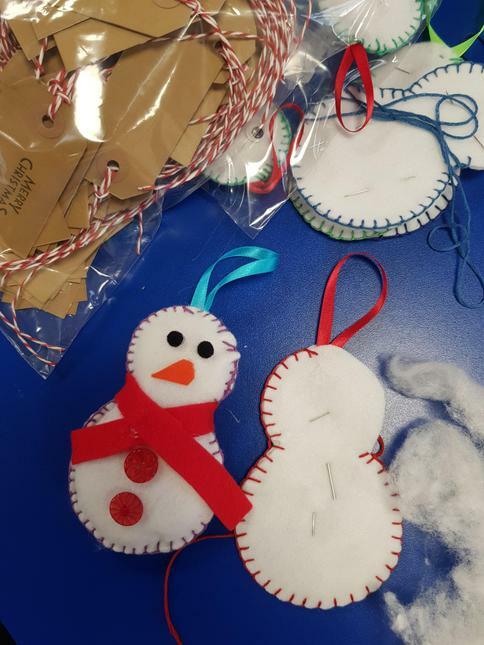 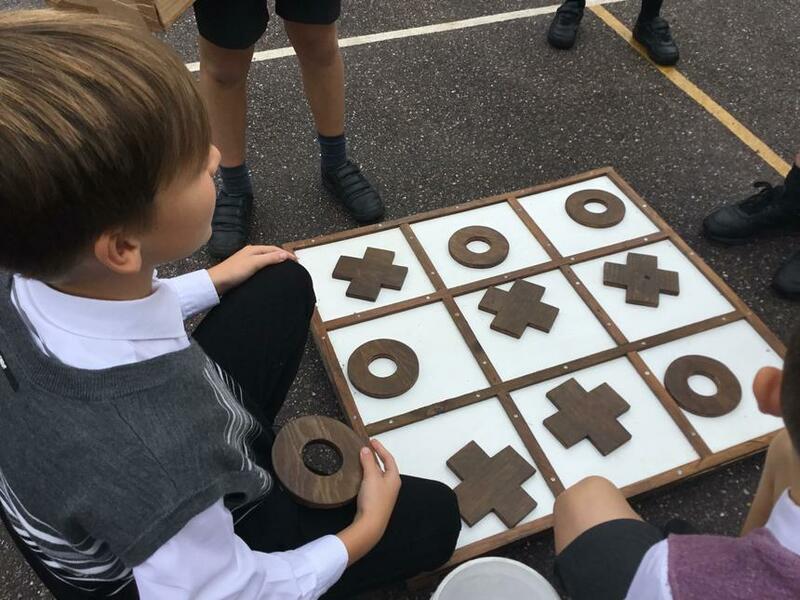 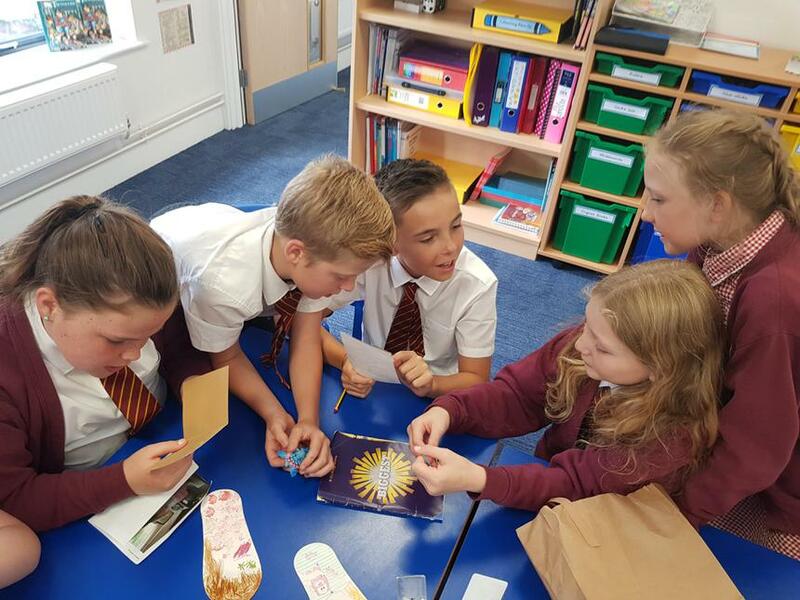 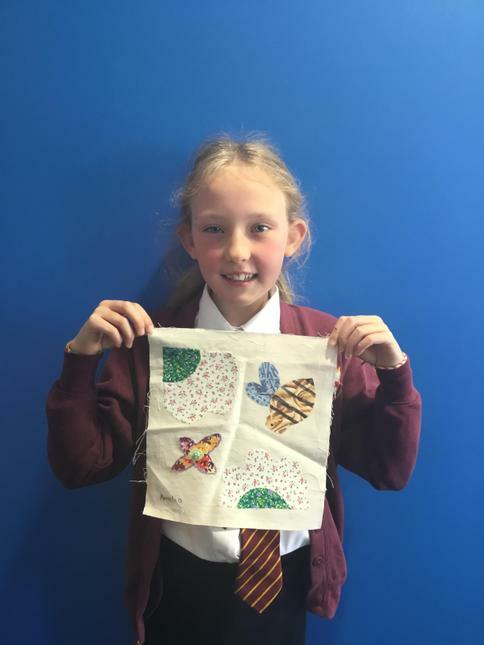 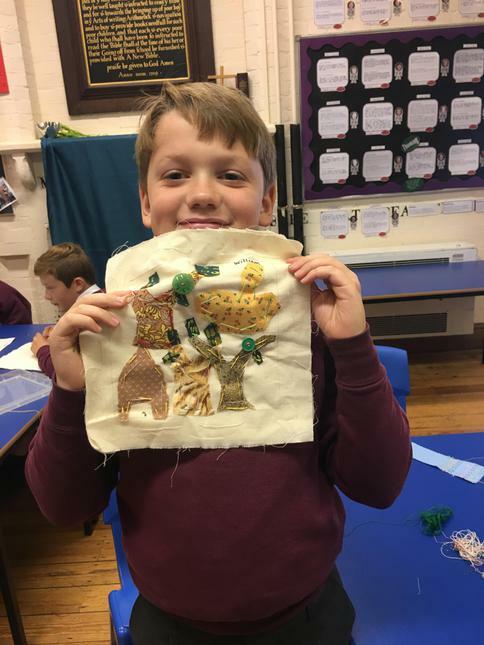 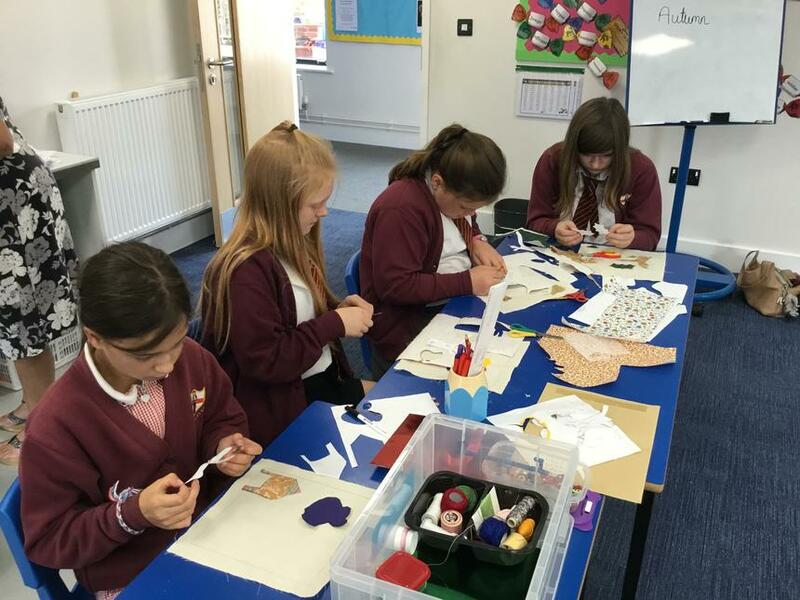 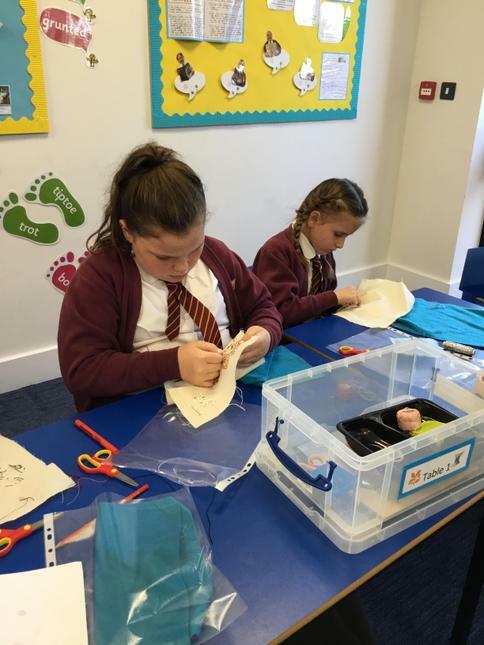 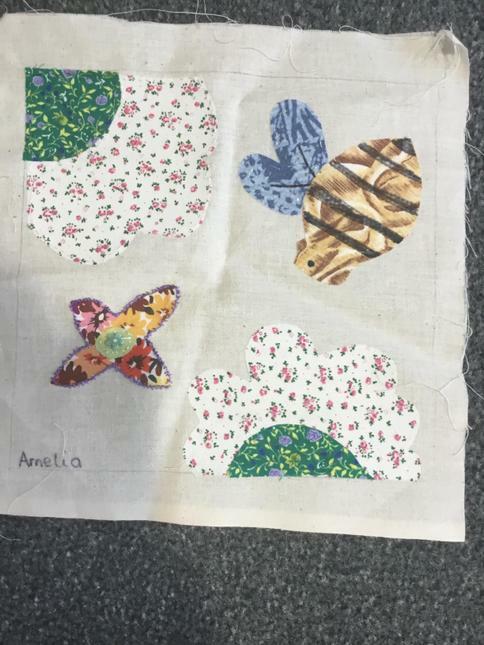 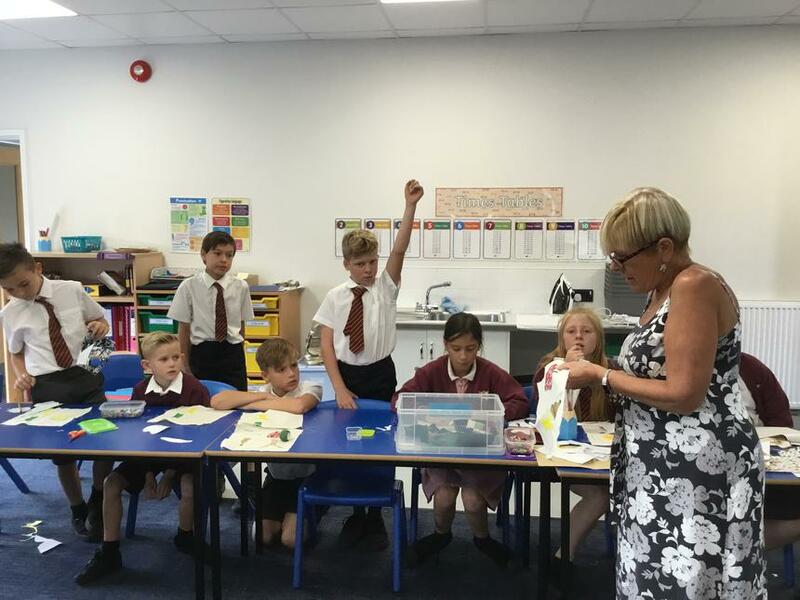 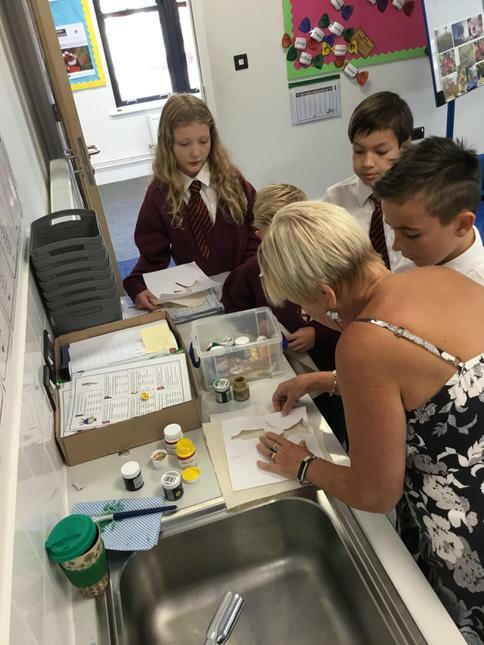 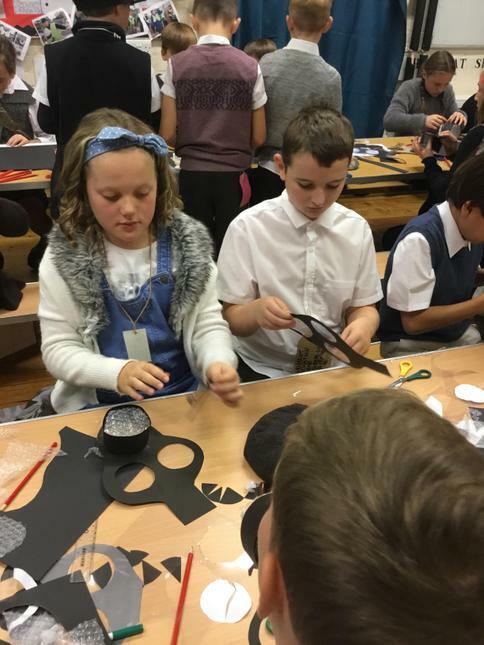 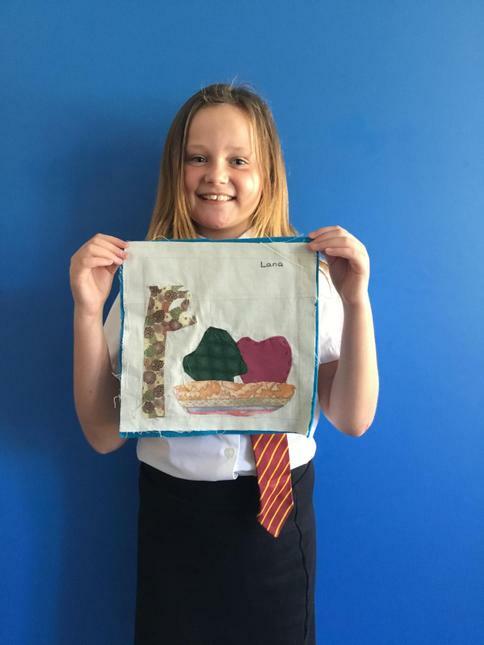 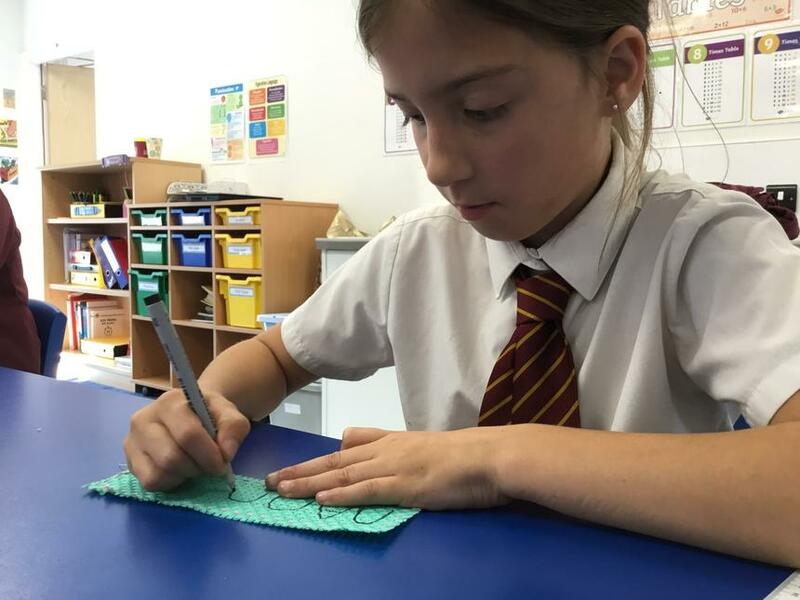 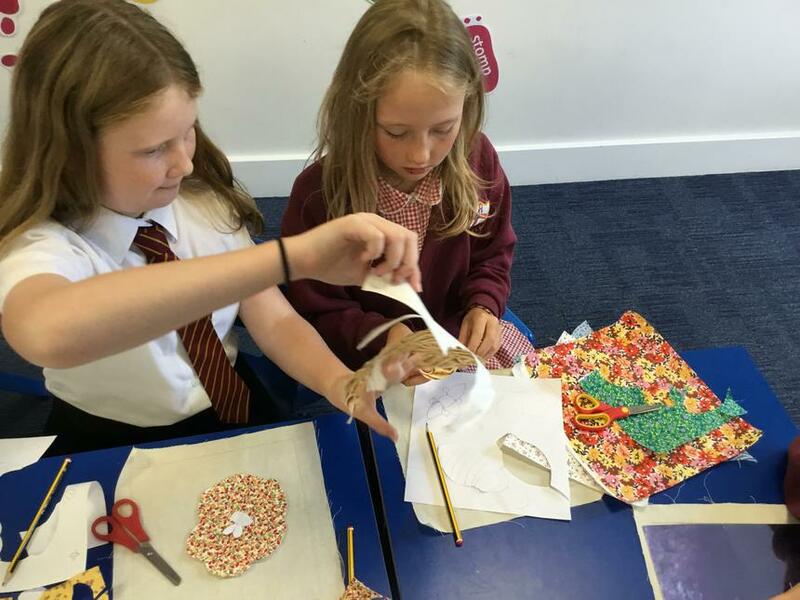 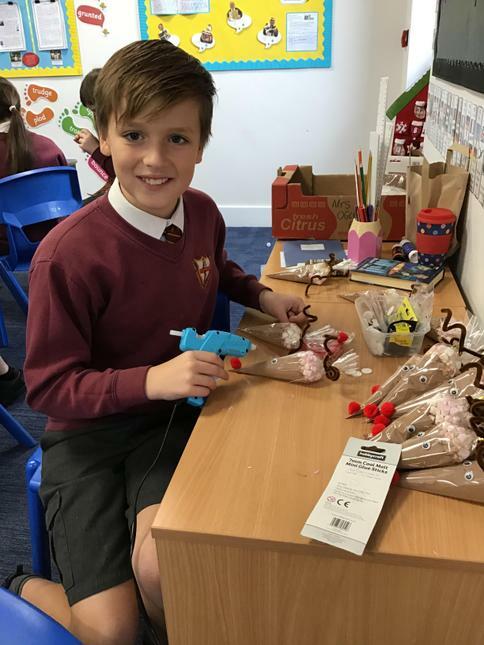 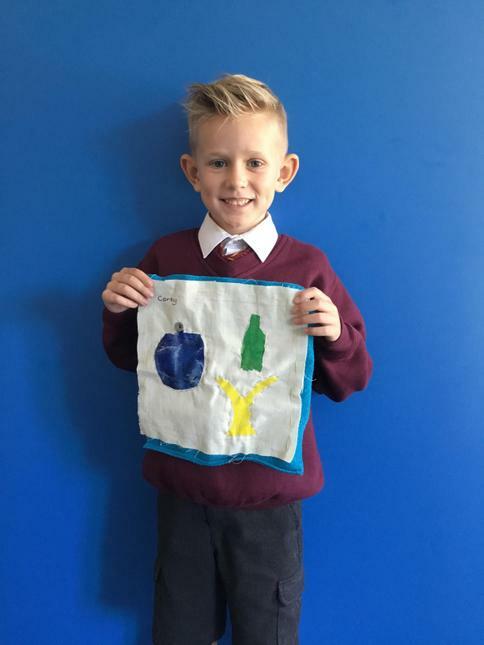 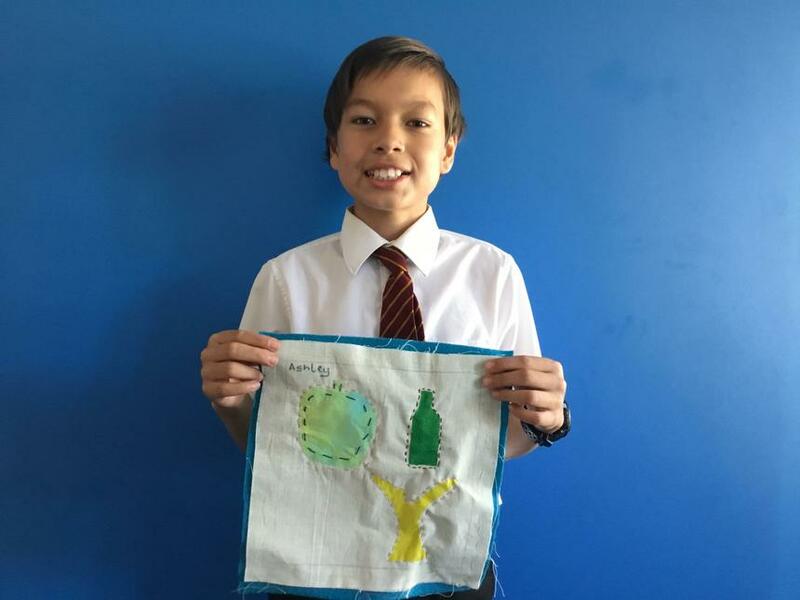 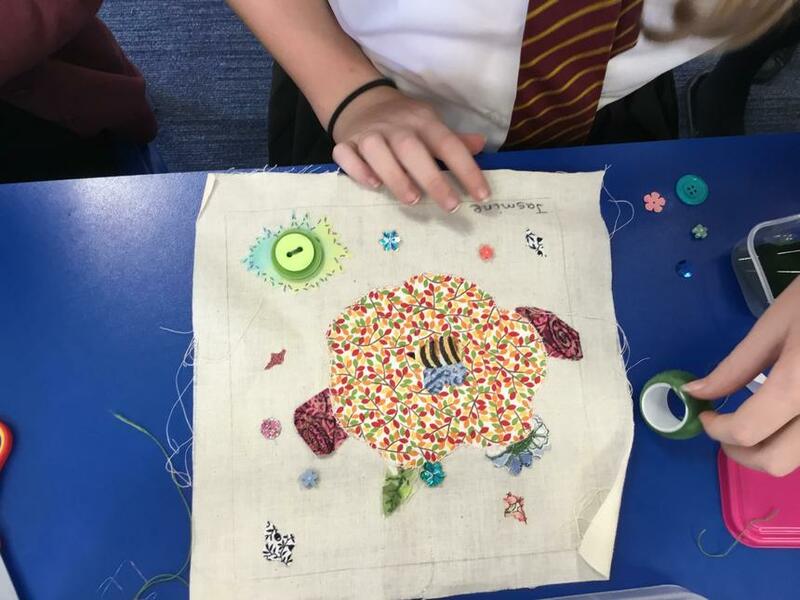 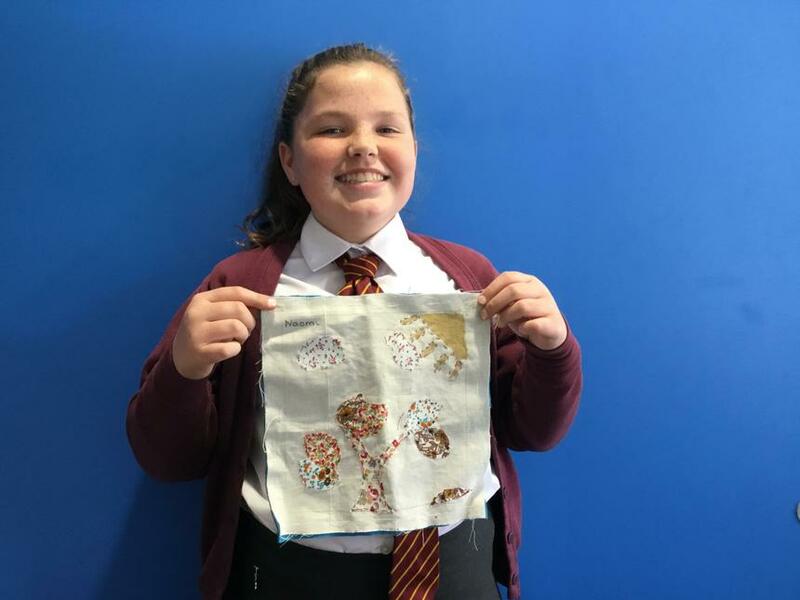 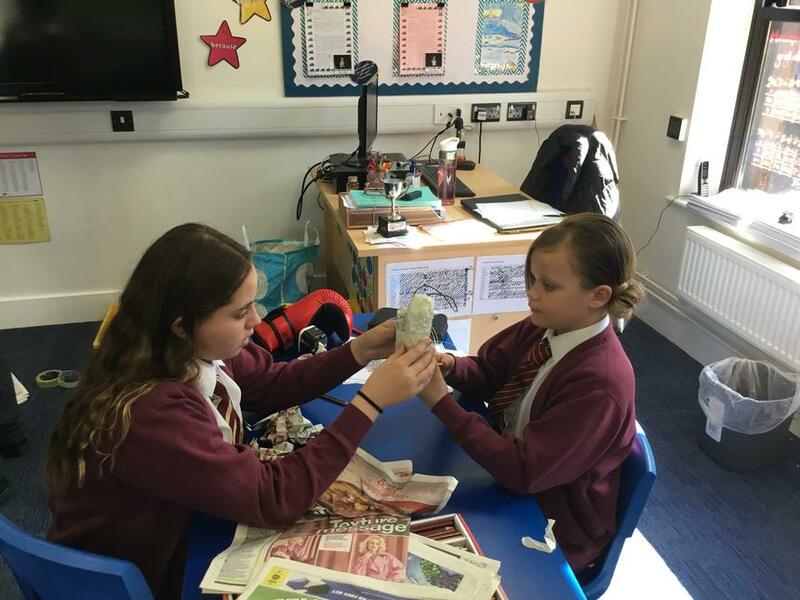 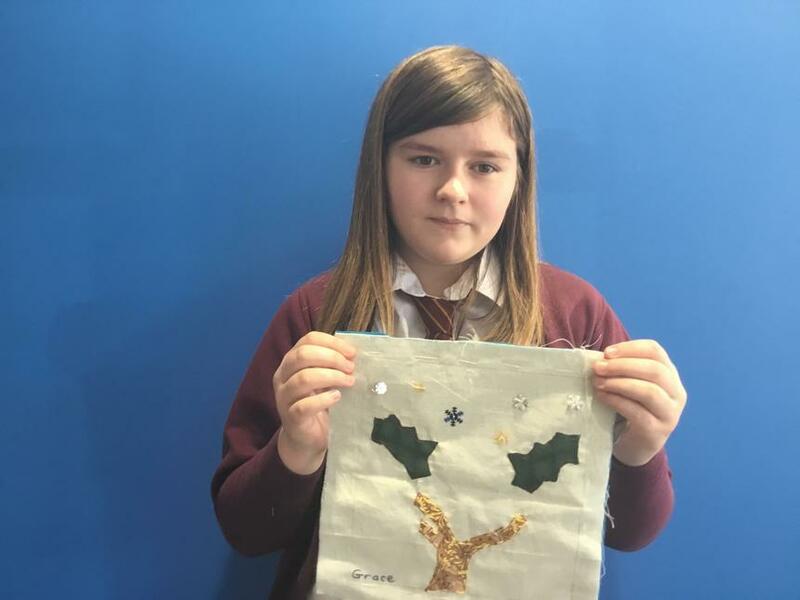 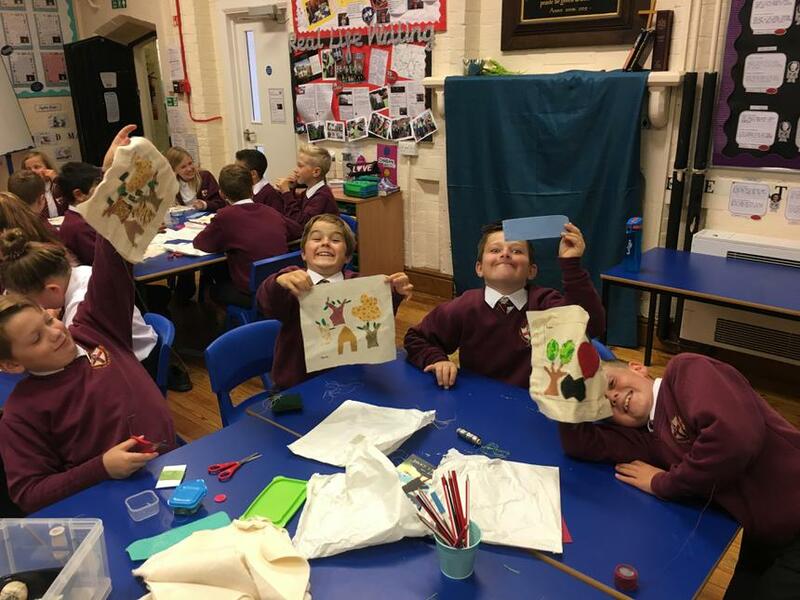 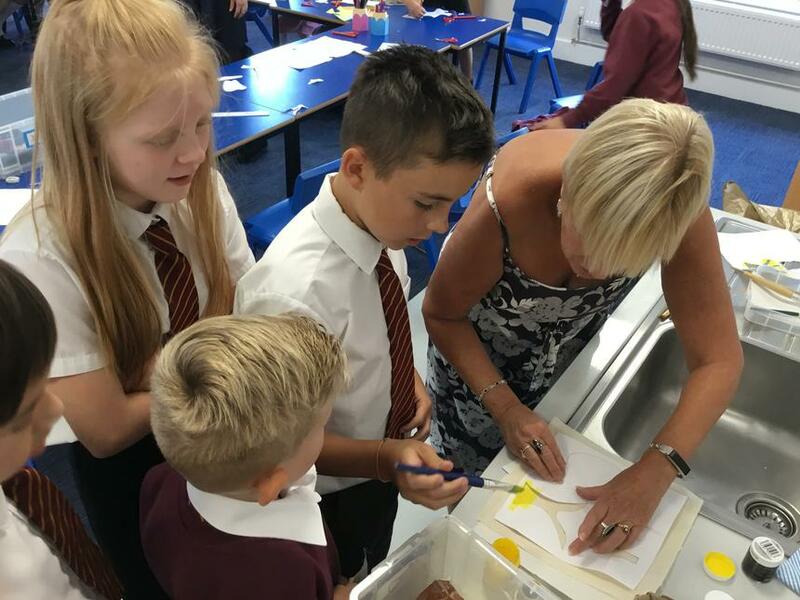 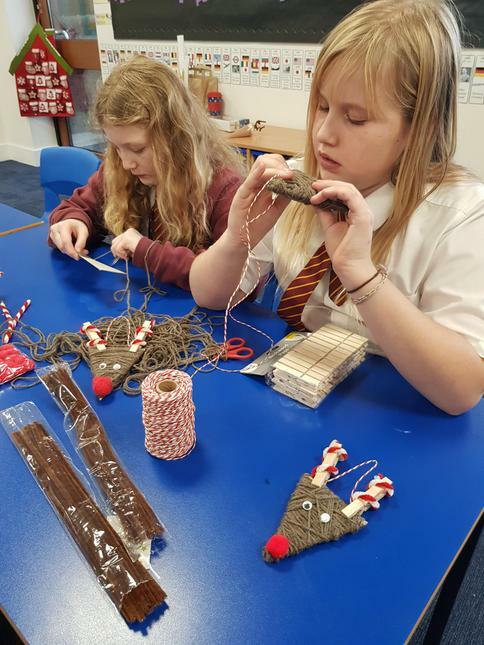 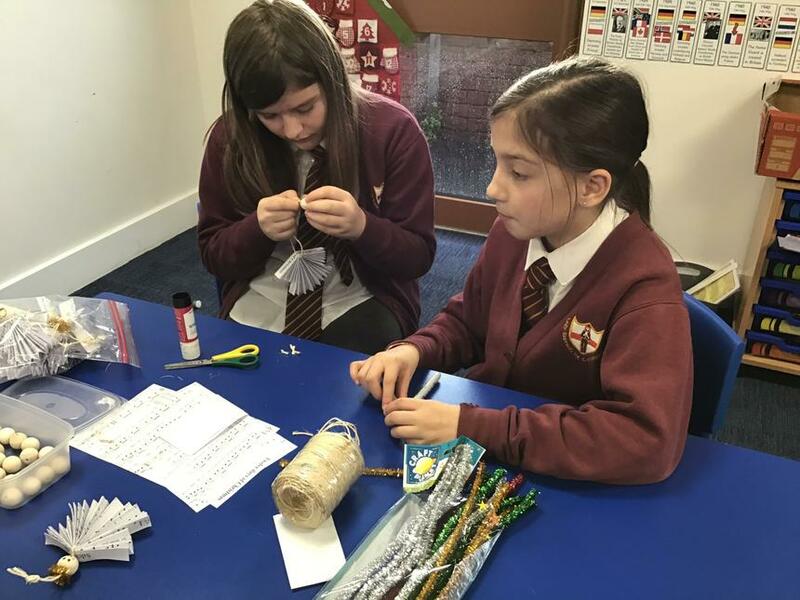 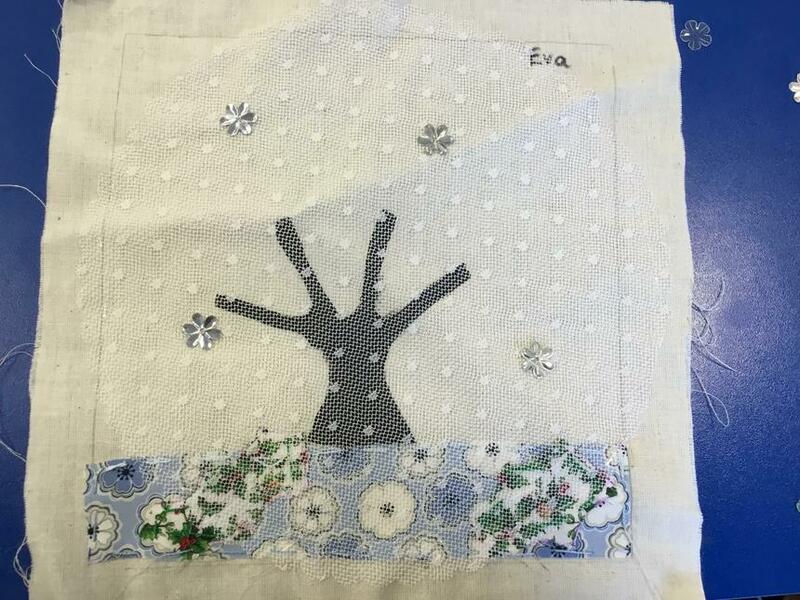 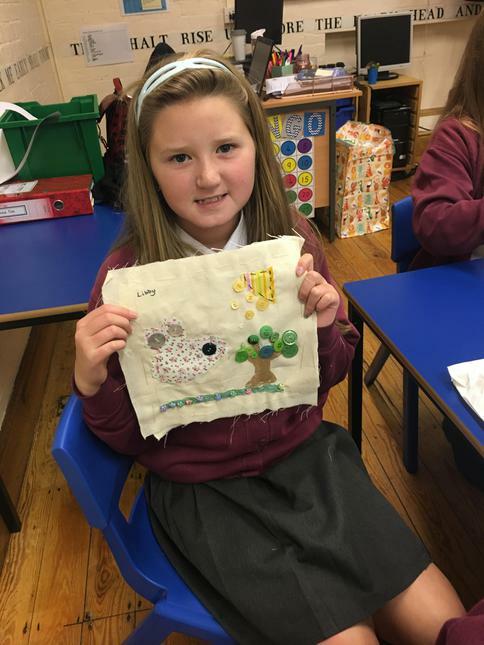 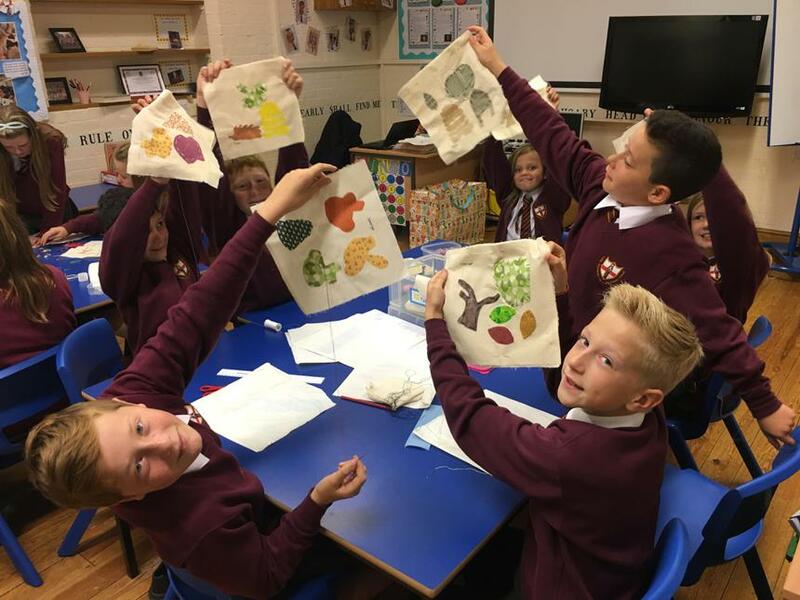 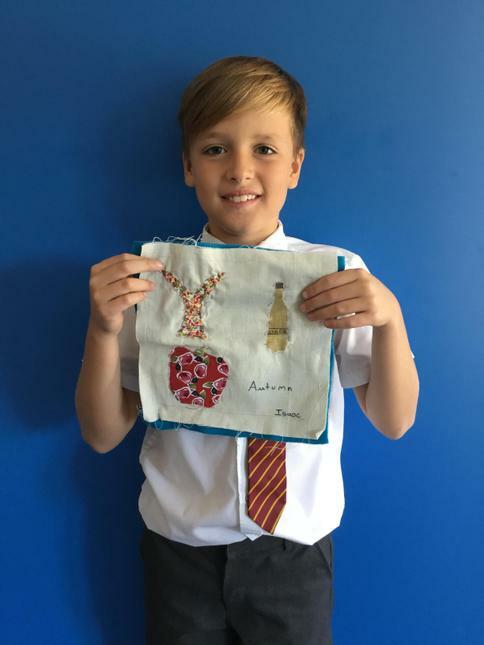 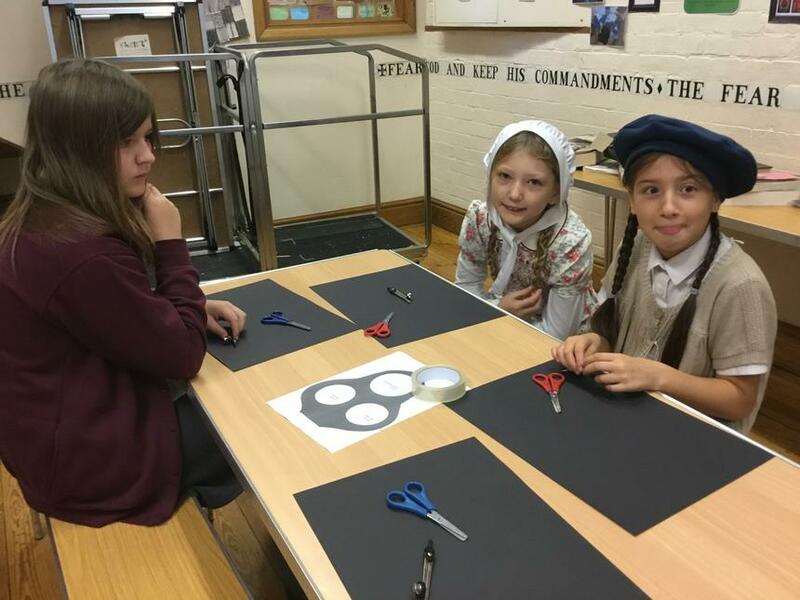 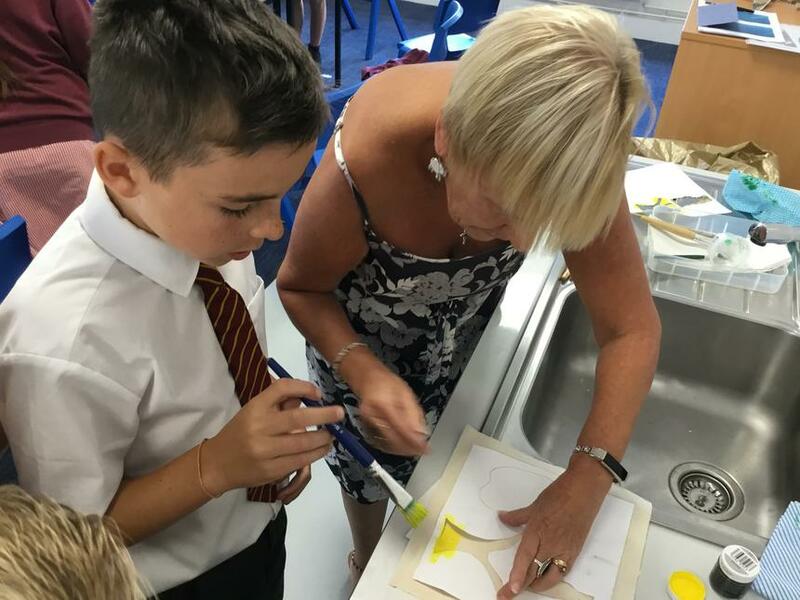 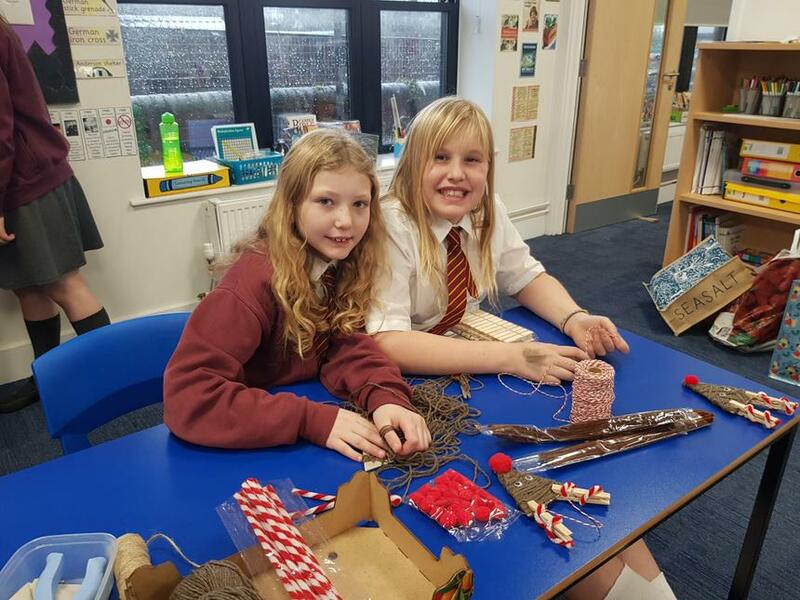 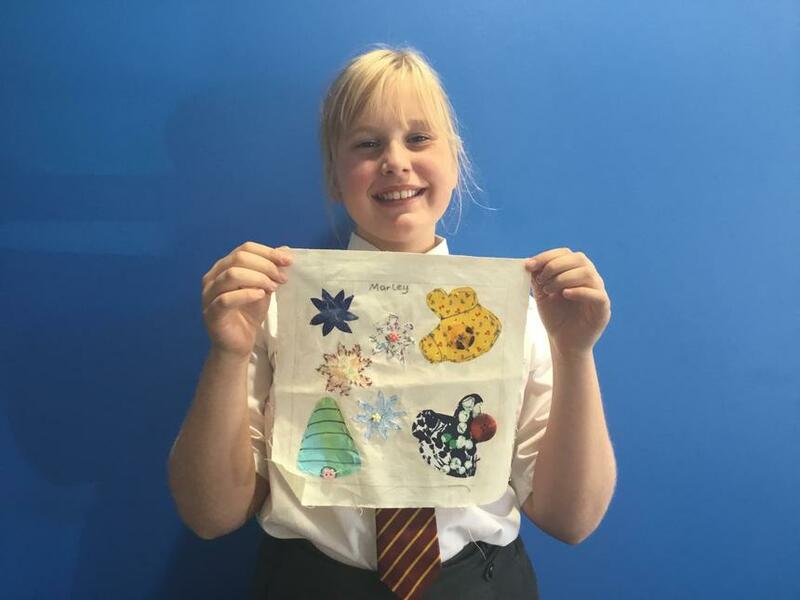 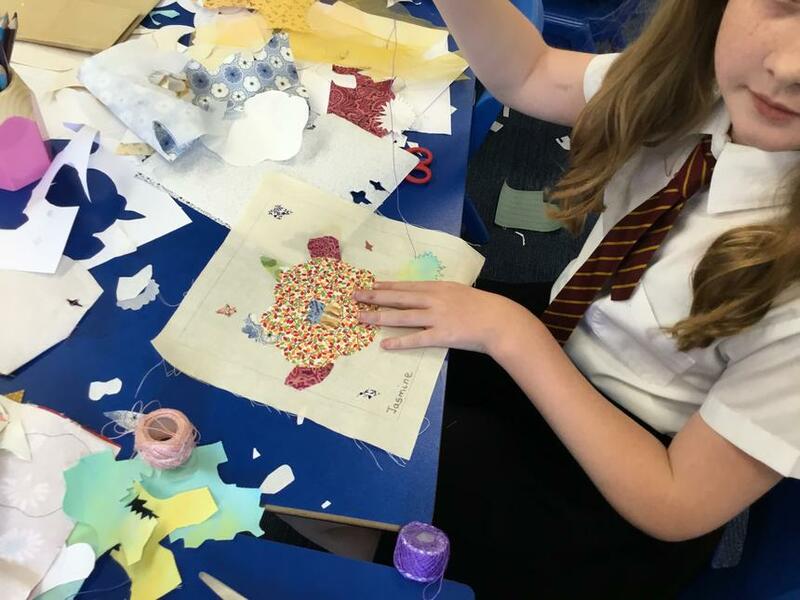 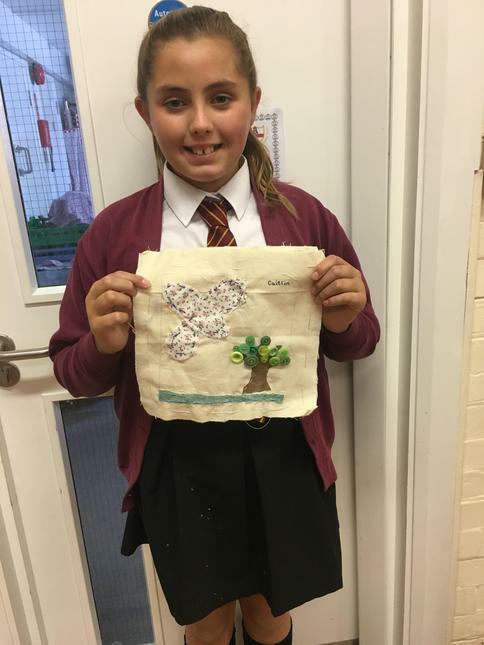 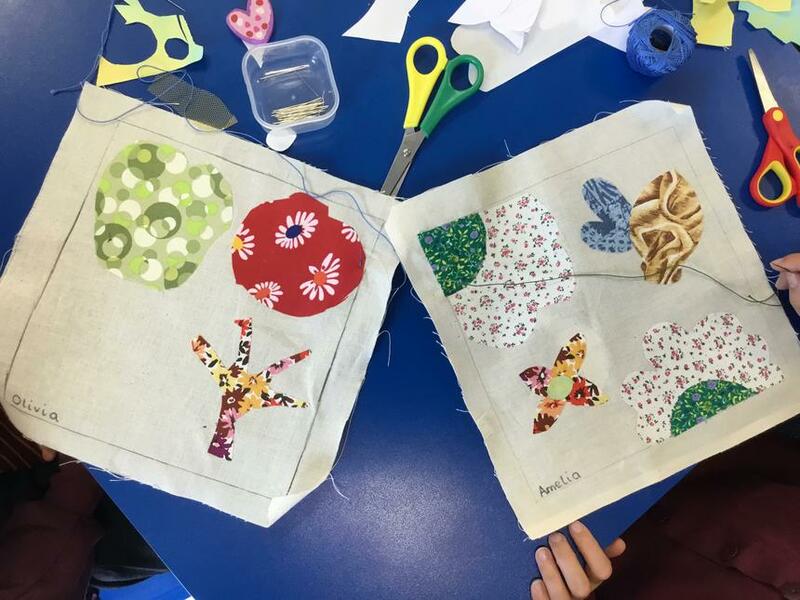 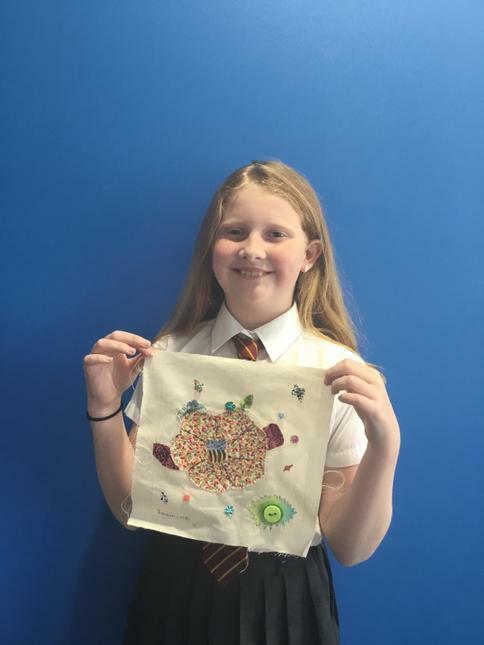 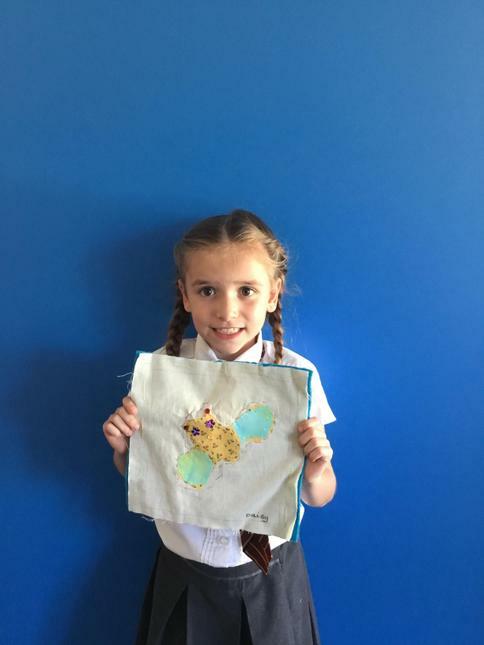 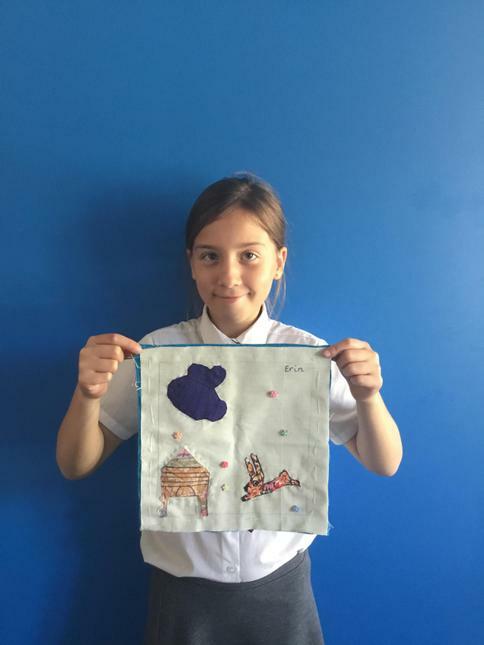 The children were helped with the project by Gail who showed the children how to do basic stitching, as well as how to bond material to their quilts using an iron. 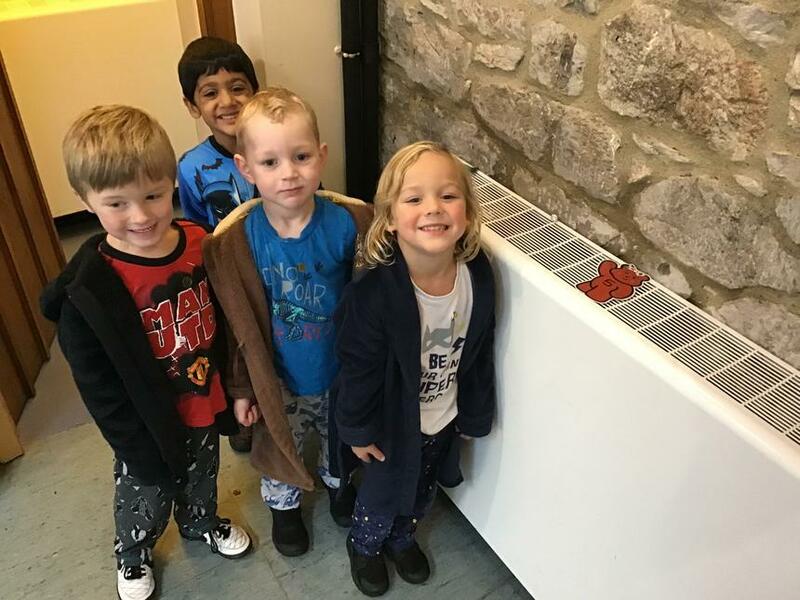 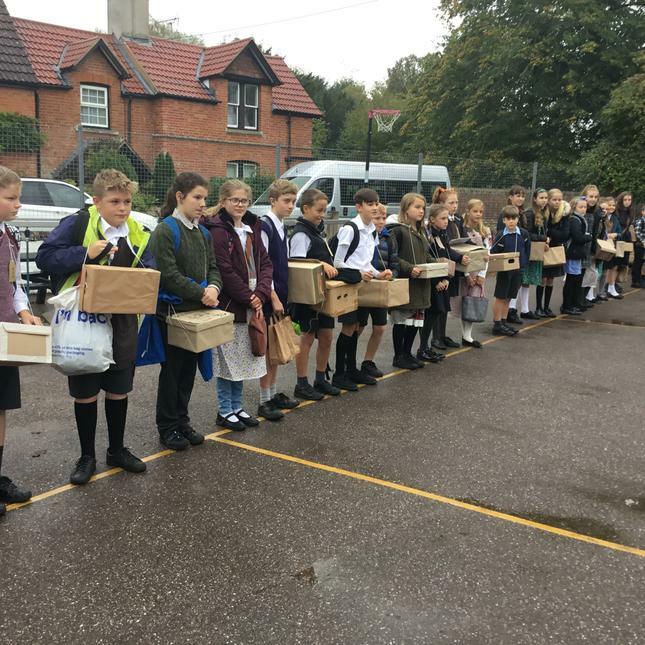 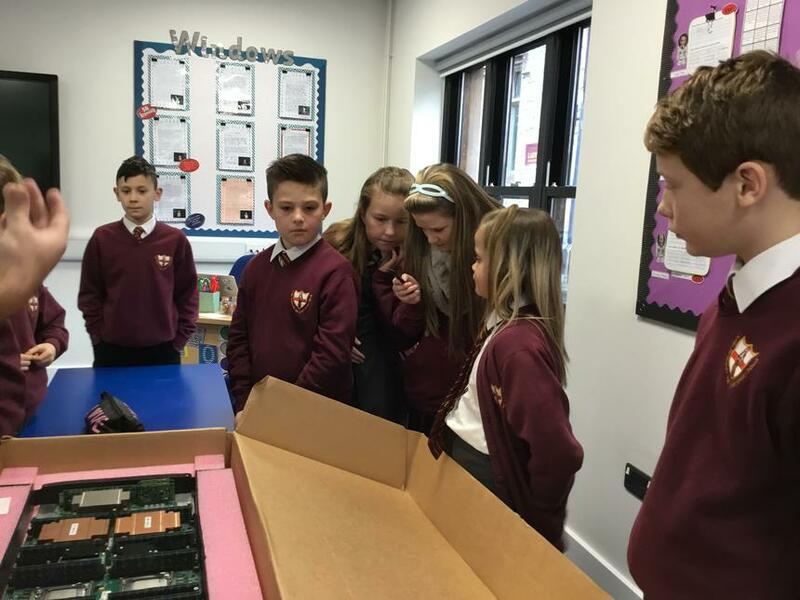 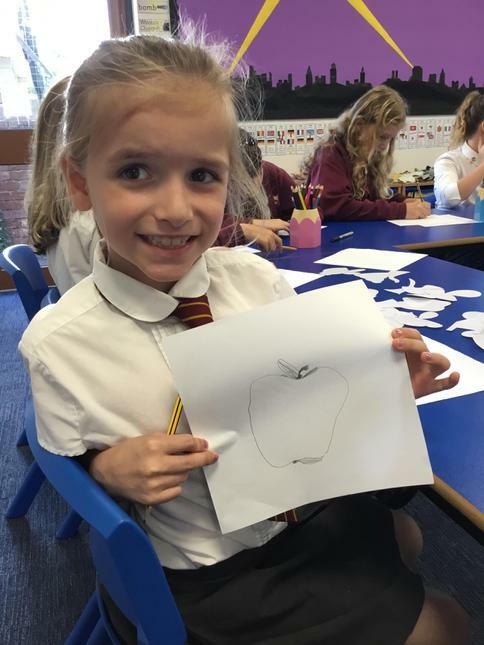 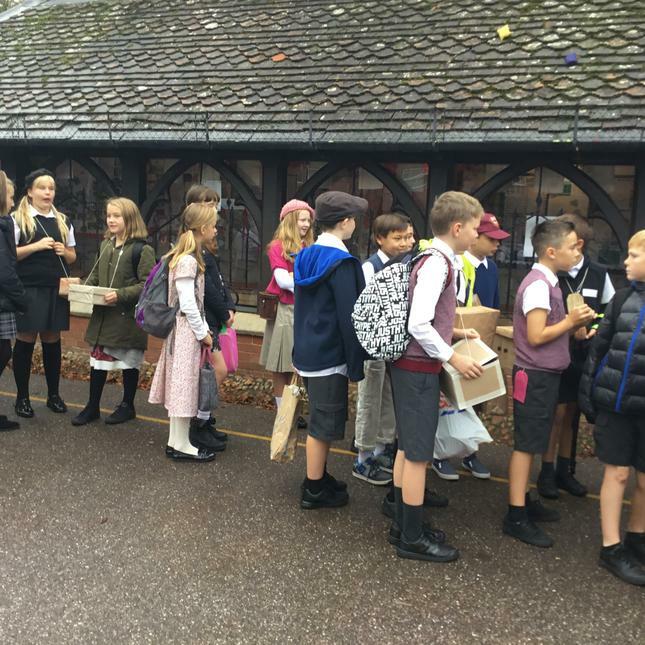 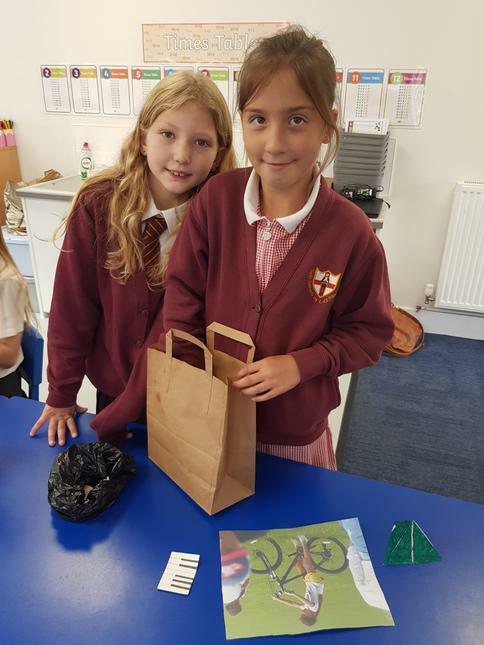 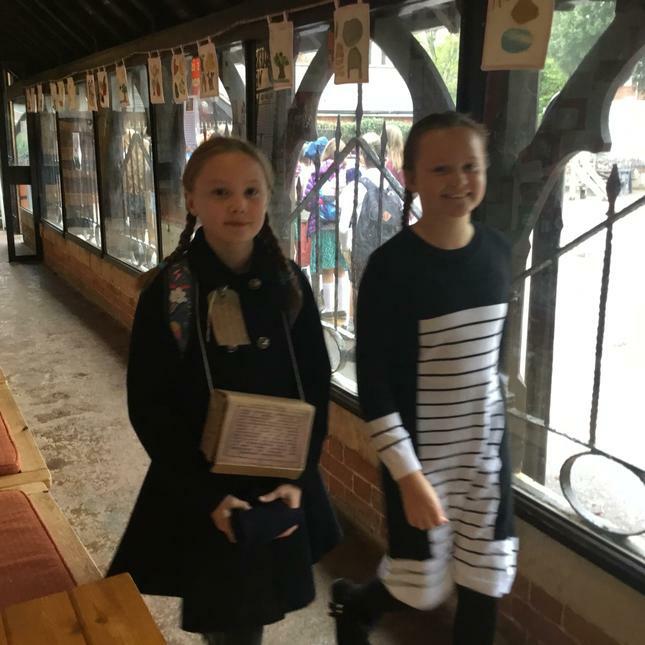 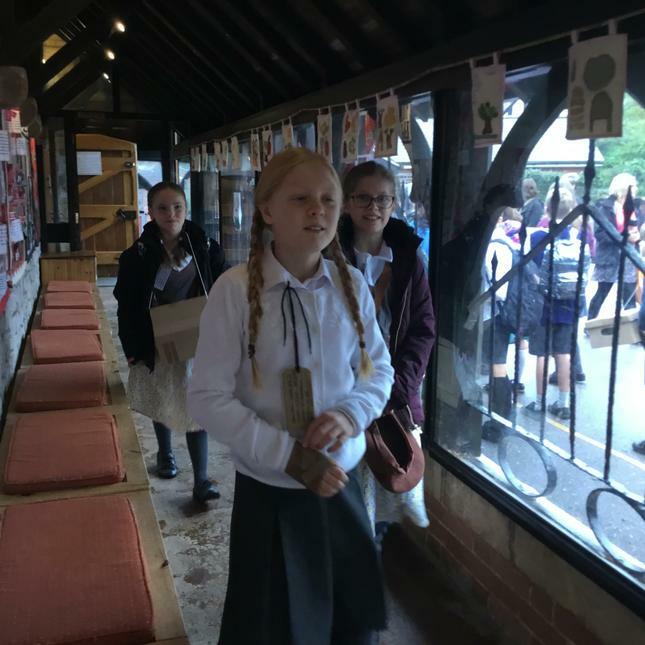 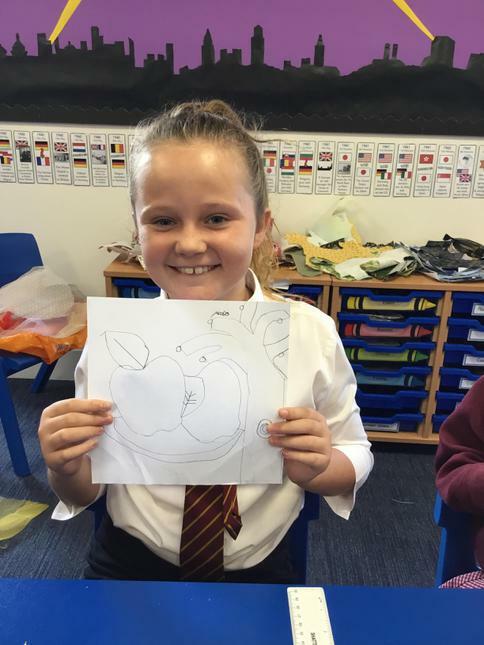 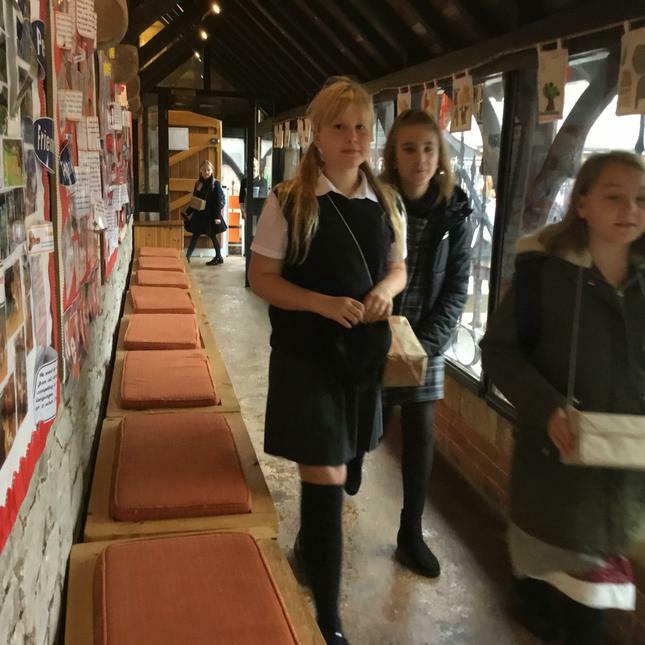 Following this, the children visited the orchards where they also took part in workshops, were able to pick apples and even try the apple juice made by the apples pressed on-site. 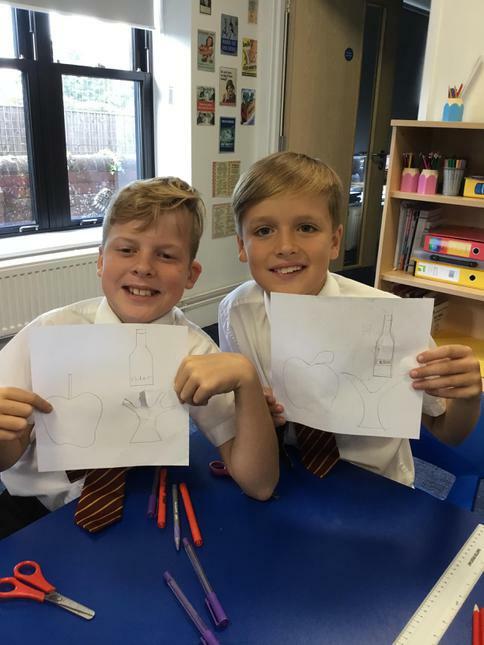 How would you design a sturdy shake tower? 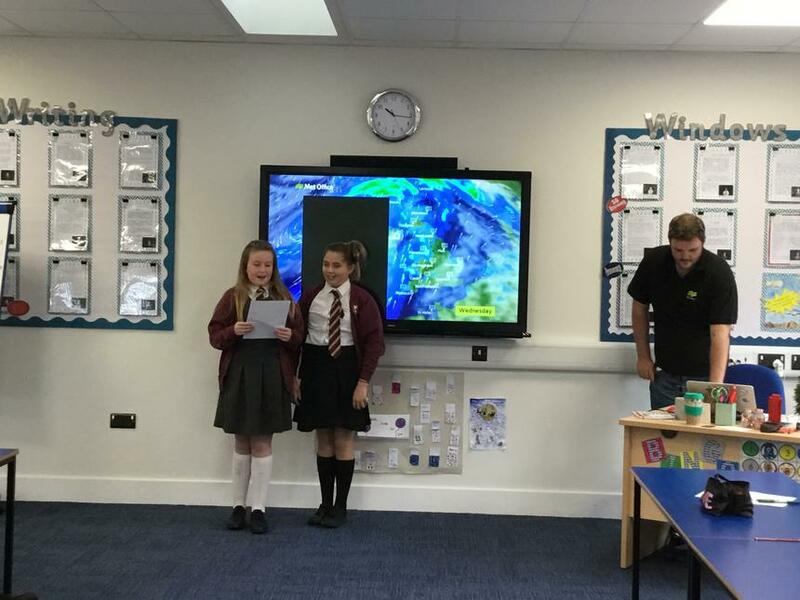 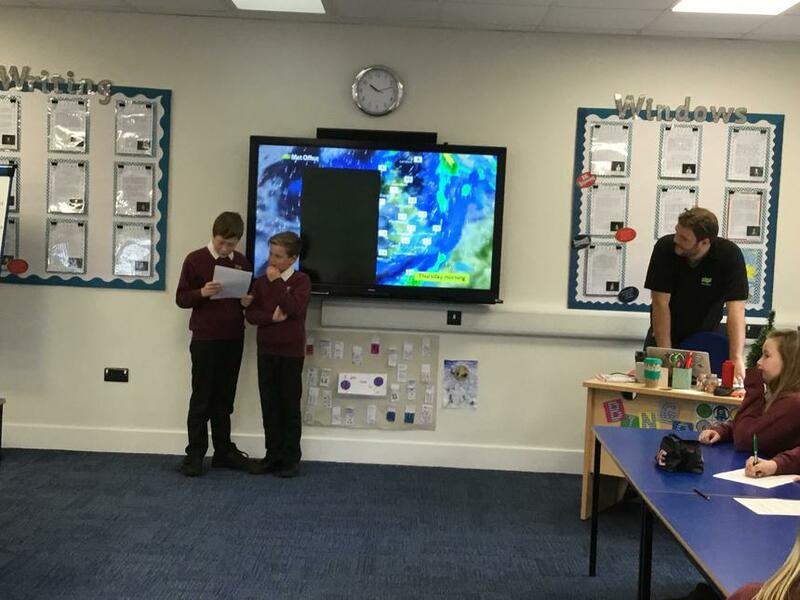 Class 4 have been very busy already this term and have shared loads of interesting facts about our Natural Disasters topic. 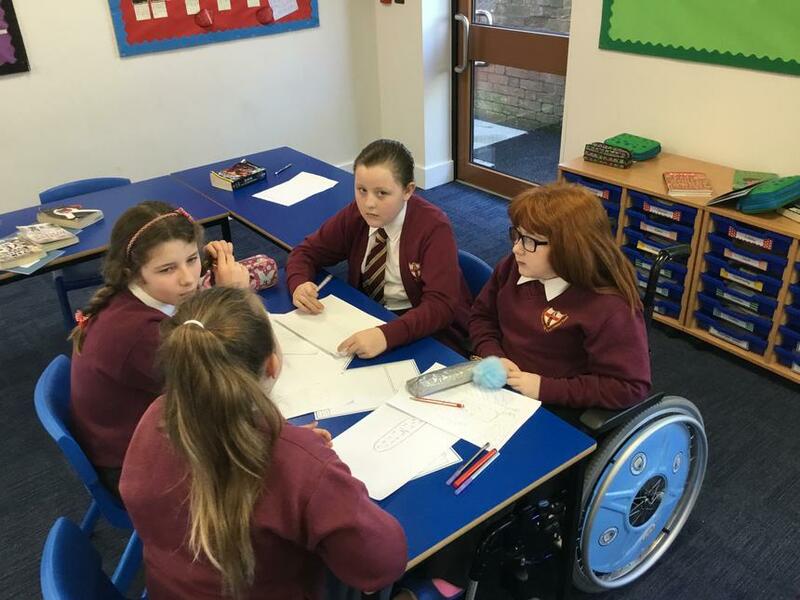 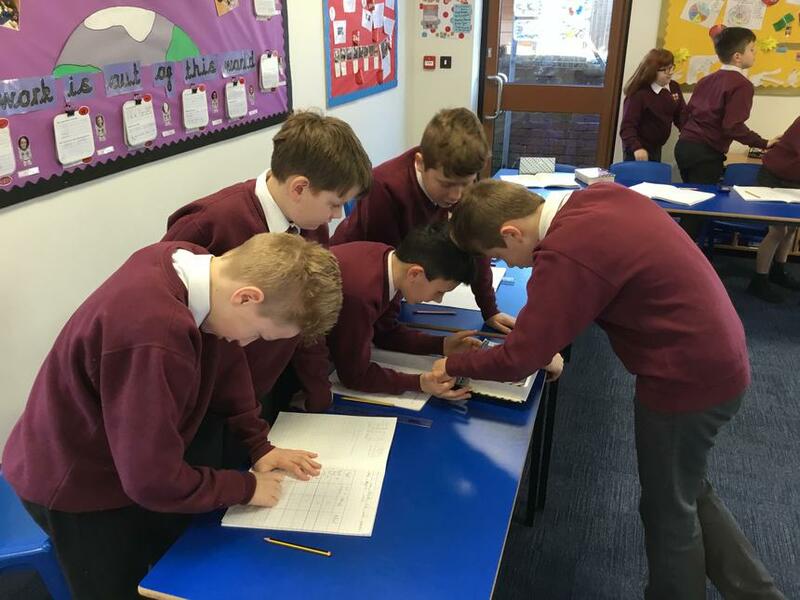 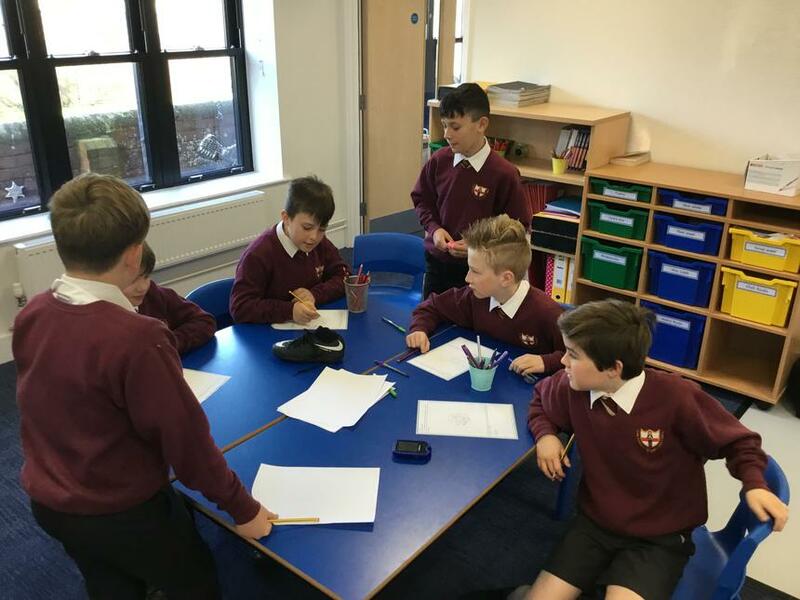 They have learned about the different natural disasters that we hear about and have collected data about which disaster each child is most interested in, plotting their results on bar charts. 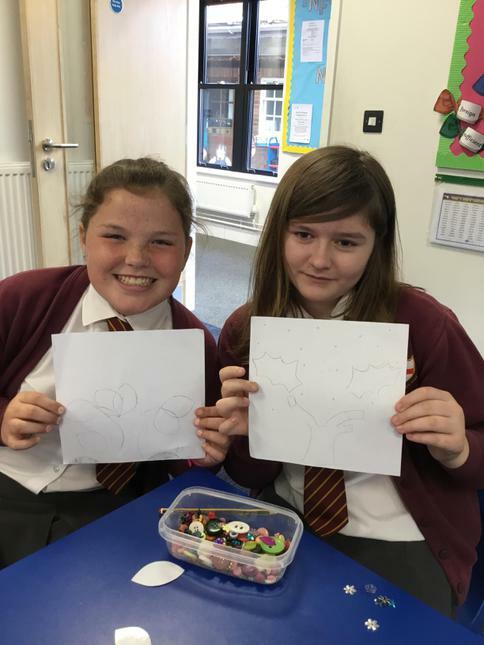 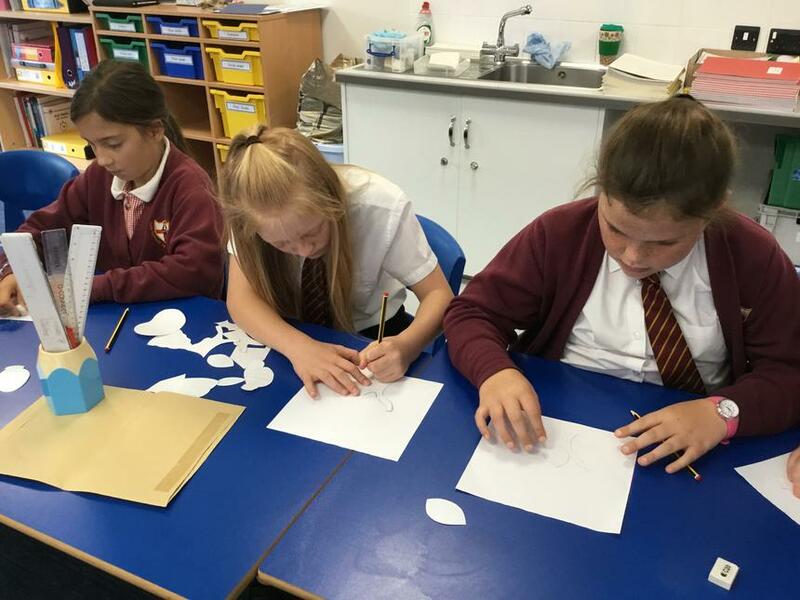 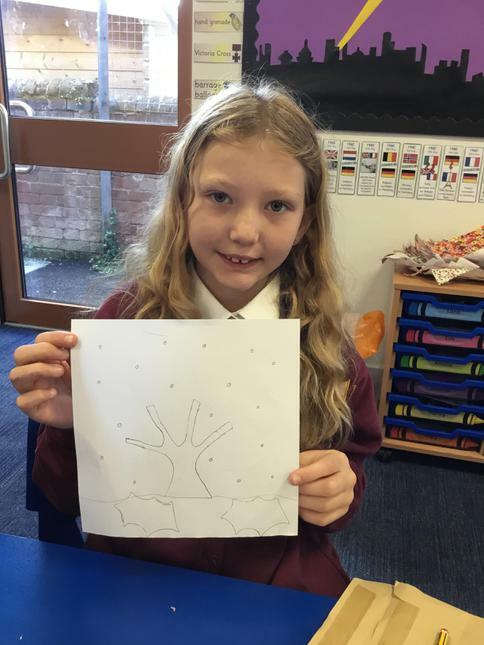 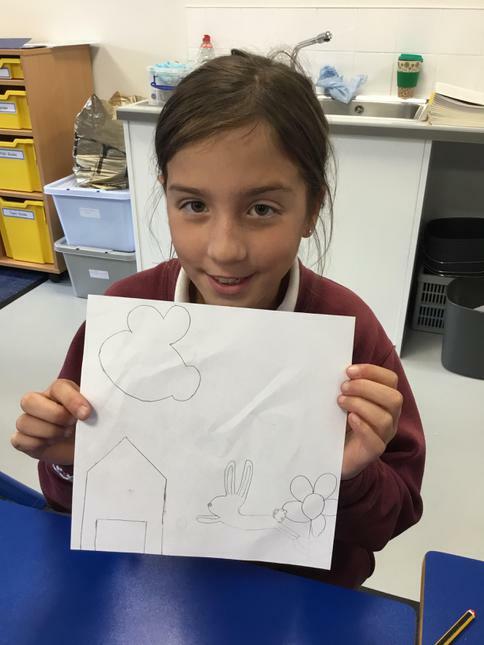 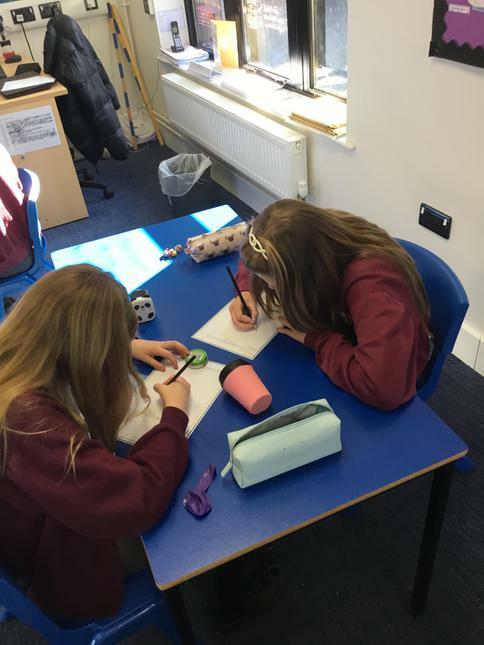 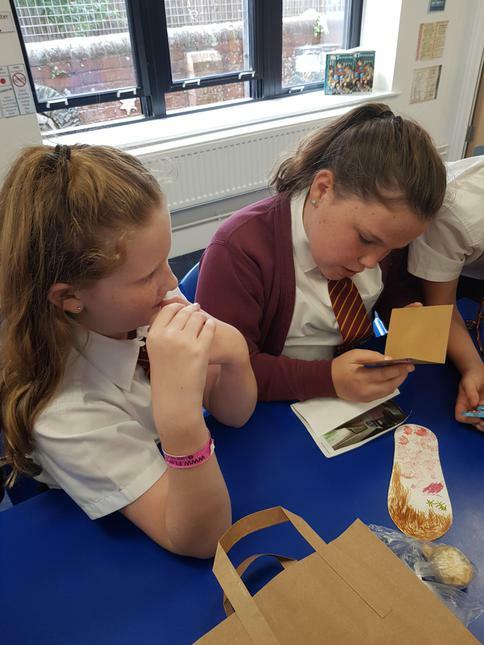 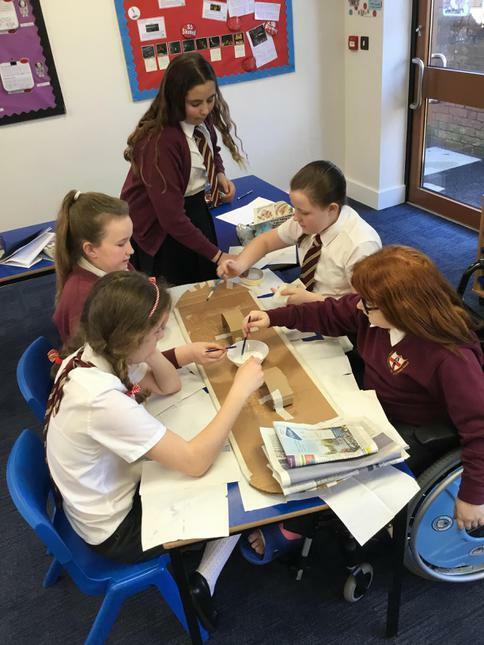 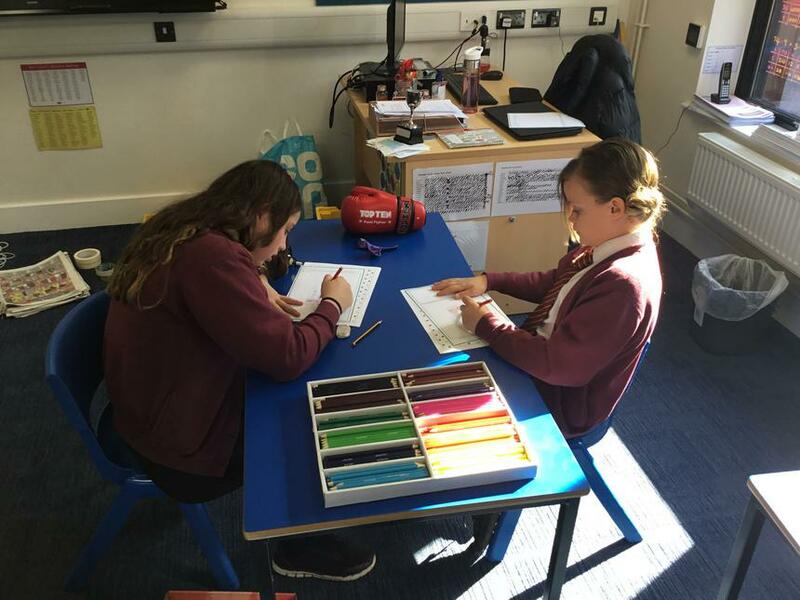 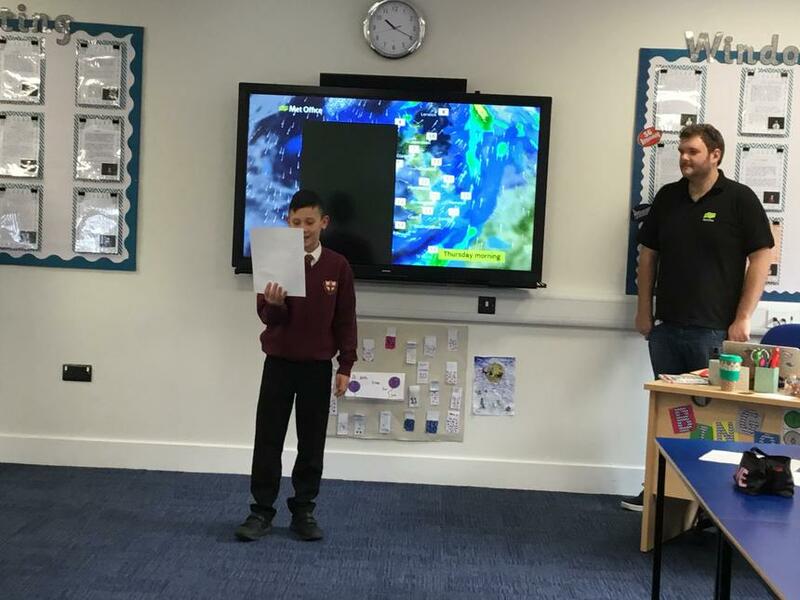 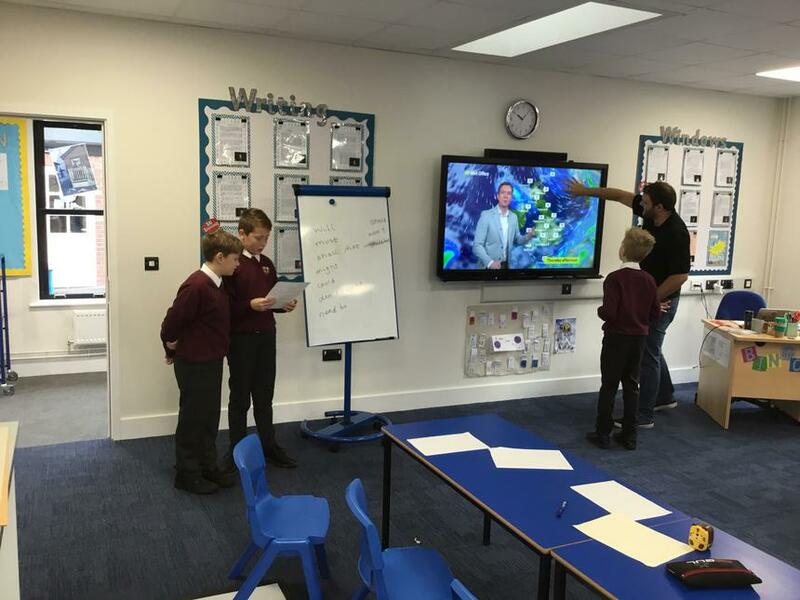 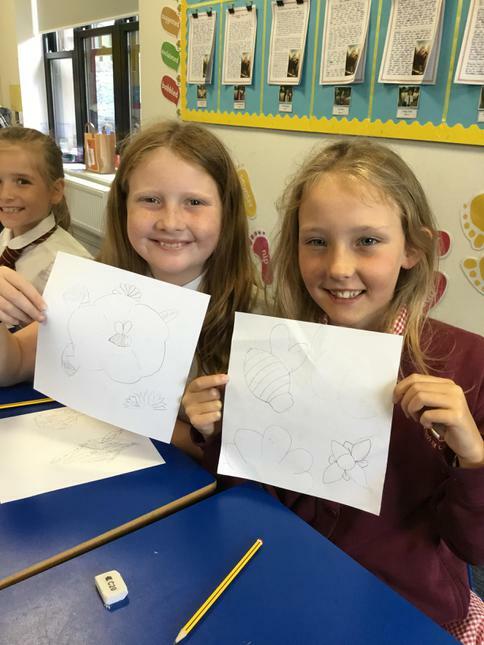 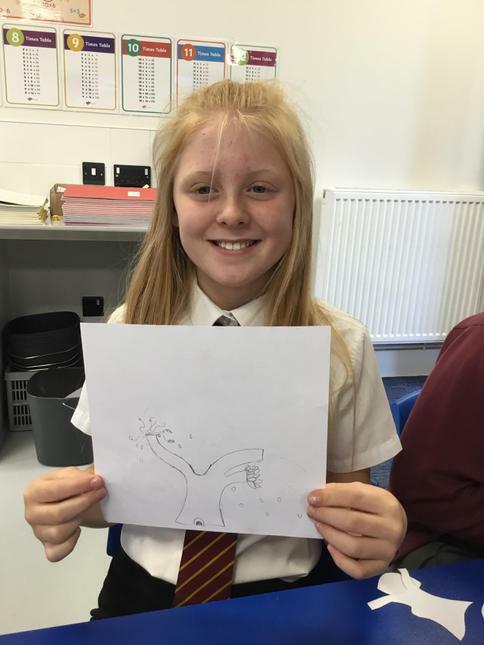 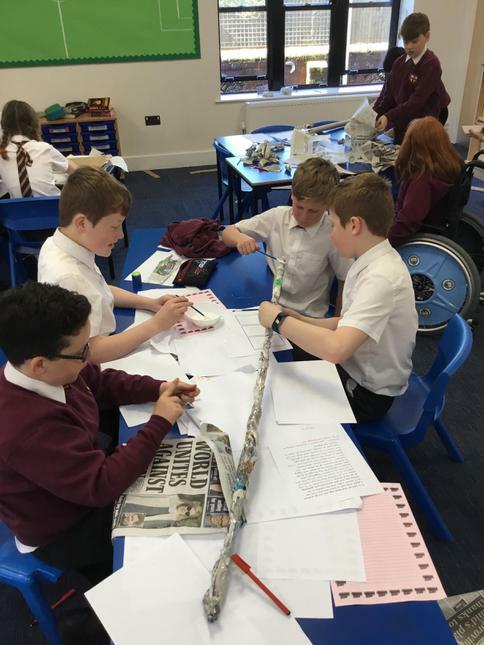 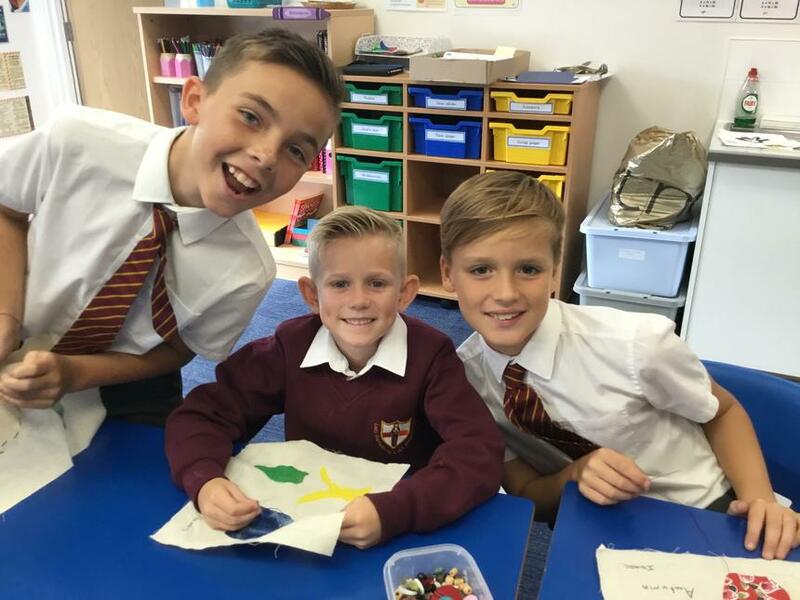 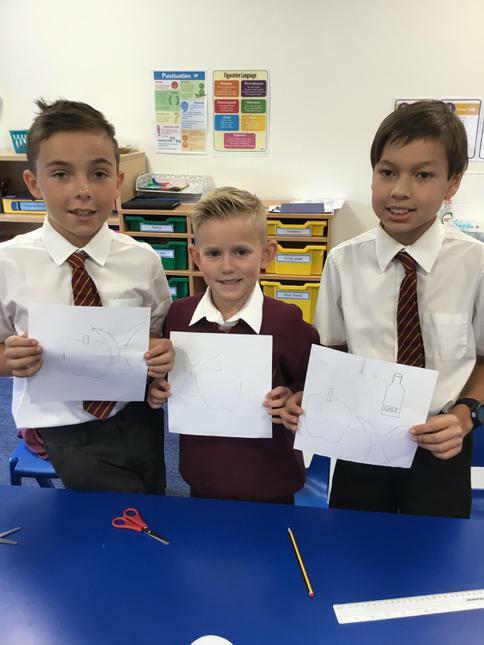 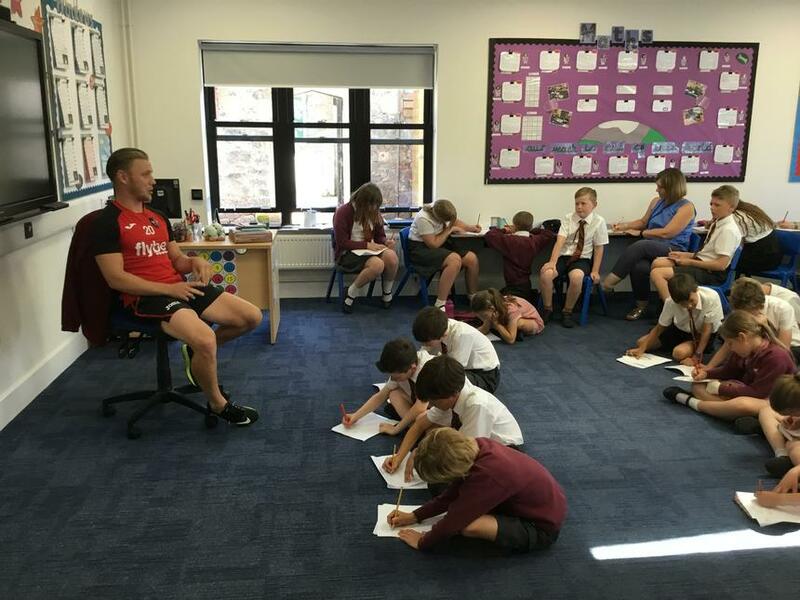 In addition to this, the children have written non-fiction texts about volcanoes and have used a range of different sketching techniques to create images of a range of natural disasters. 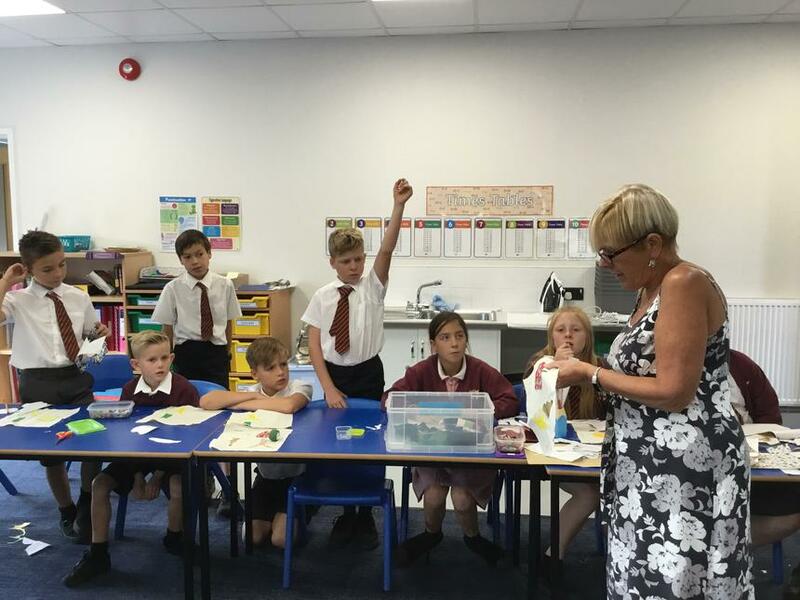 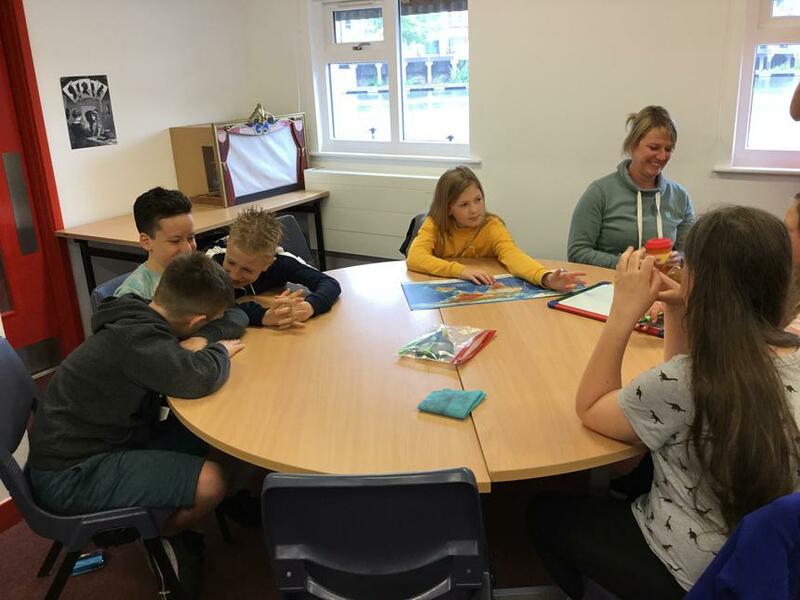 Class 4 is our new classroom with children from Year 6. 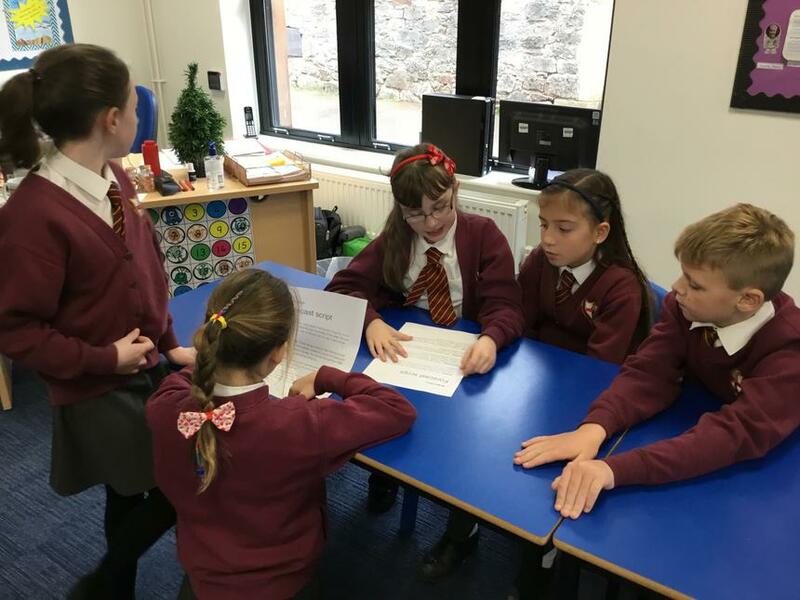 We work closely with Class 3 especially for our topic work. 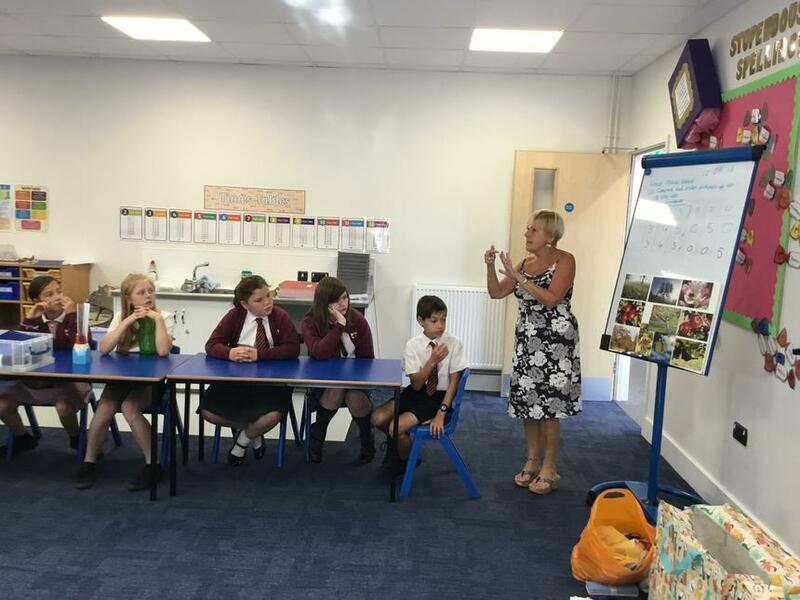 Our teacher is Mrs Mugford.